Pictured are some of the pieces that I have created over the last 25 years. 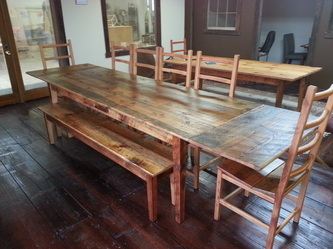 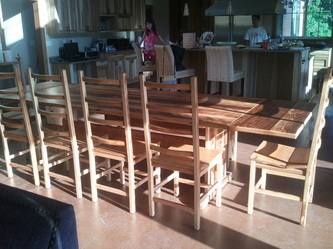 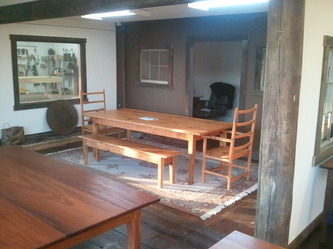 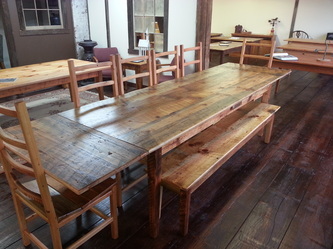 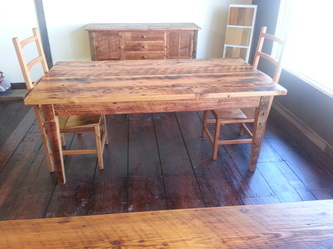 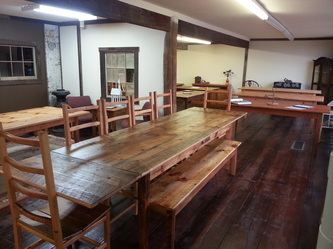 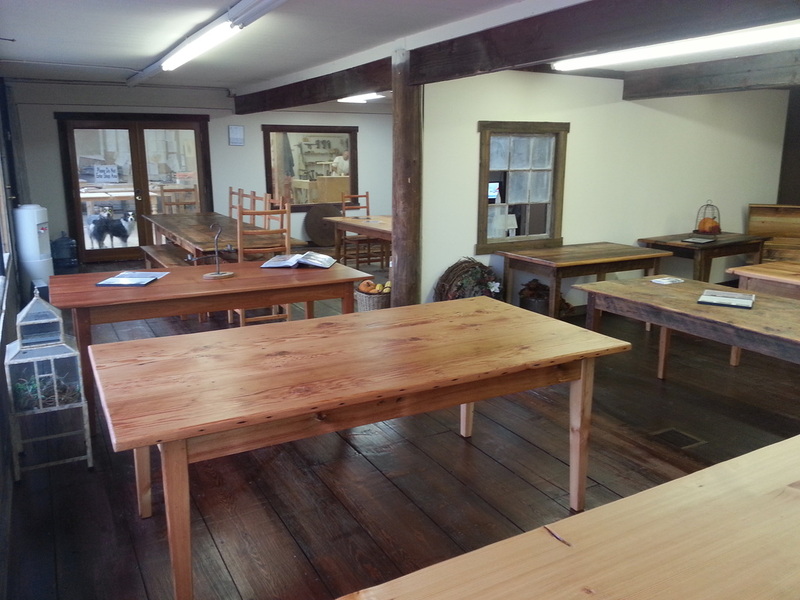 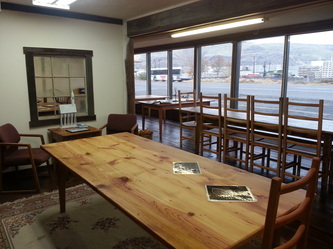 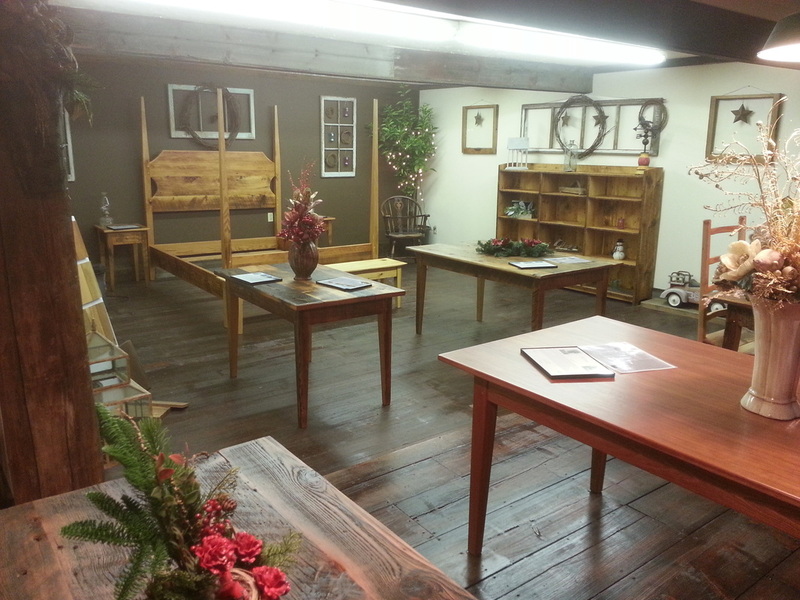 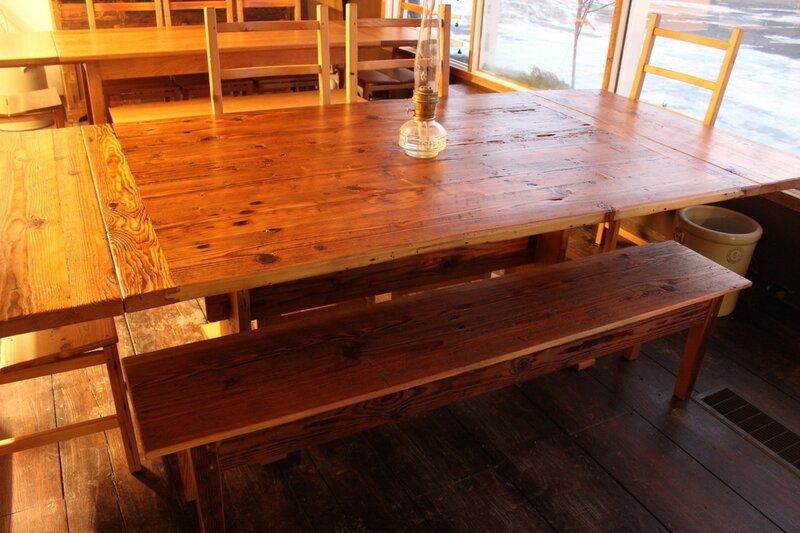 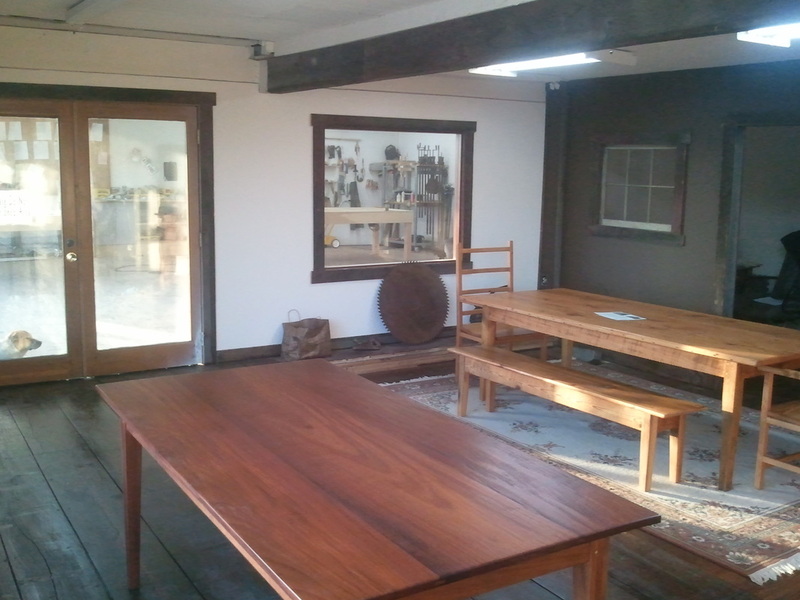 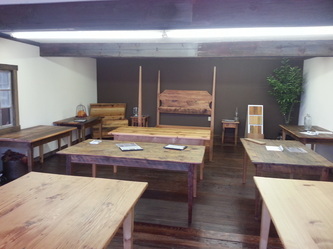 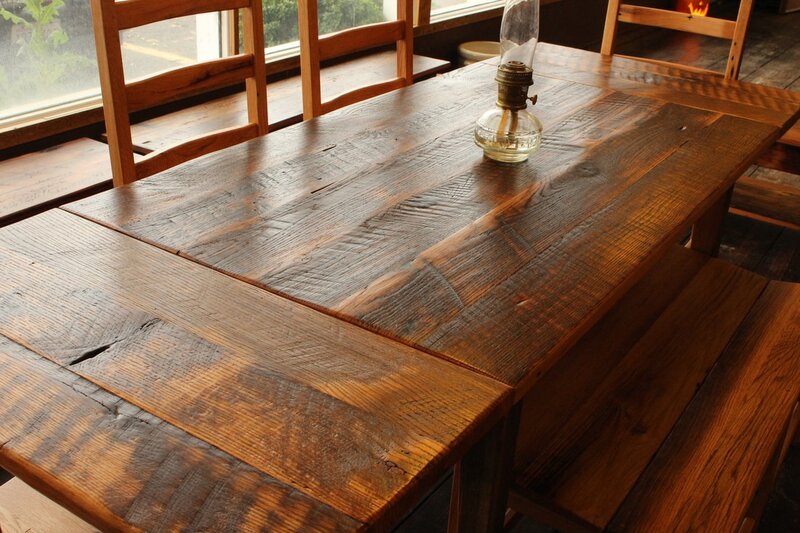 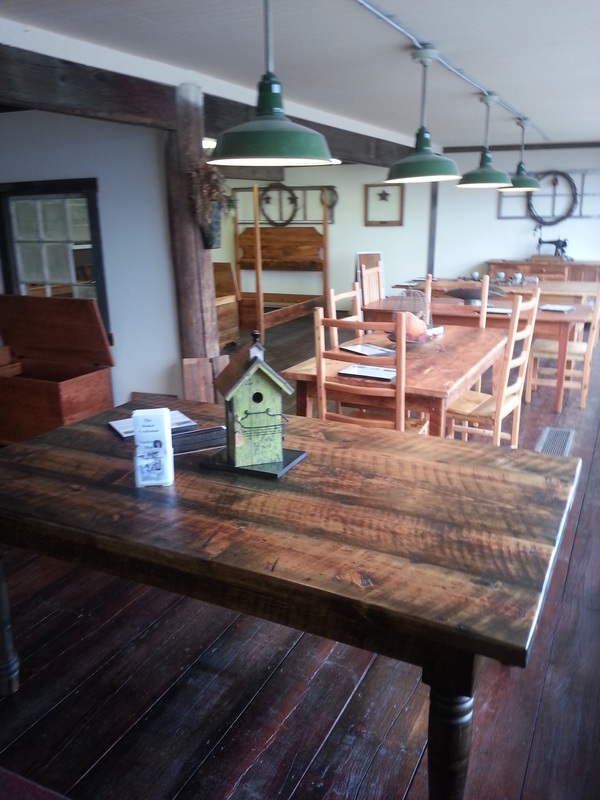 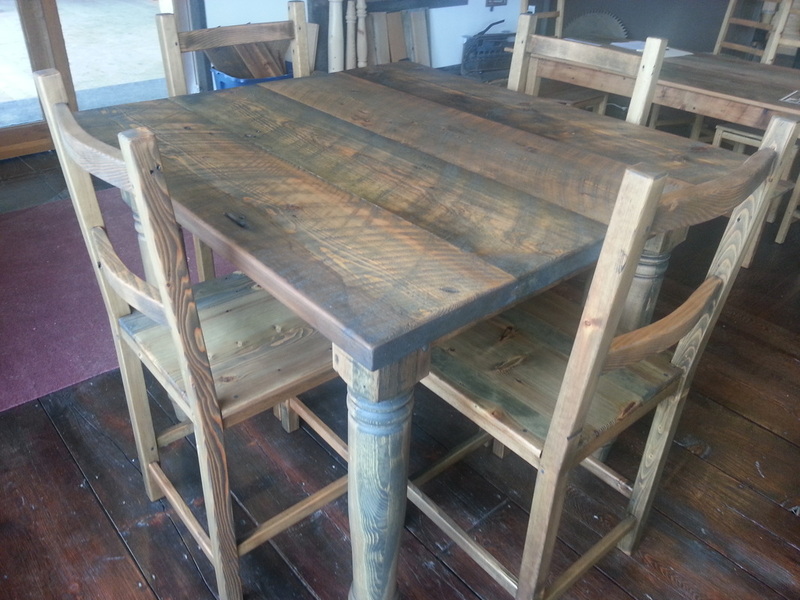 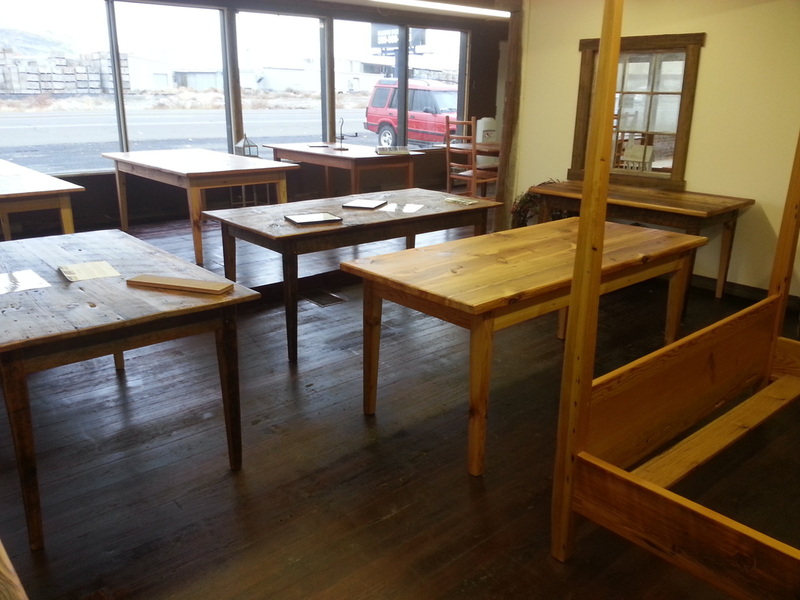 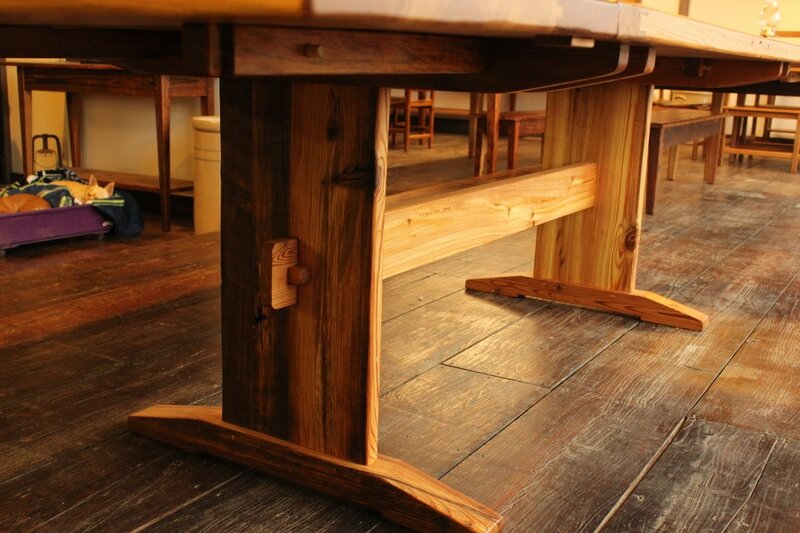 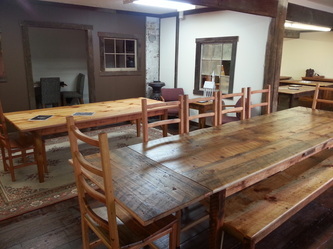 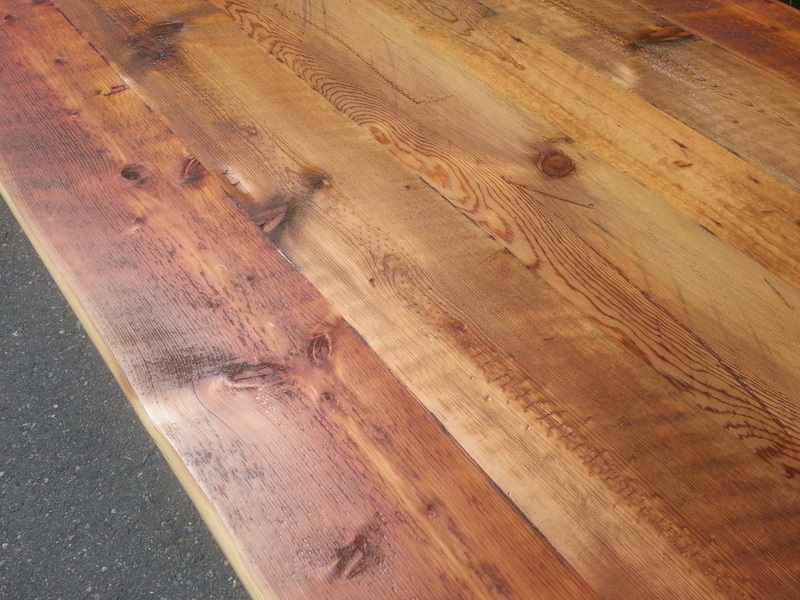 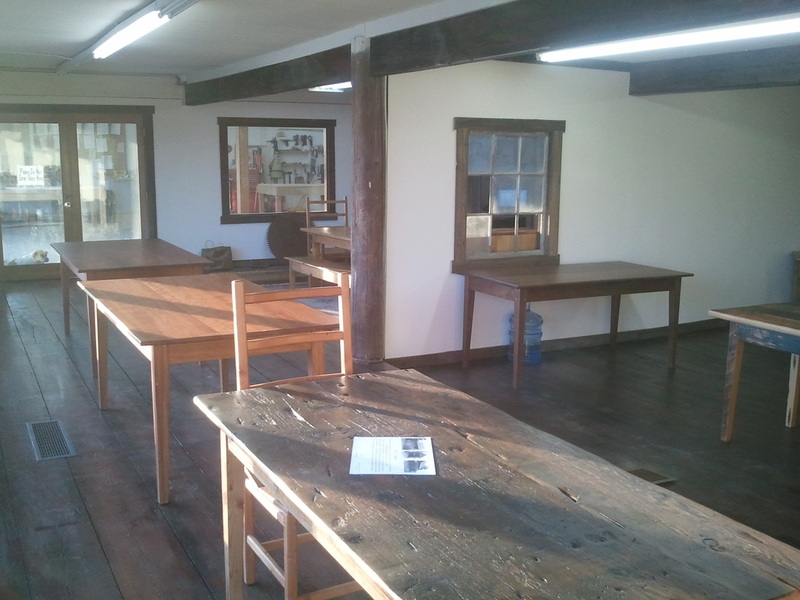 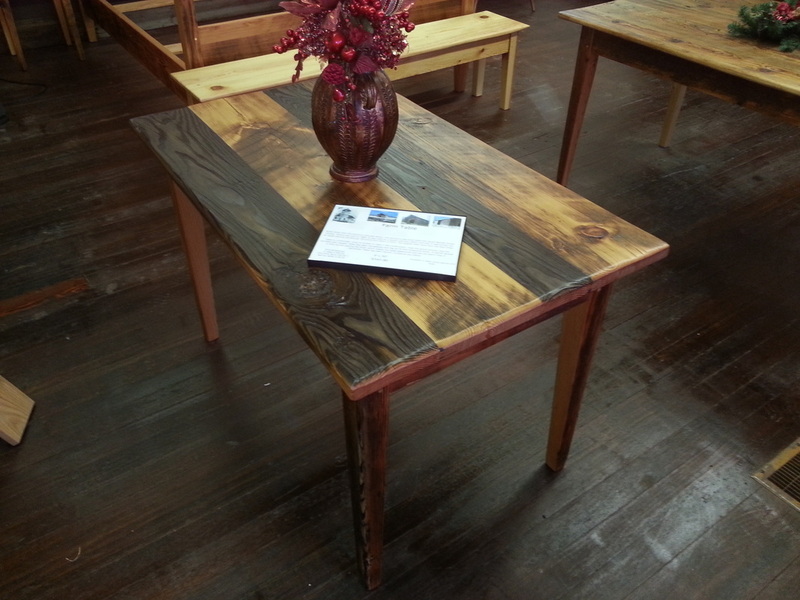 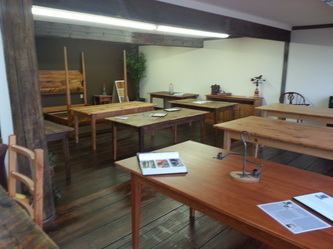 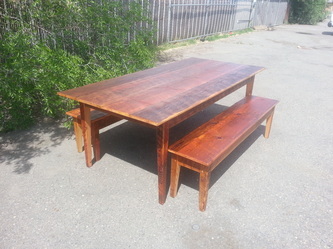 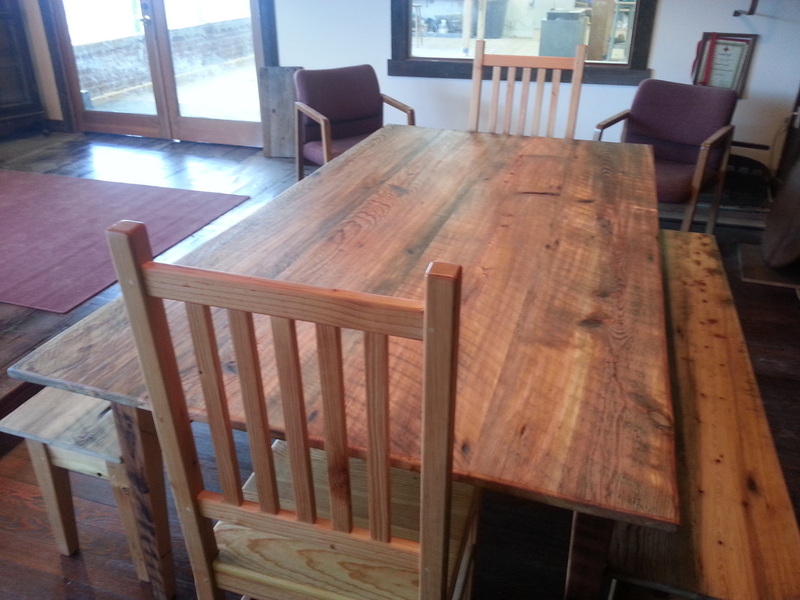 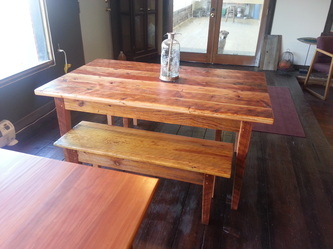 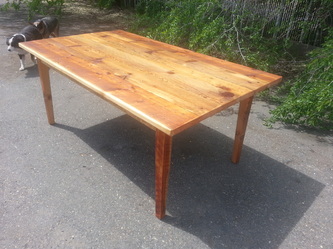 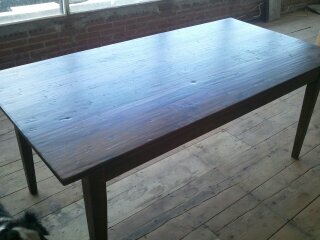 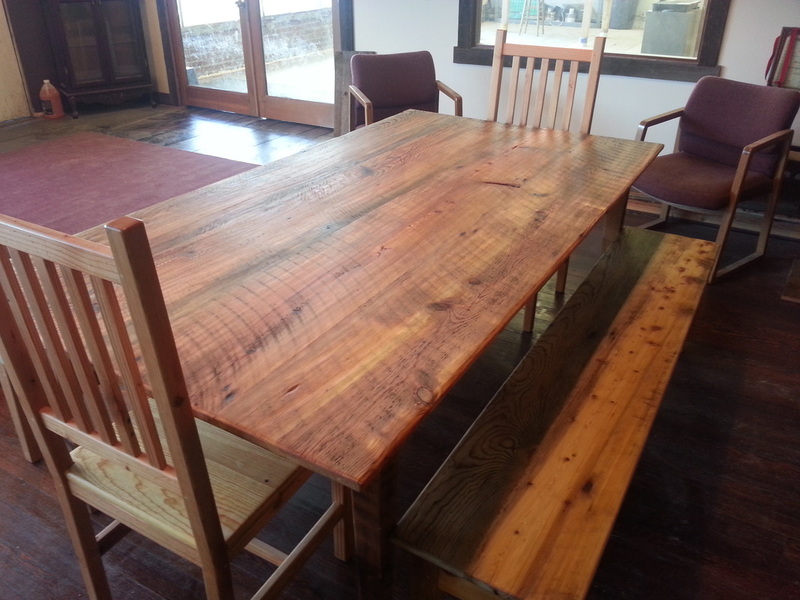 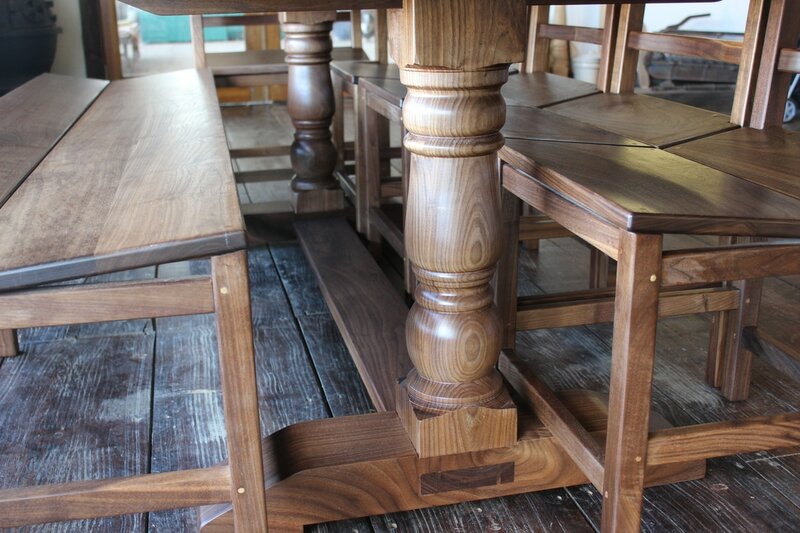 All the tables you see are custom made with no screws or nails. 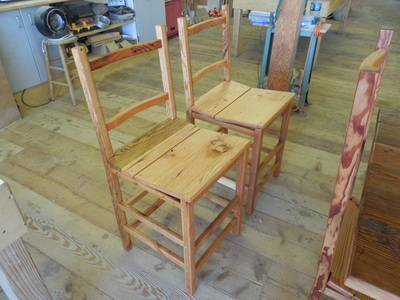 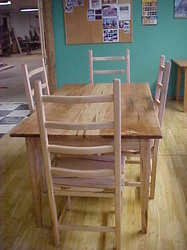 Tops are spline jointed, legs are mortised and pegged (see options). 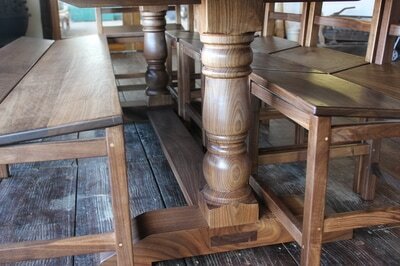 Tops, legs and aprons are all hand planed and spoke shaved. 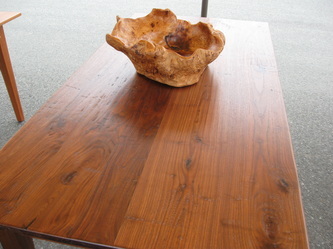 I carry a wide variety of wood species both old and new. 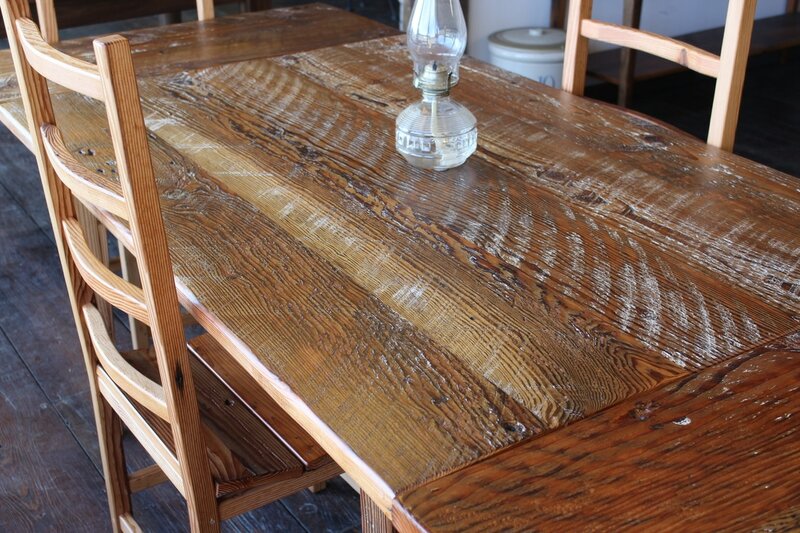 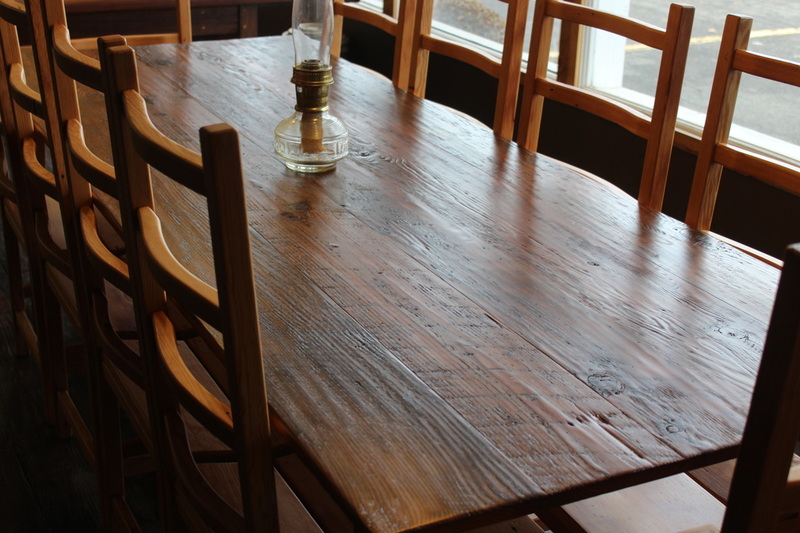 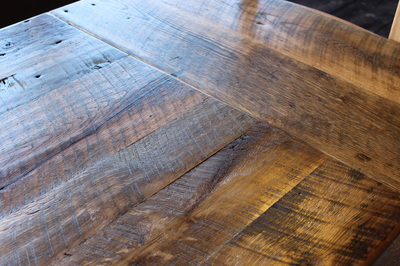 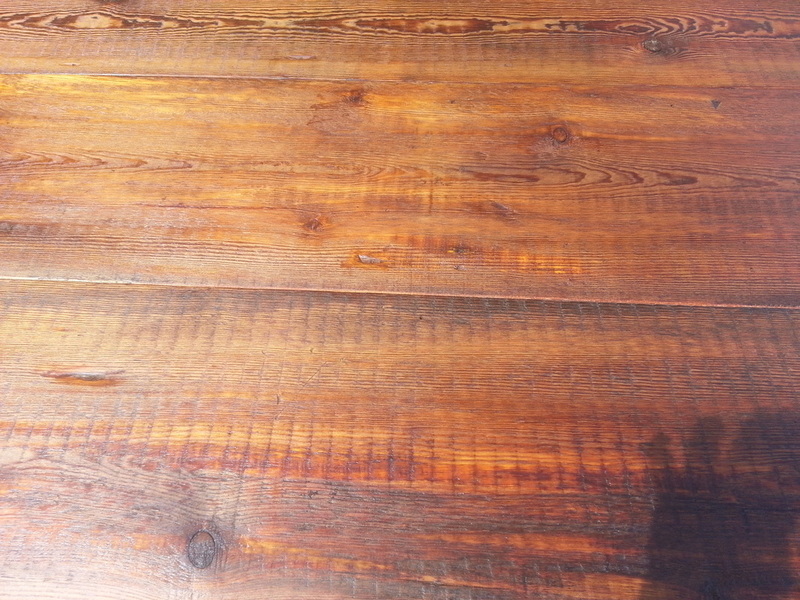 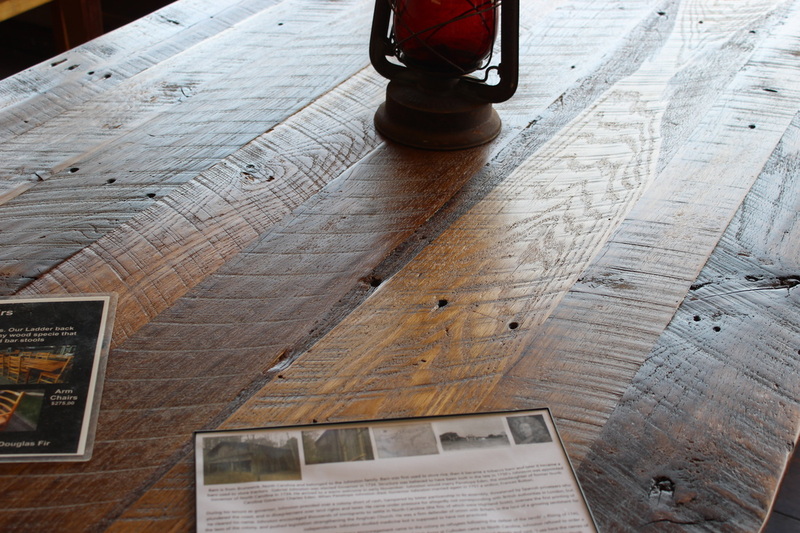 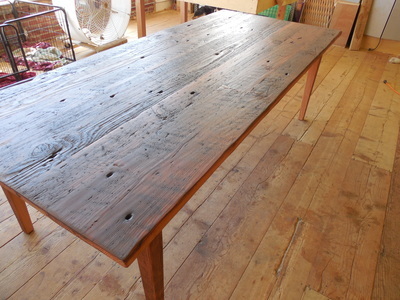 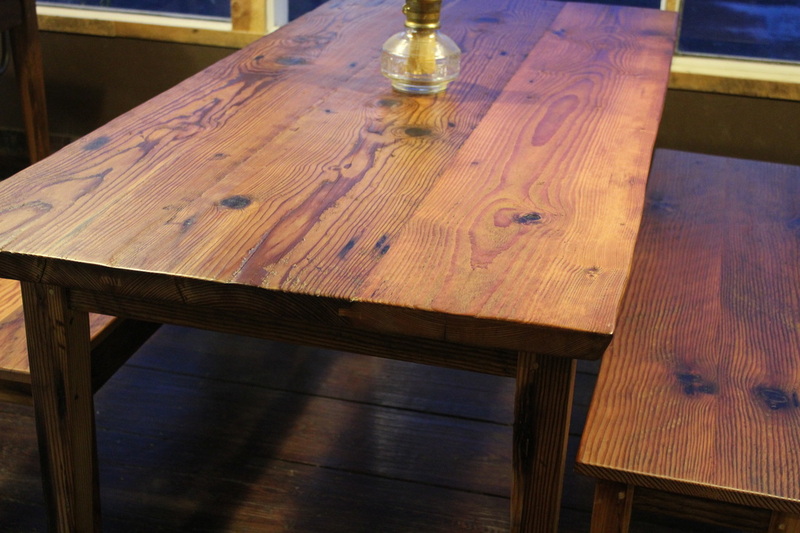 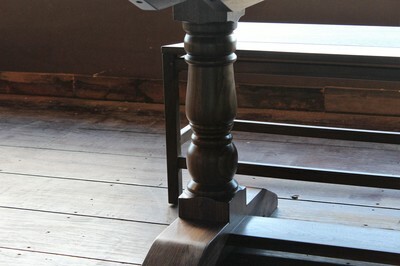 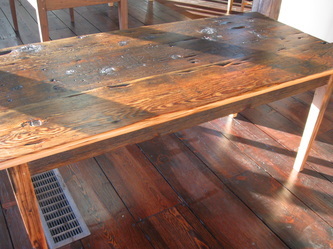 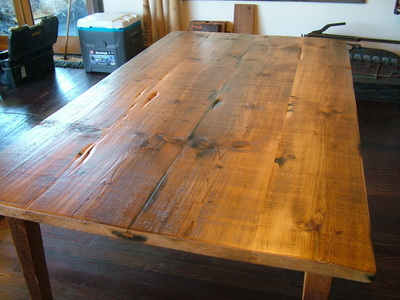 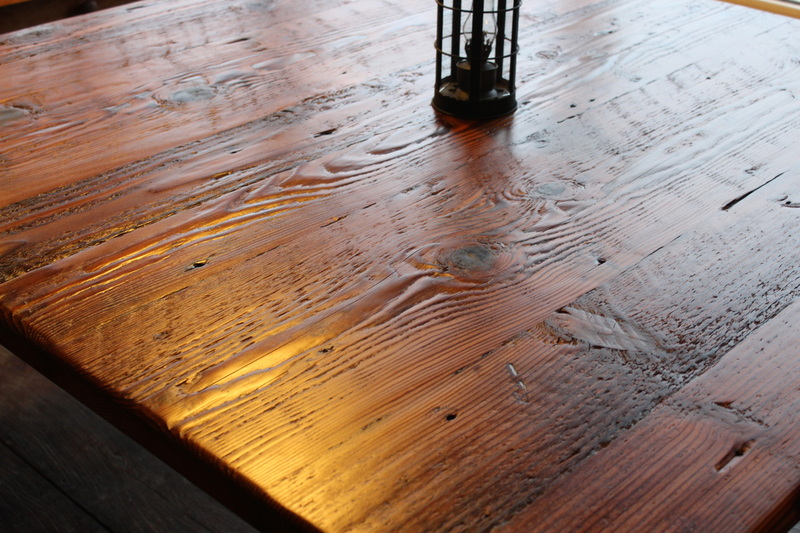 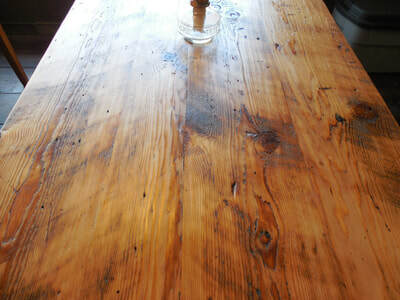 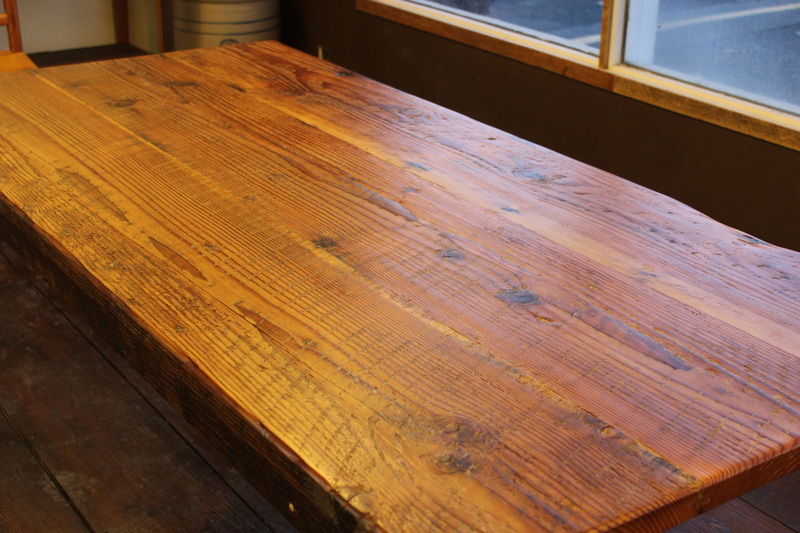 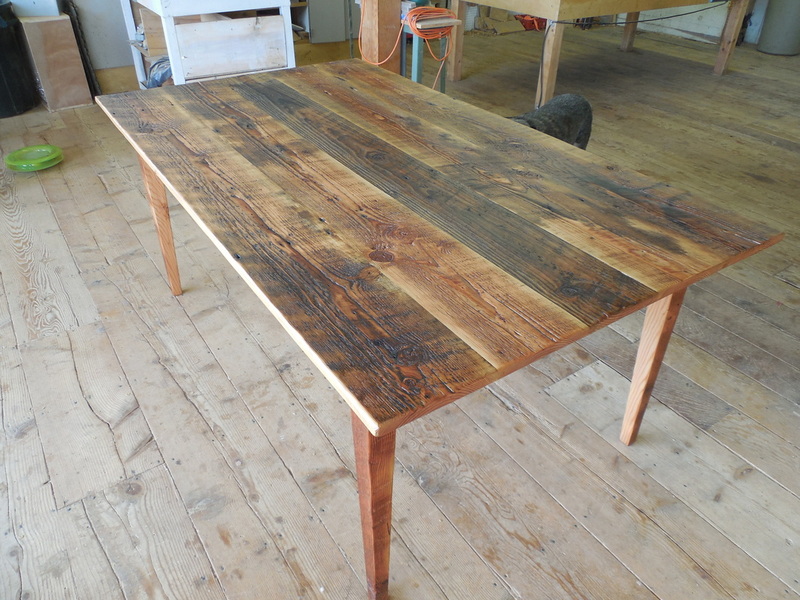 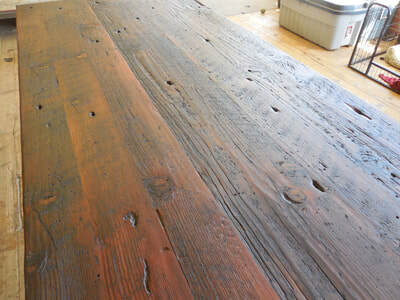 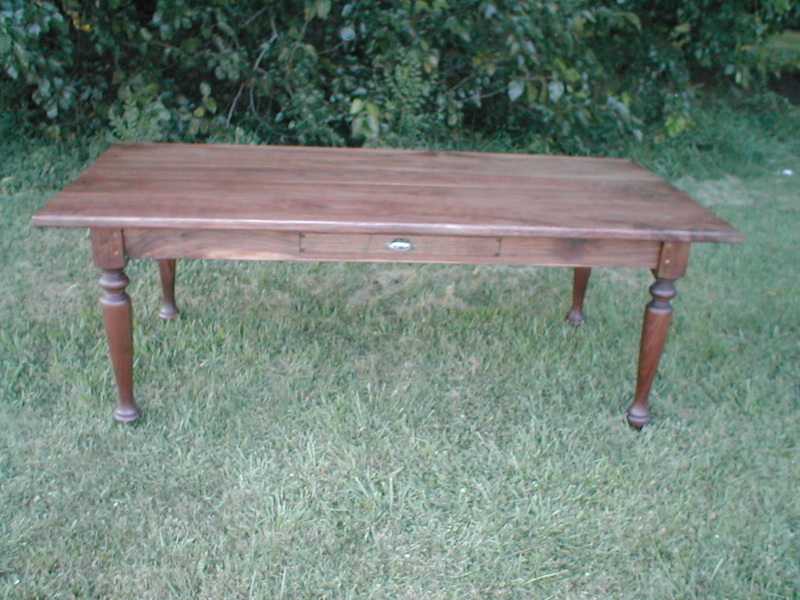 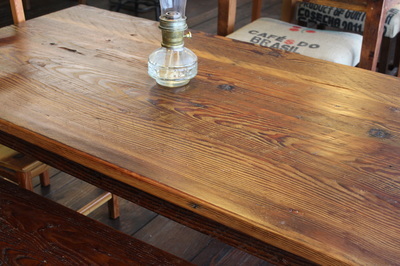 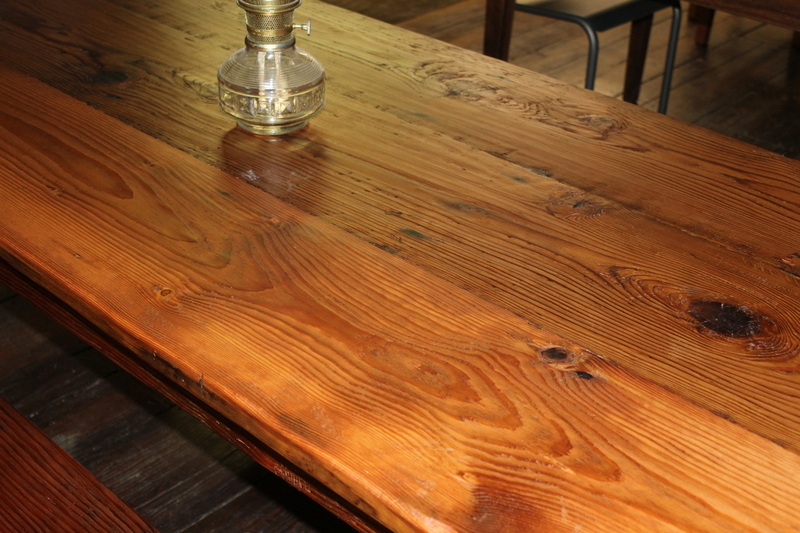 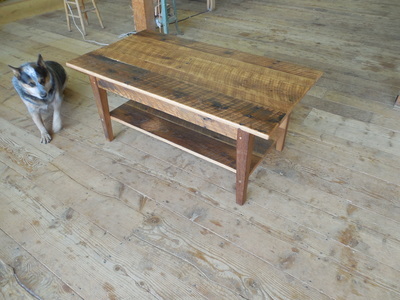 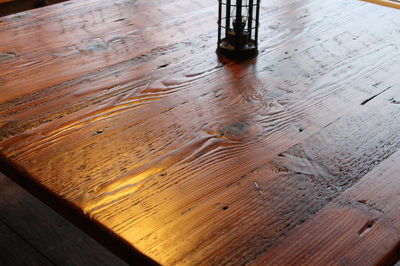 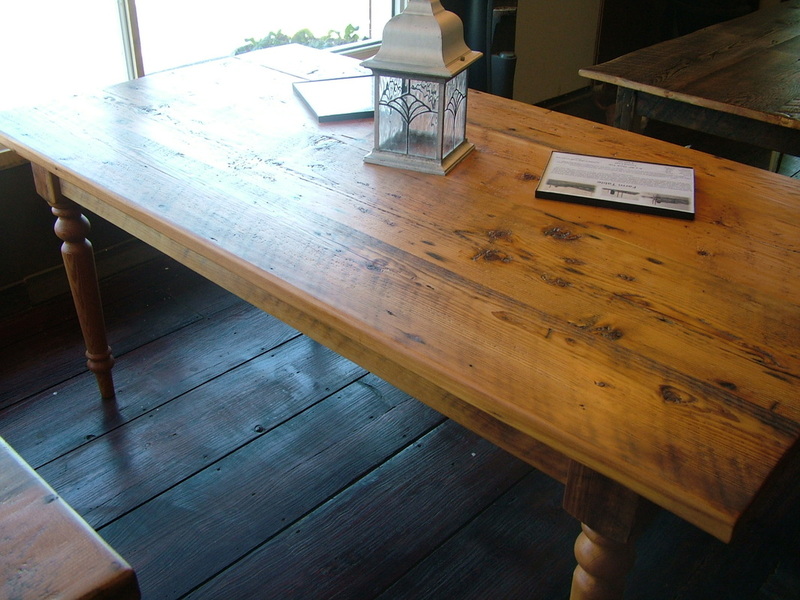 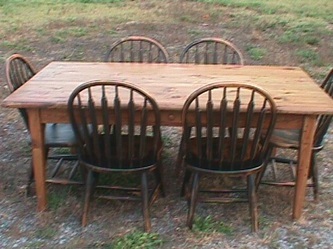 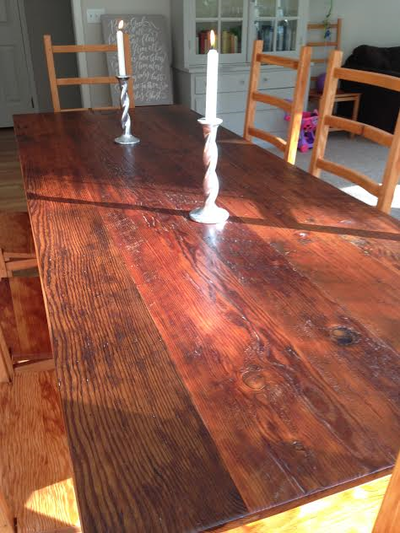 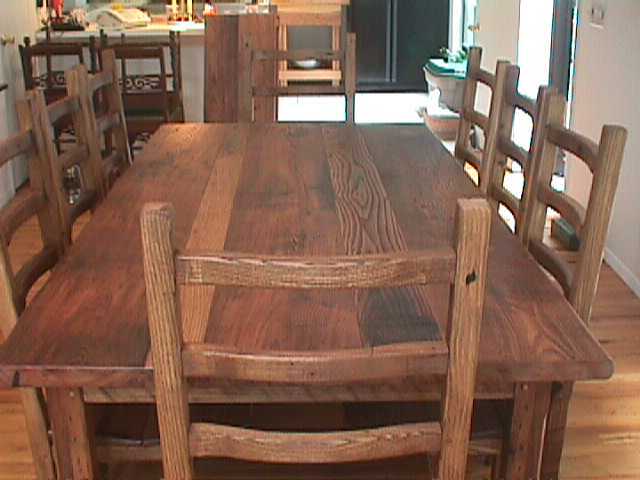 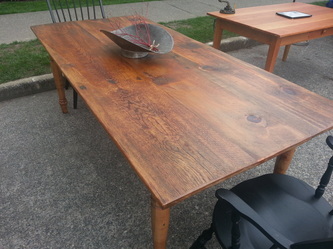 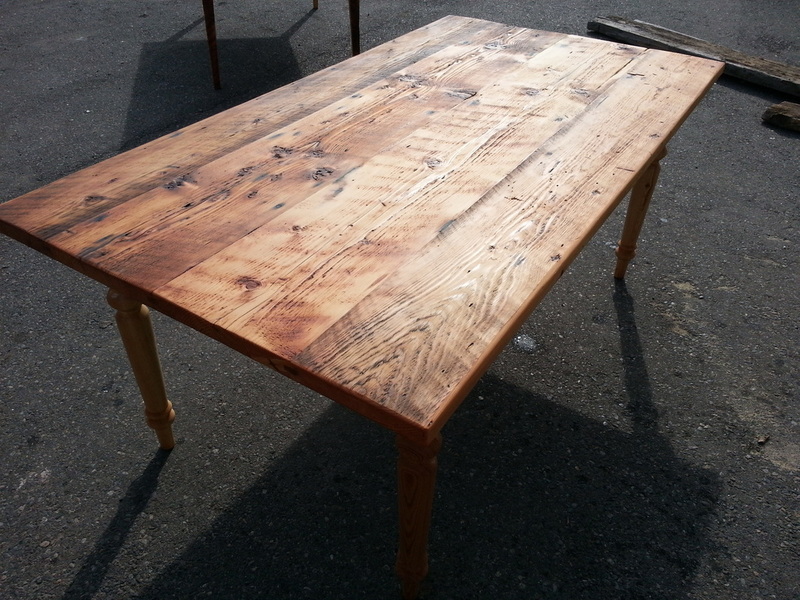 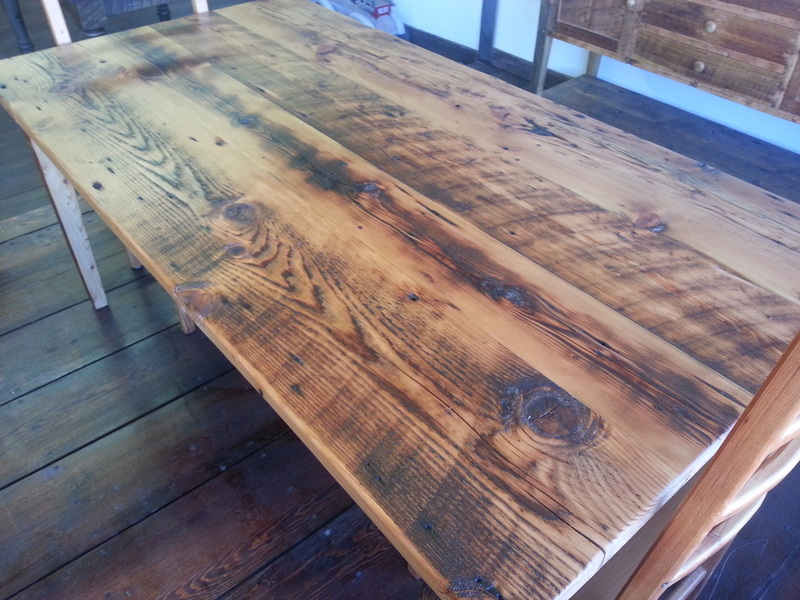 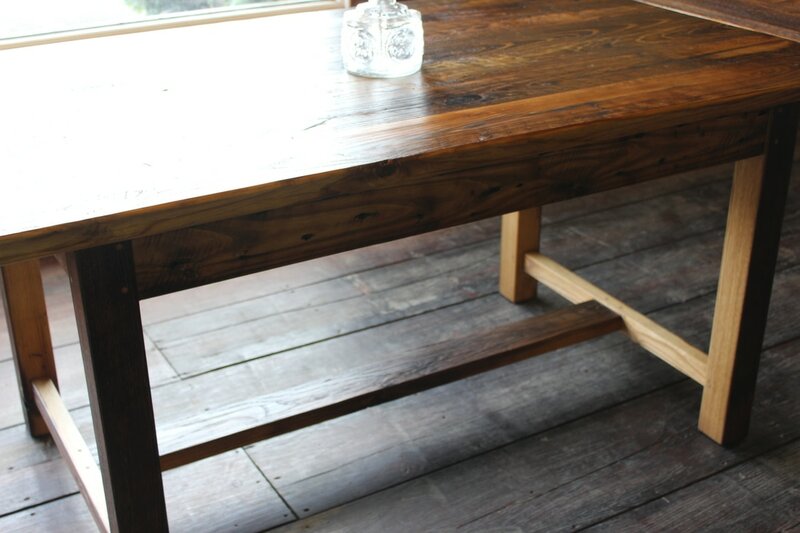 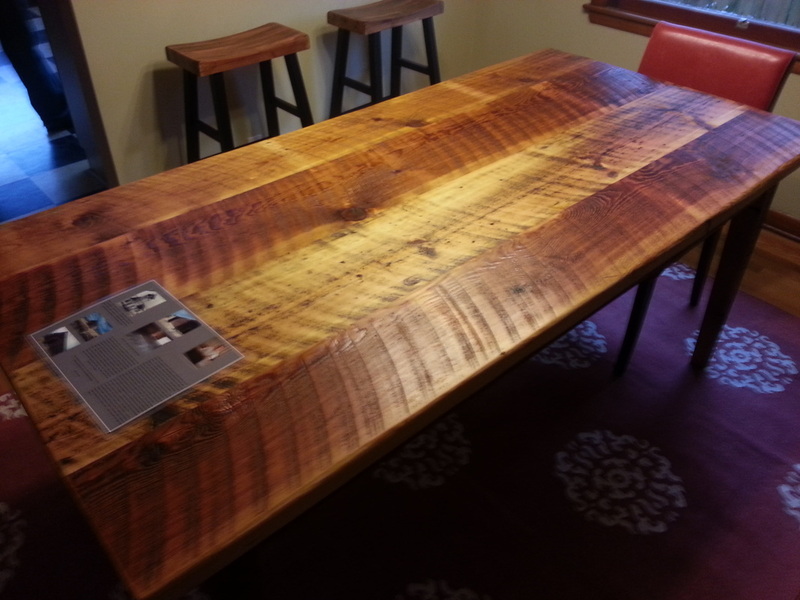 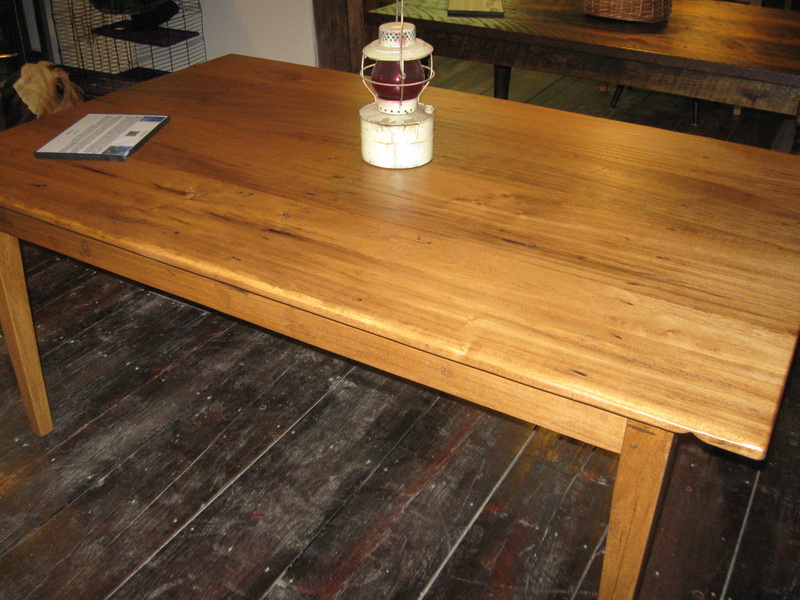 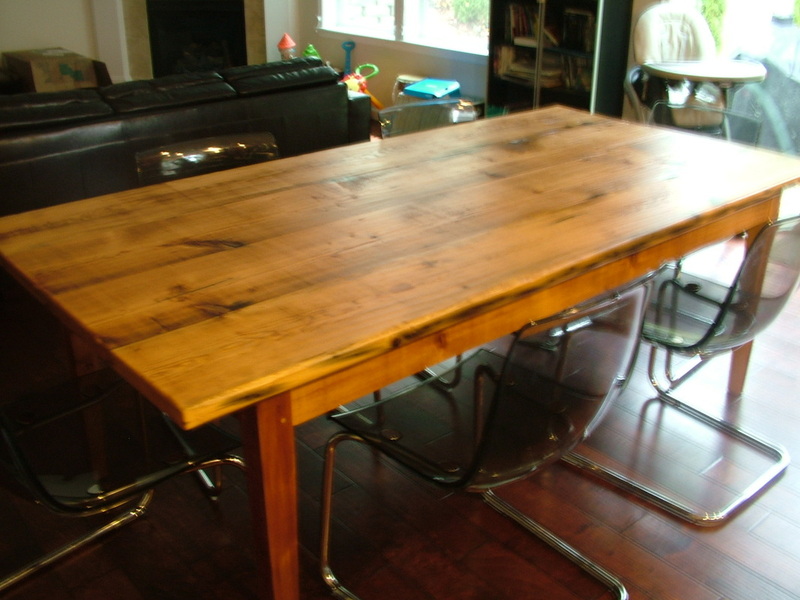 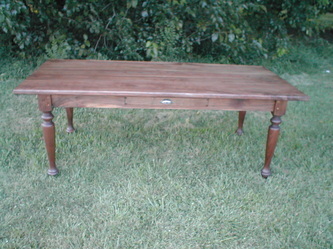 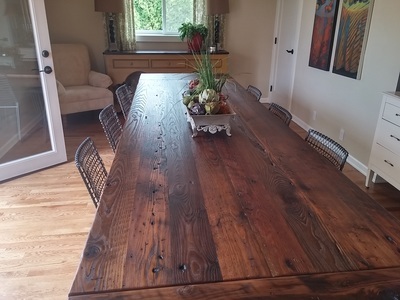 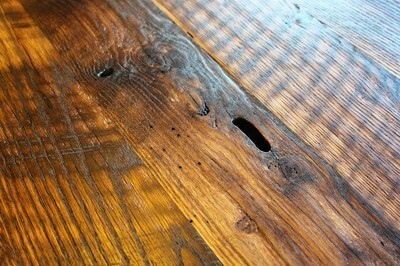 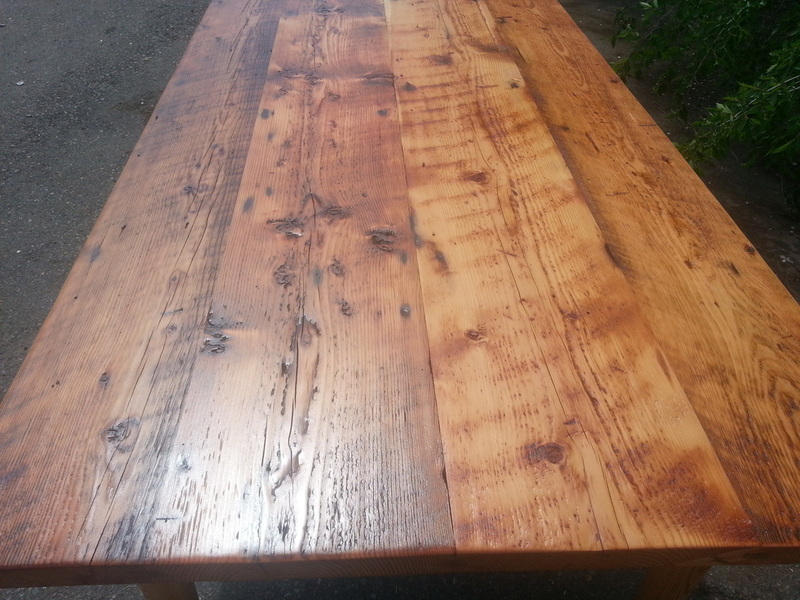 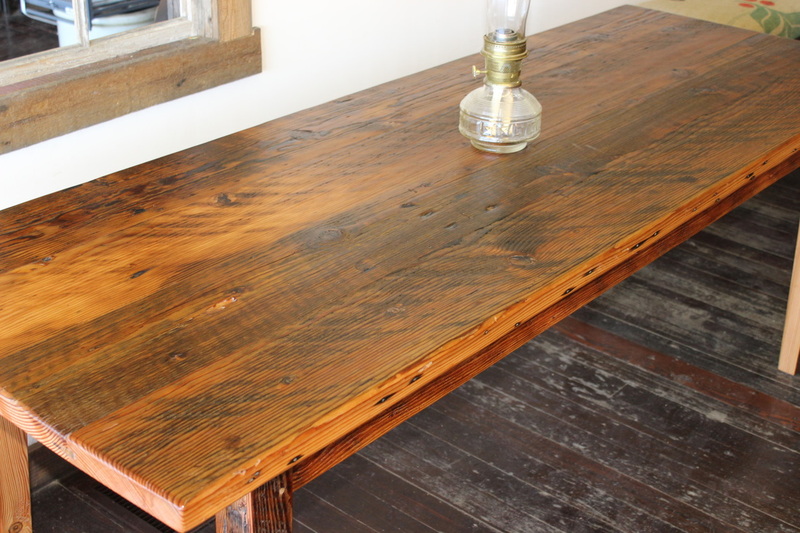 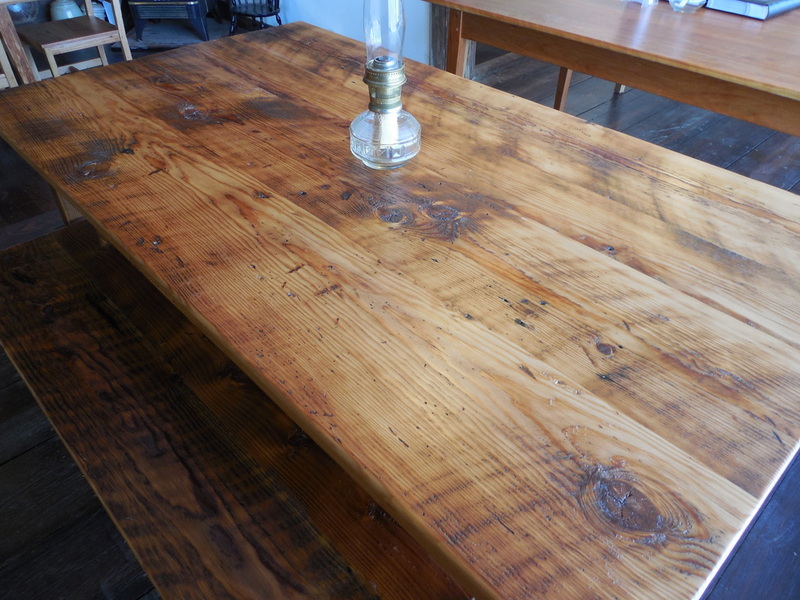 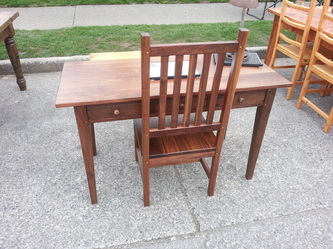 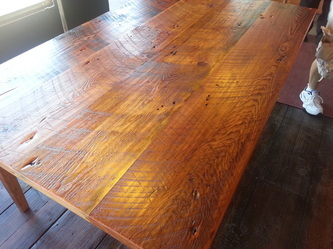 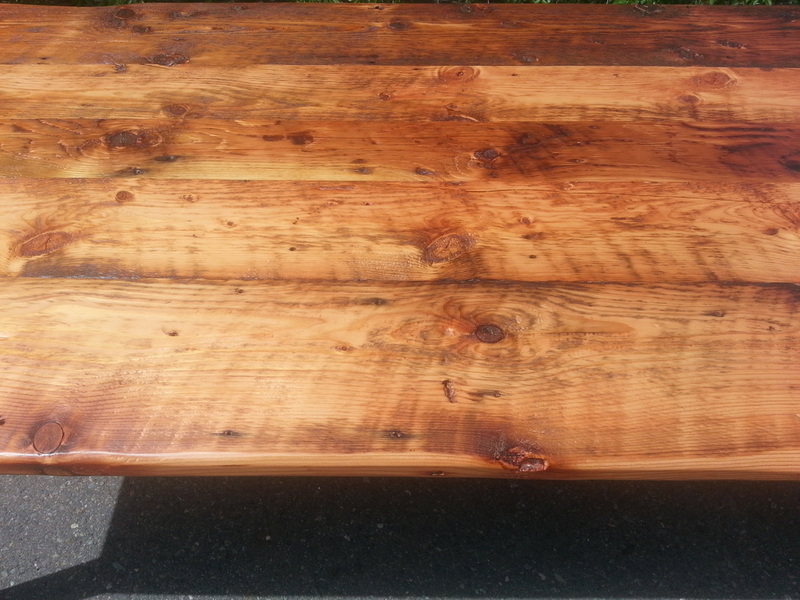 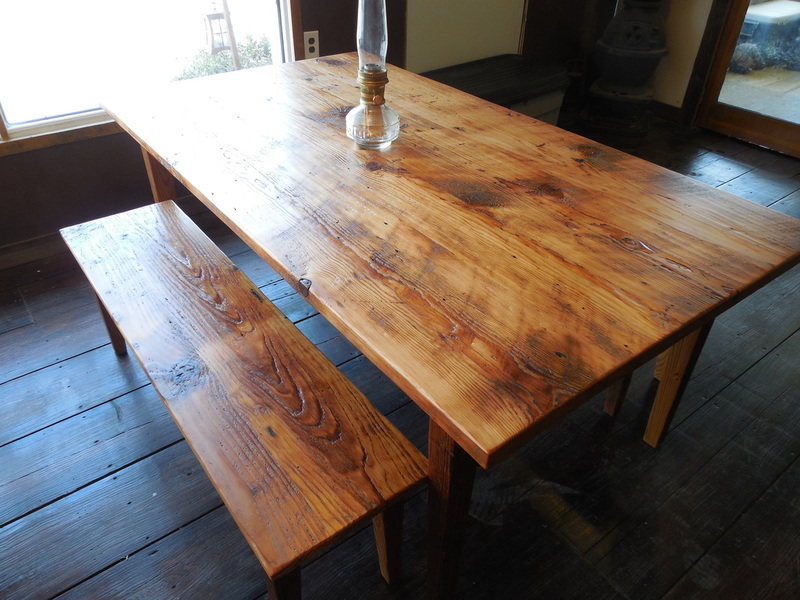 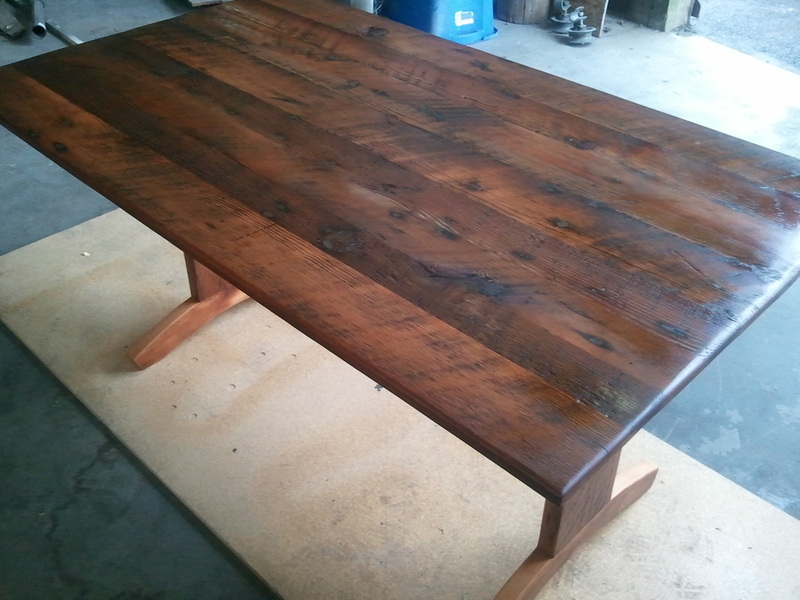 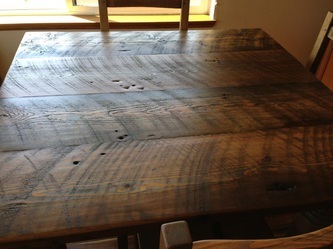 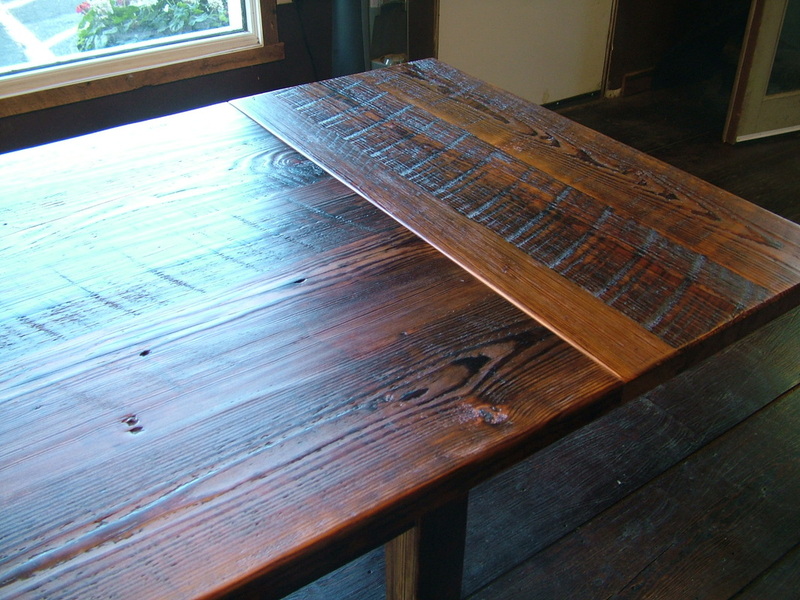 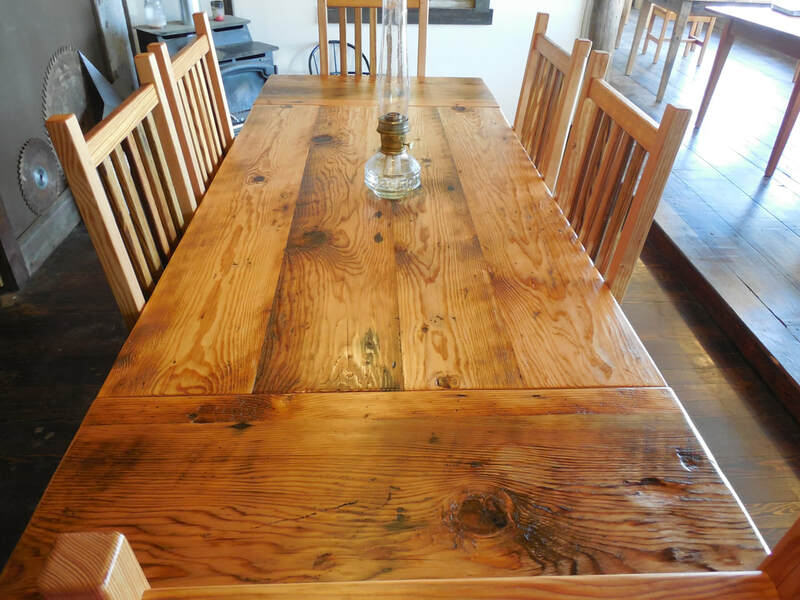 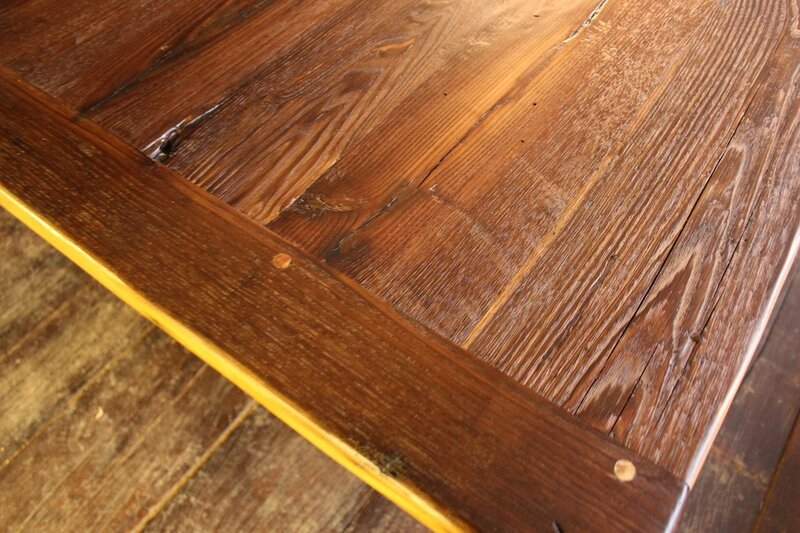 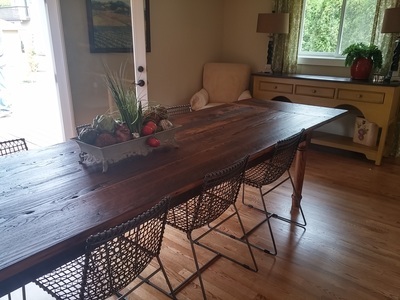 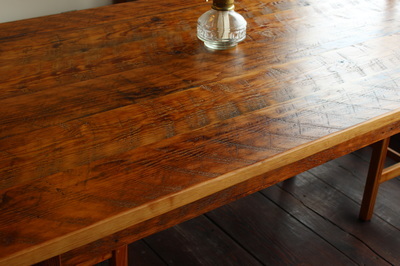 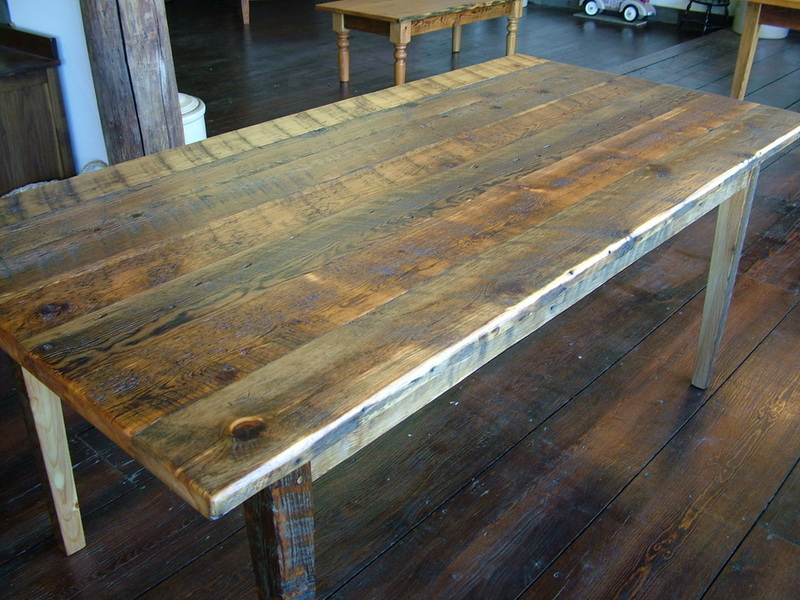 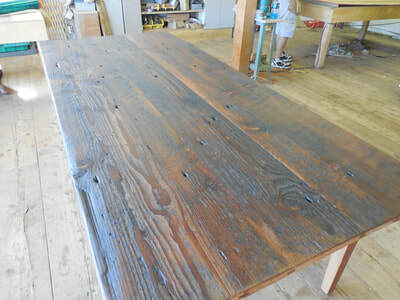 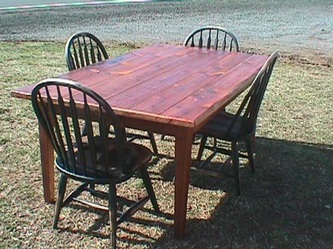 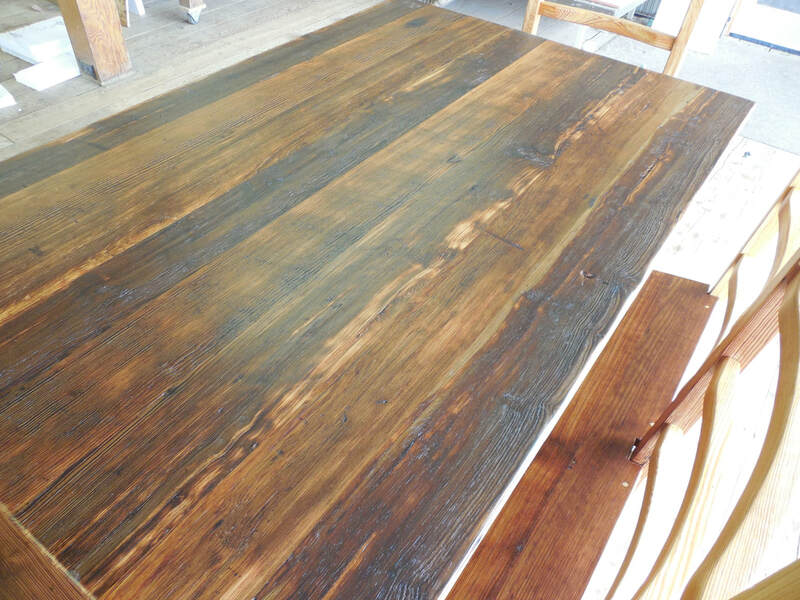 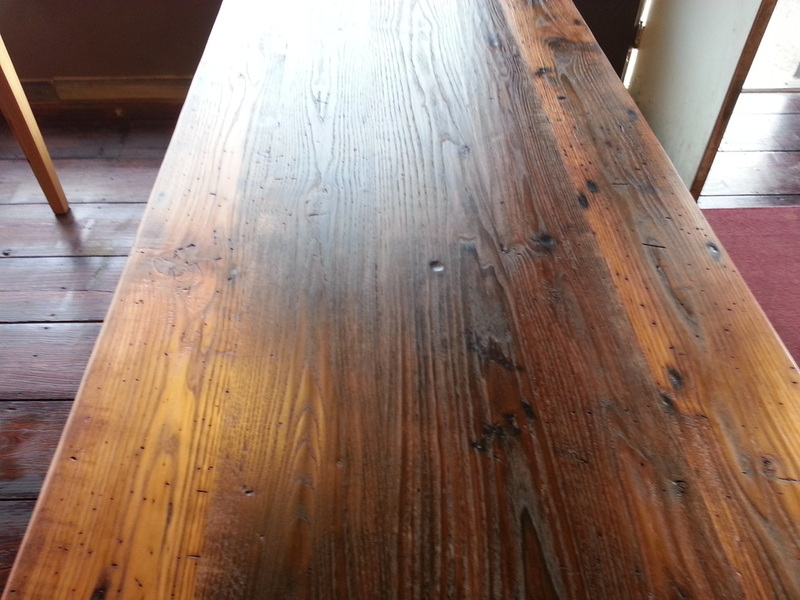 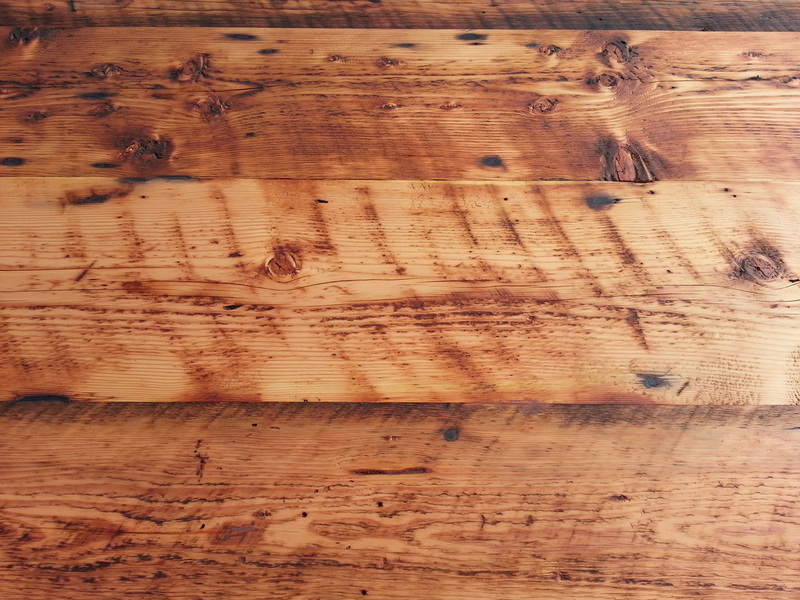 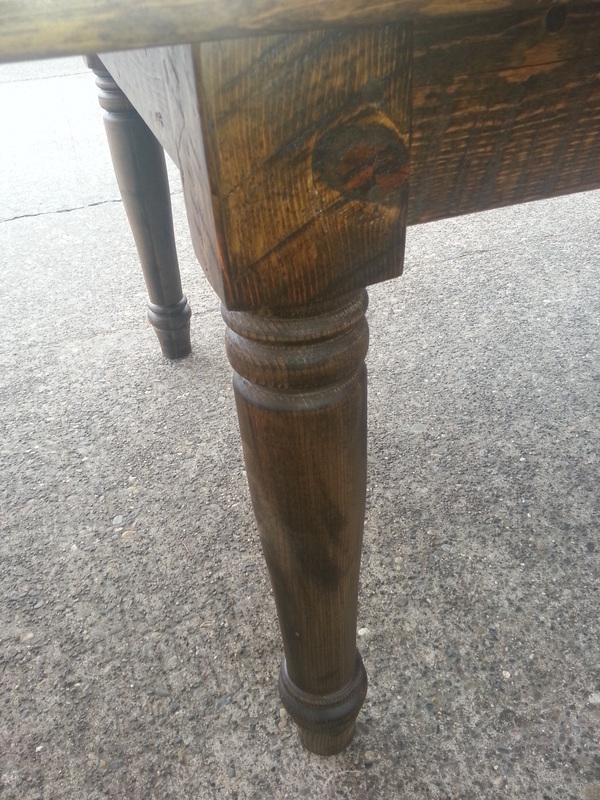 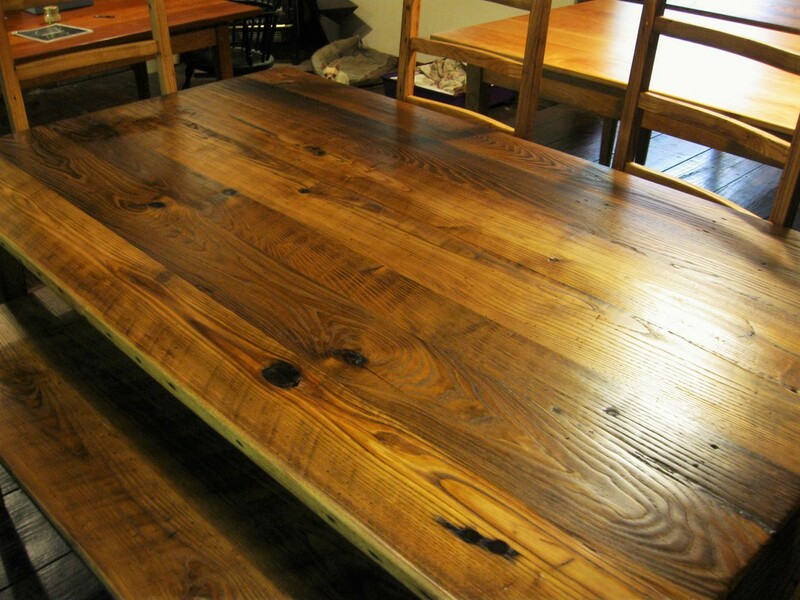 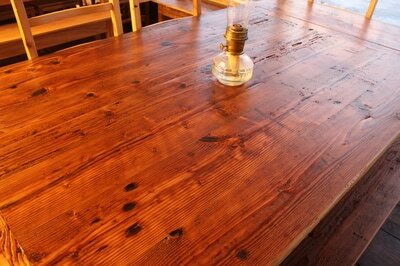 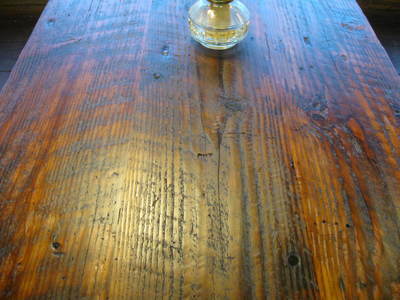 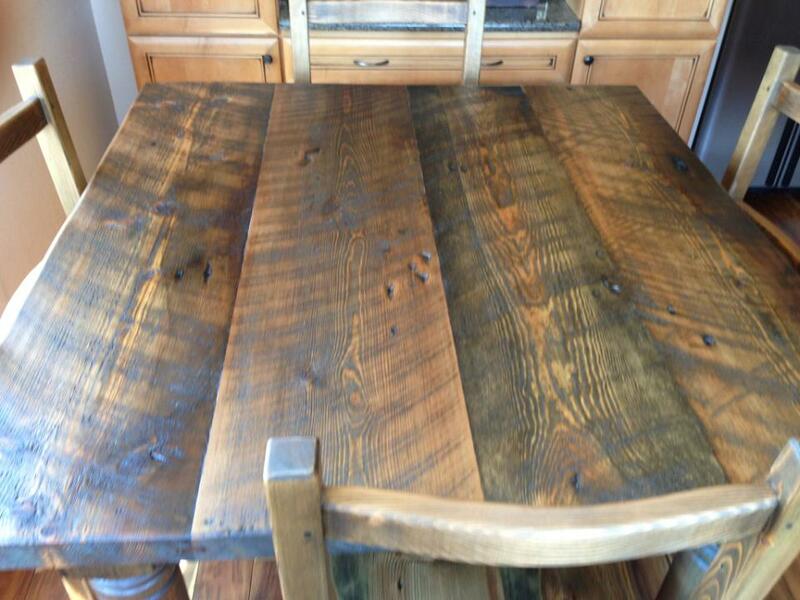 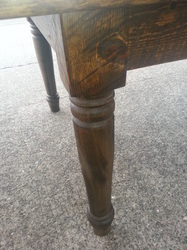 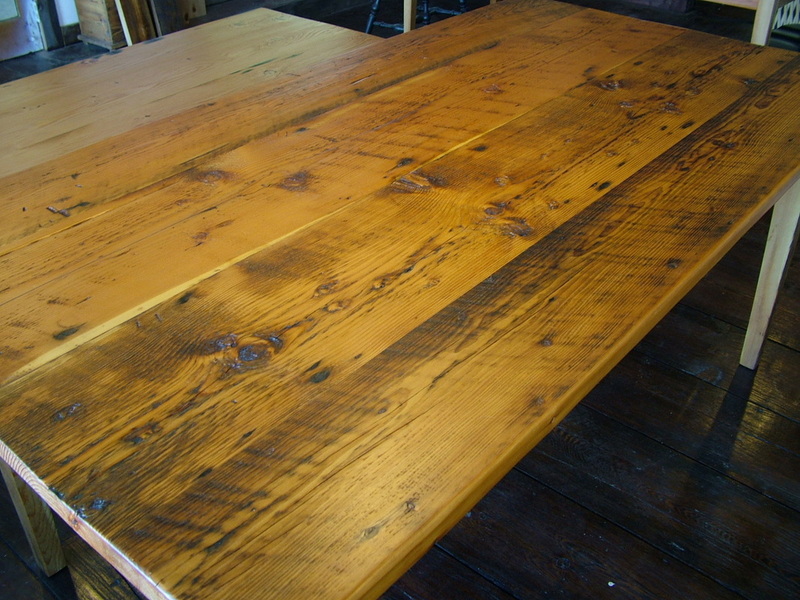 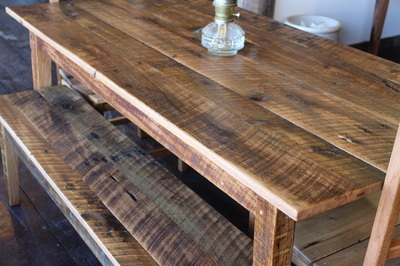 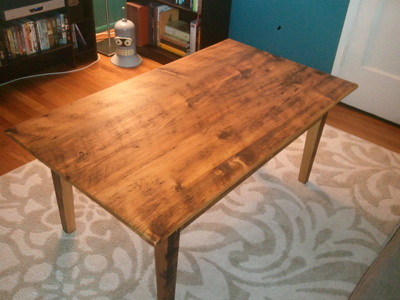 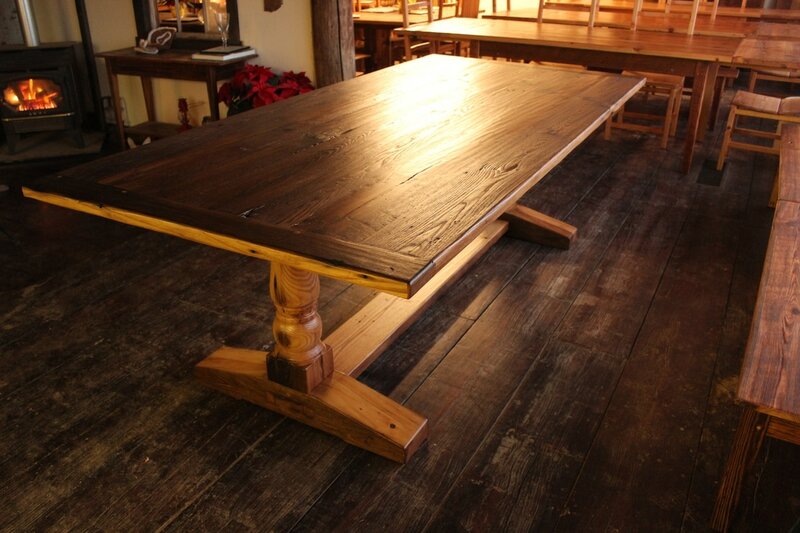 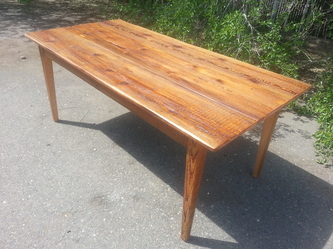 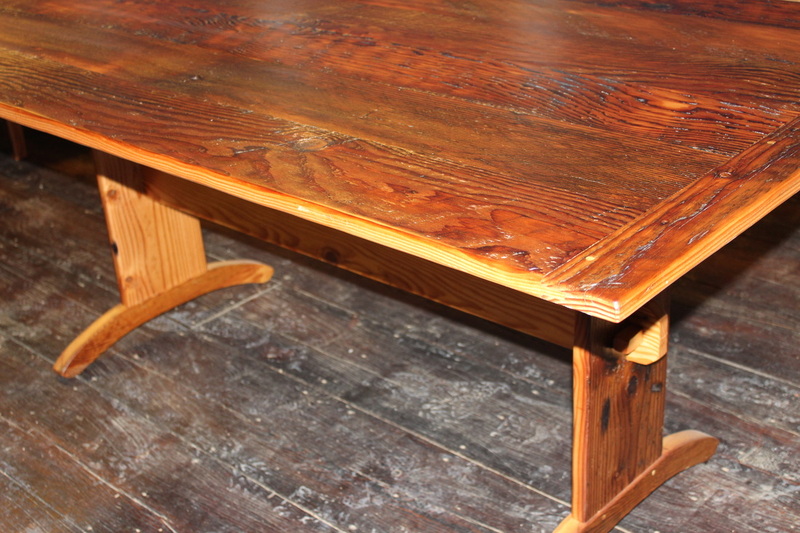 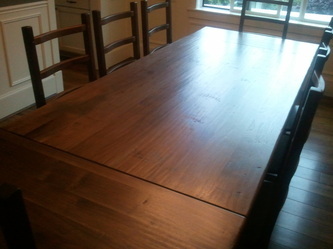 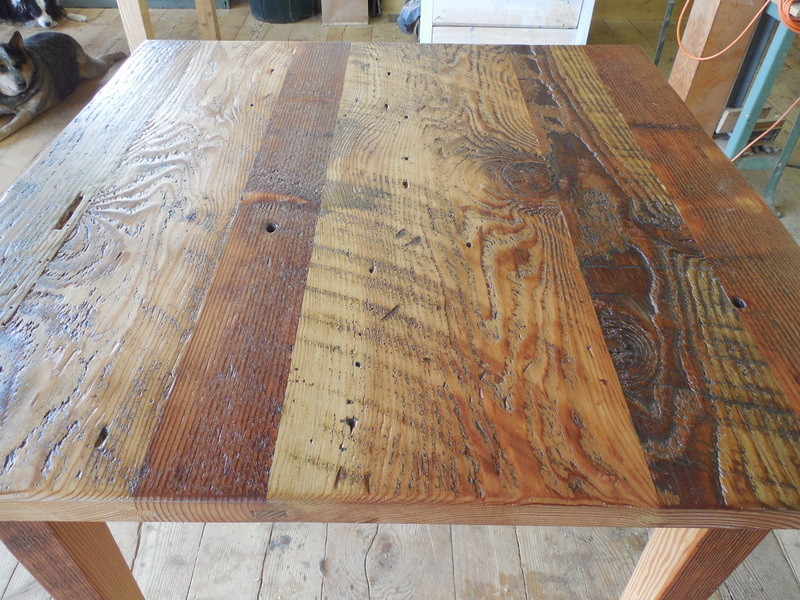 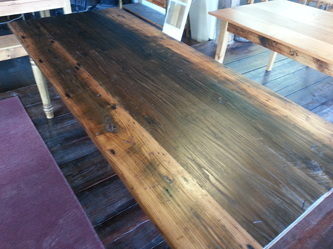 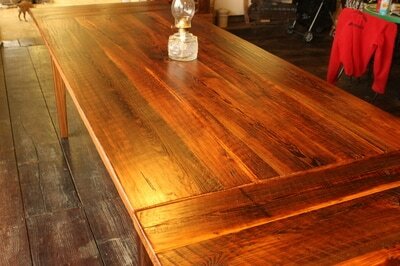 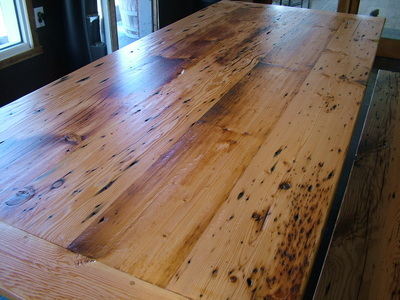 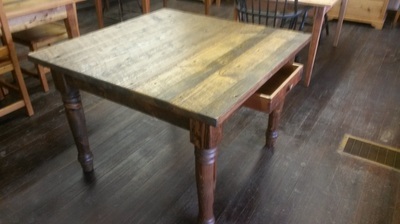 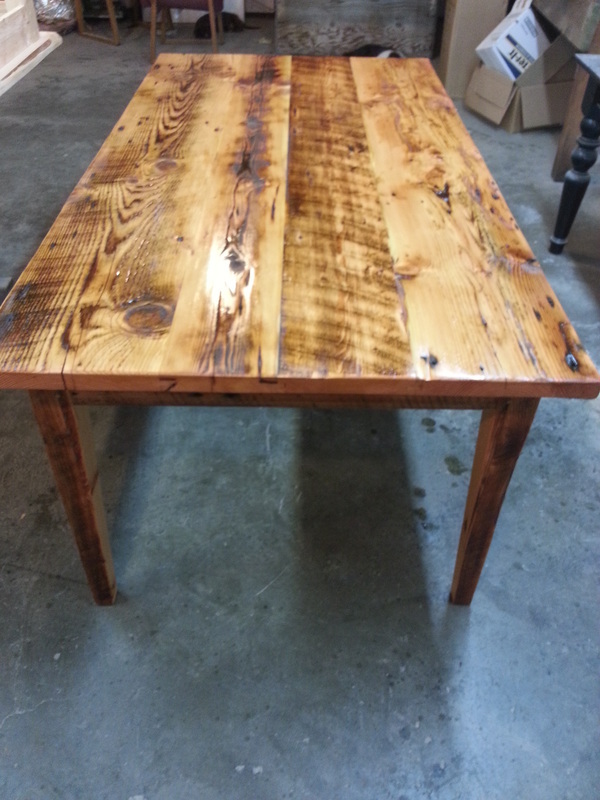 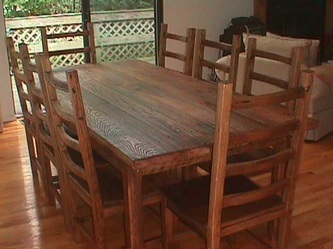 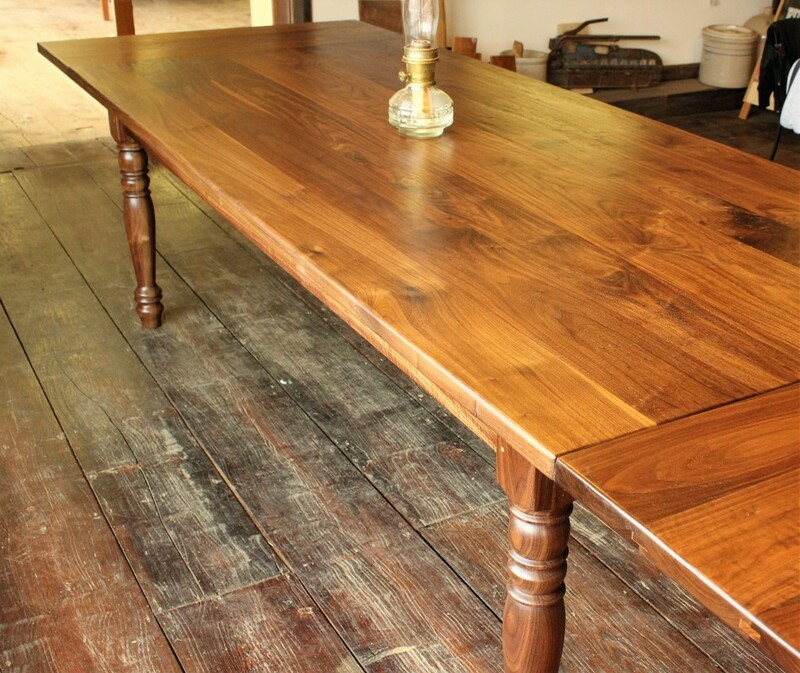 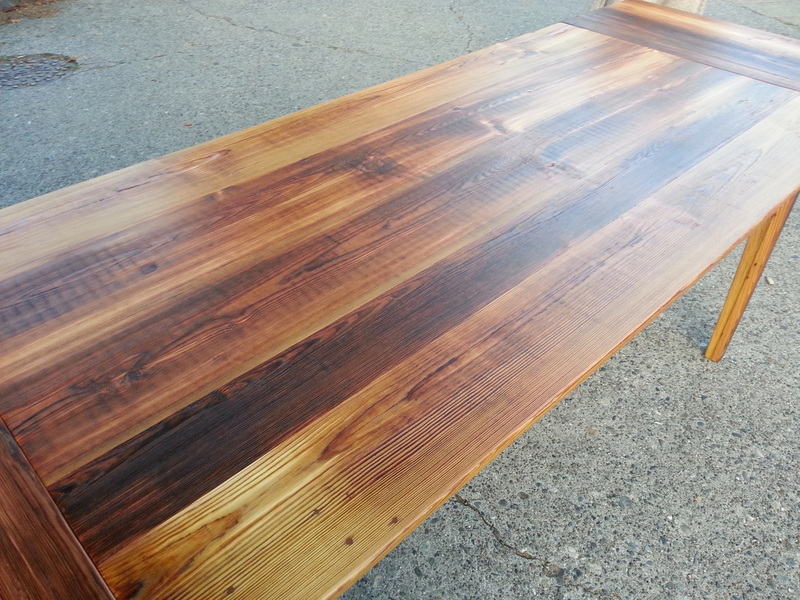 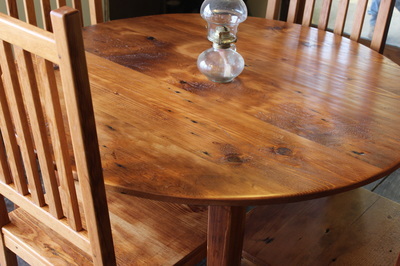 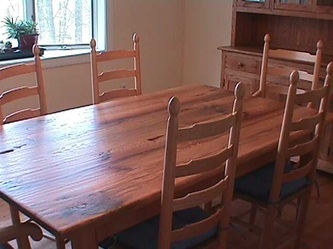 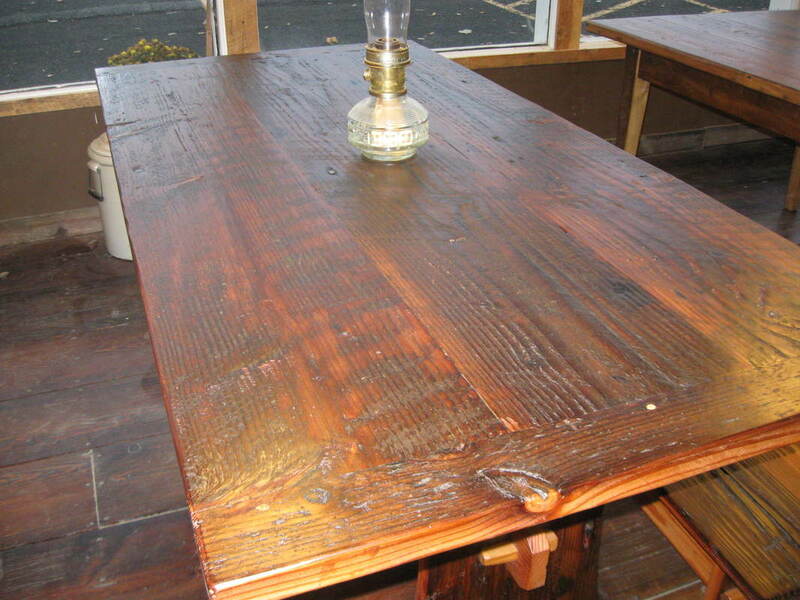 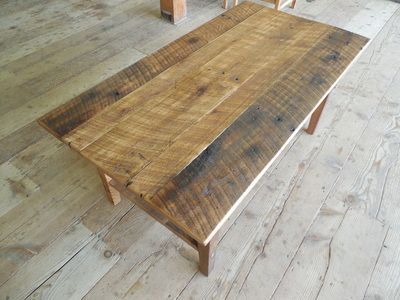 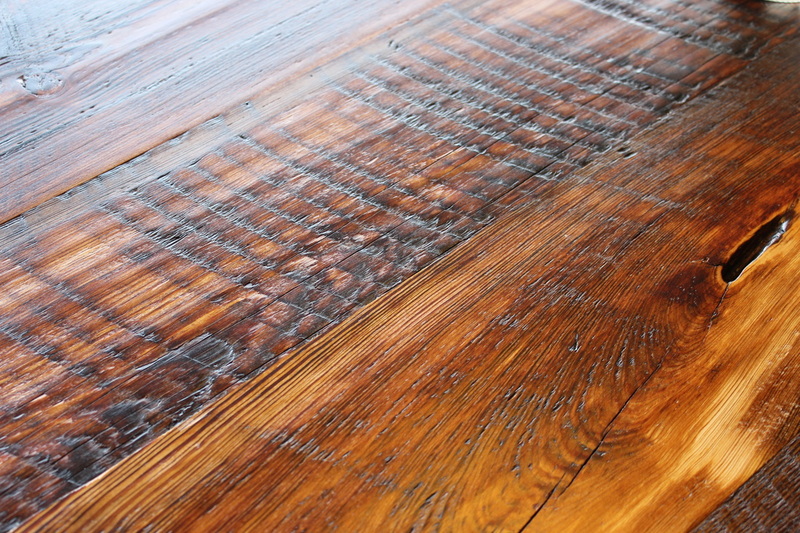 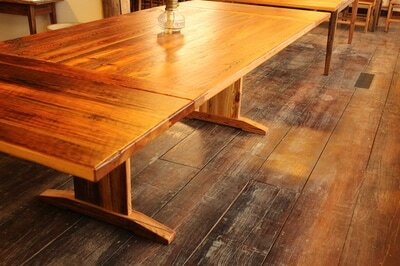 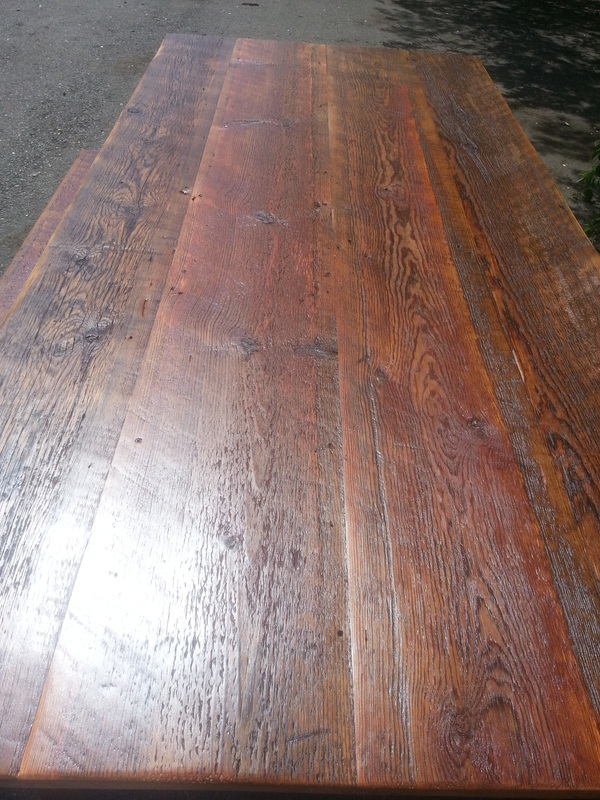 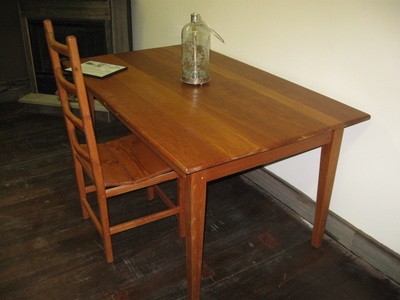 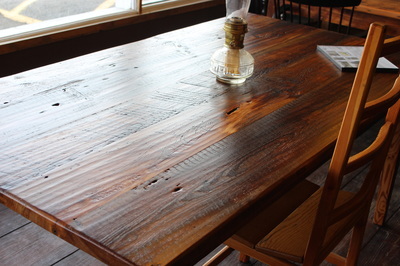 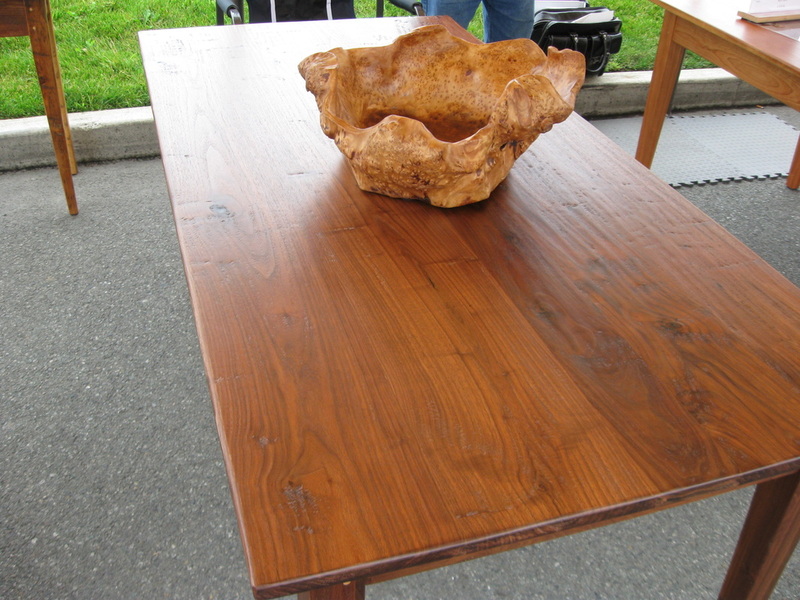 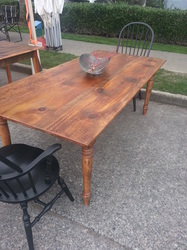 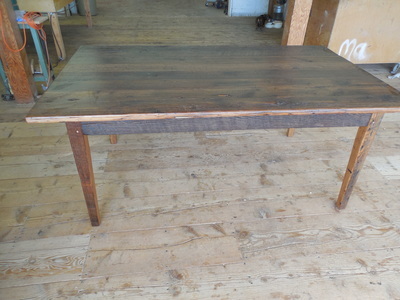 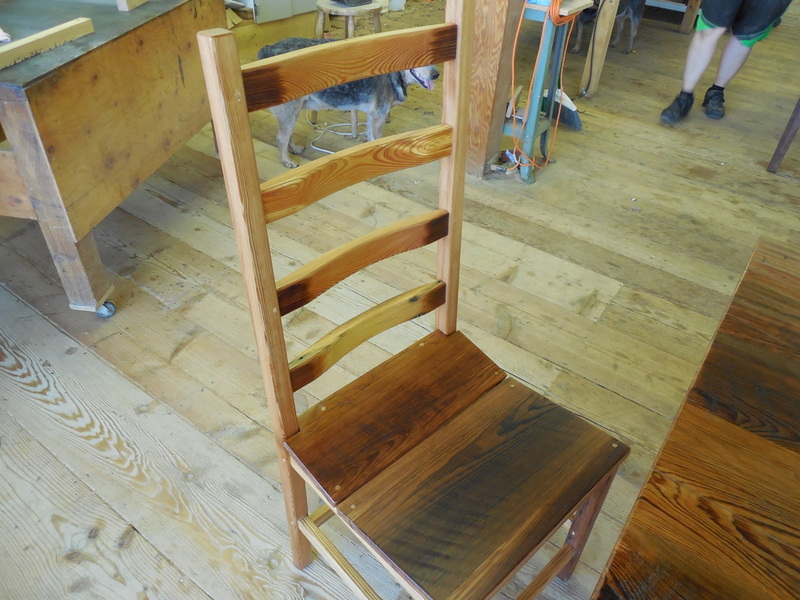 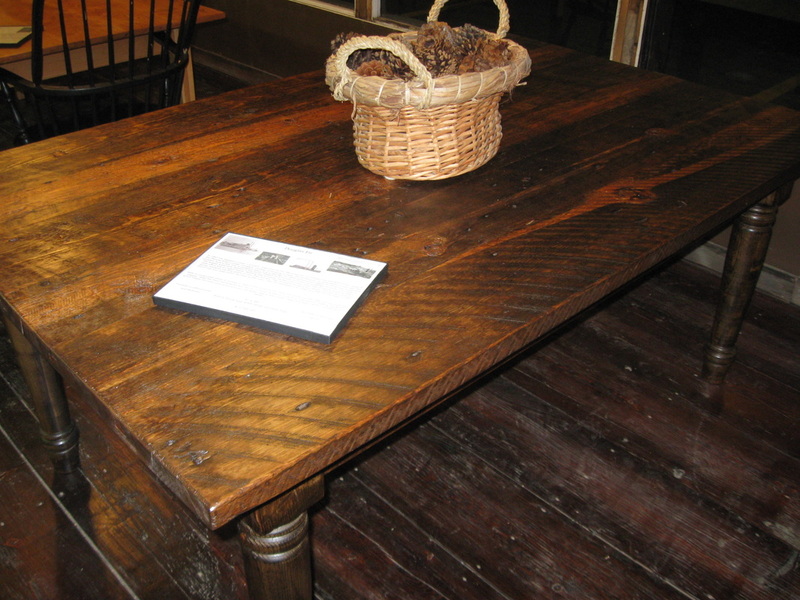 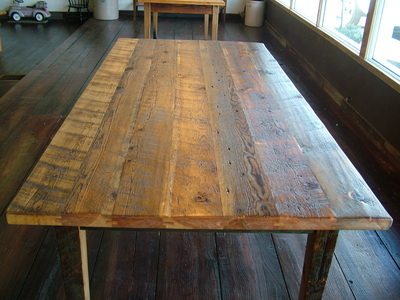 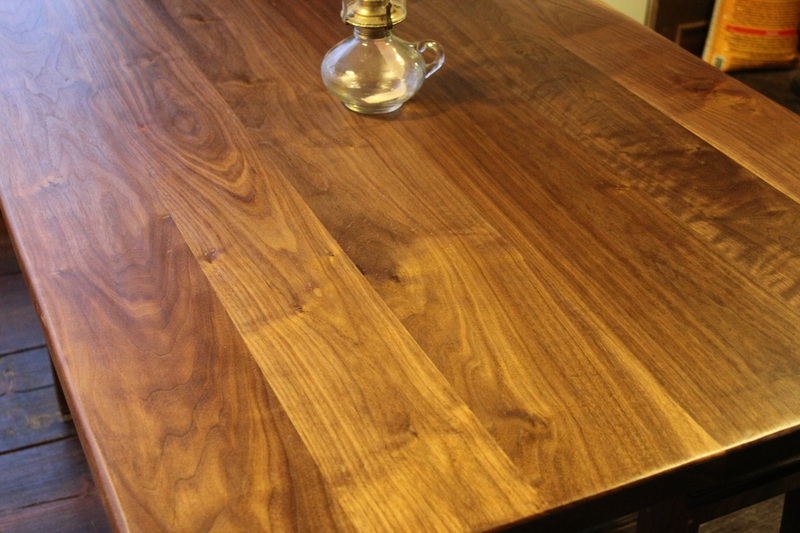 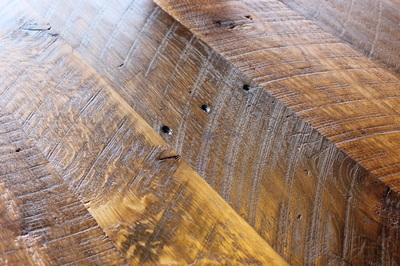 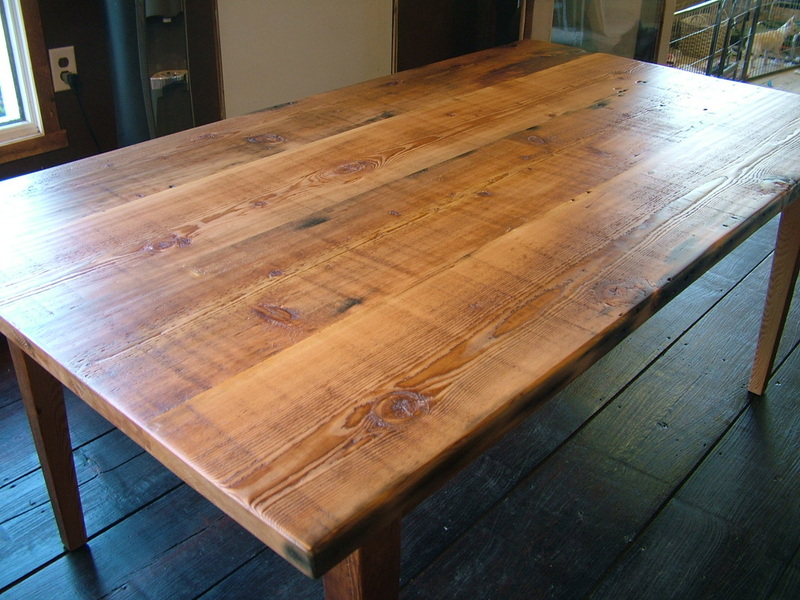 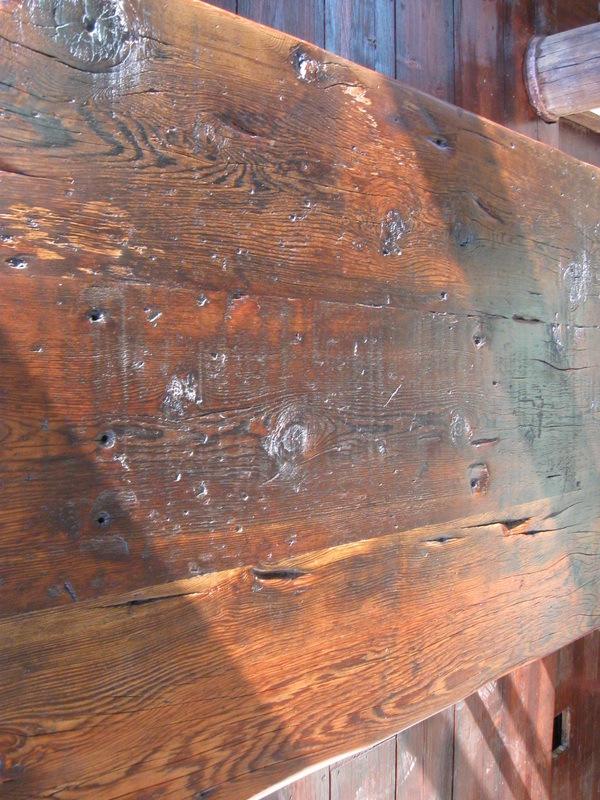 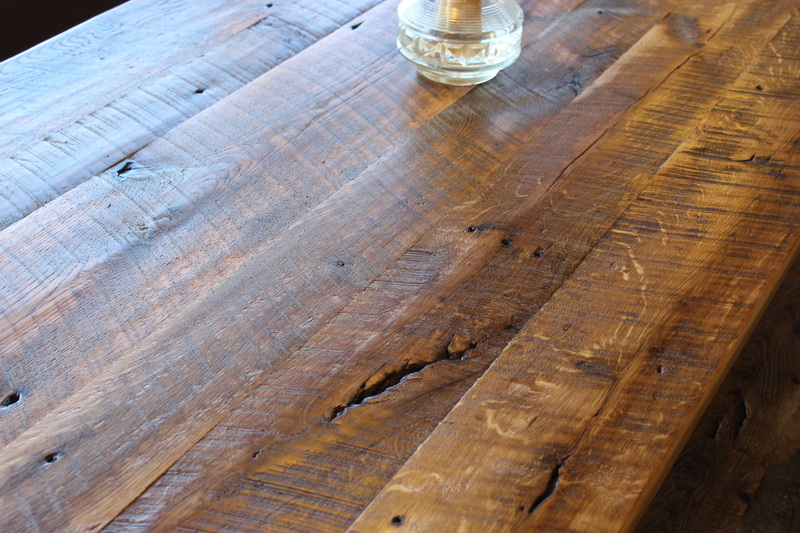 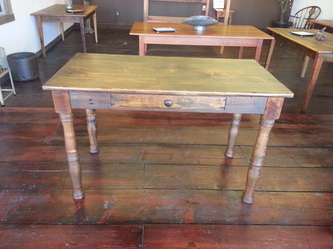 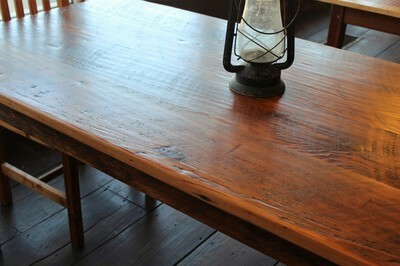 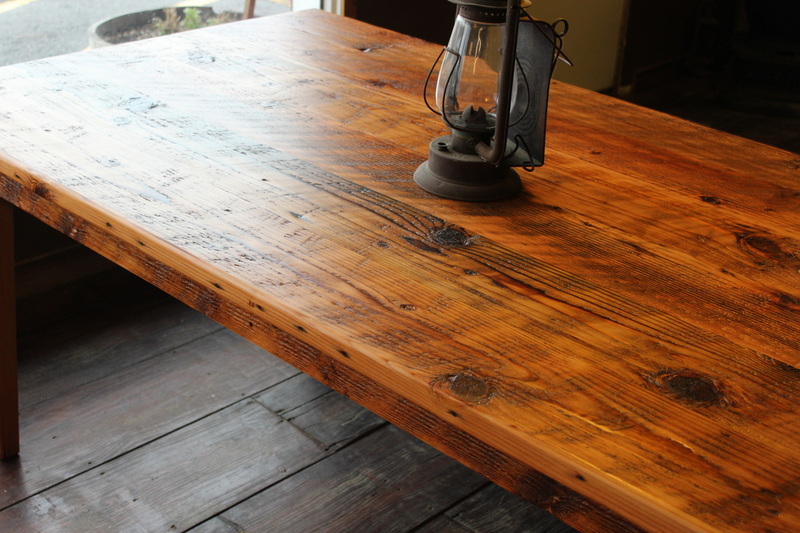 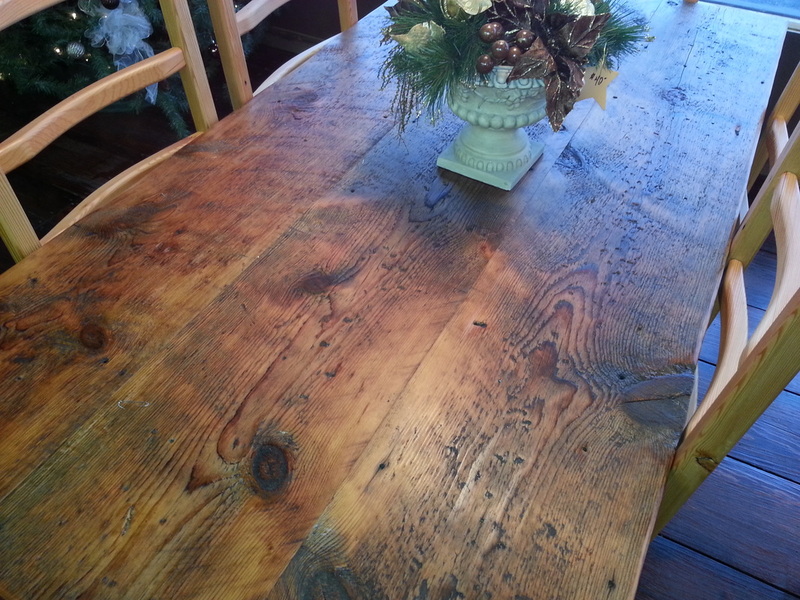 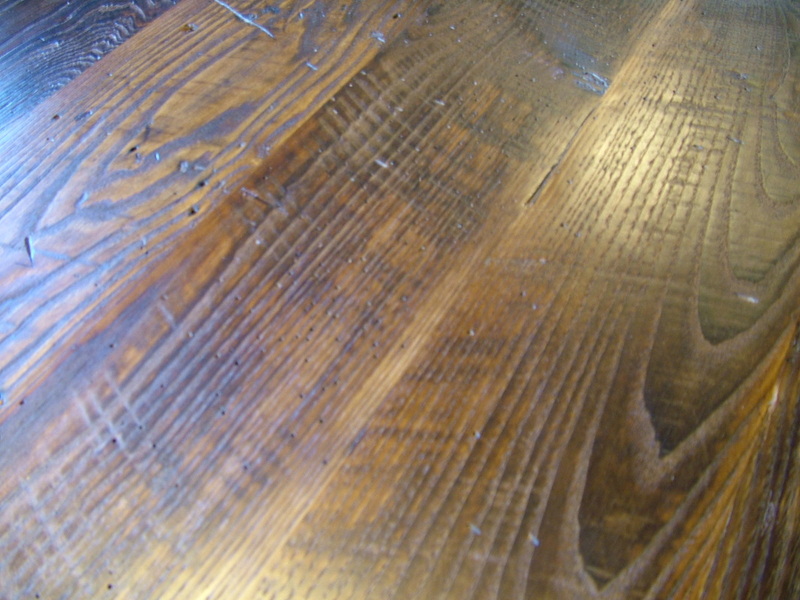 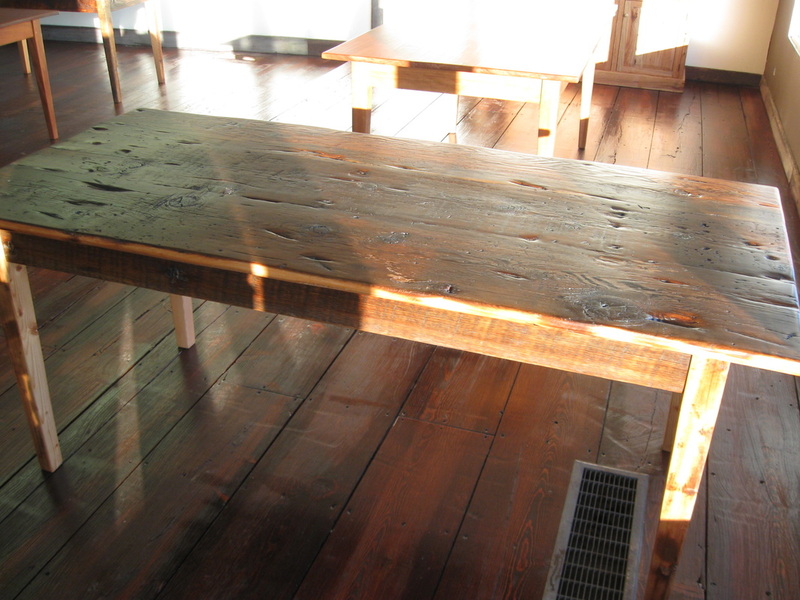 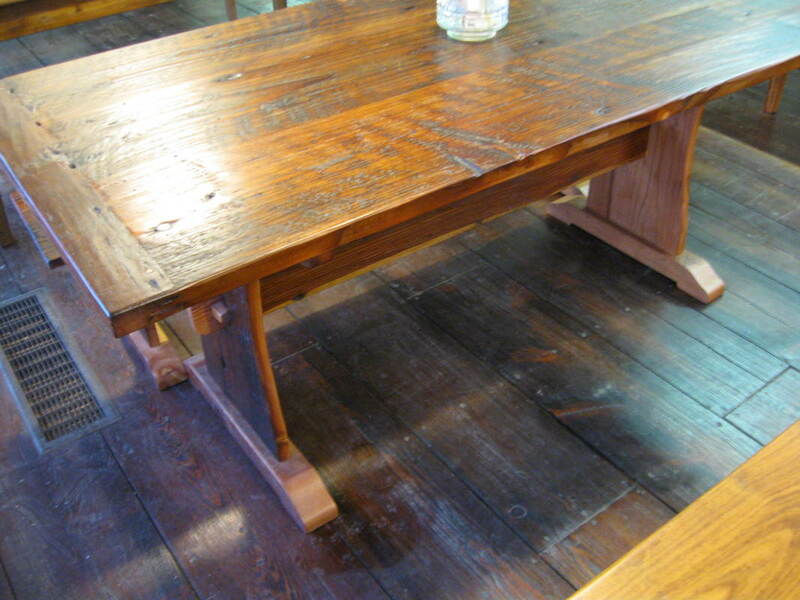 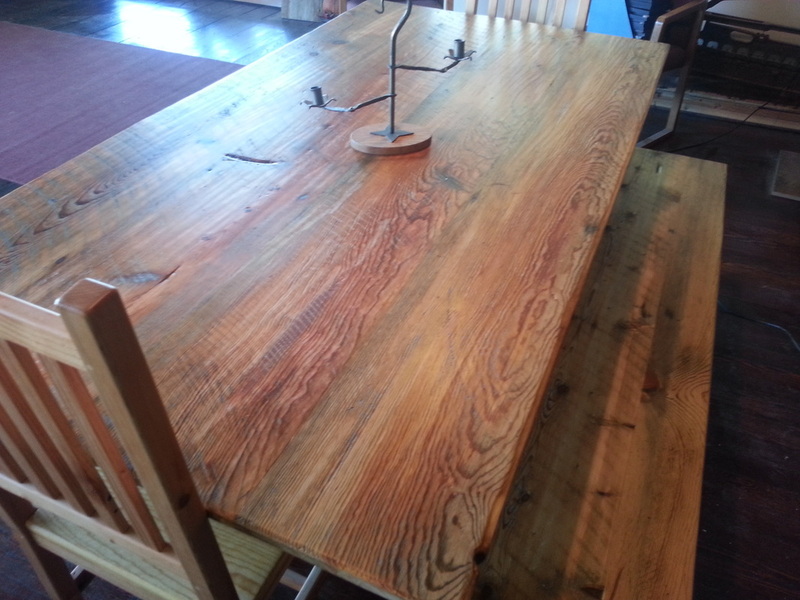 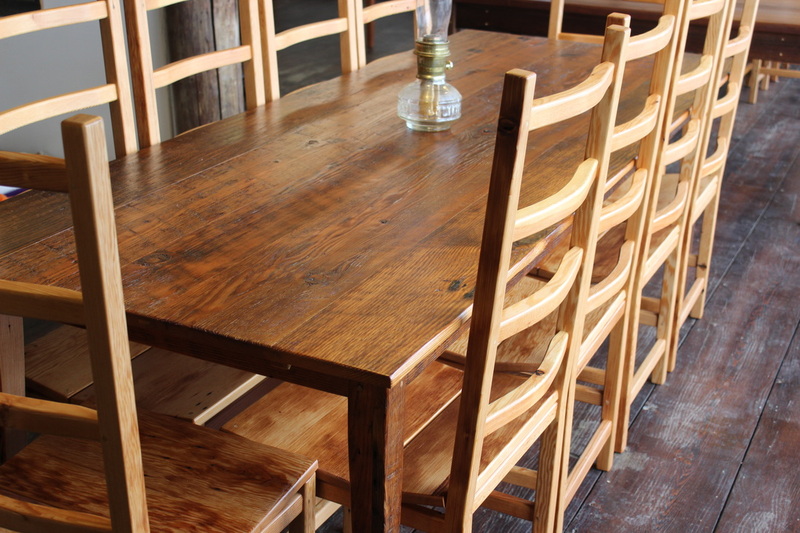 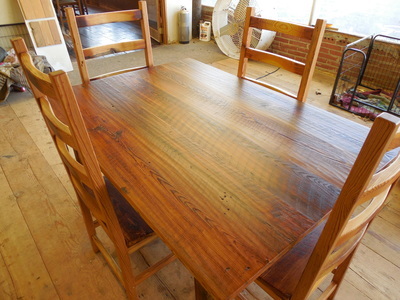 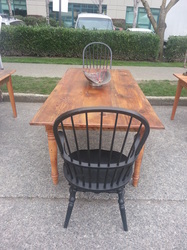 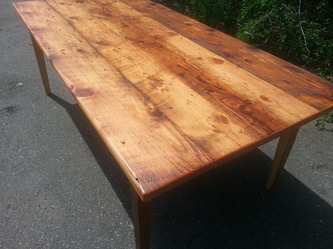 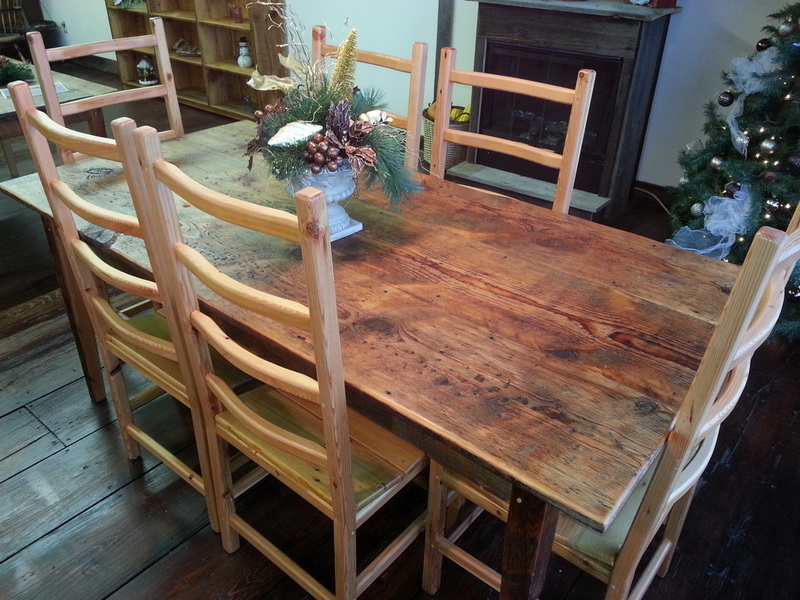 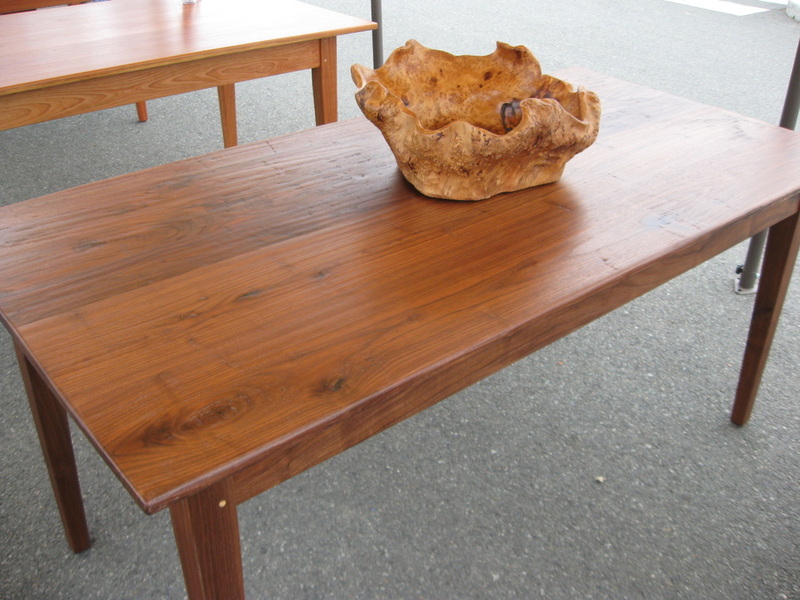 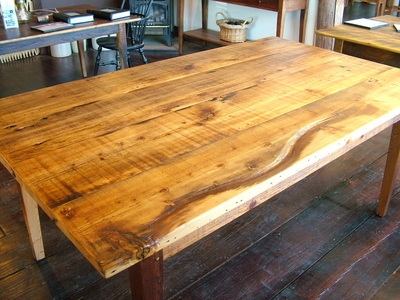 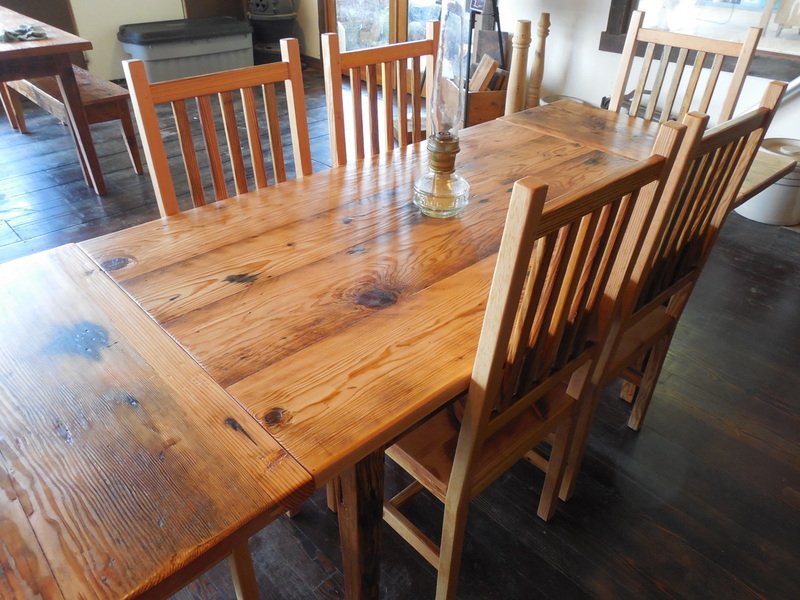 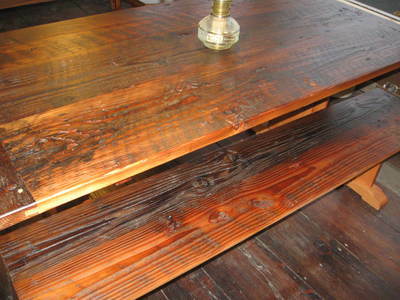 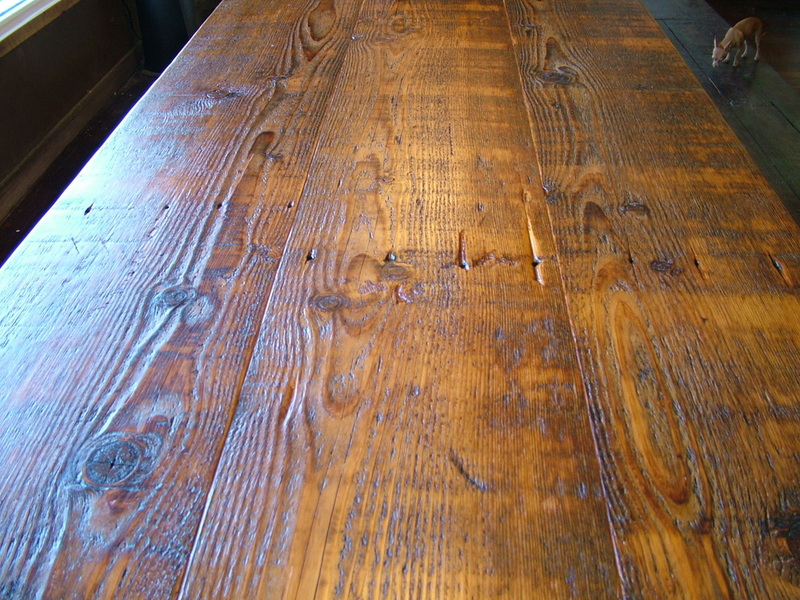 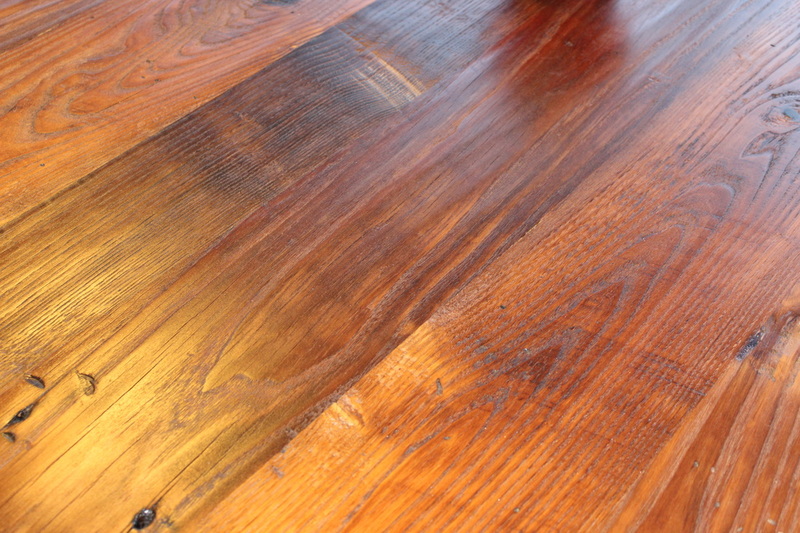 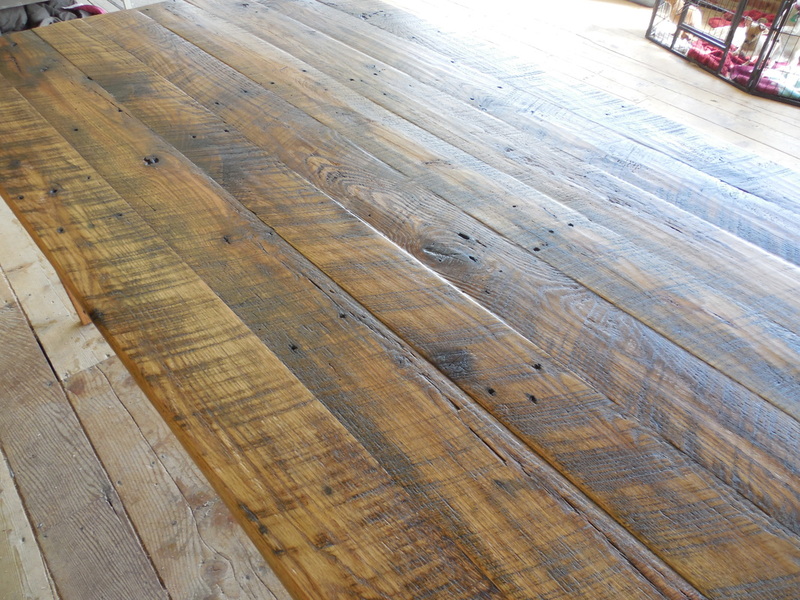 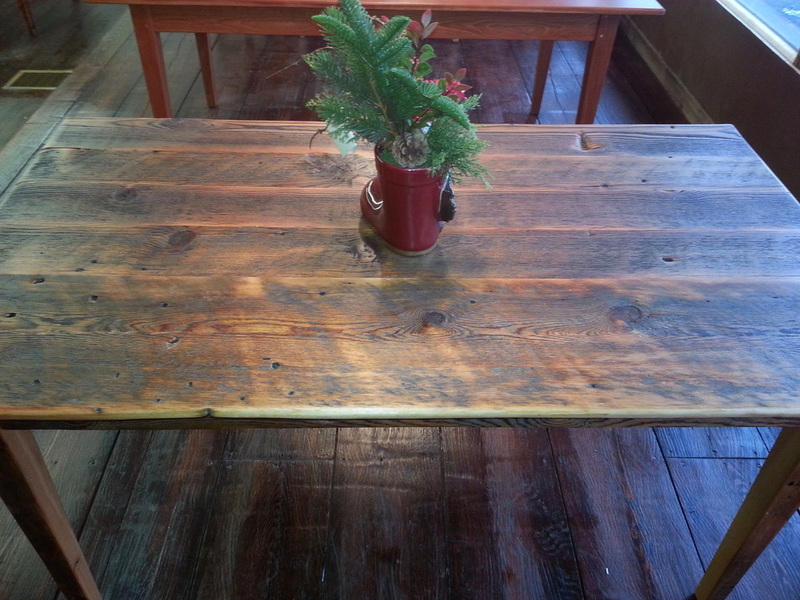 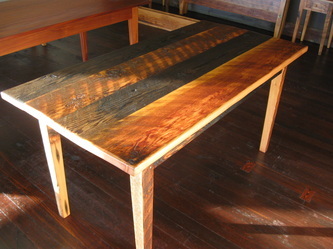 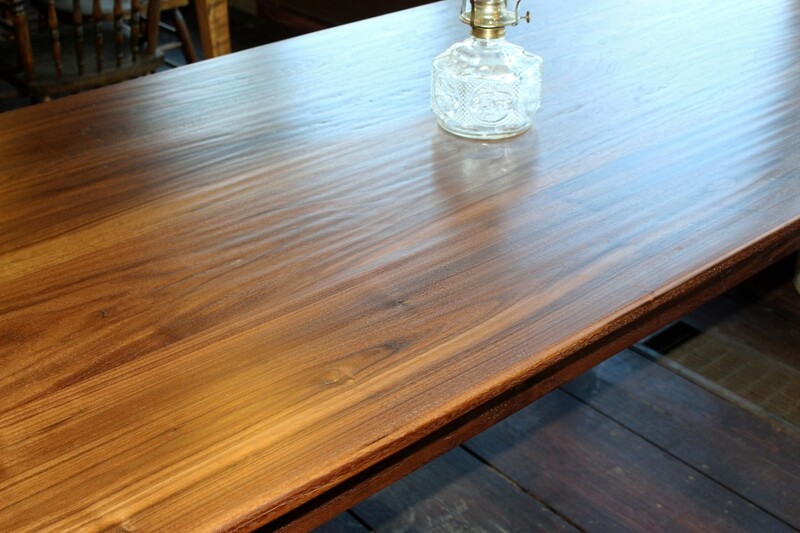 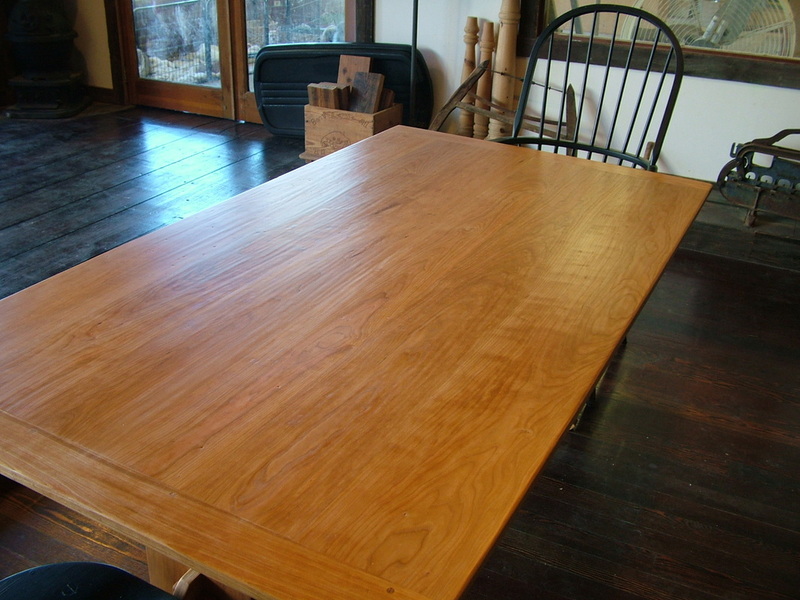 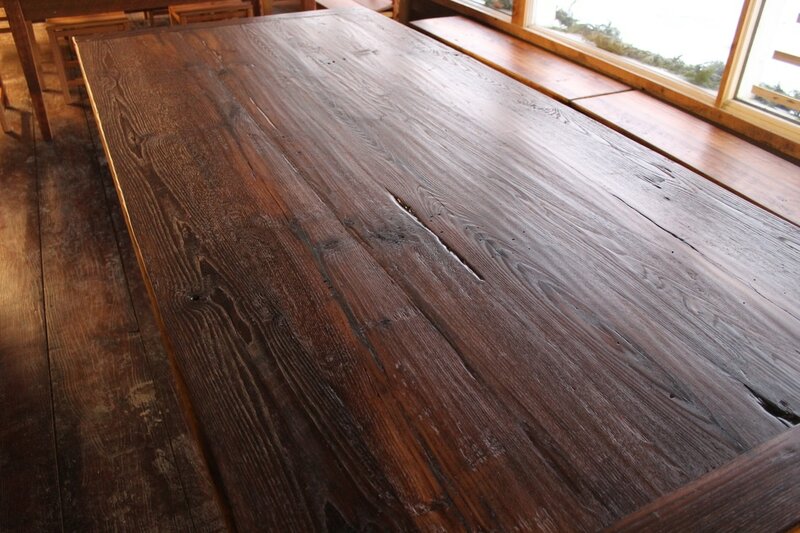 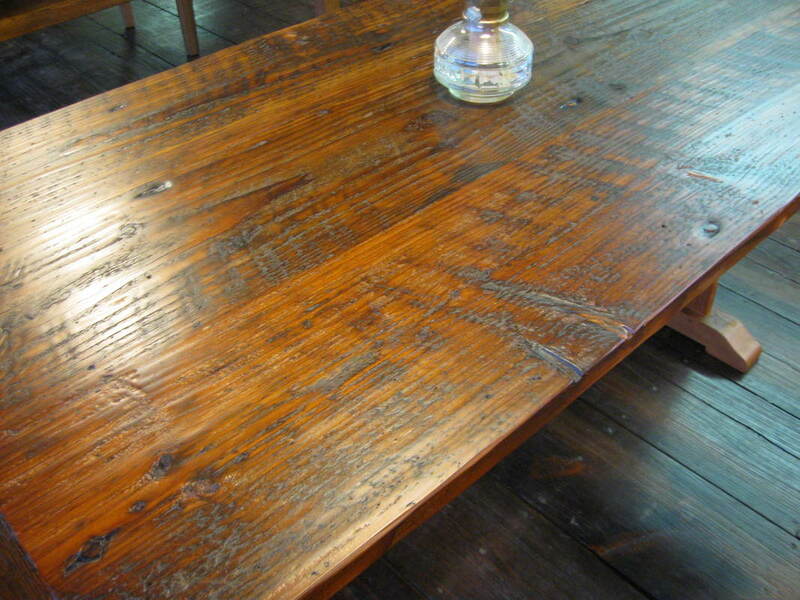 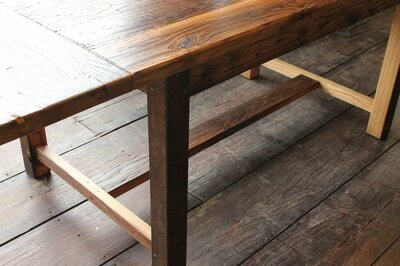 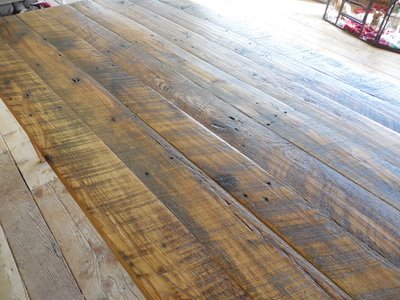 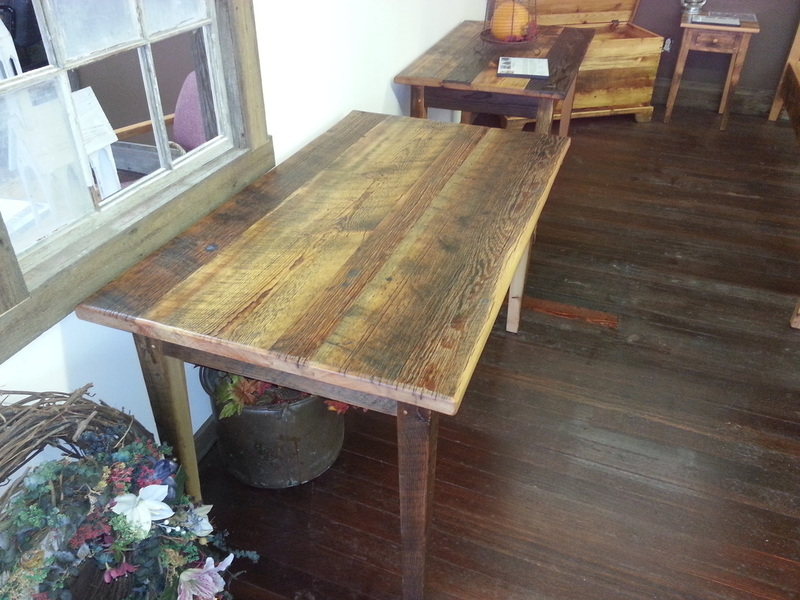 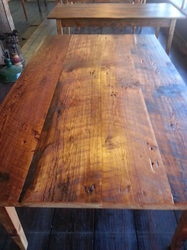 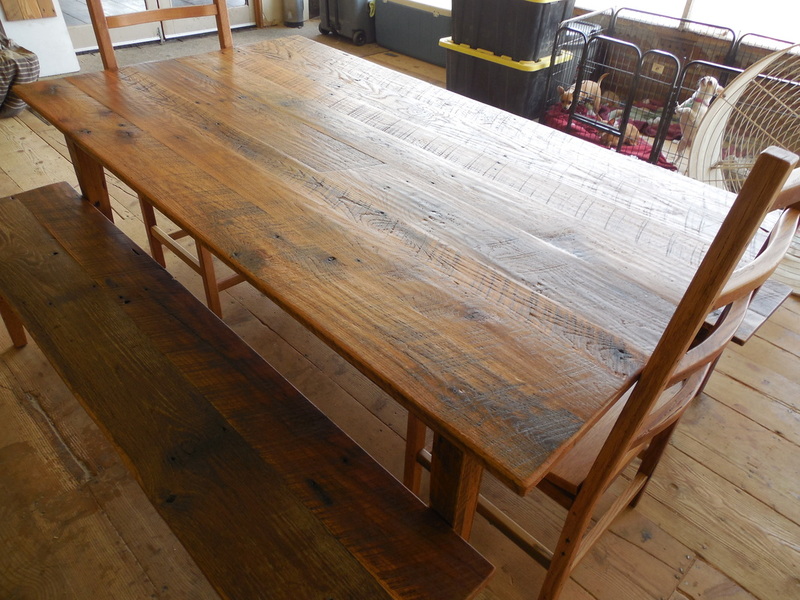 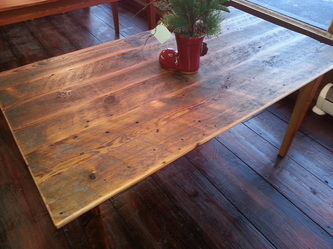 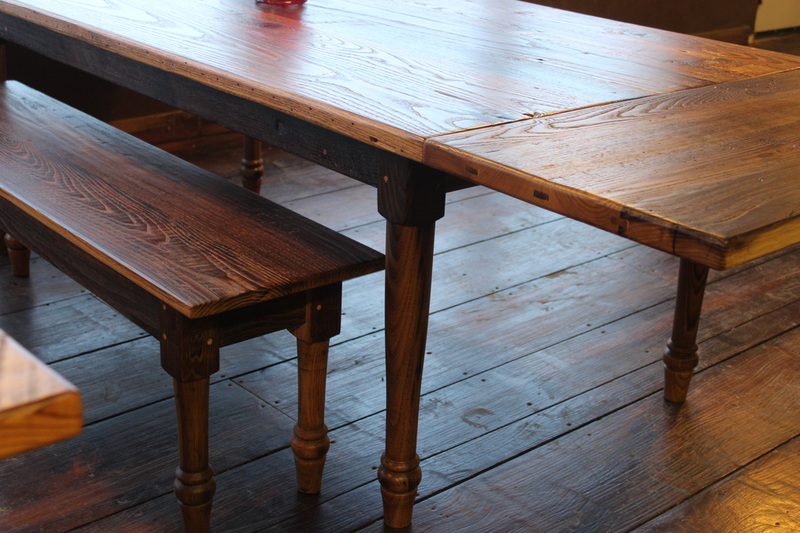 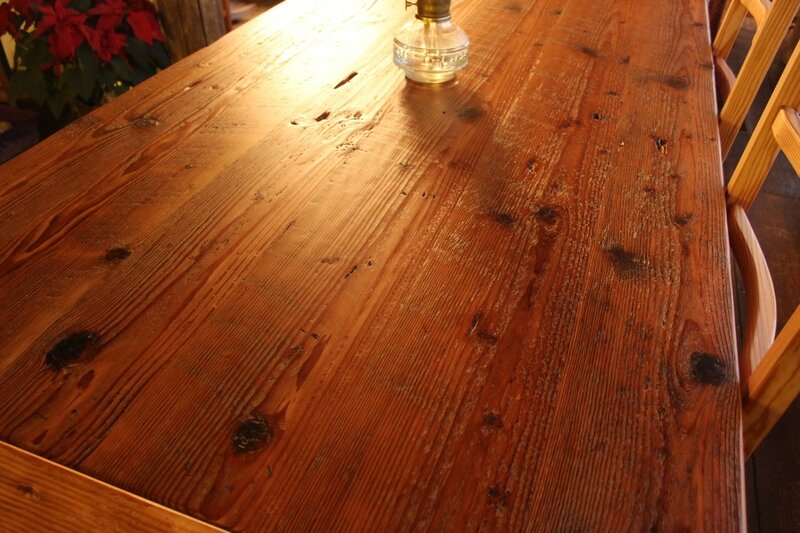 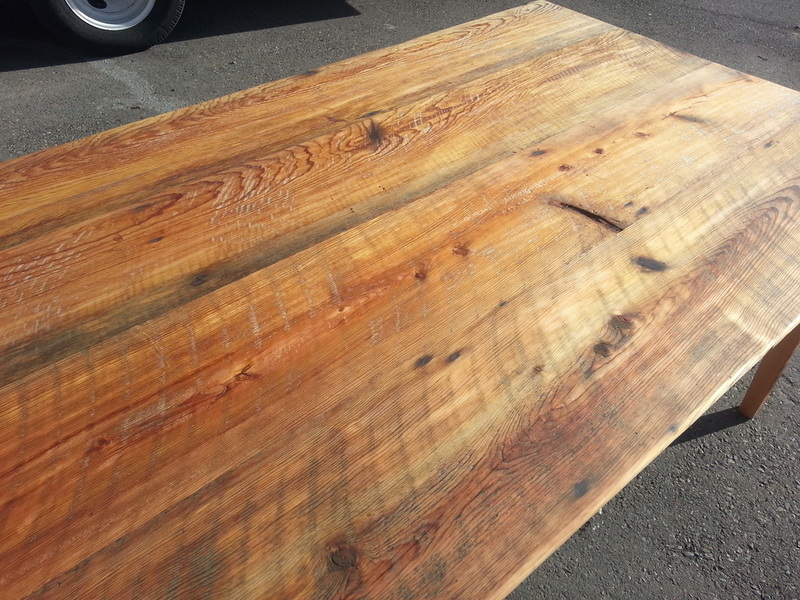 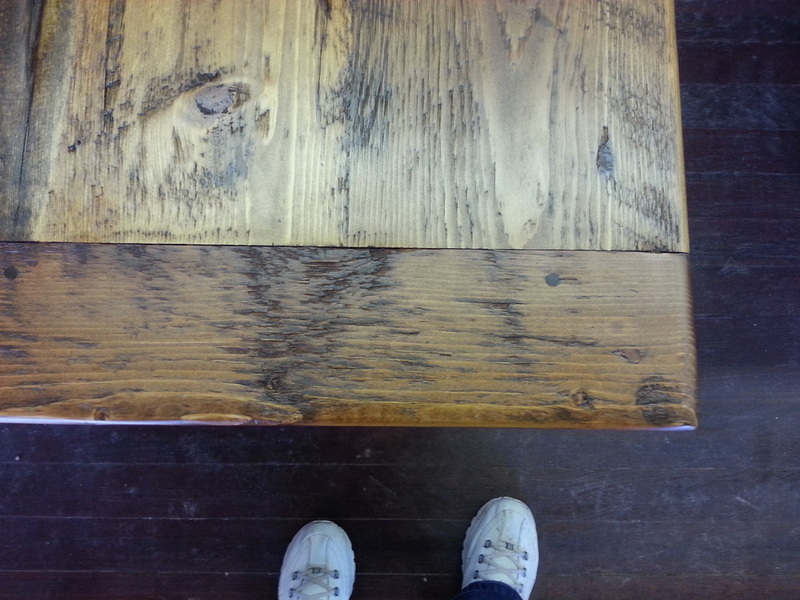 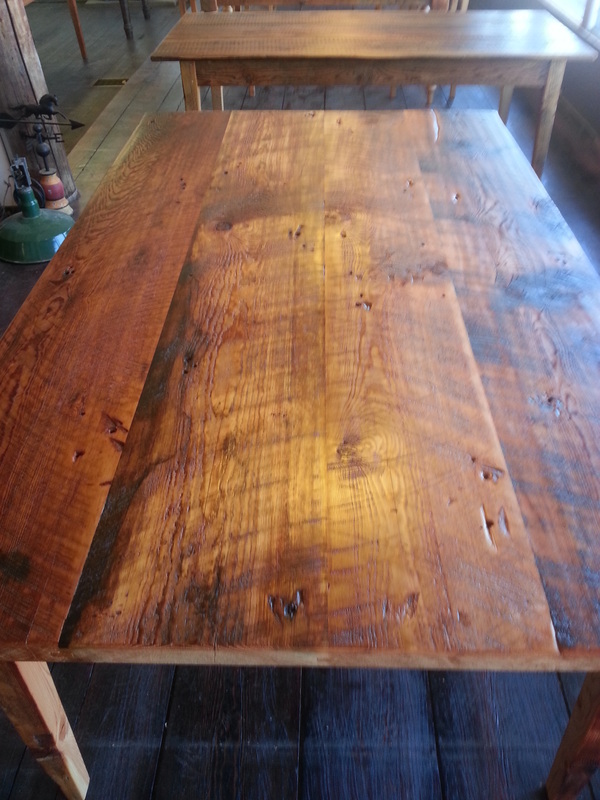 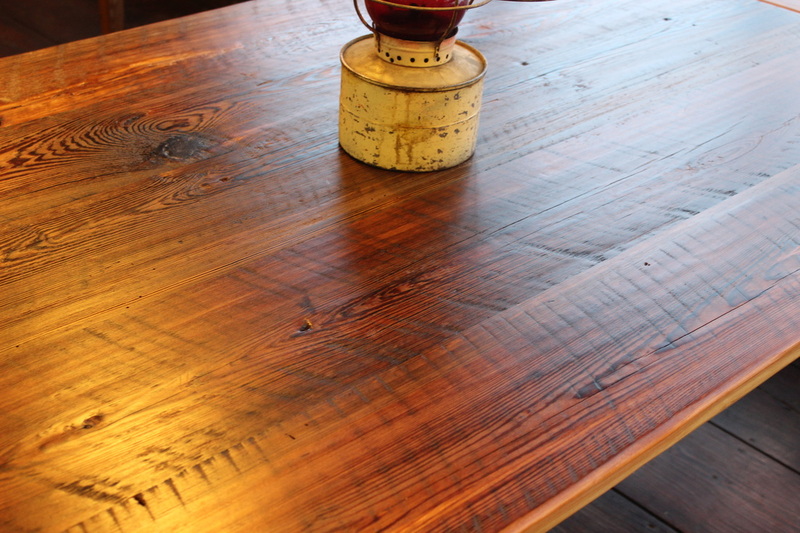 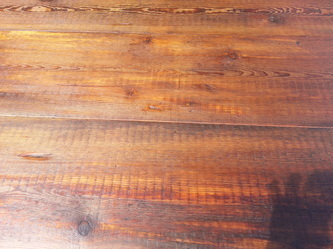 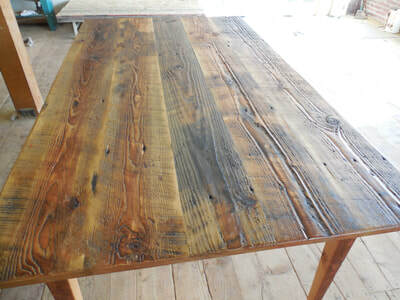 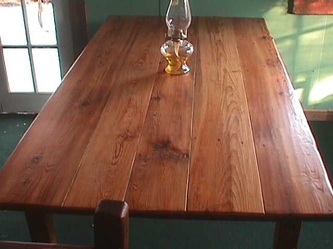 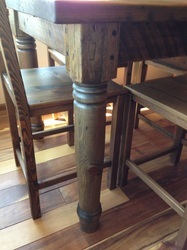 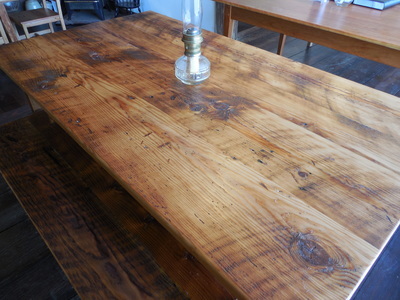 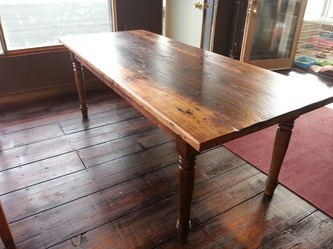 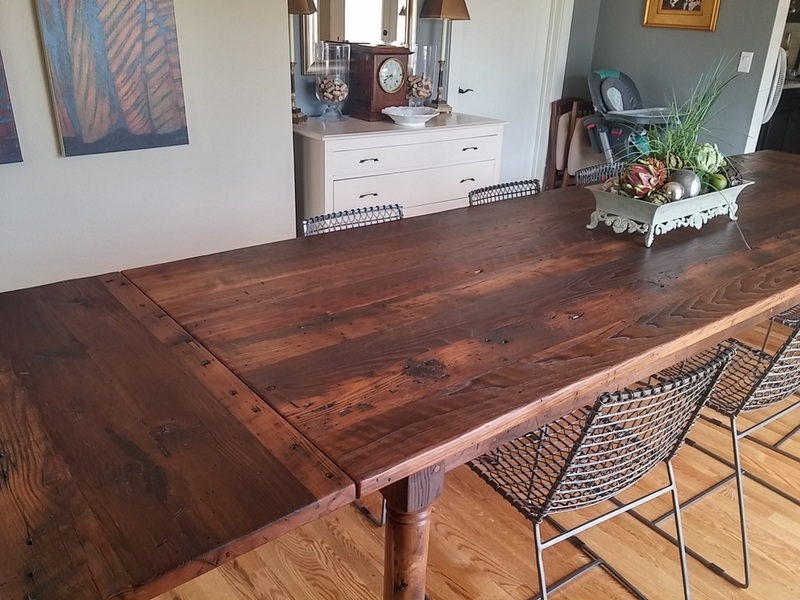 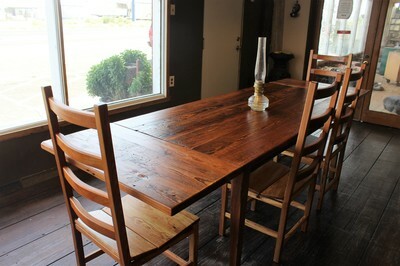 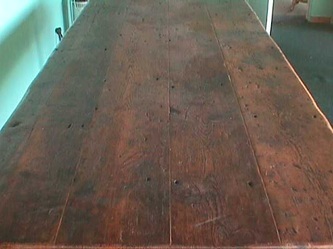 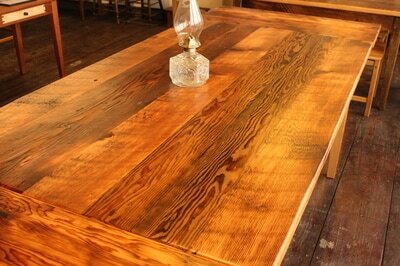 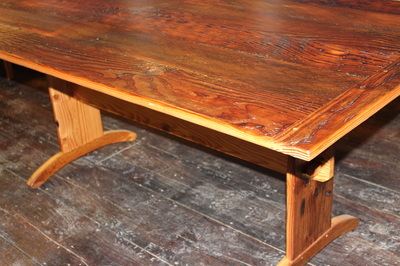 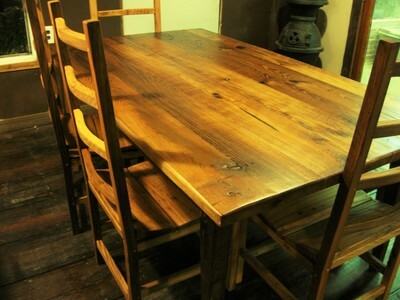 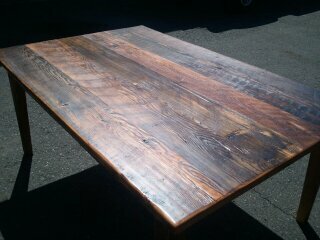 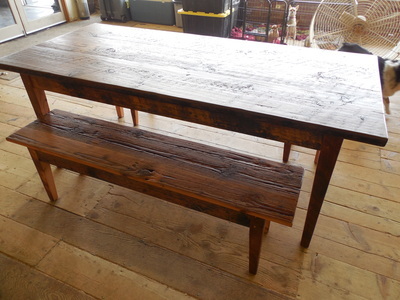 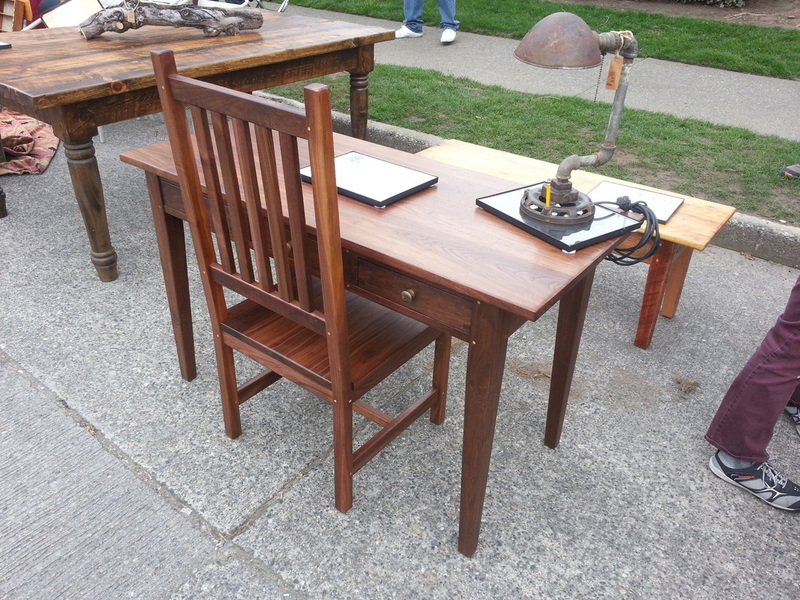 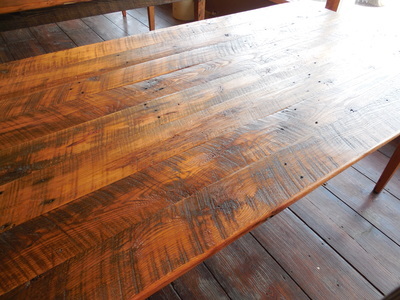 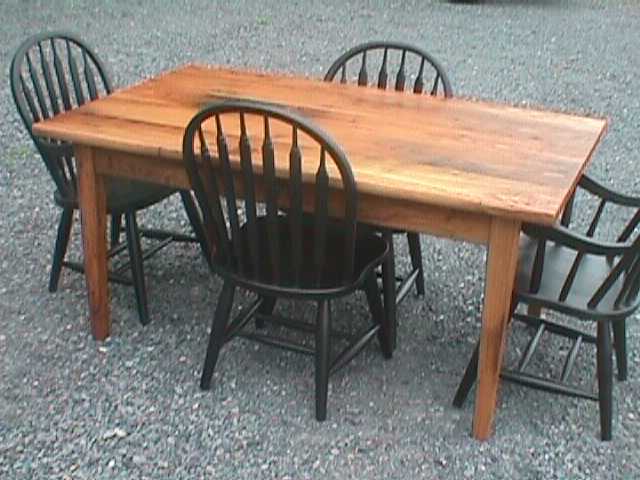 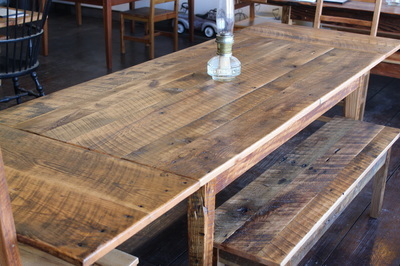 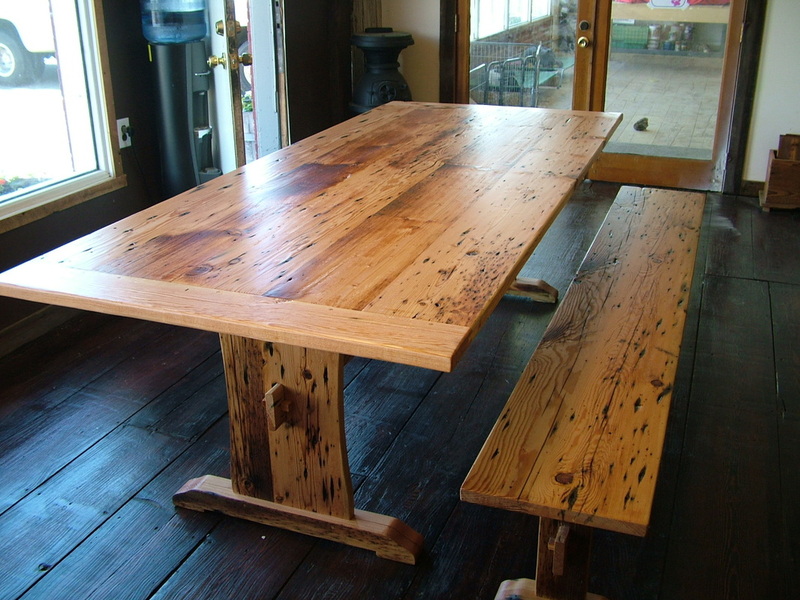 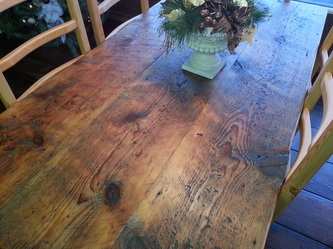 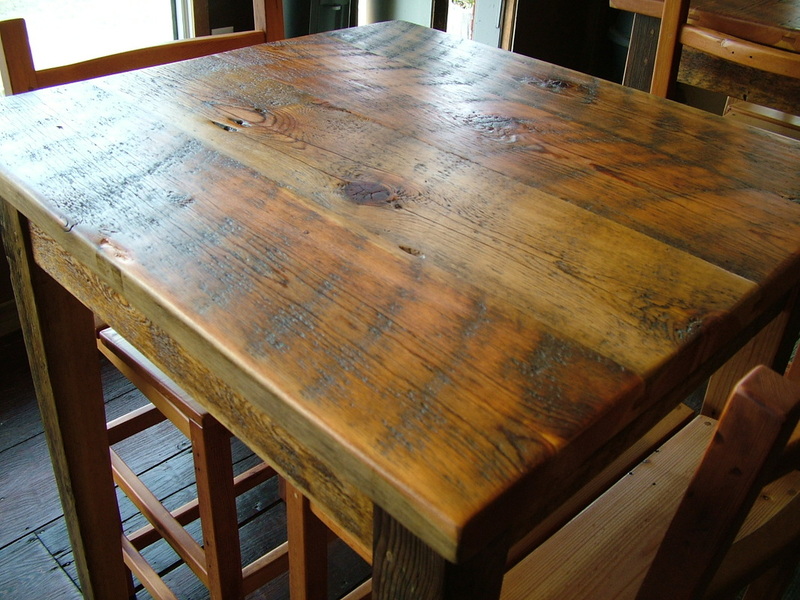 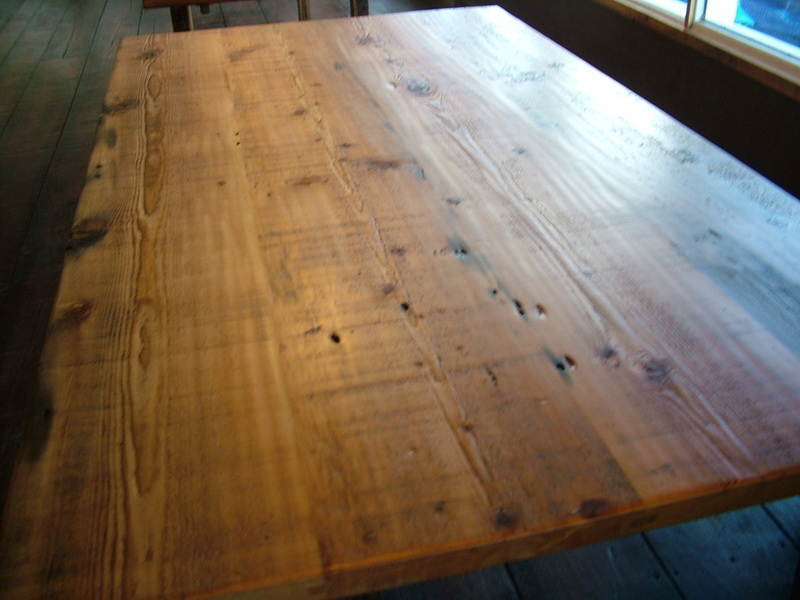 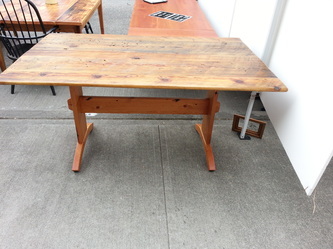 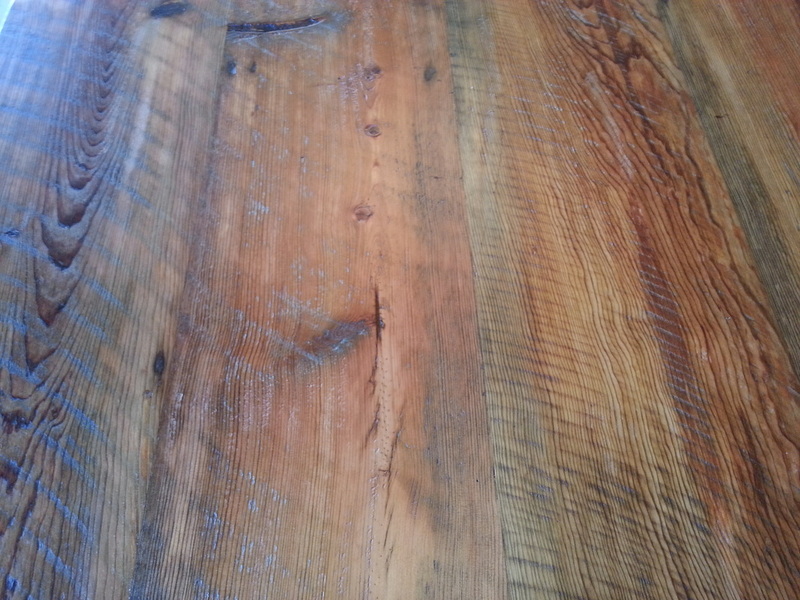 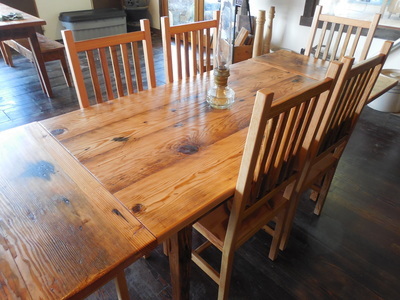 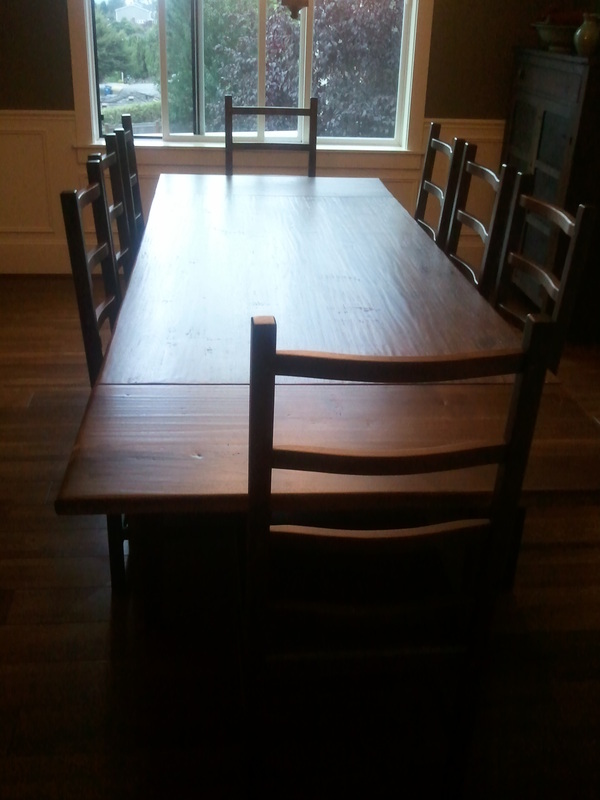 I can create a table that looks very old or a museum quality heirloom. 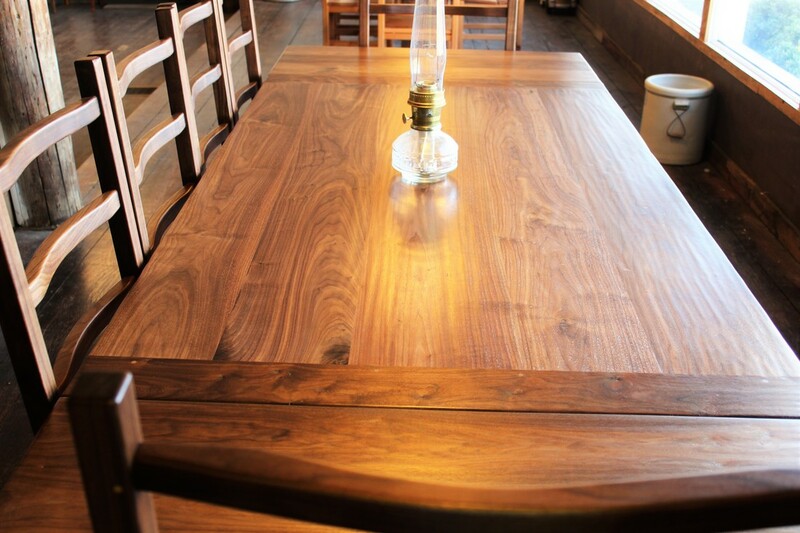 You are the boss. 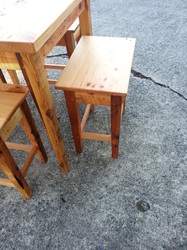 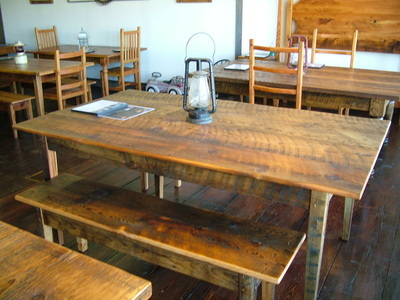 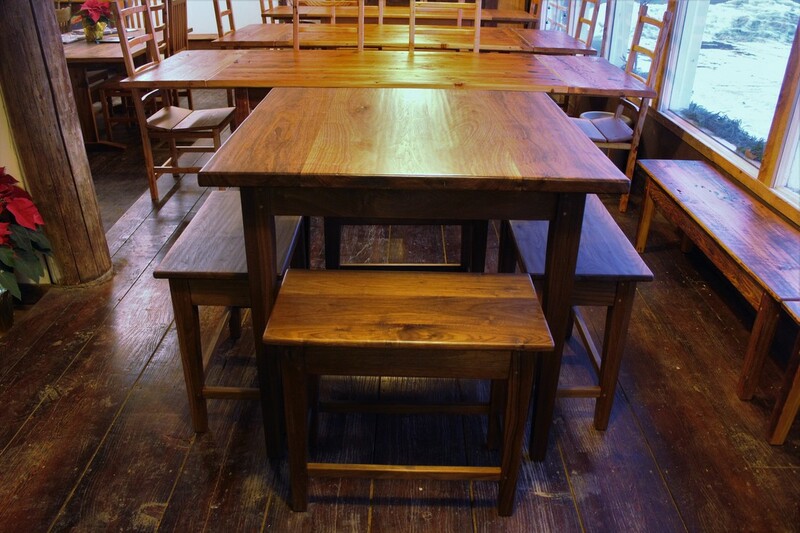 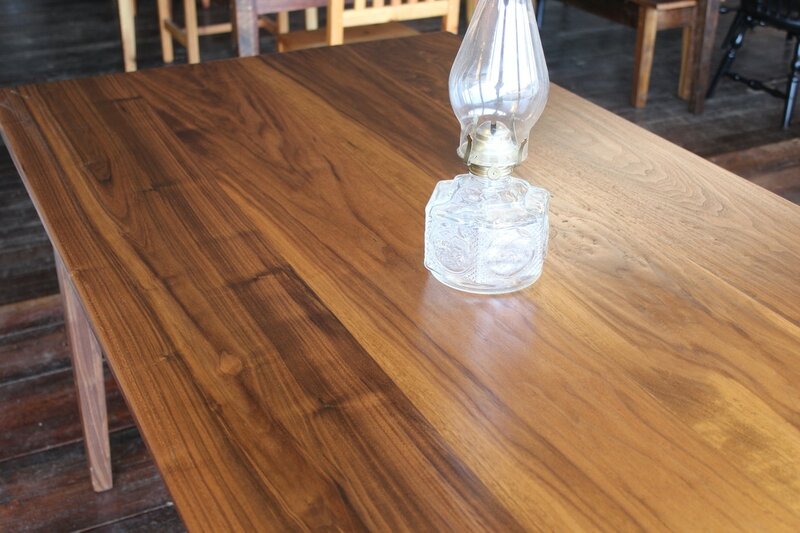 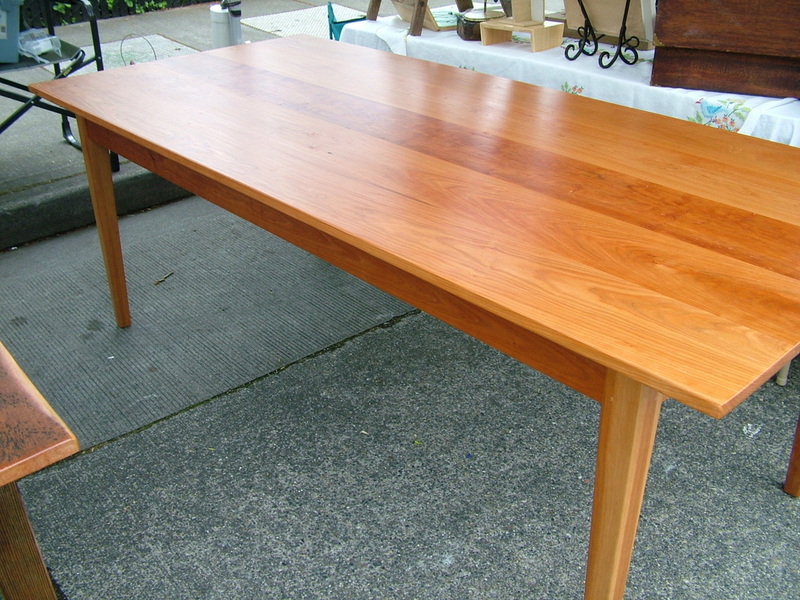 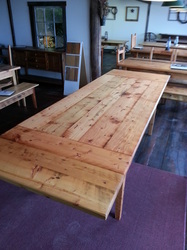 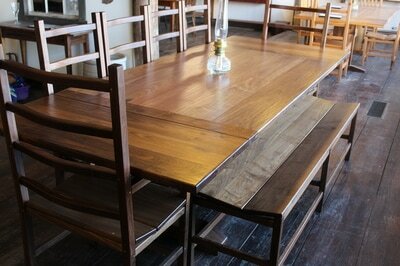 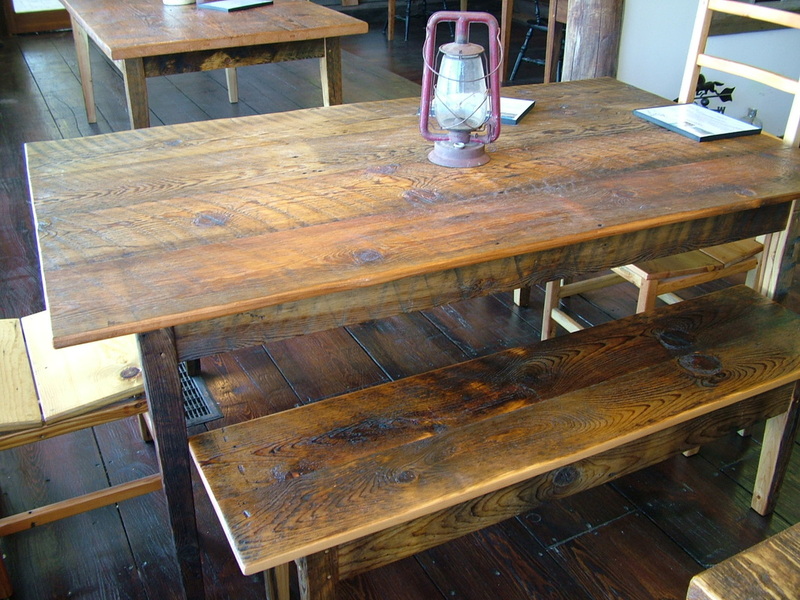 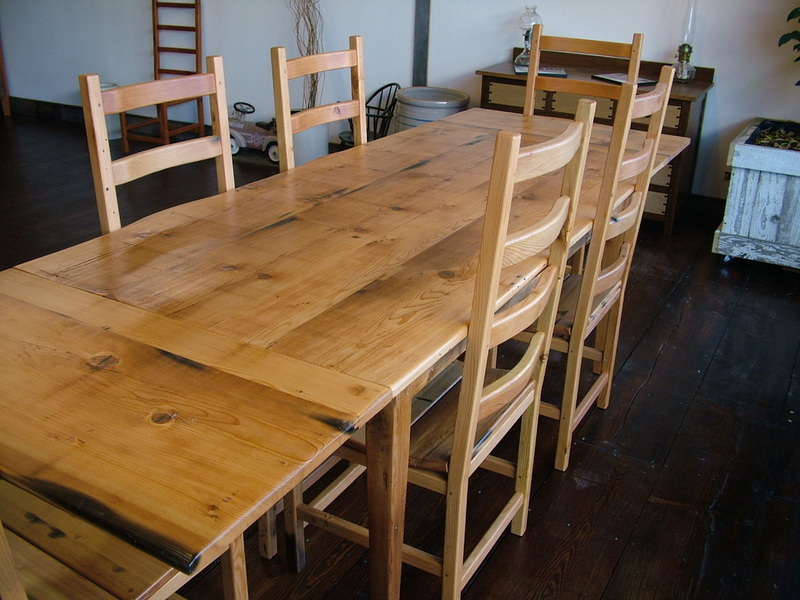 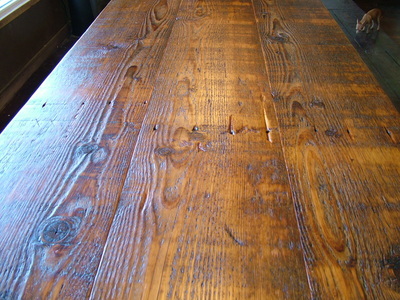 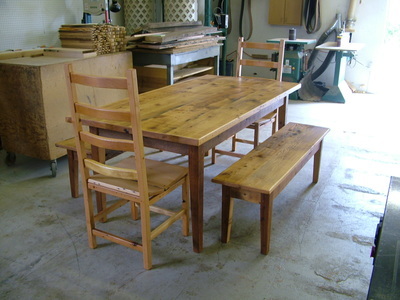 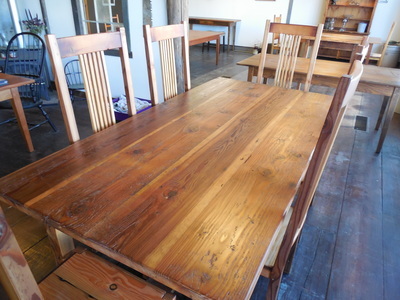 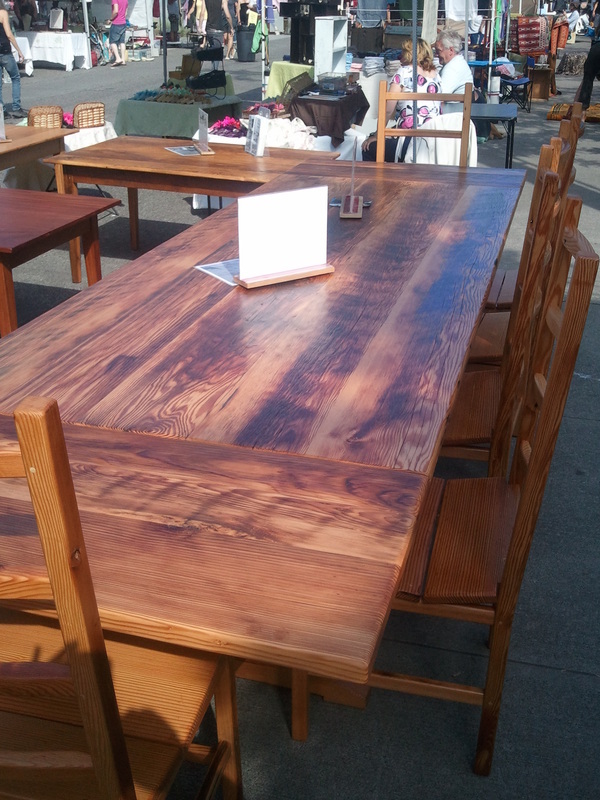 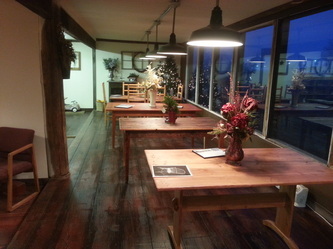 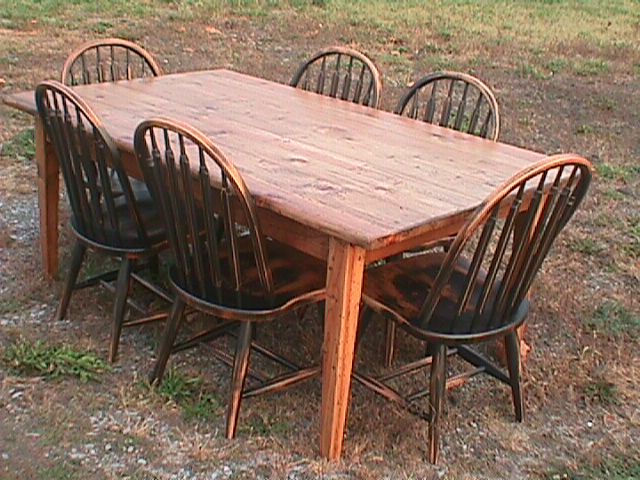 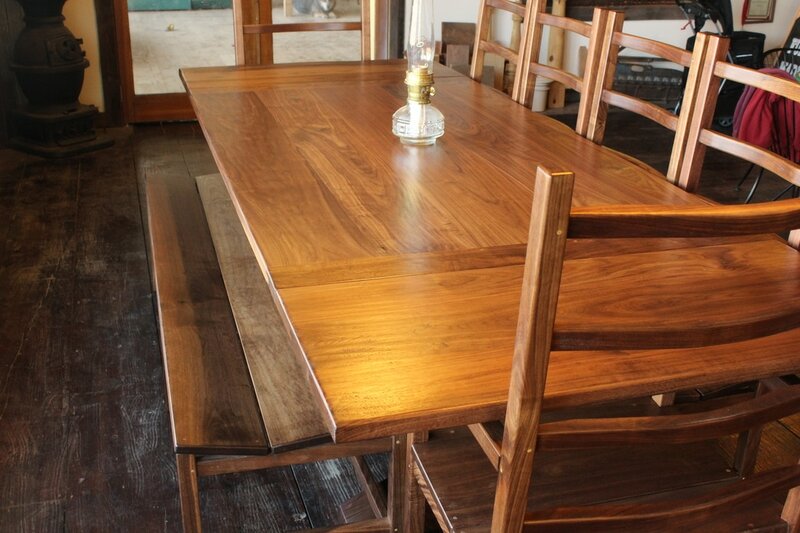 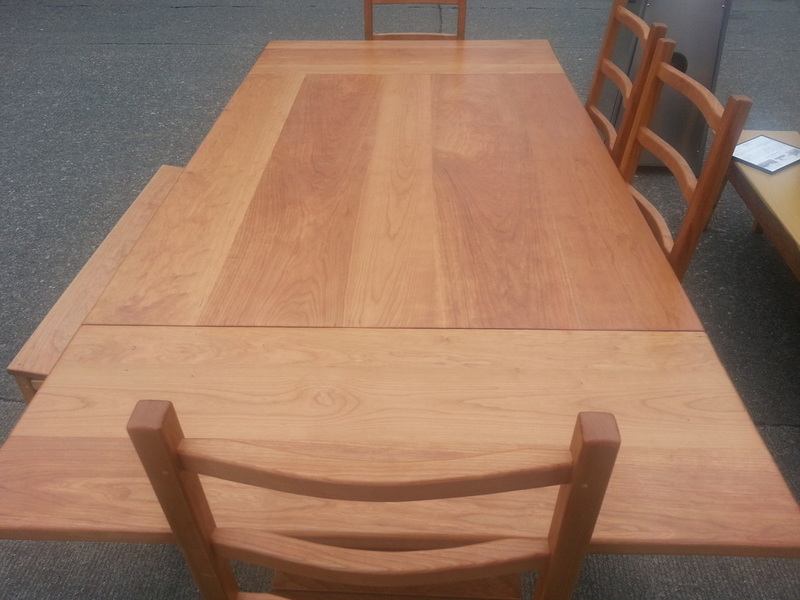 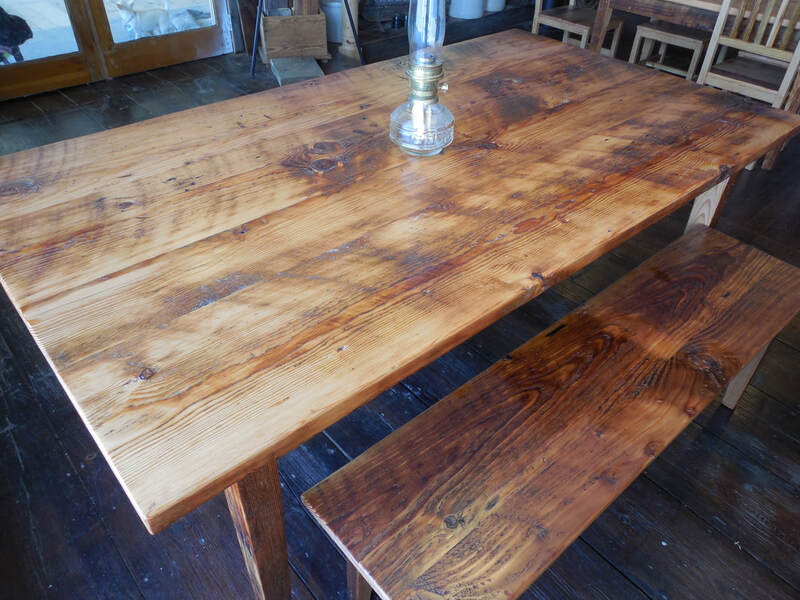 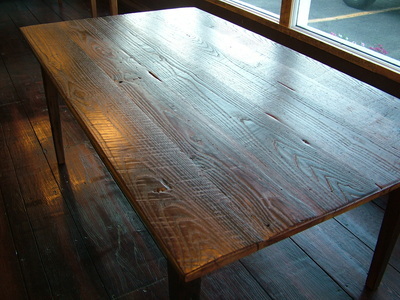 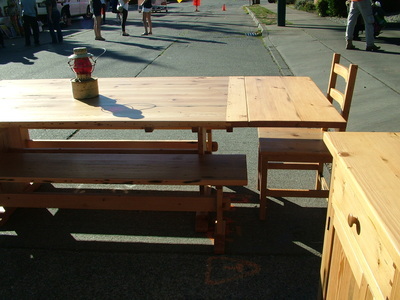 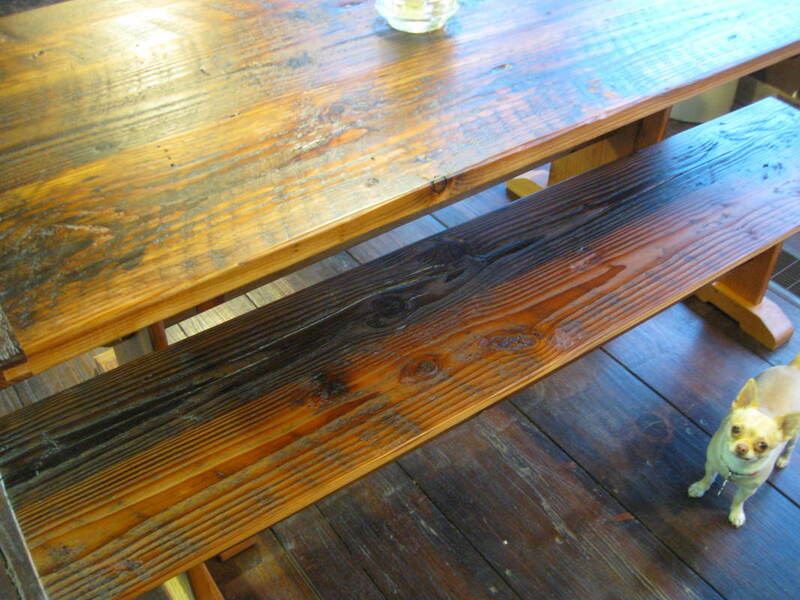 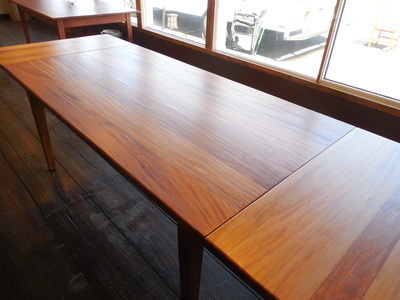 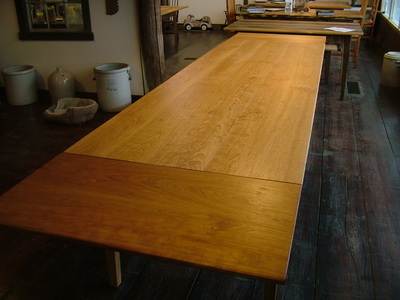 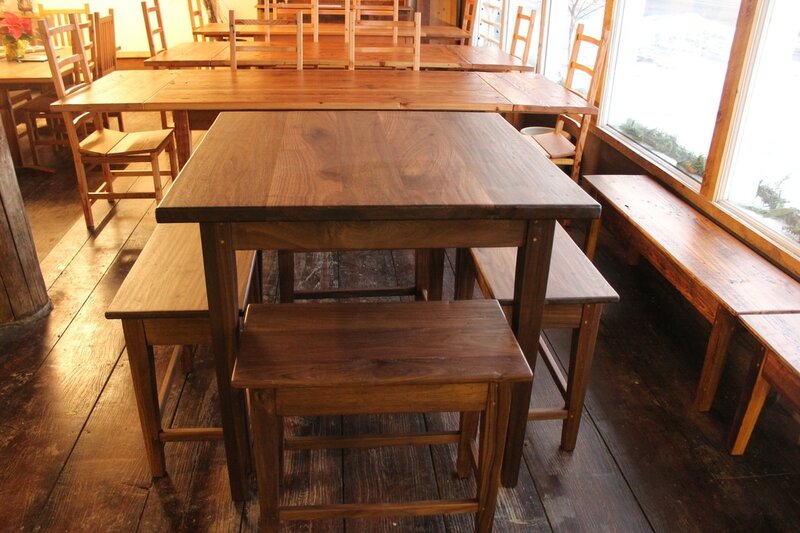 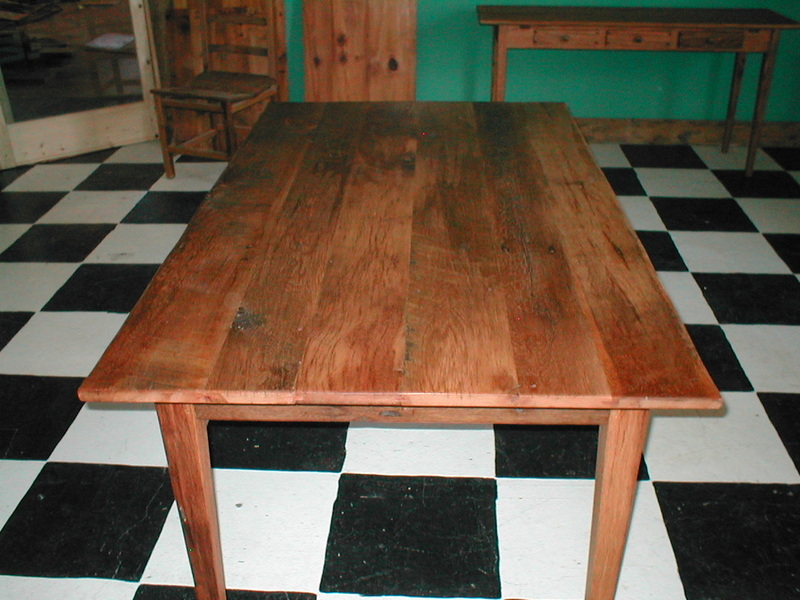 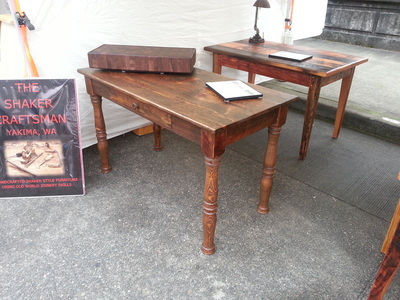 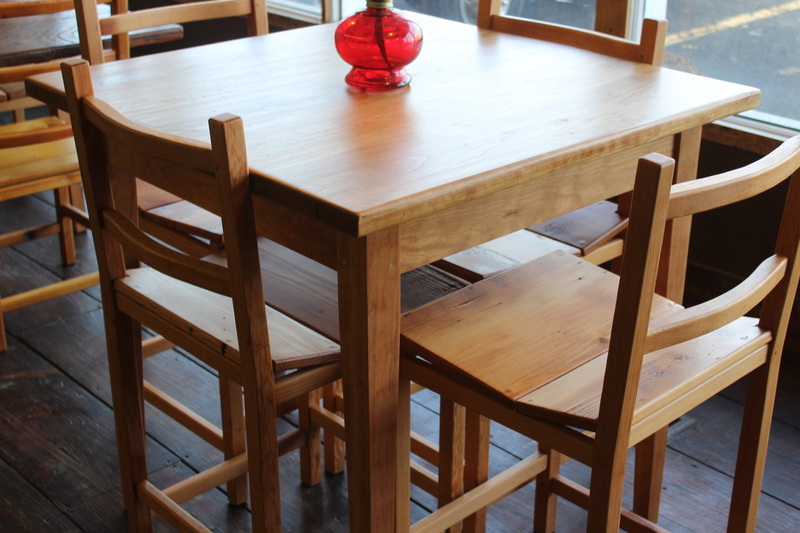 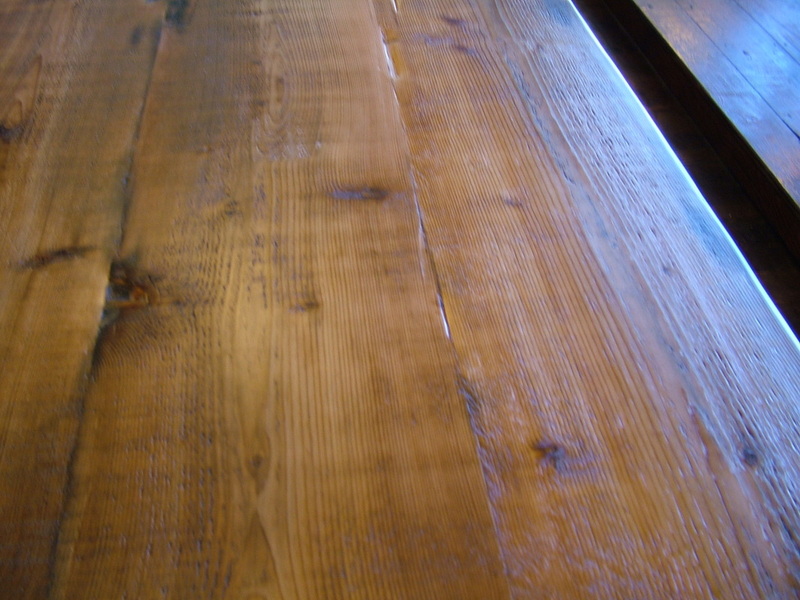 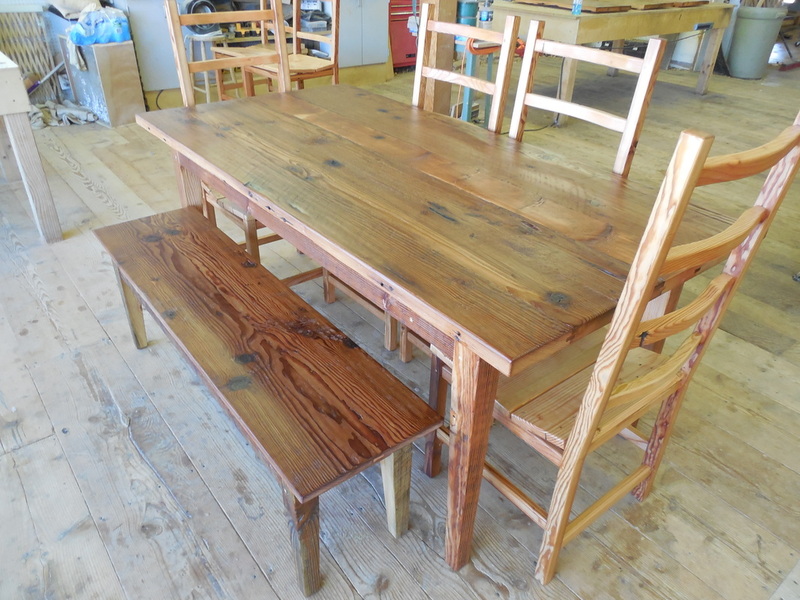 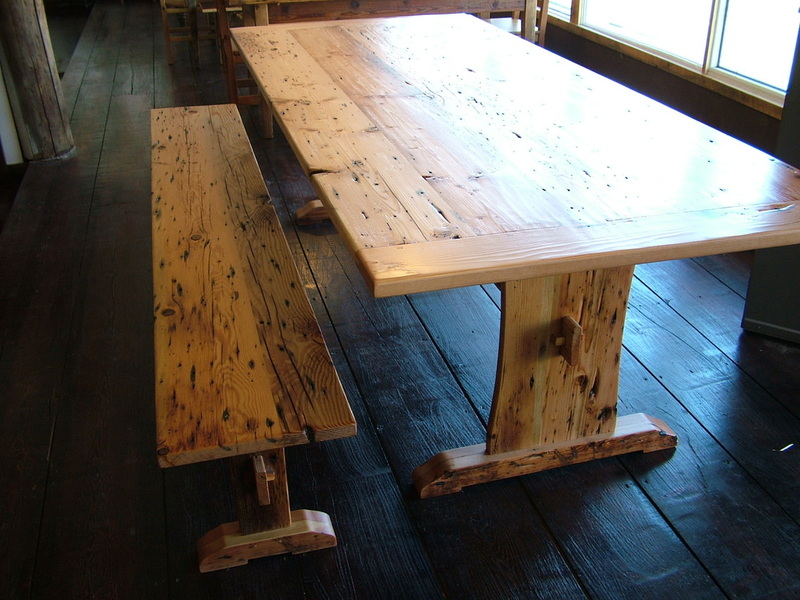 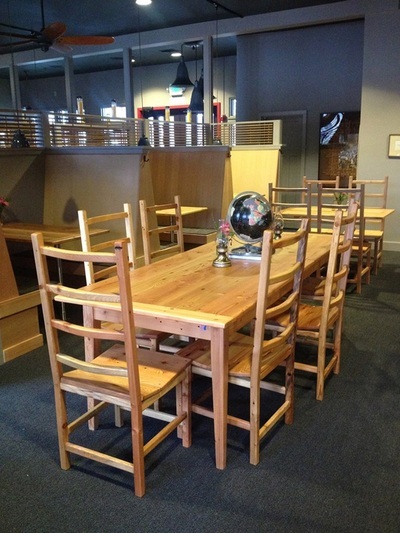 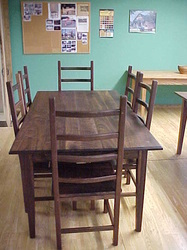 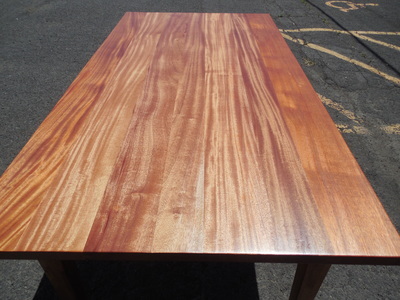 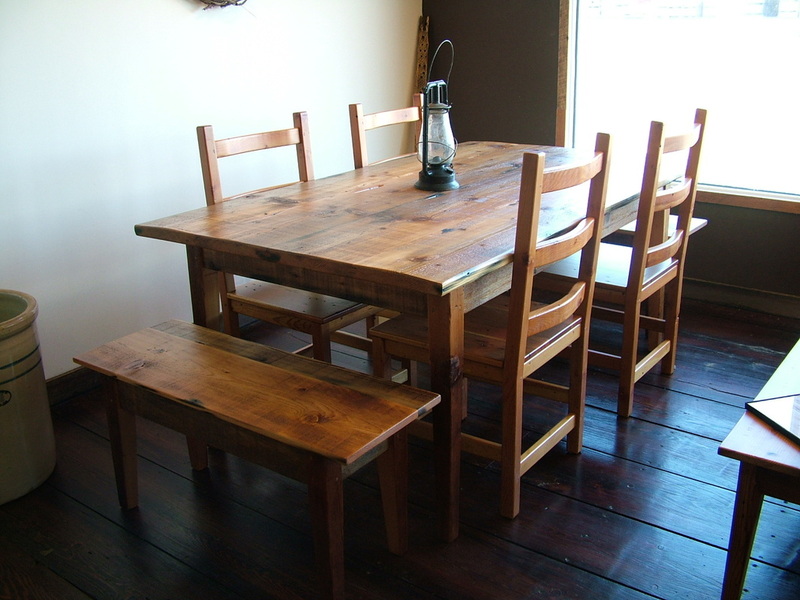 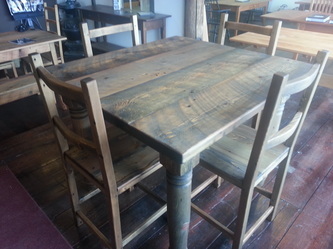 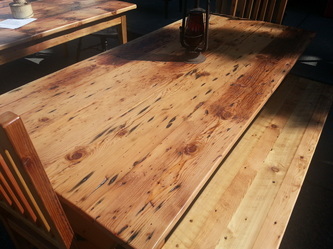 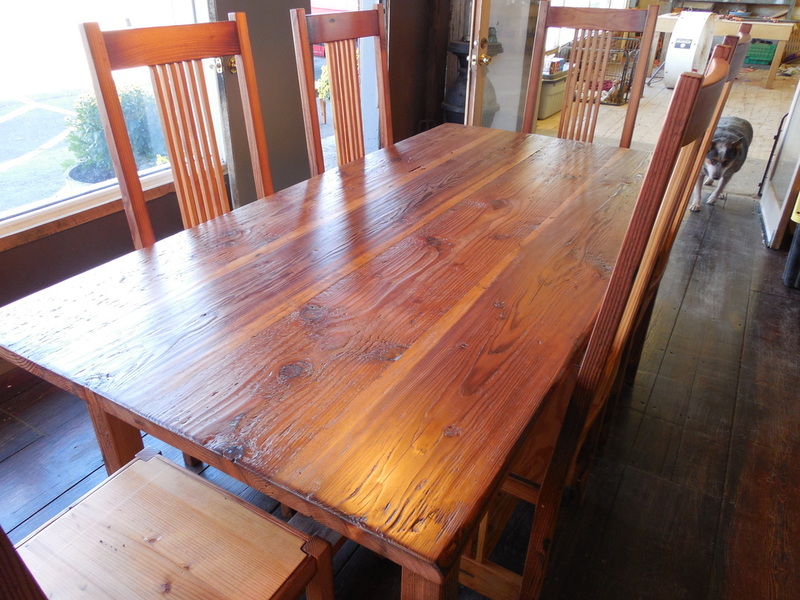 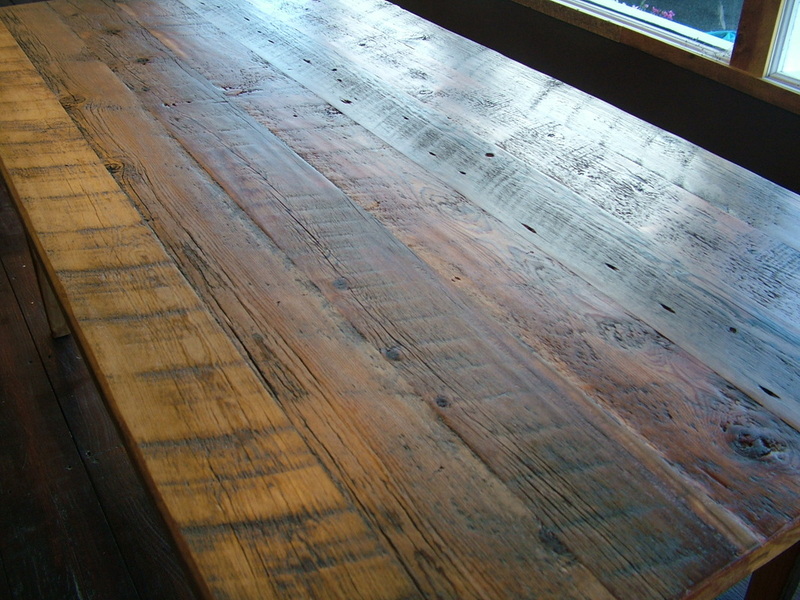 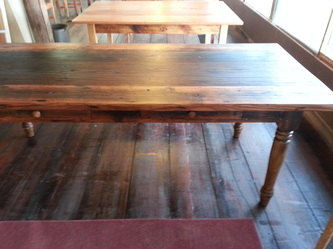 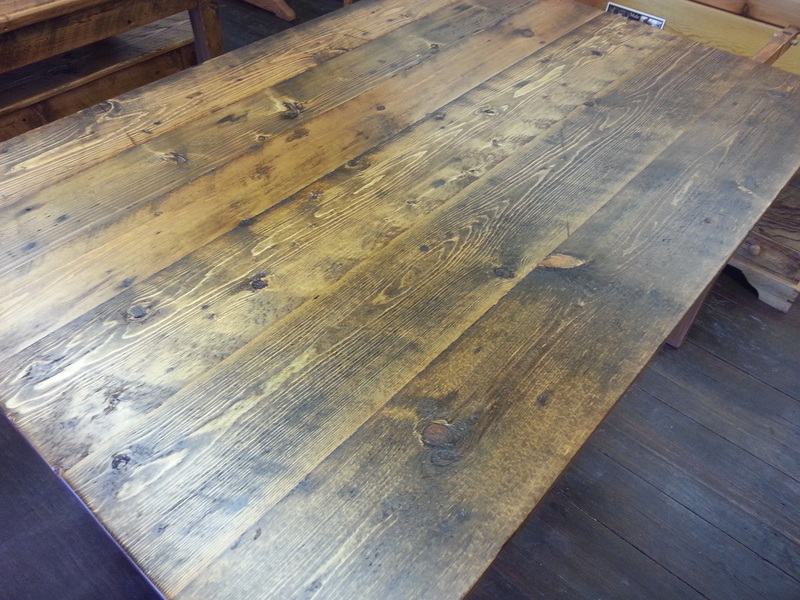 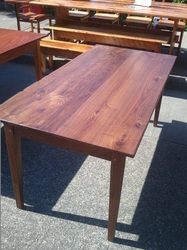 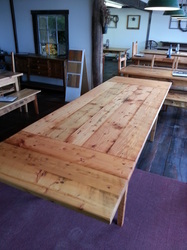 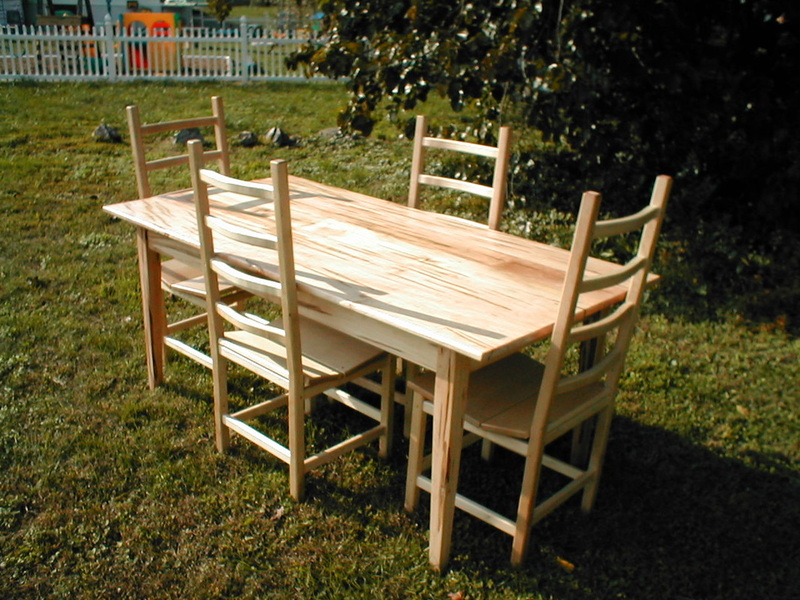 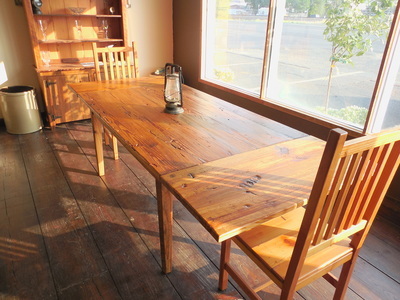 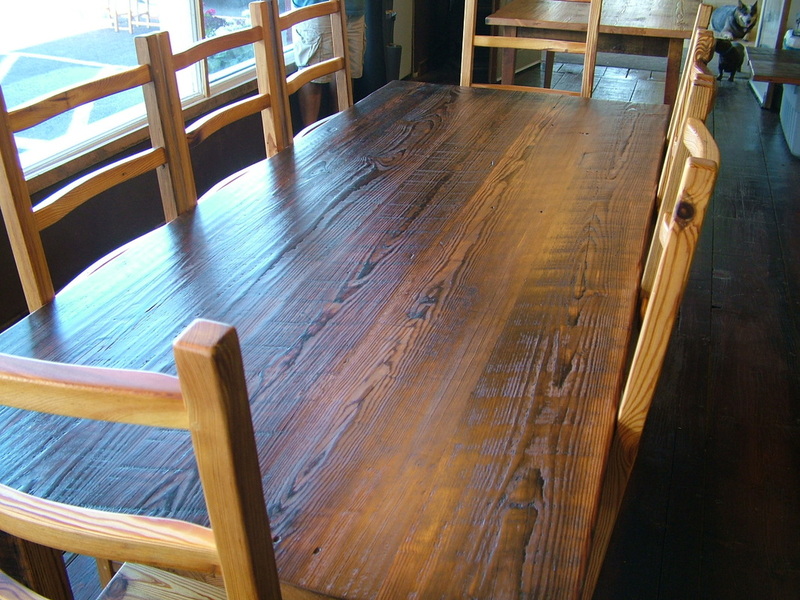 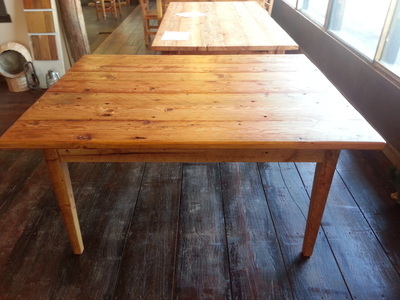 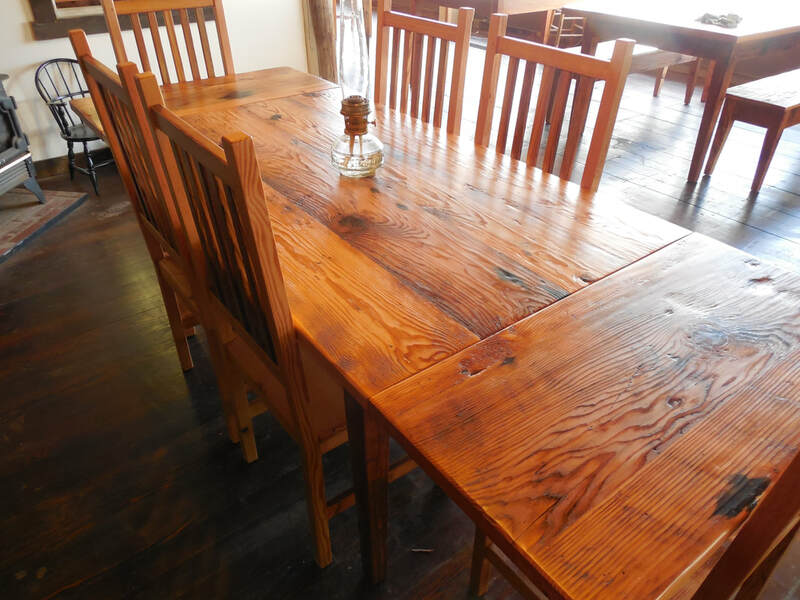 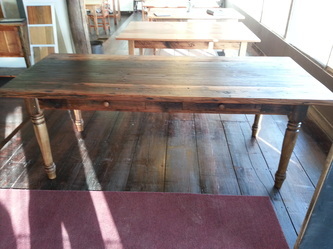 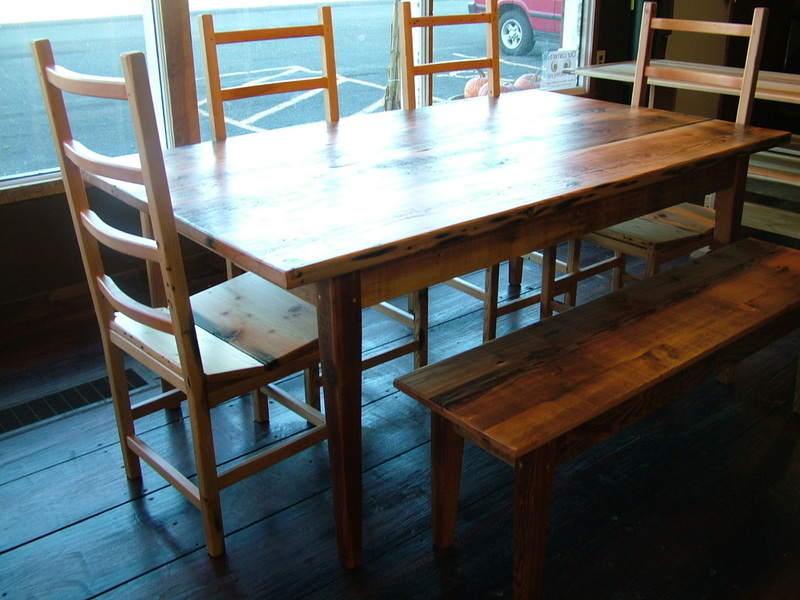 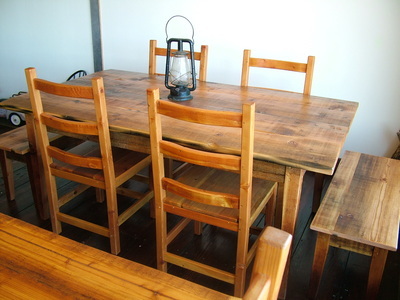 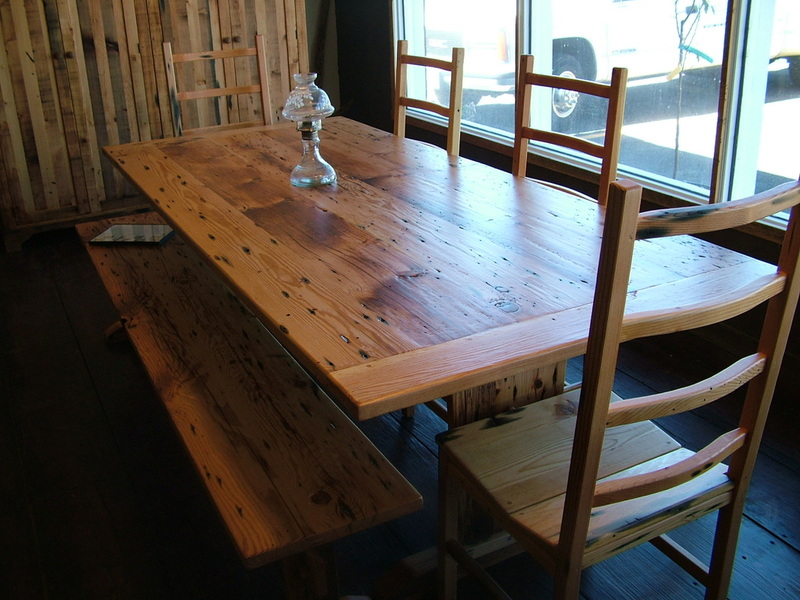 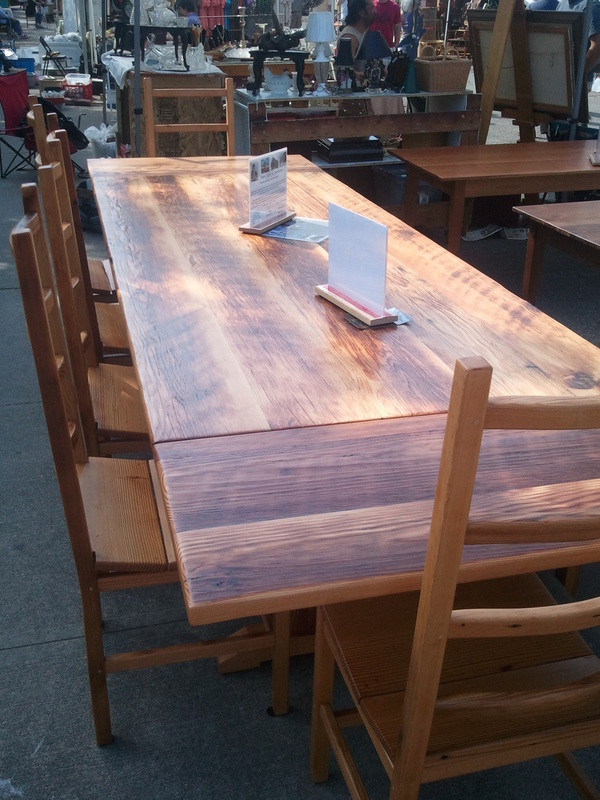 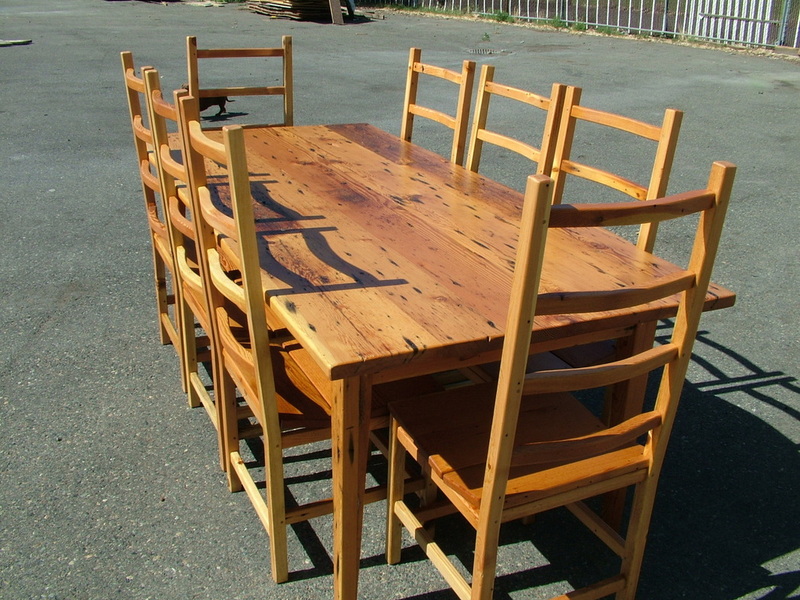 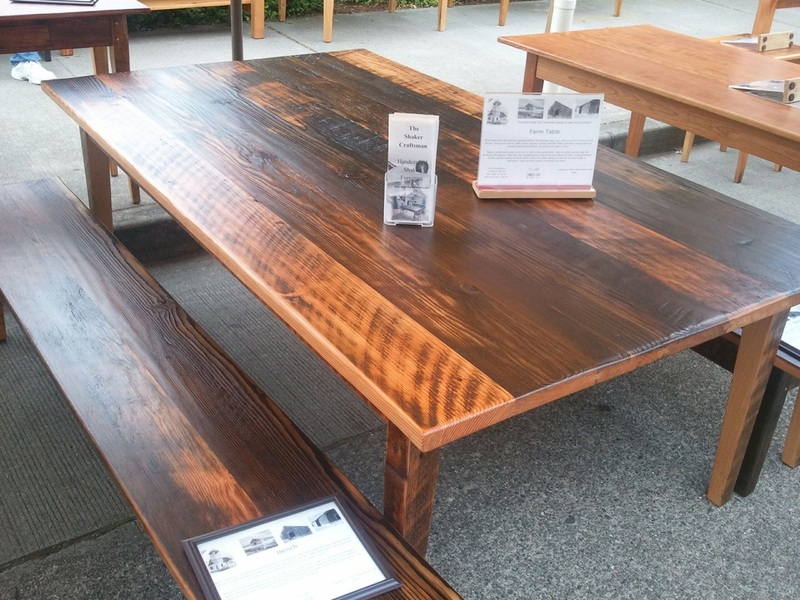 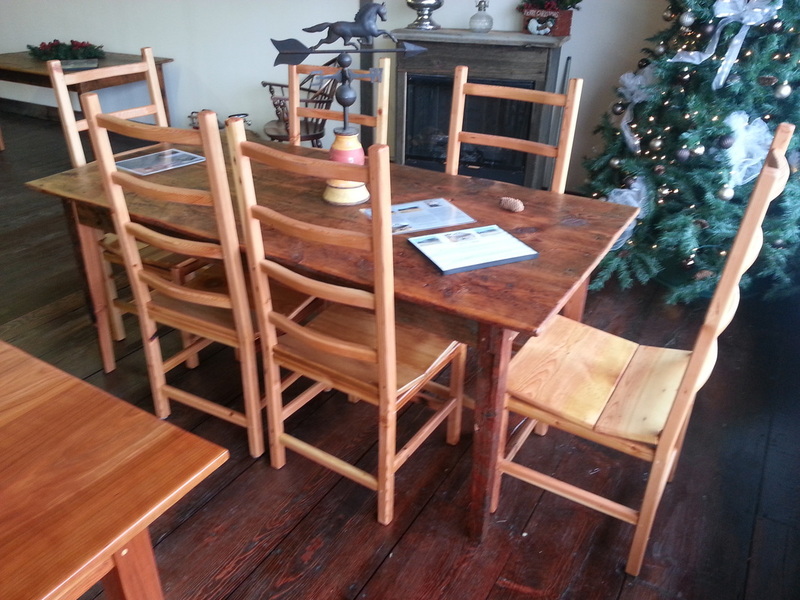 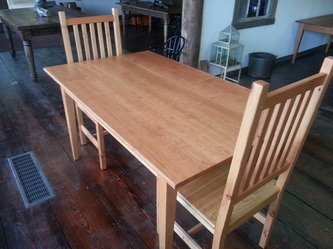 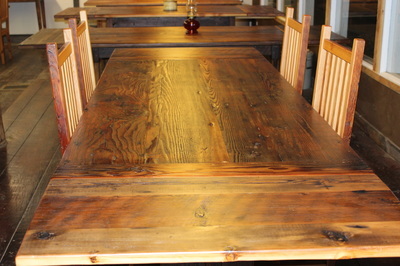 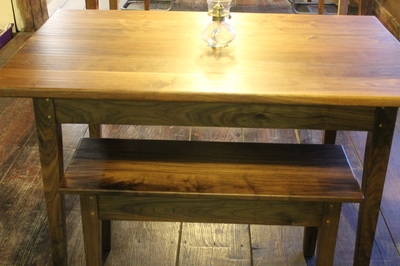 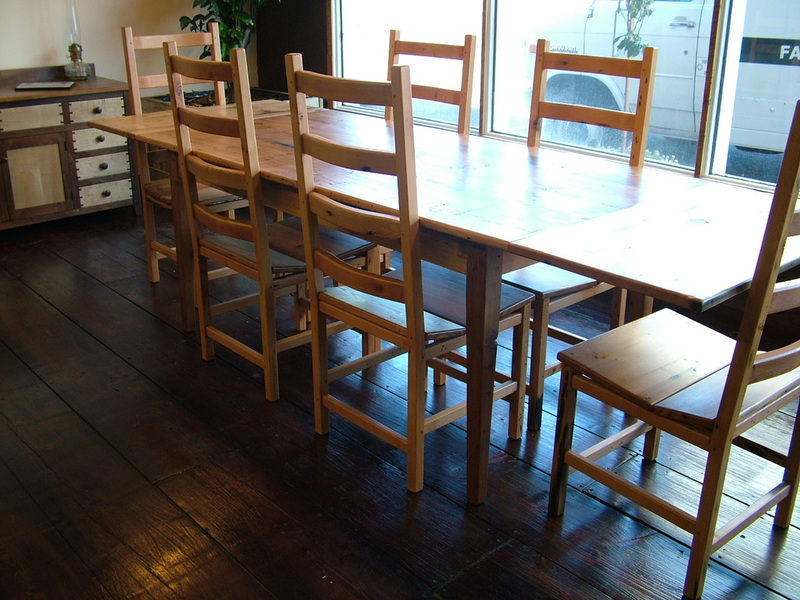 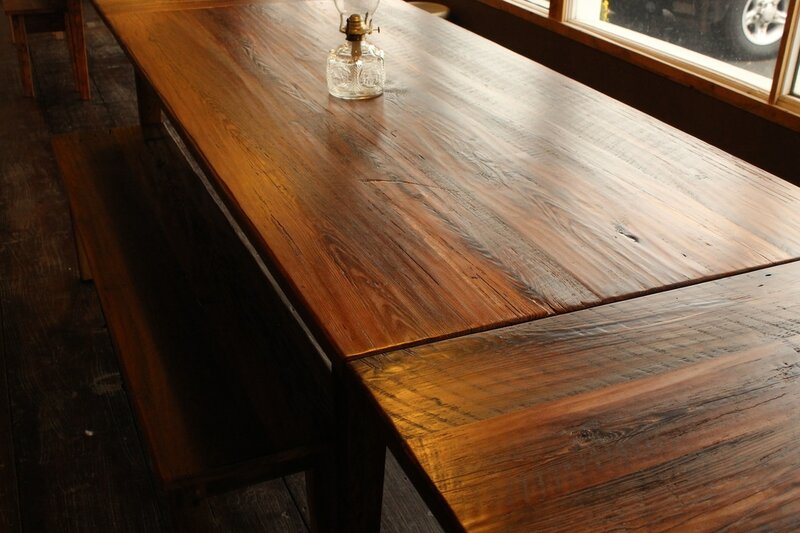 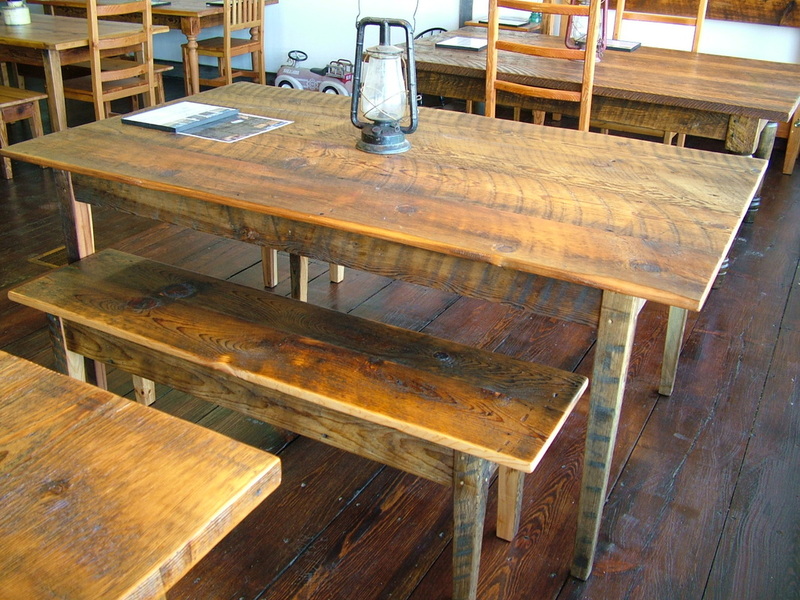 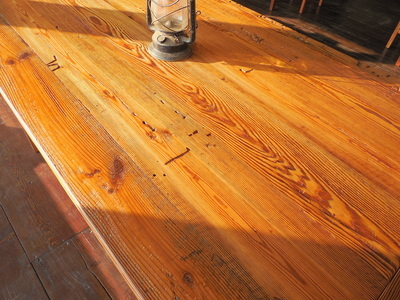 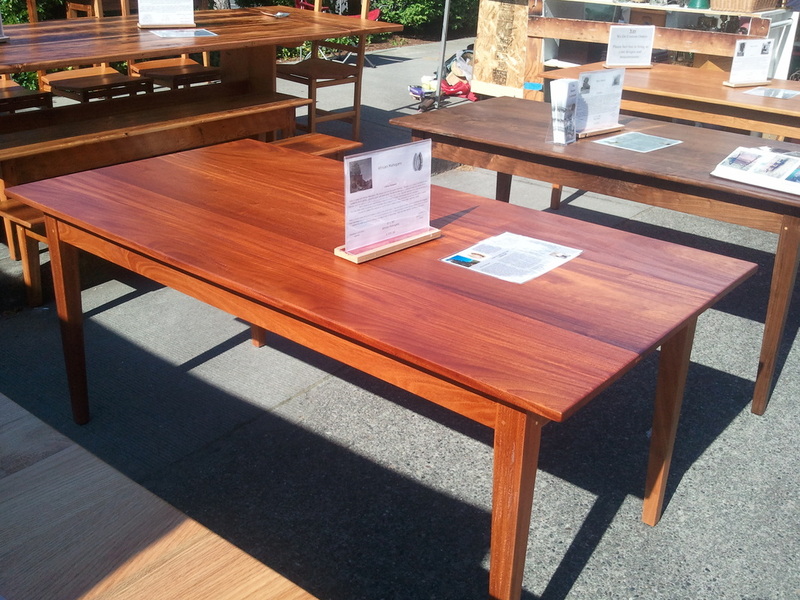 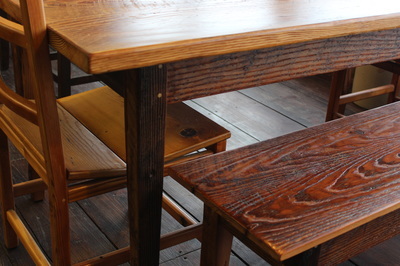 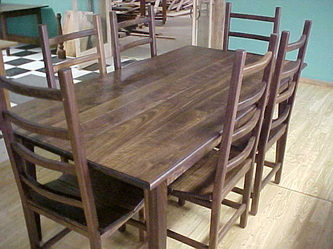 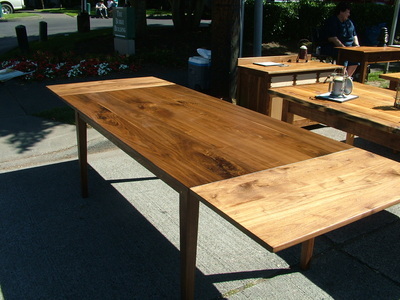 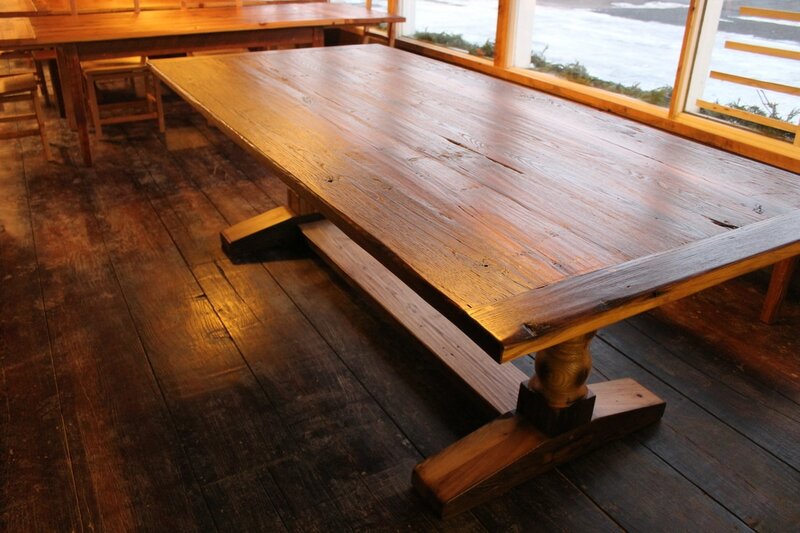 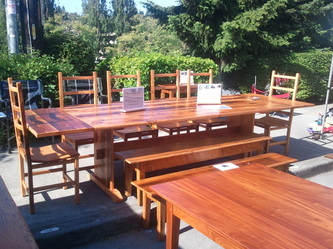 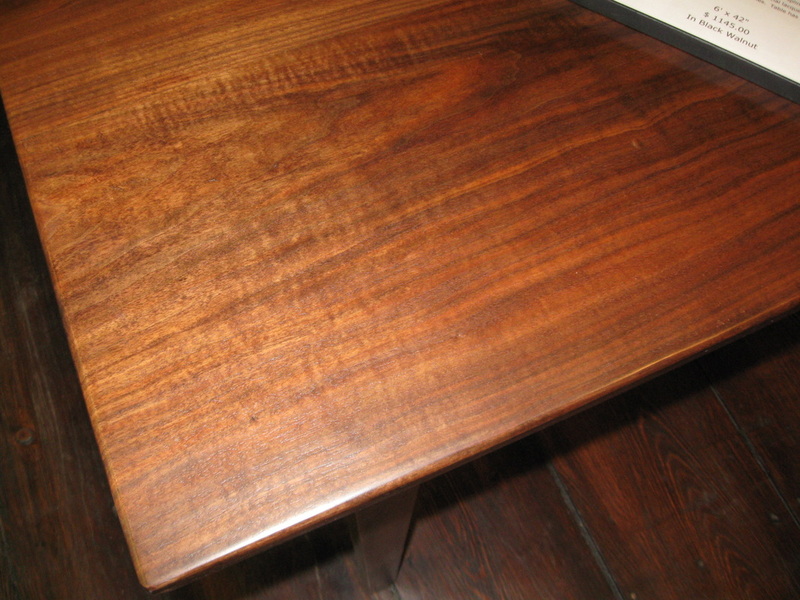 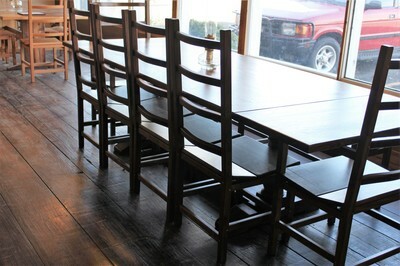 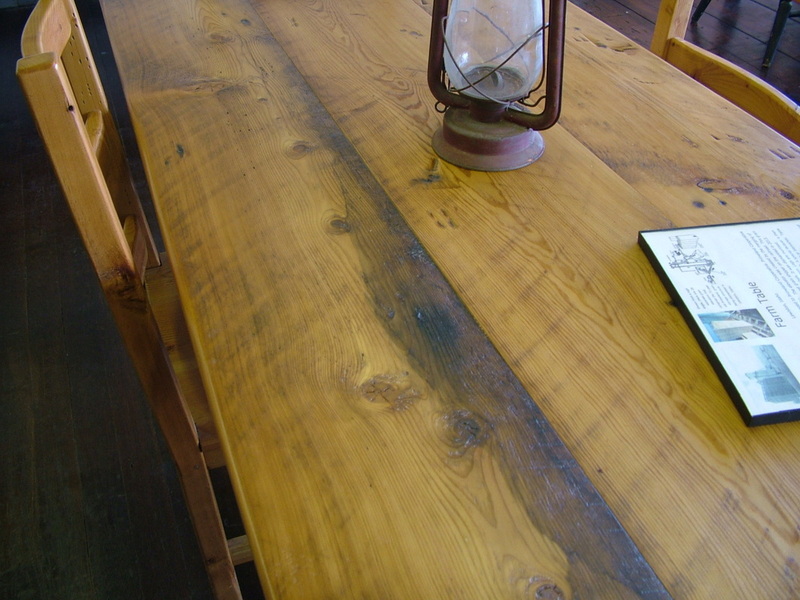 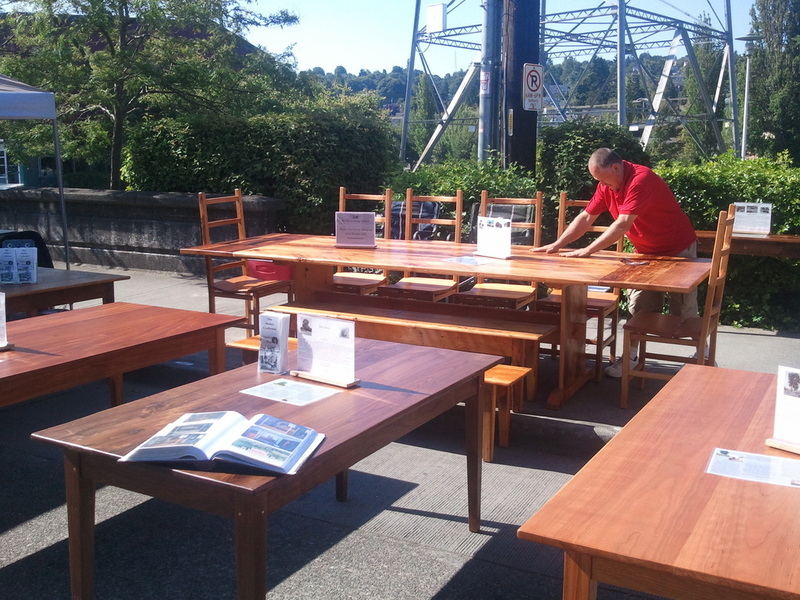 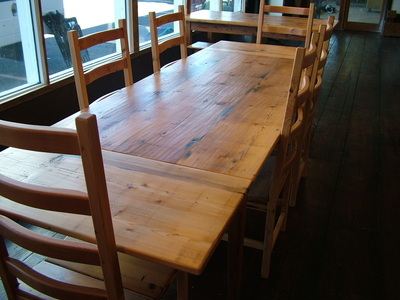 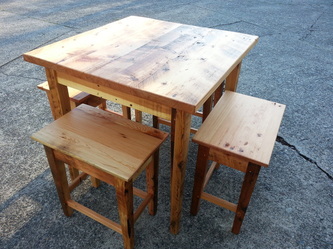 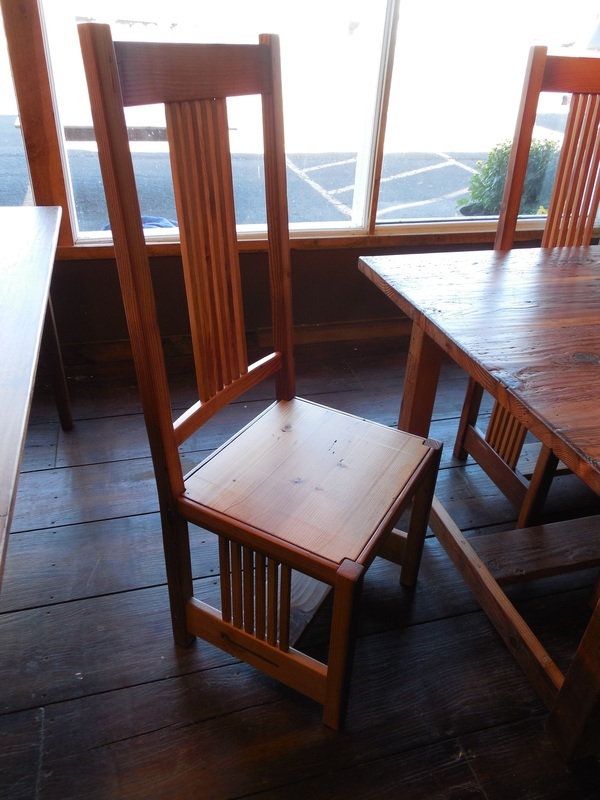 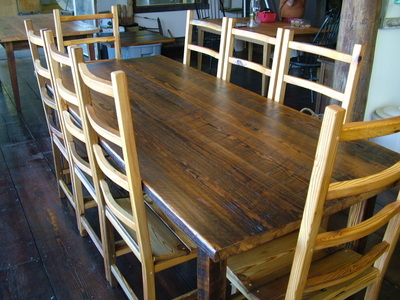 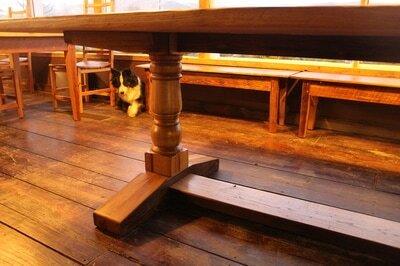 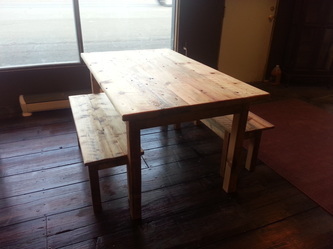 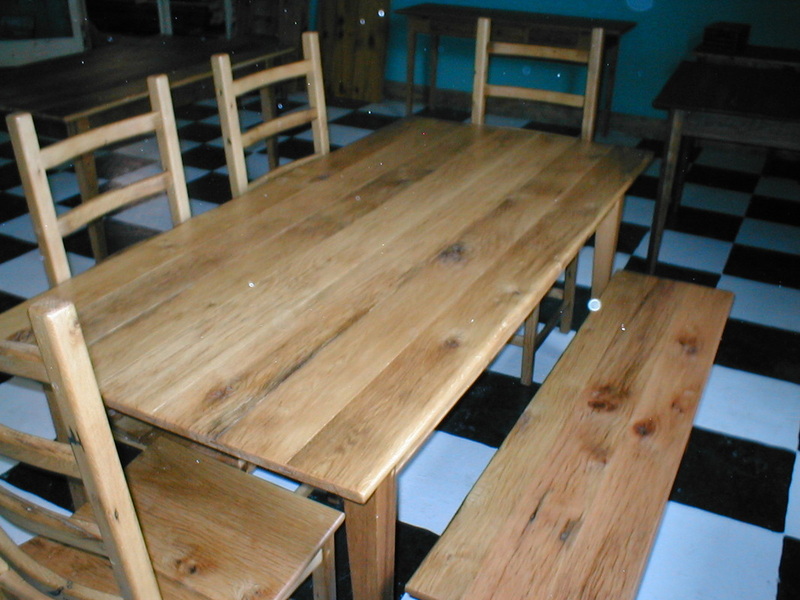 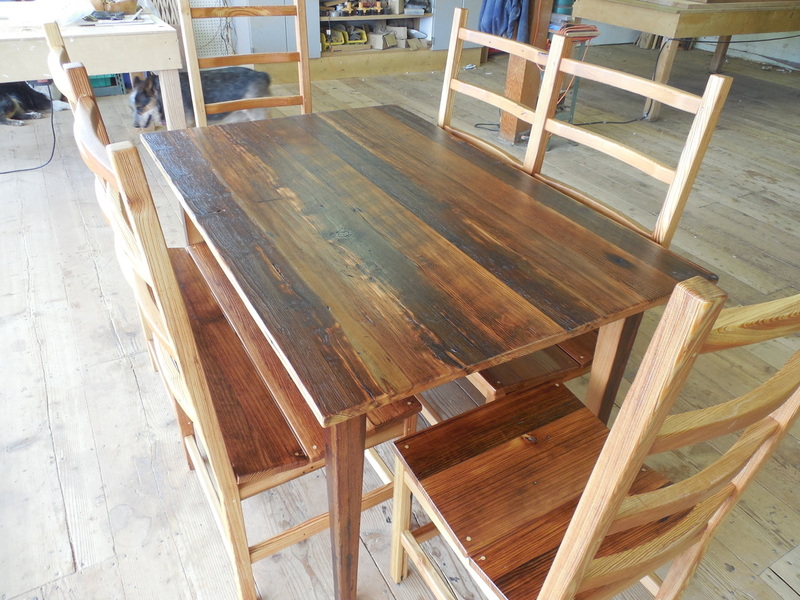 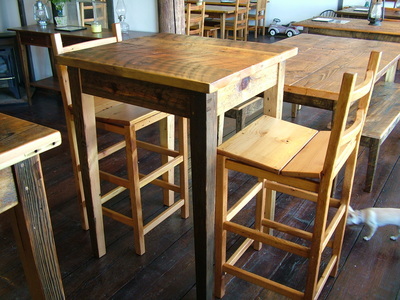 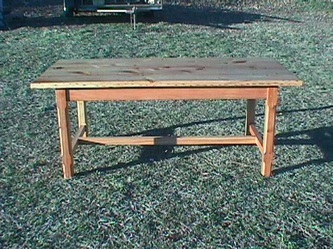 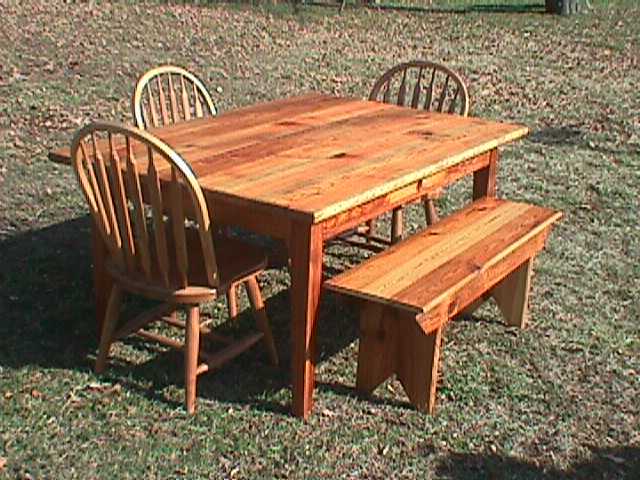 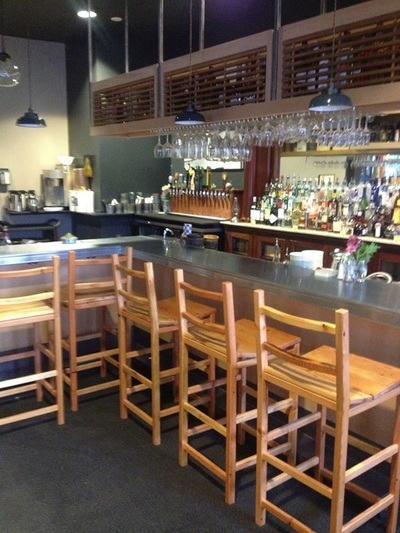 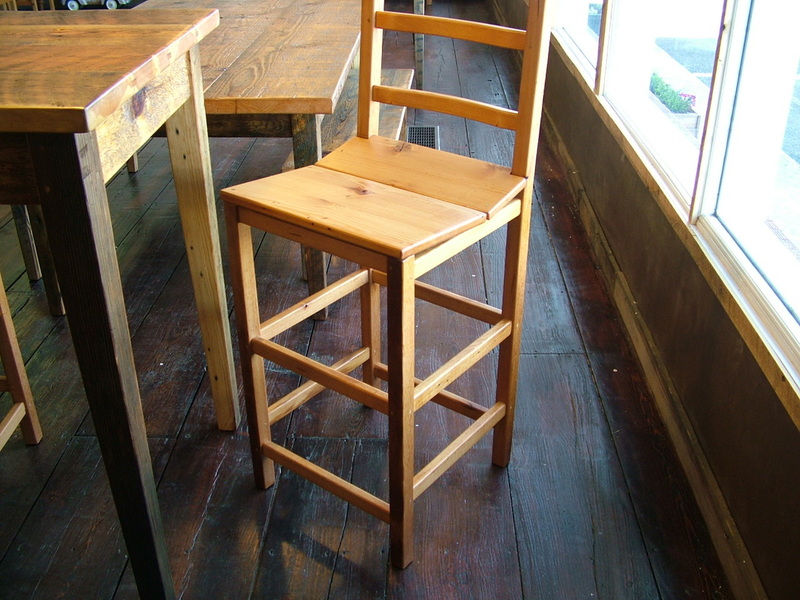 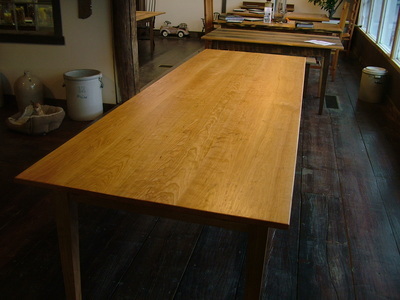 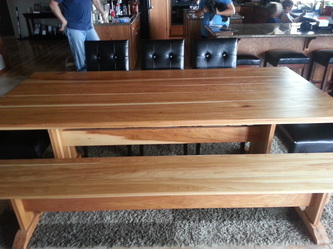 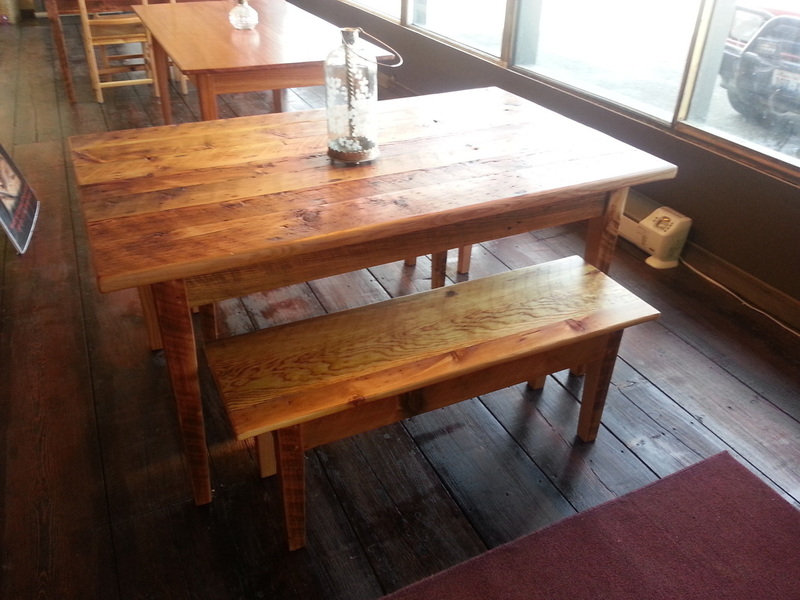 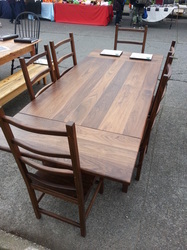 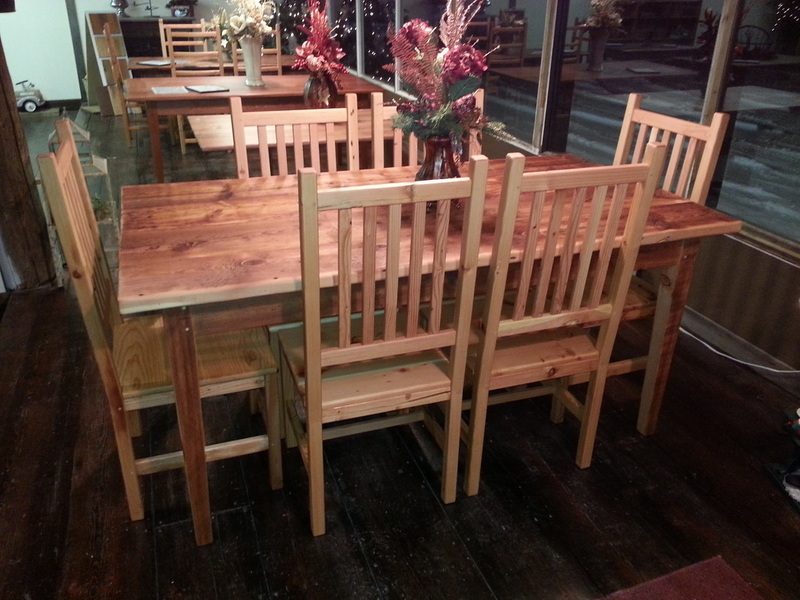 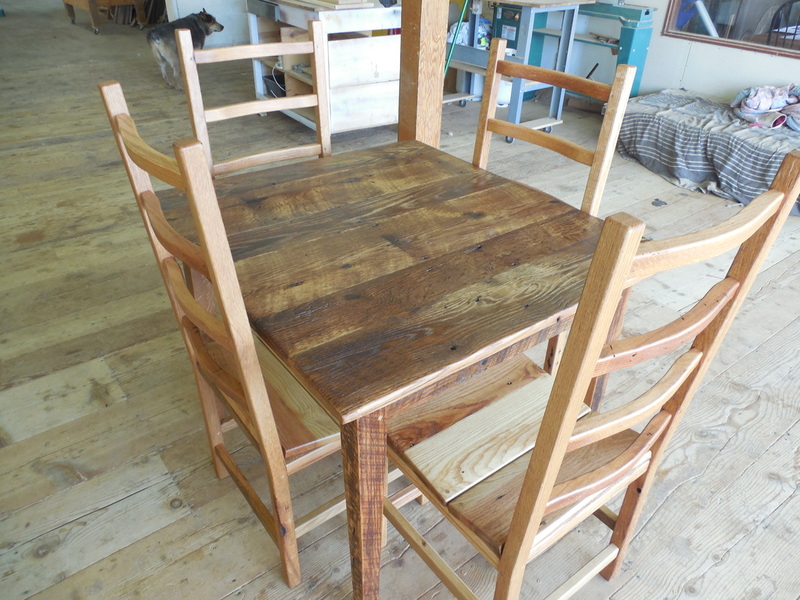 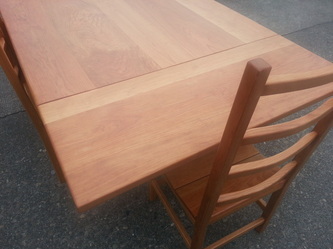 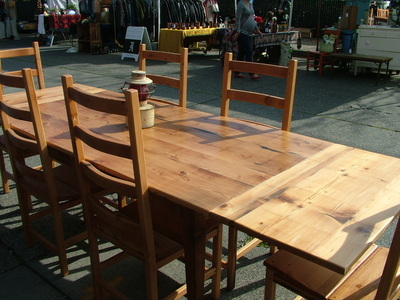 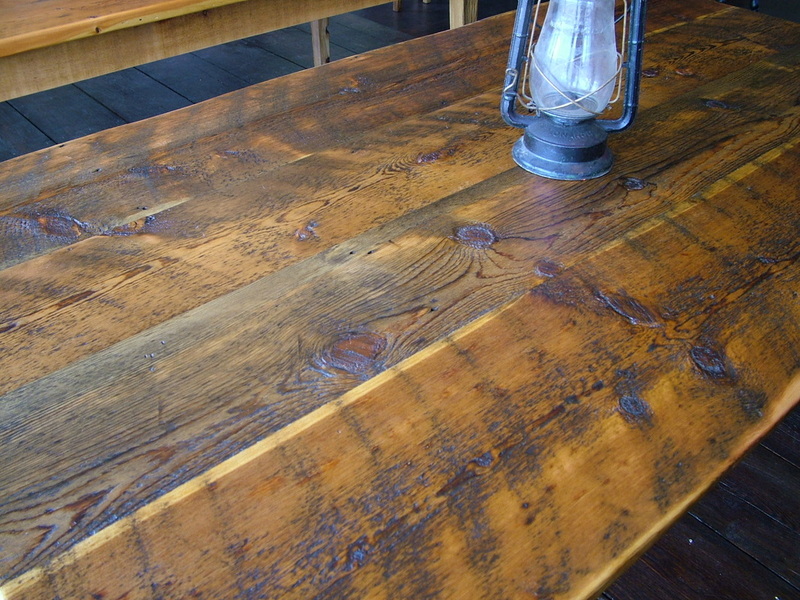 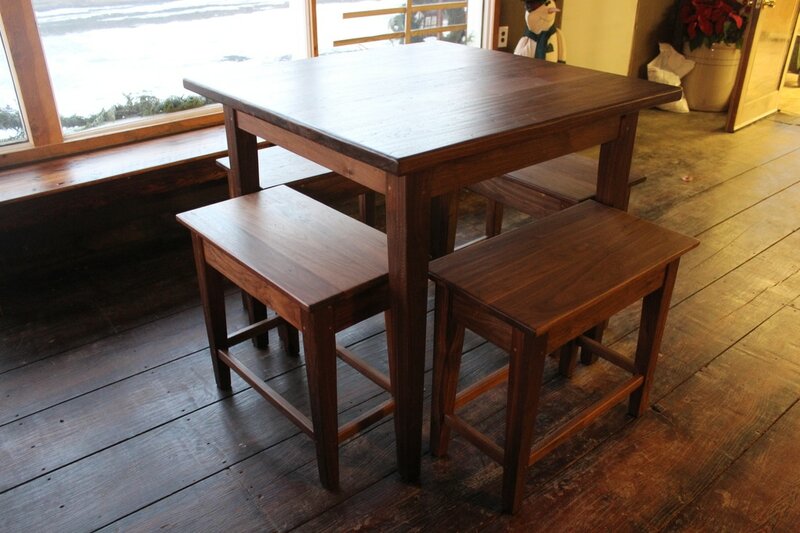 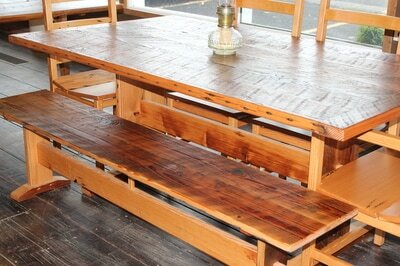 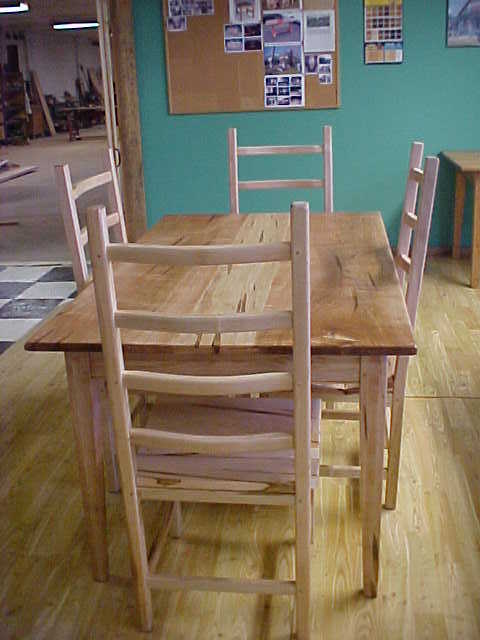 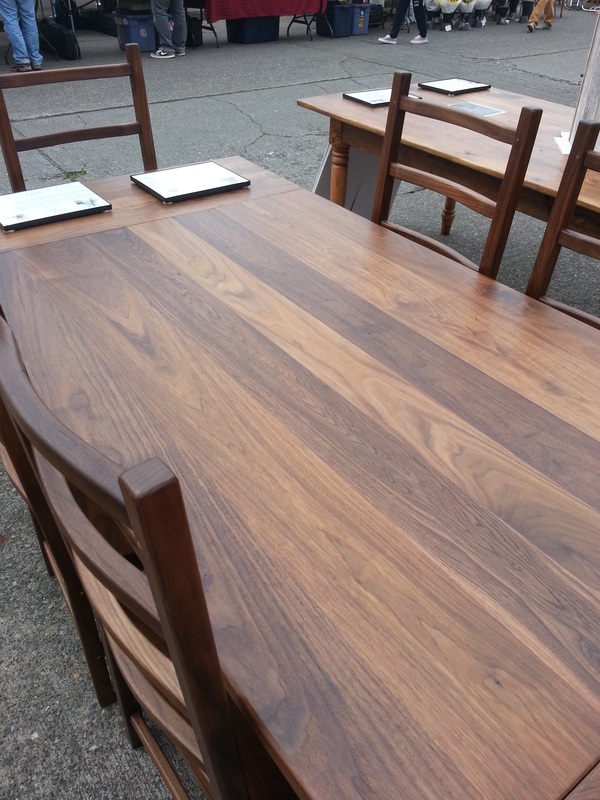 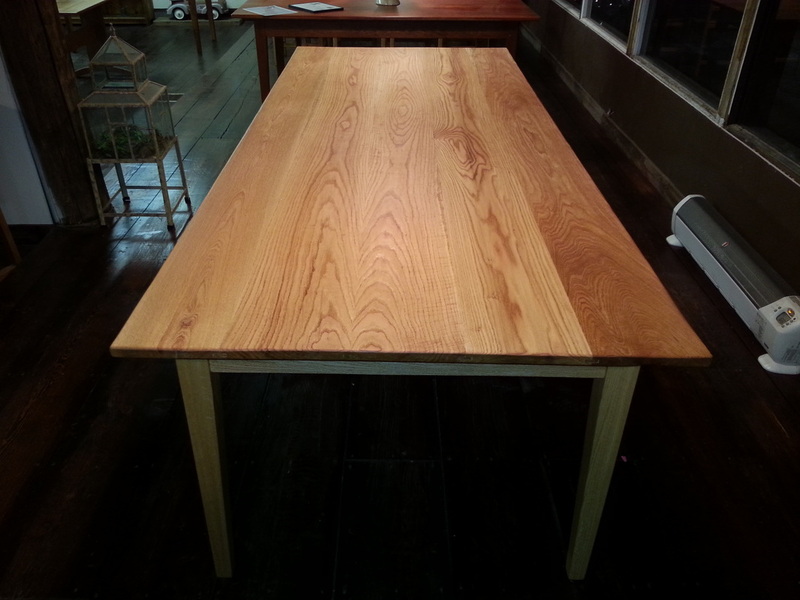 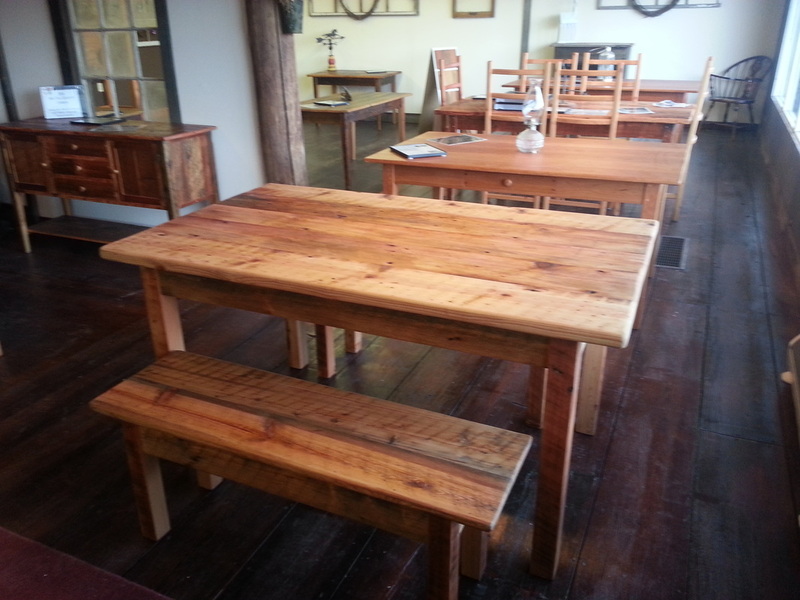 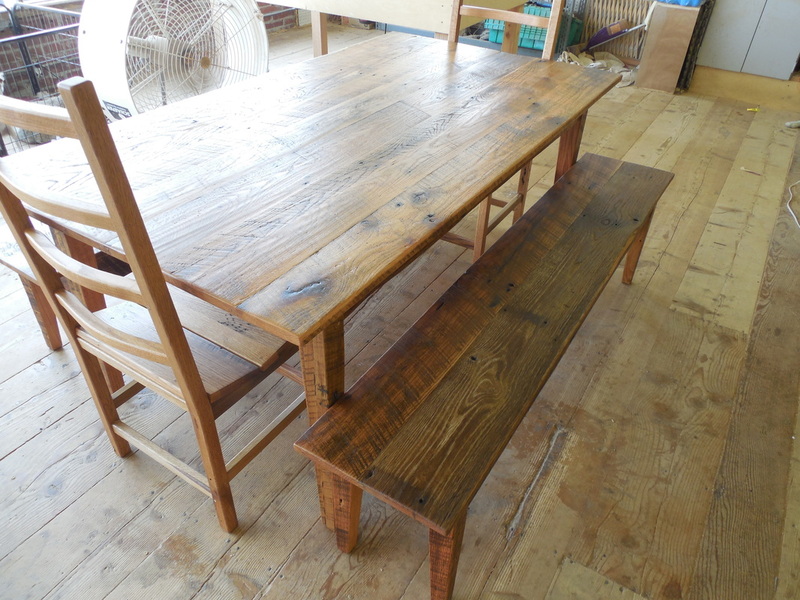 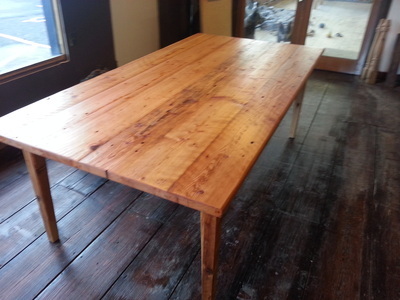 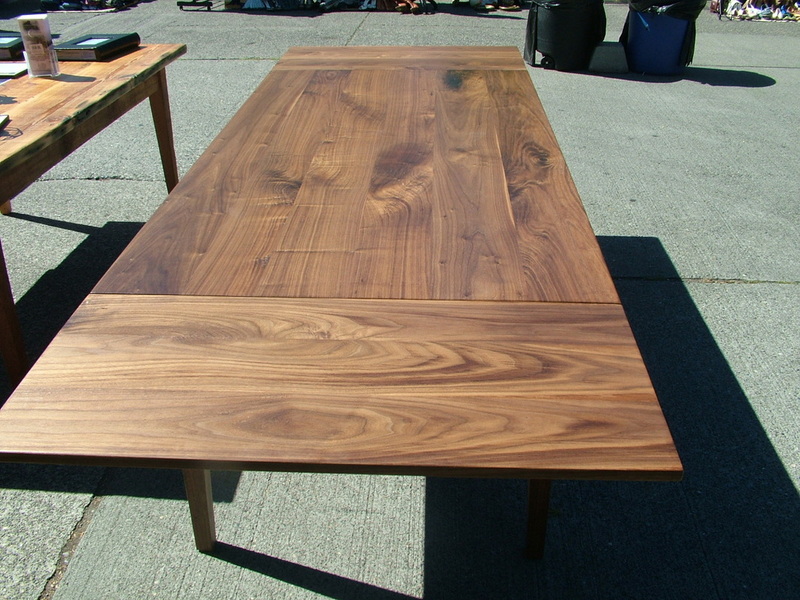 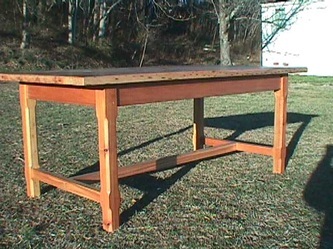 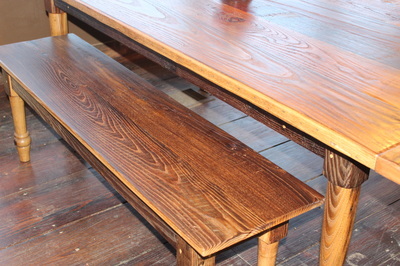 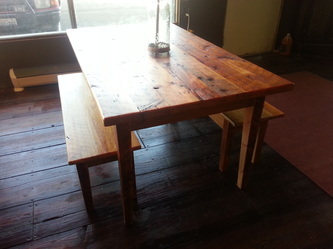 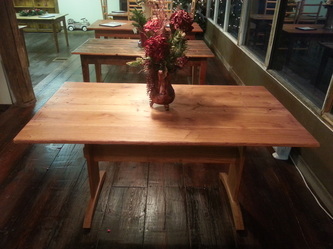 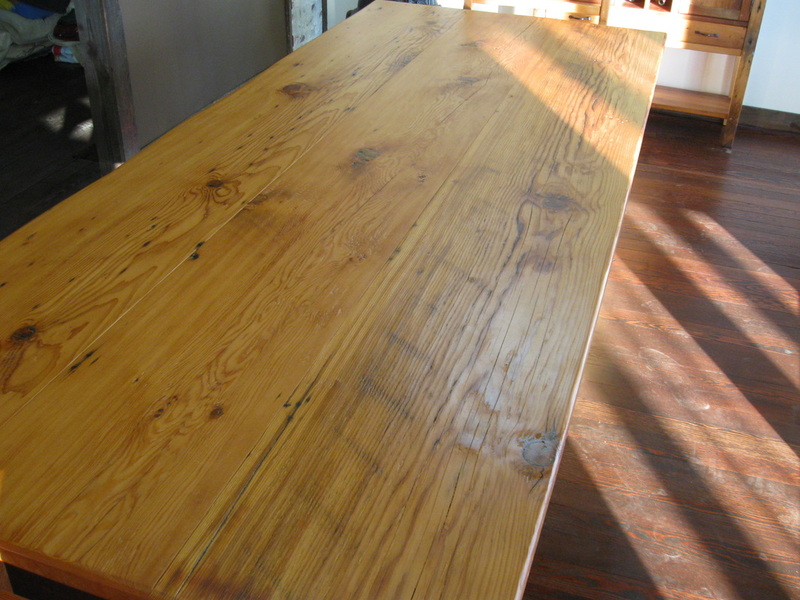 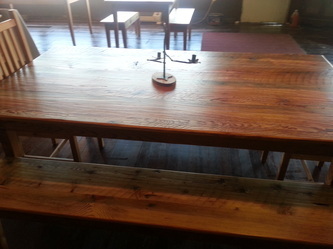 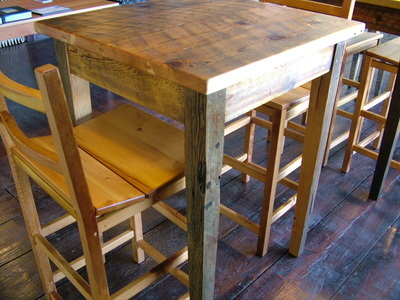 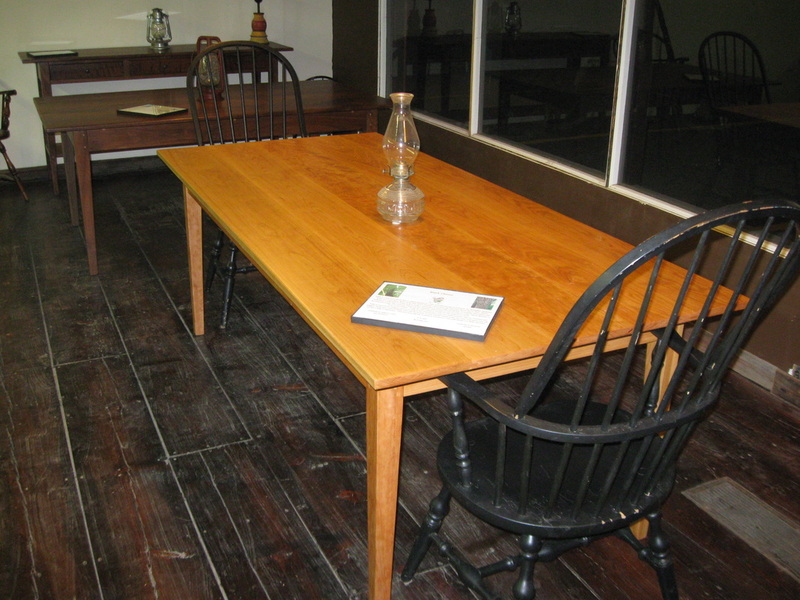 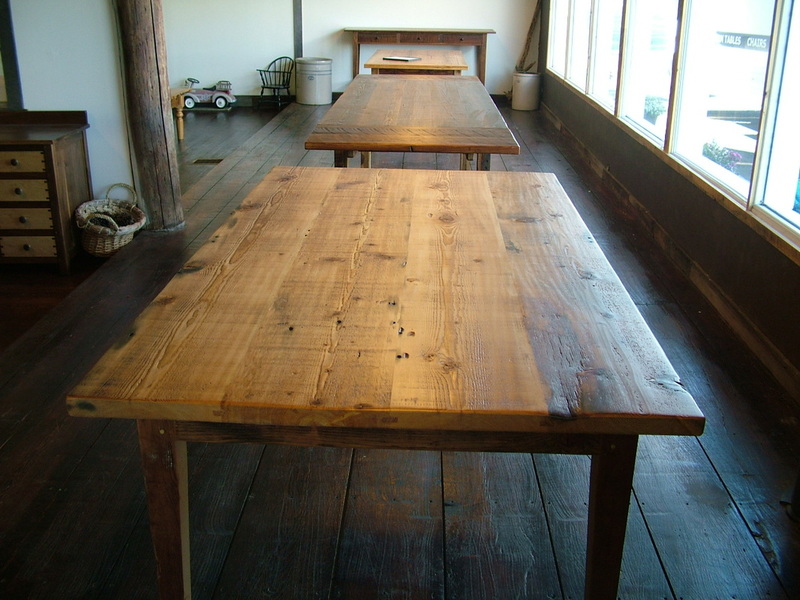 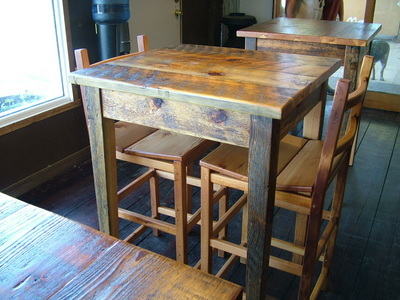 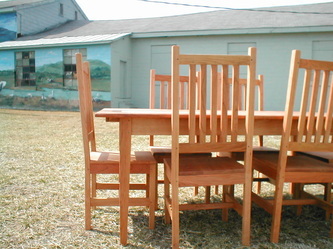 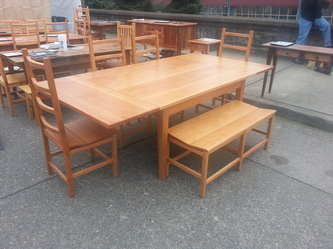 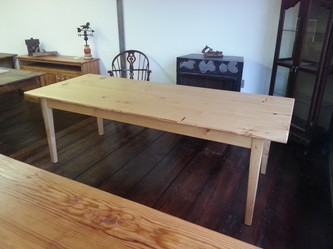 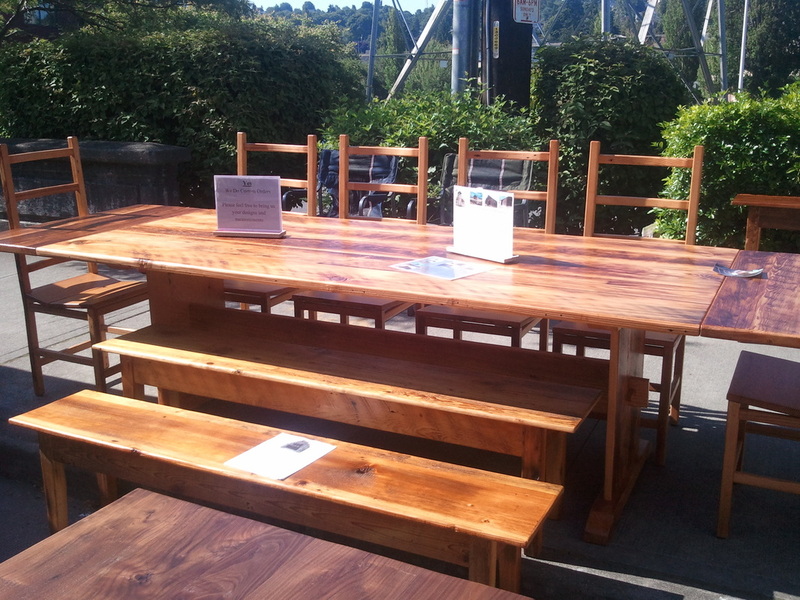 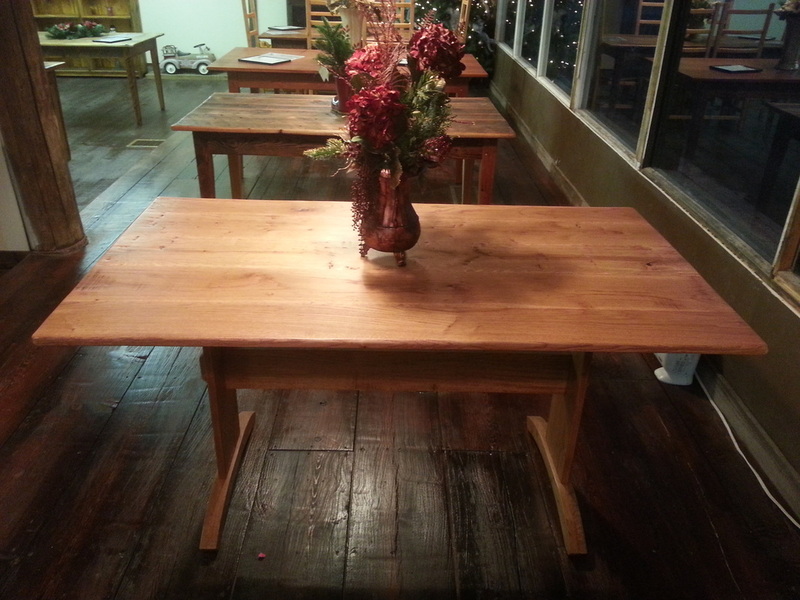 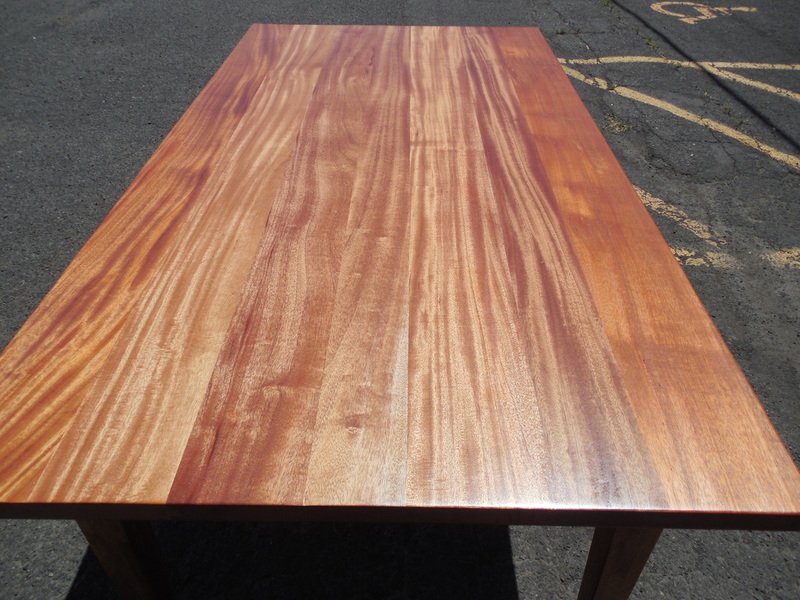 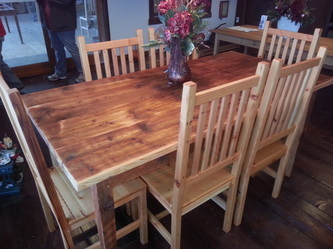 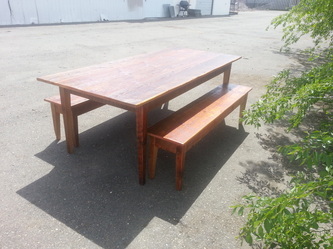 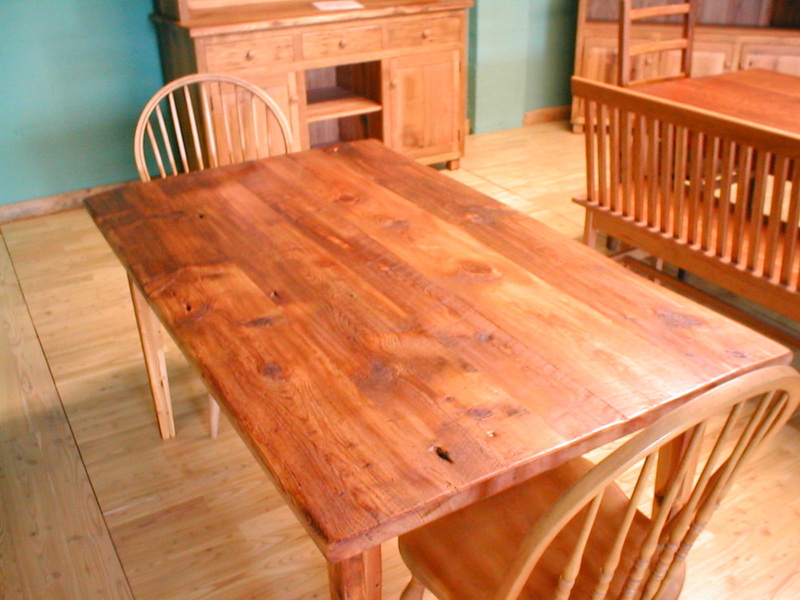 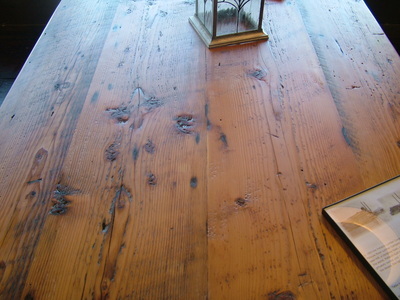 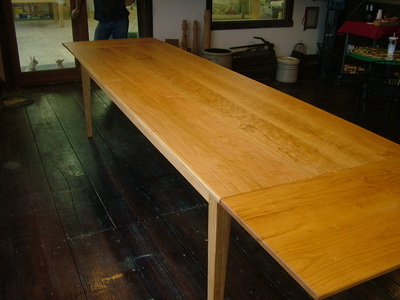 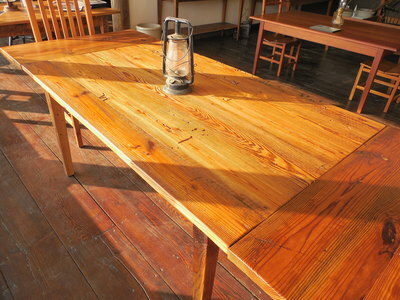 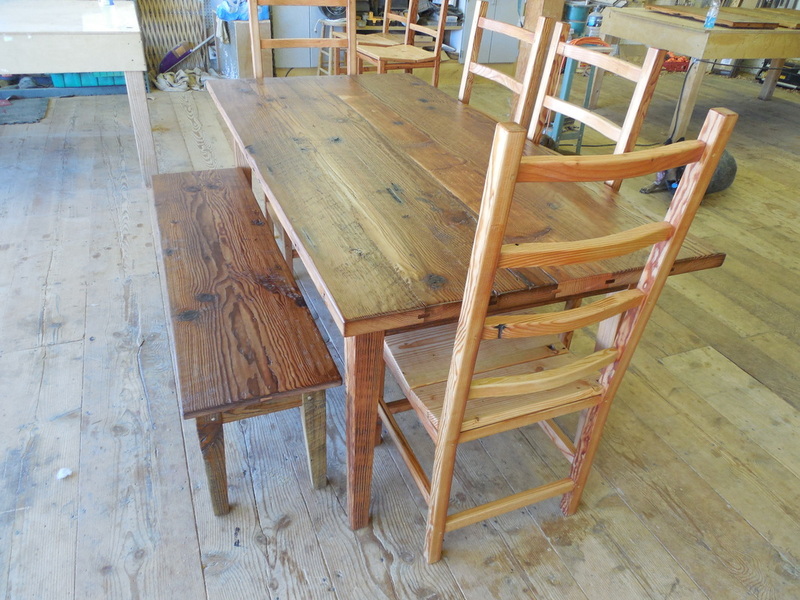 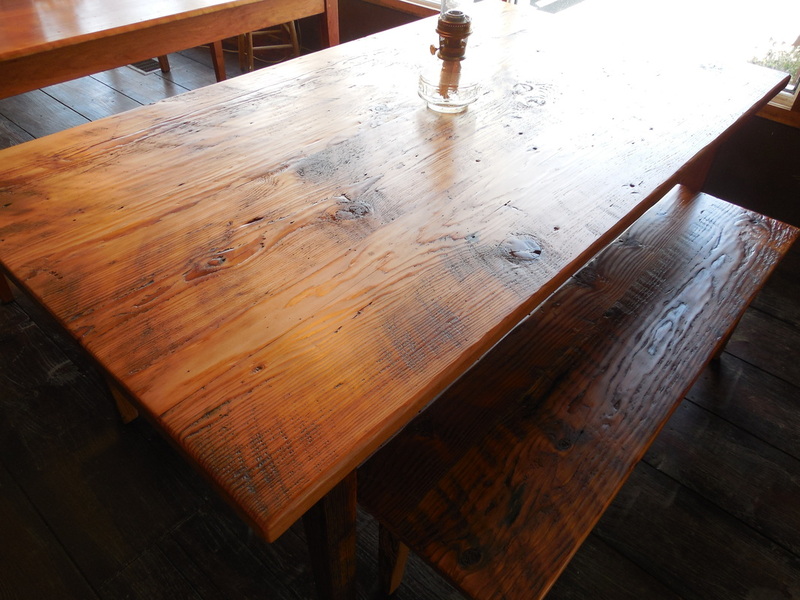 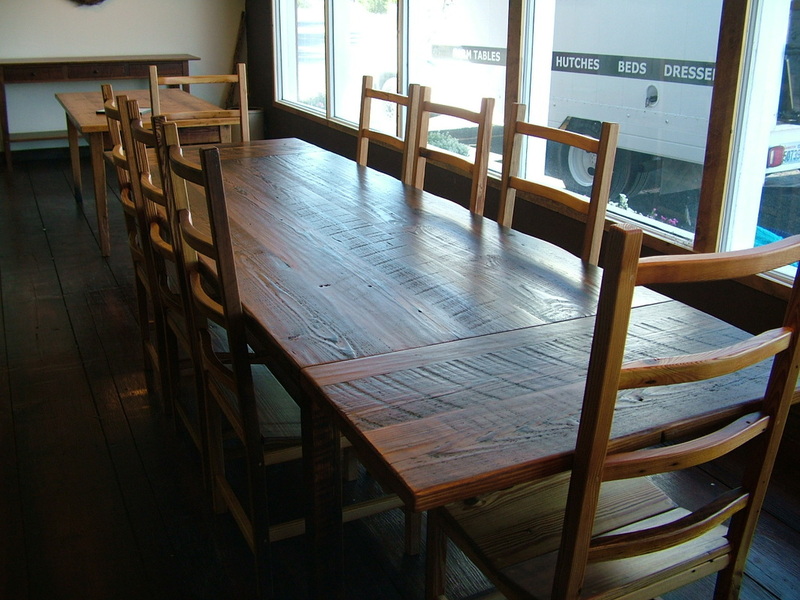 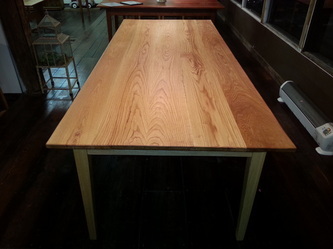 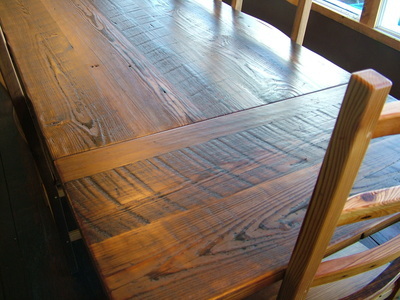 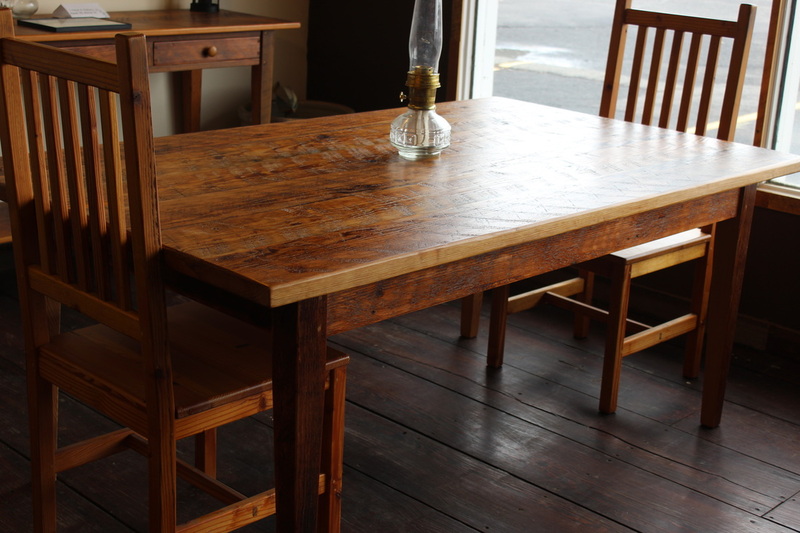 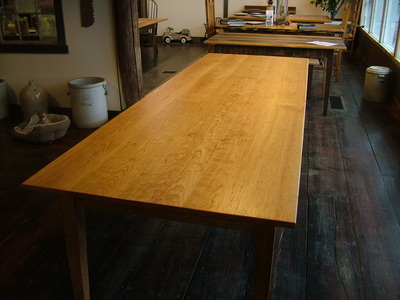 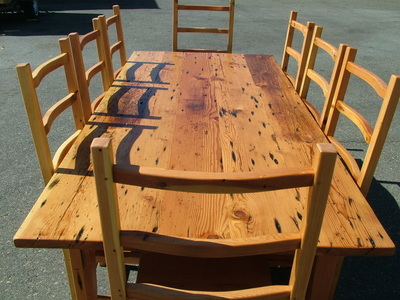 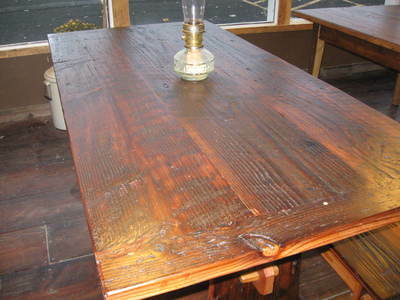 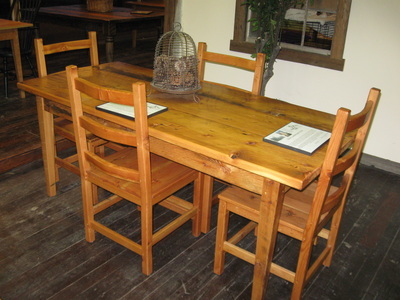 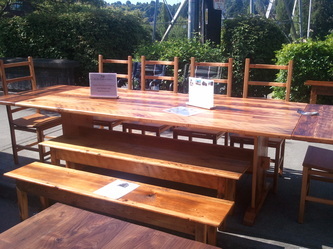 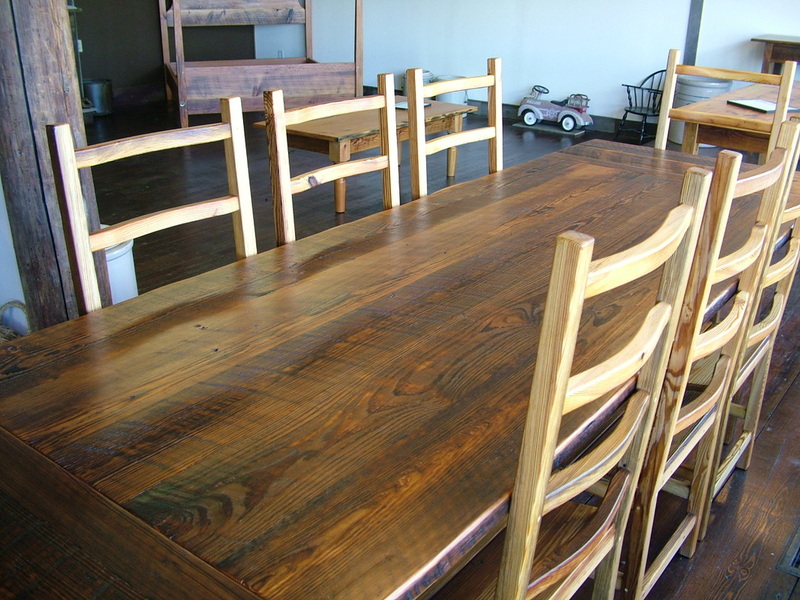 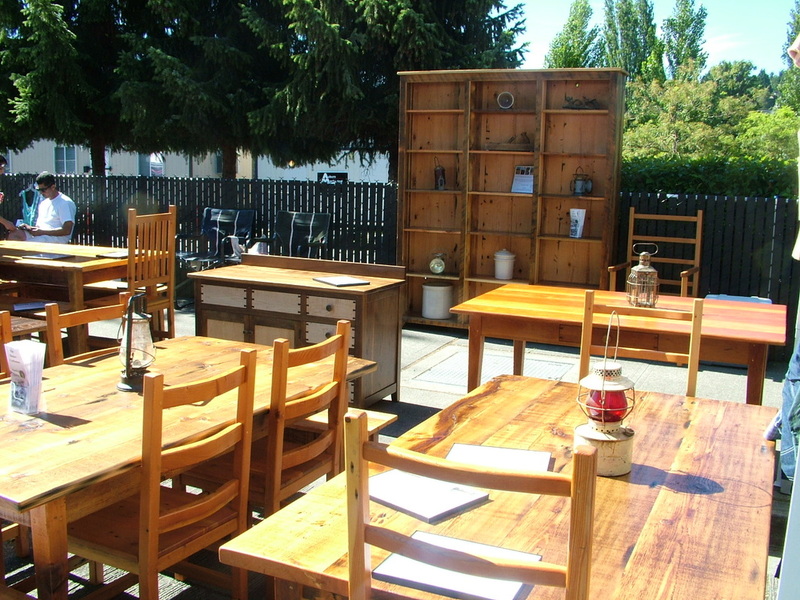 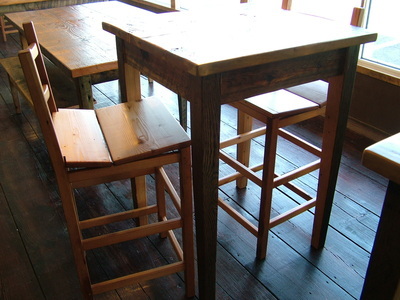 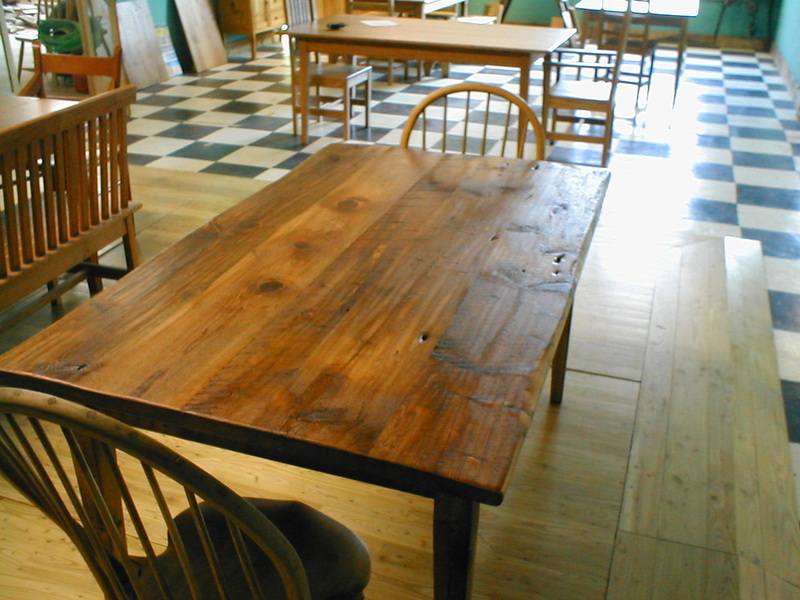 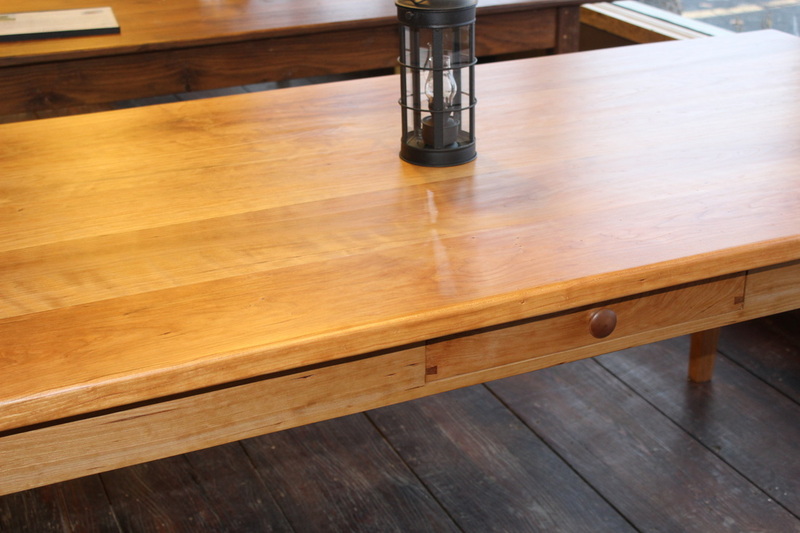 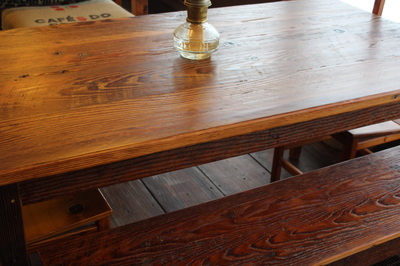 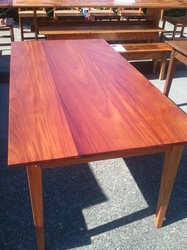 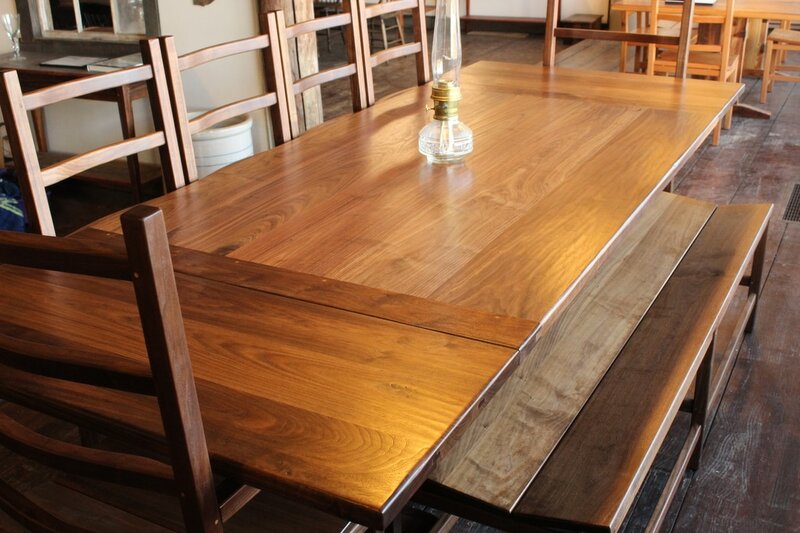 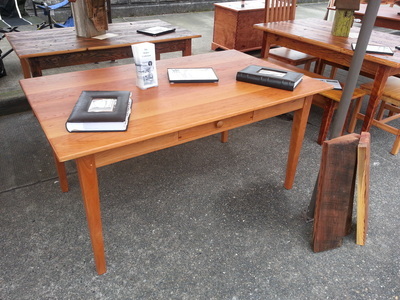 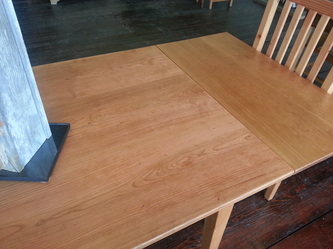 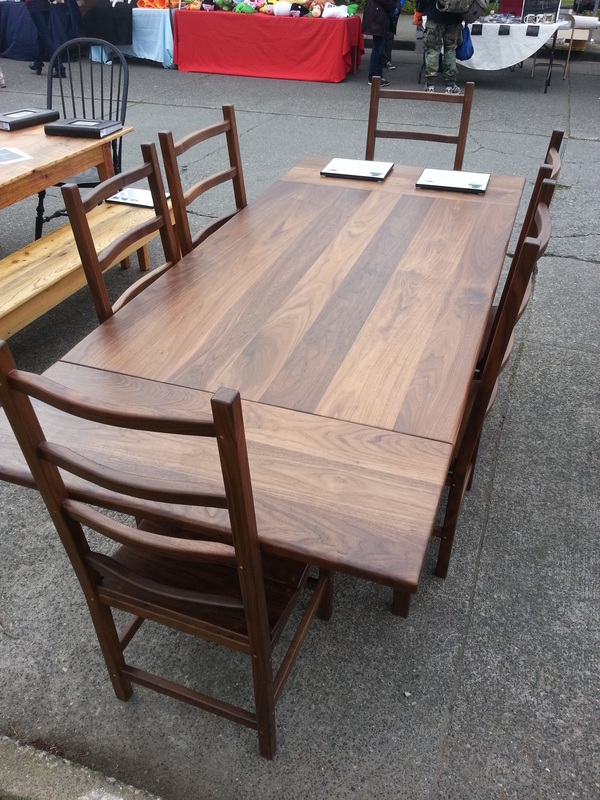 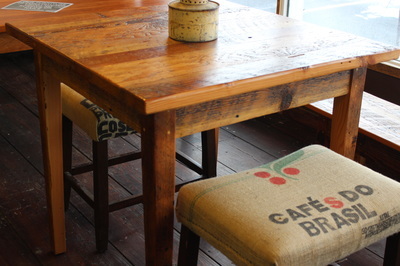 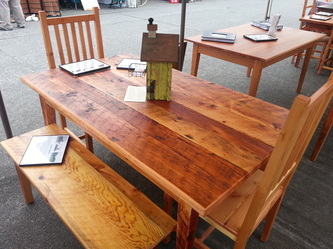 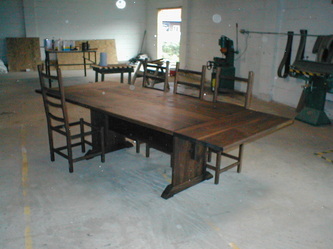 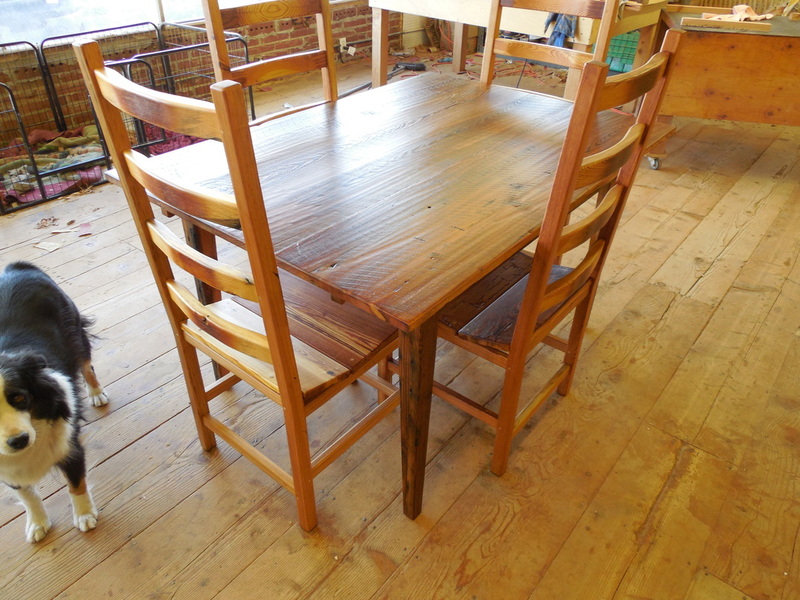 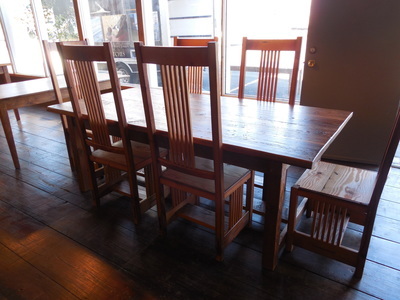 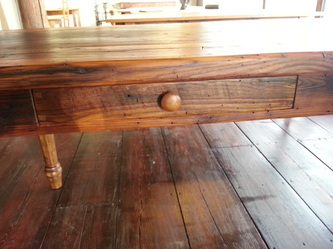 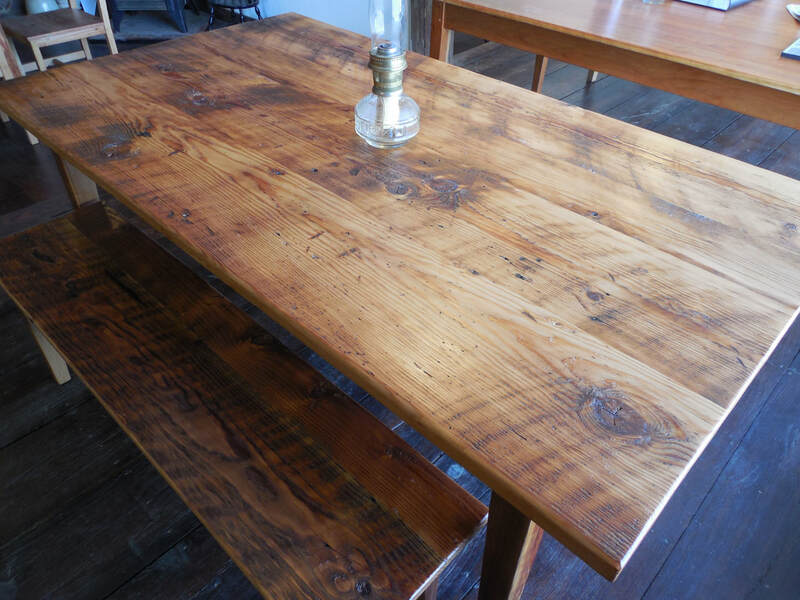 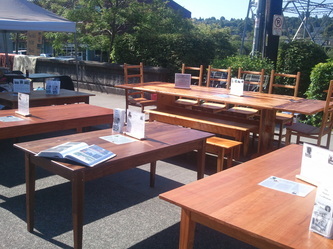 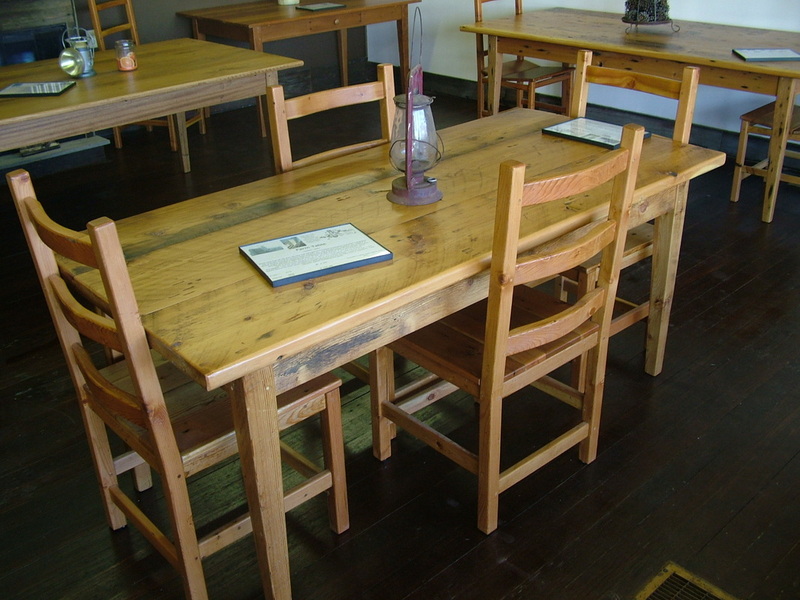 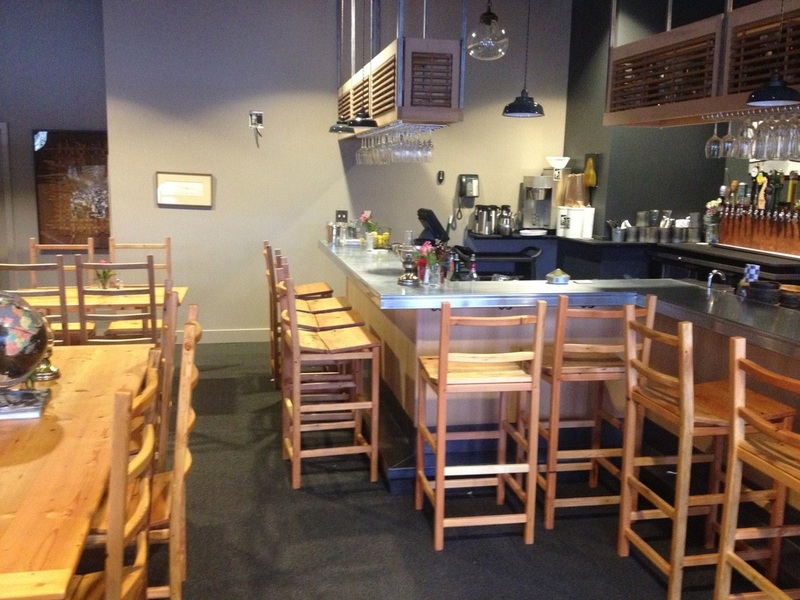 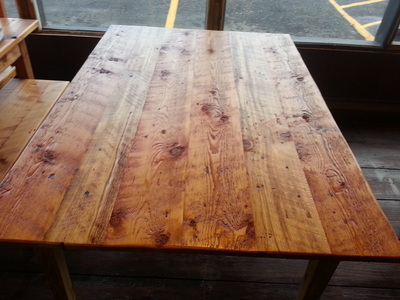 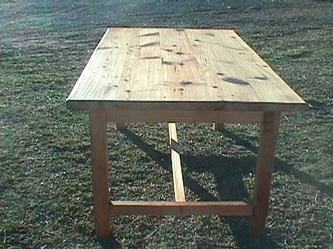 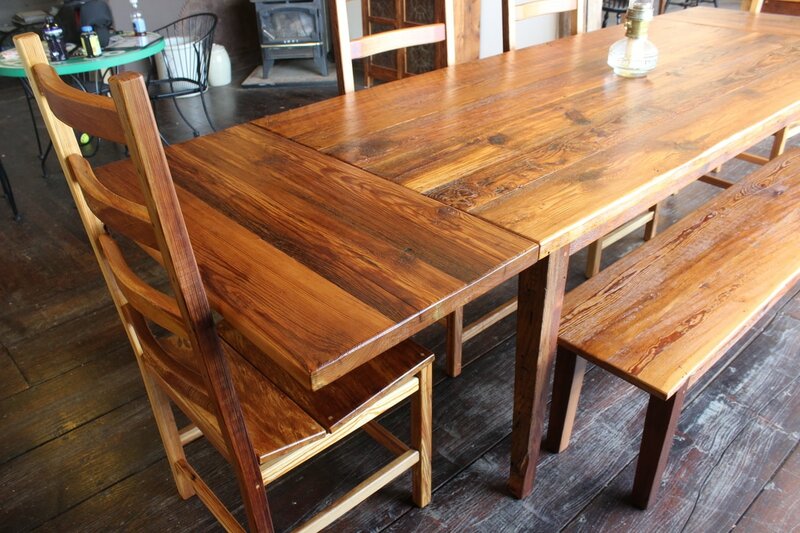 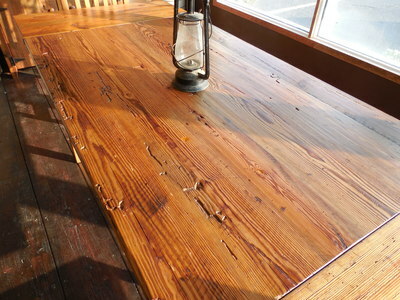 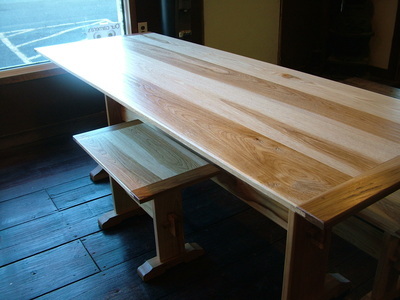 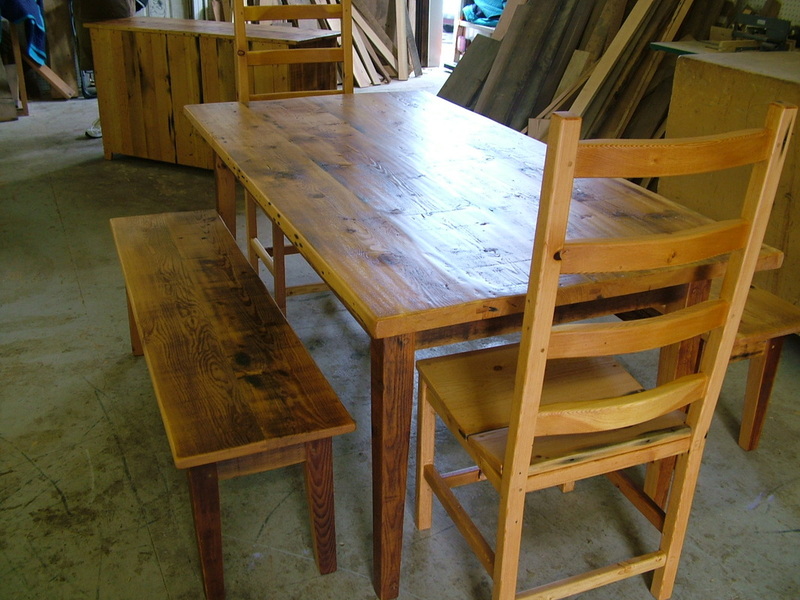 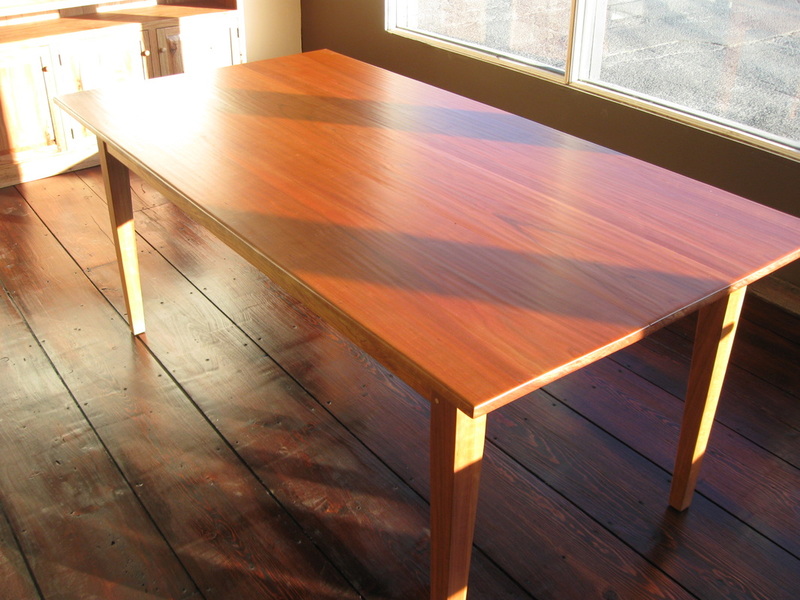 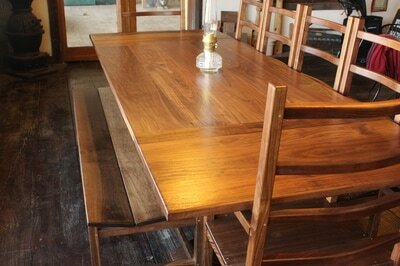 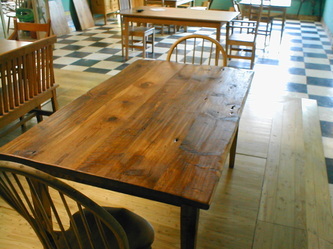 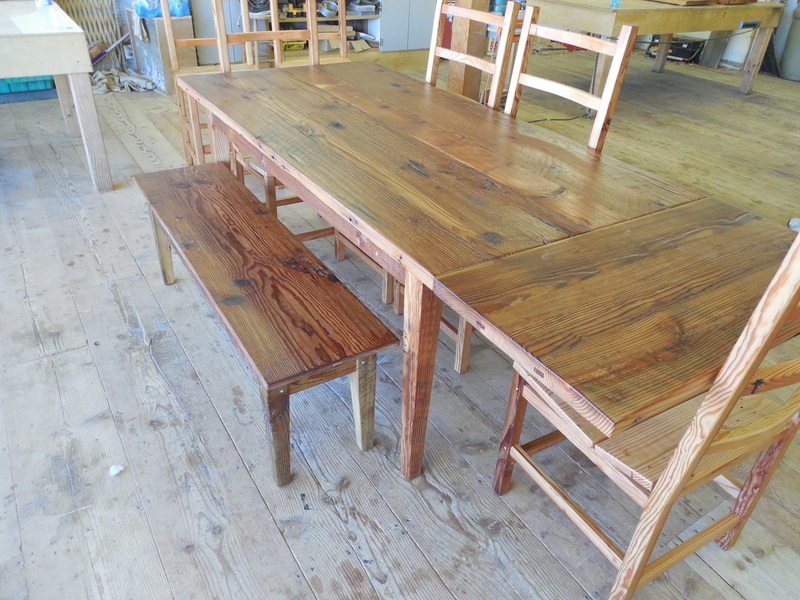 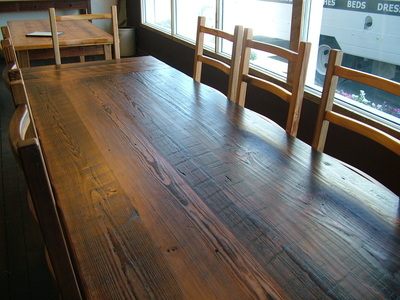 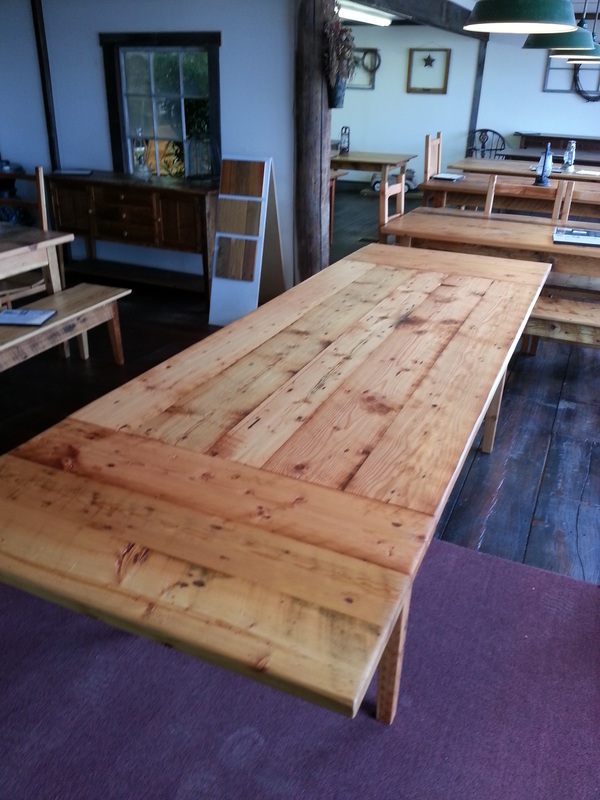 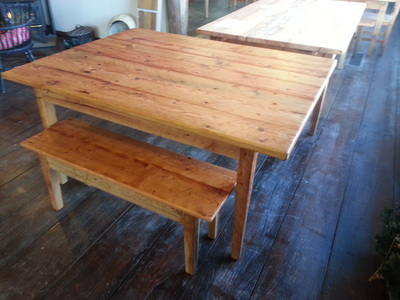 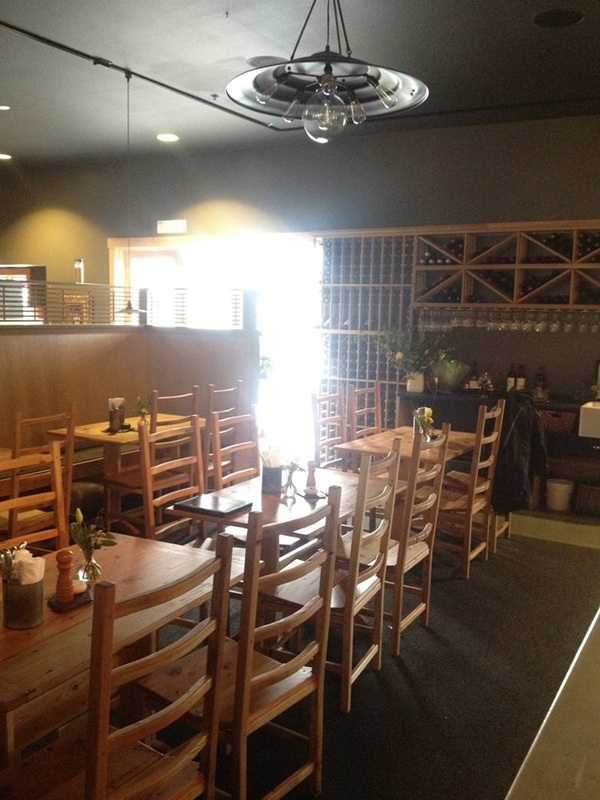 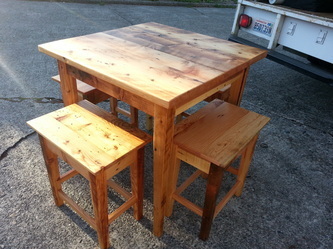 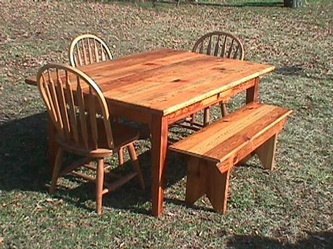 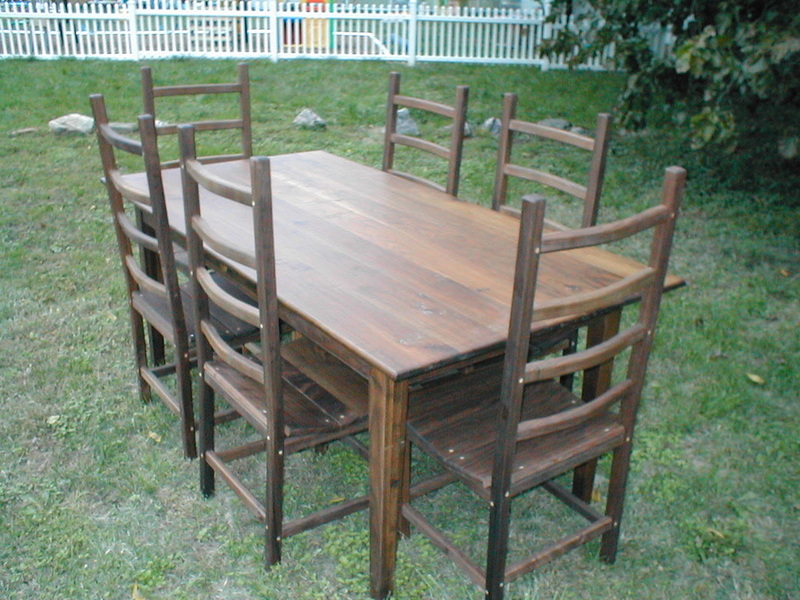 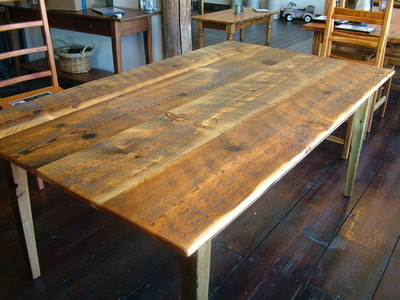 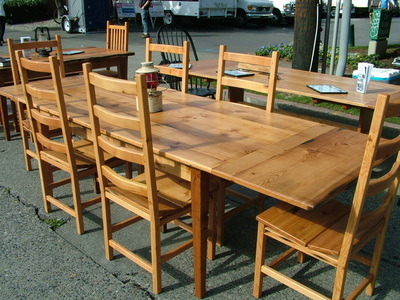 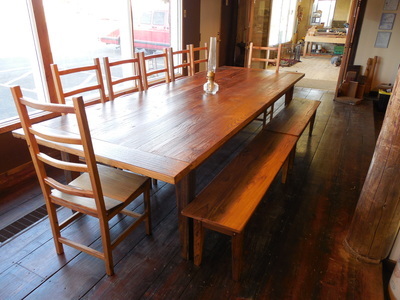 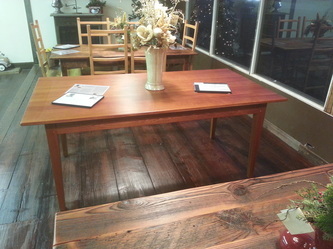 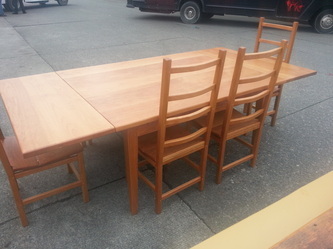 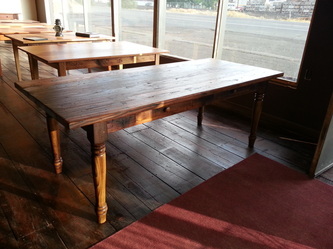 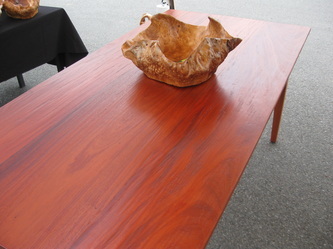 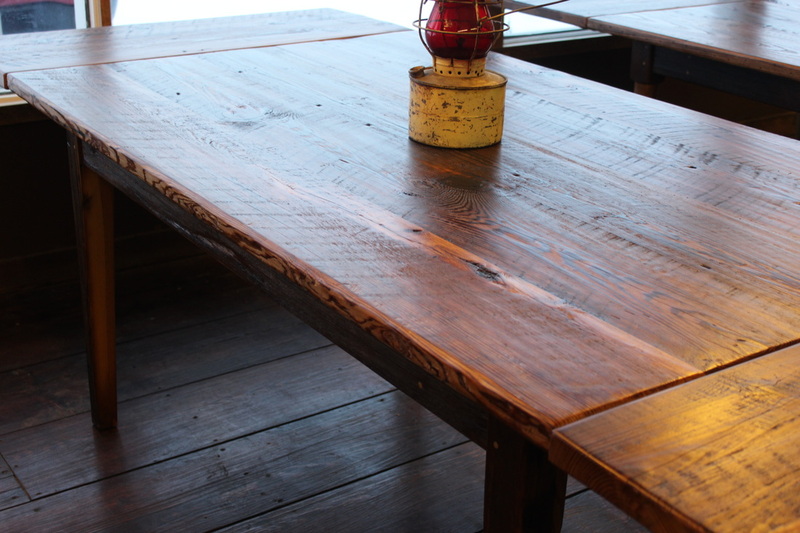 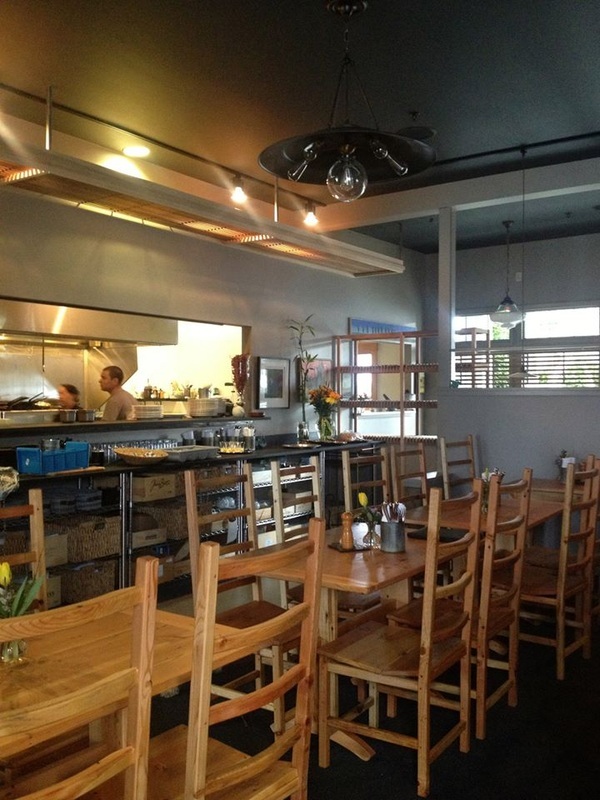 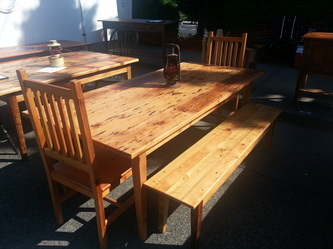 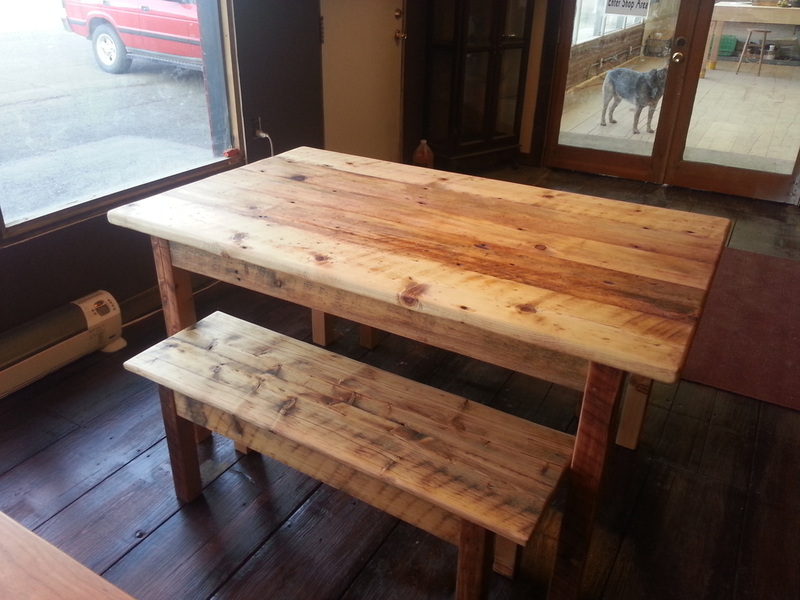 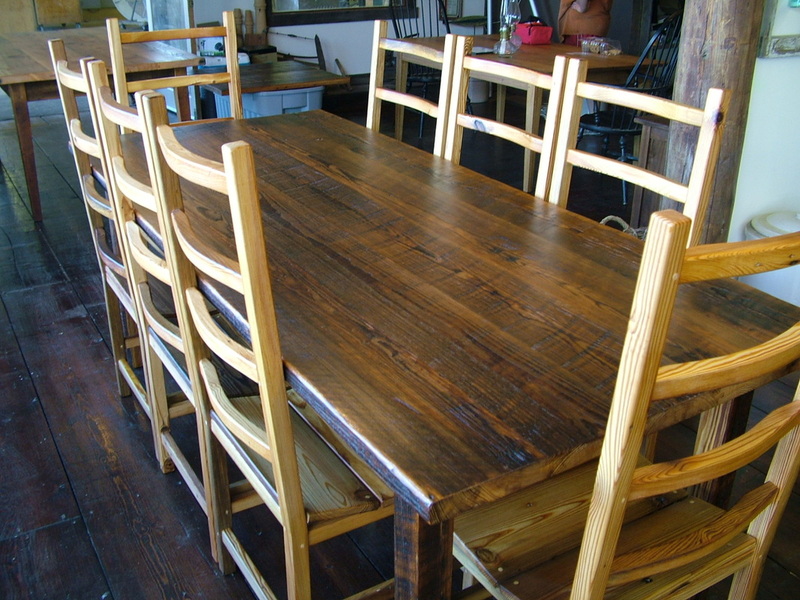 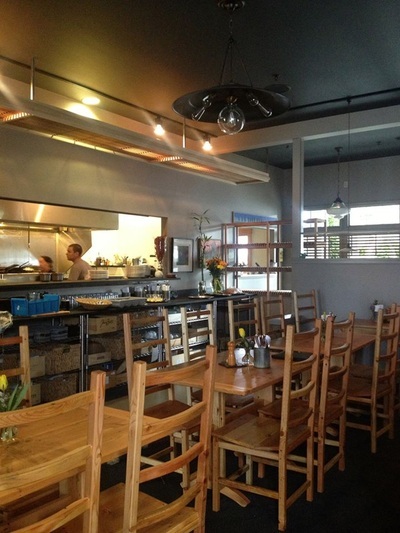 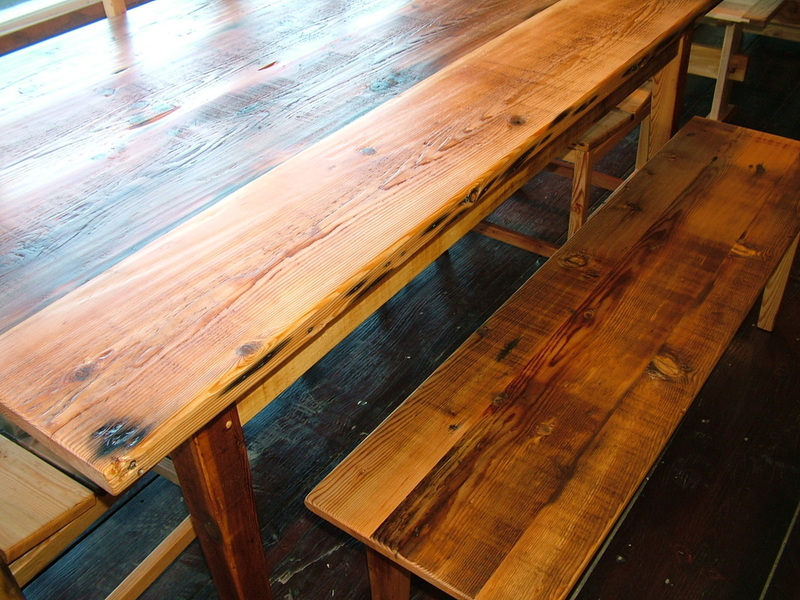 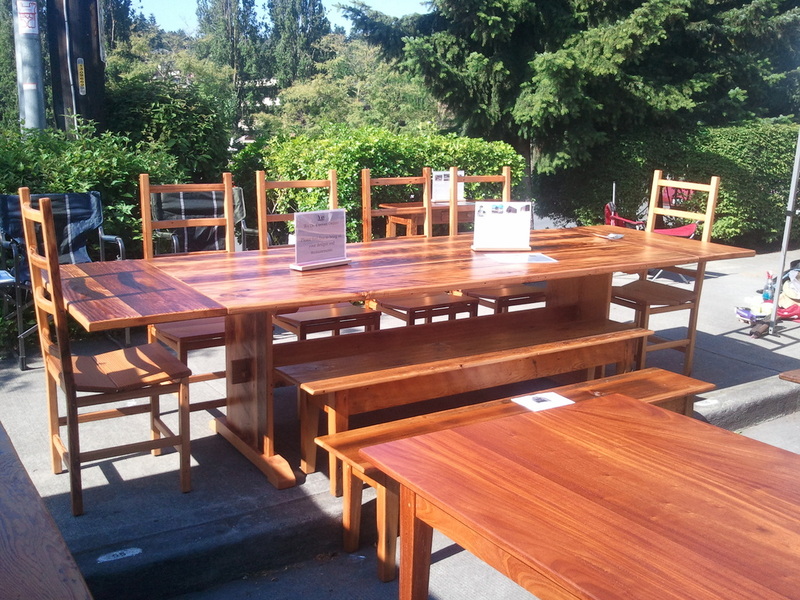 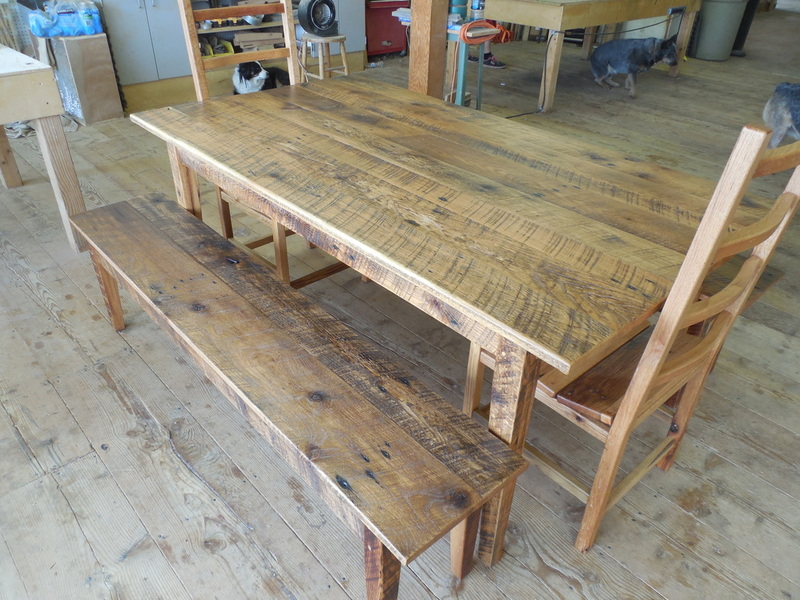 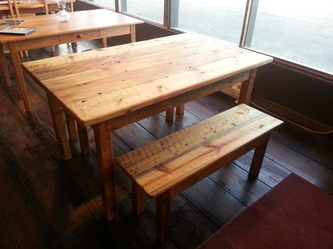 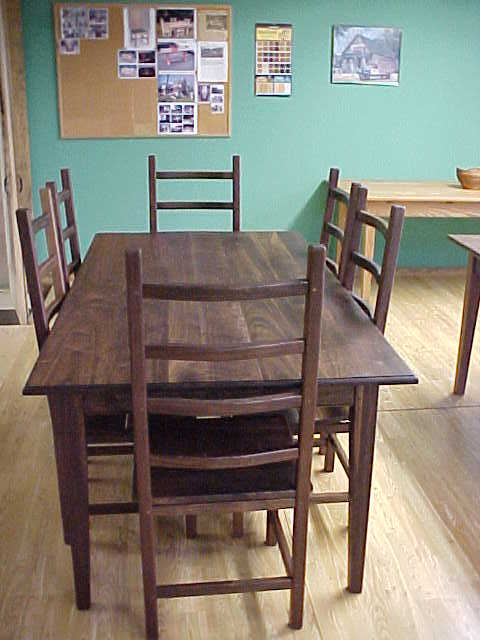 Tables are available with thick or thin tops, extra width or more narrow. 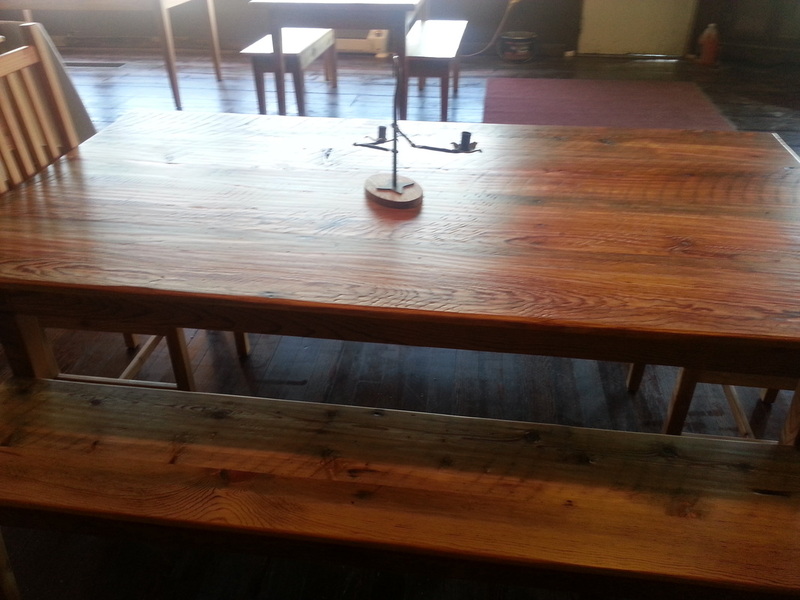 Tables are also available in round. 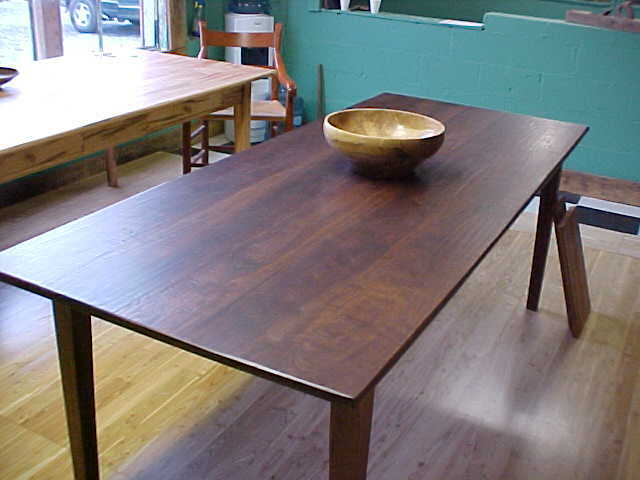 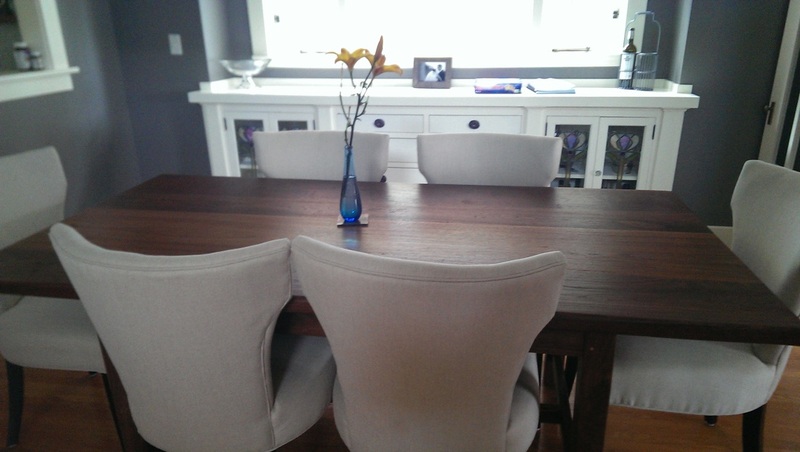 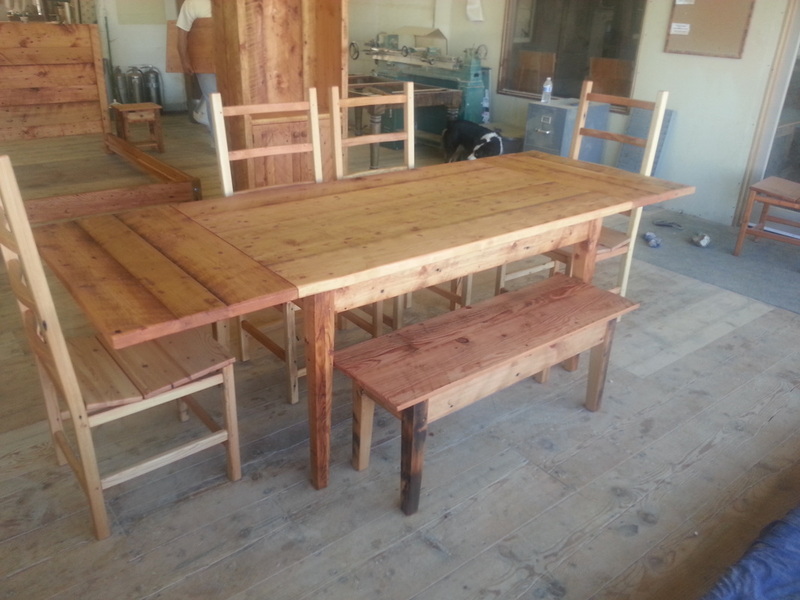 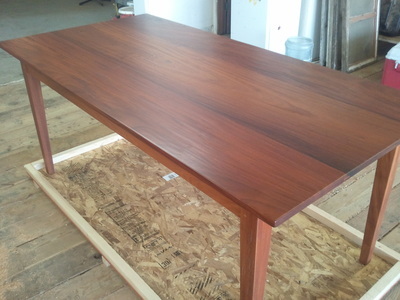 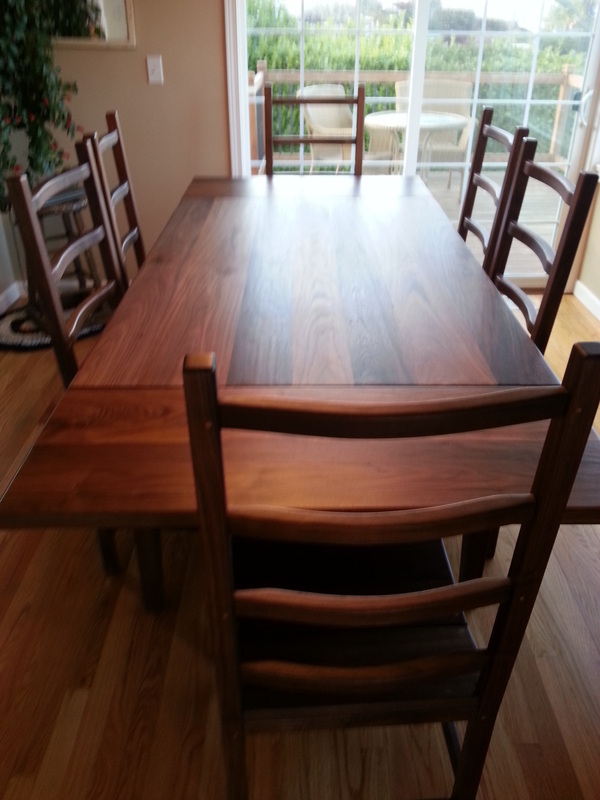 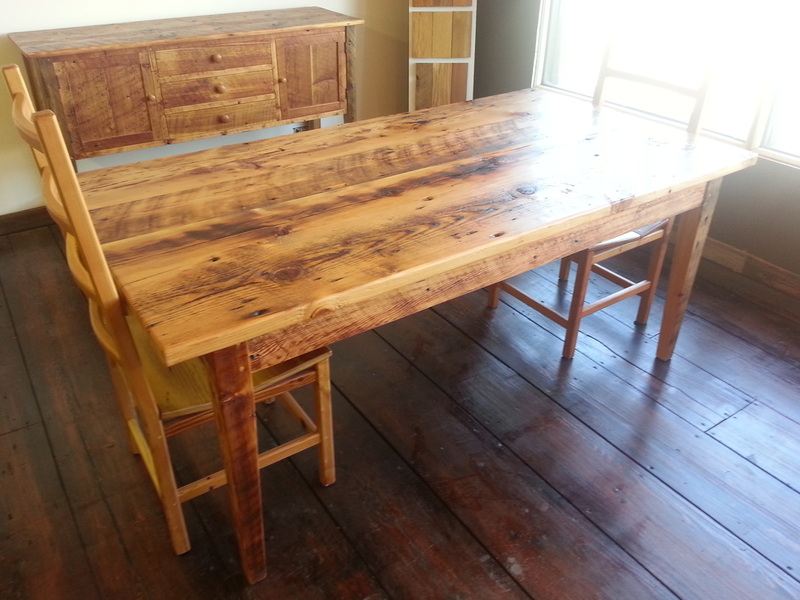 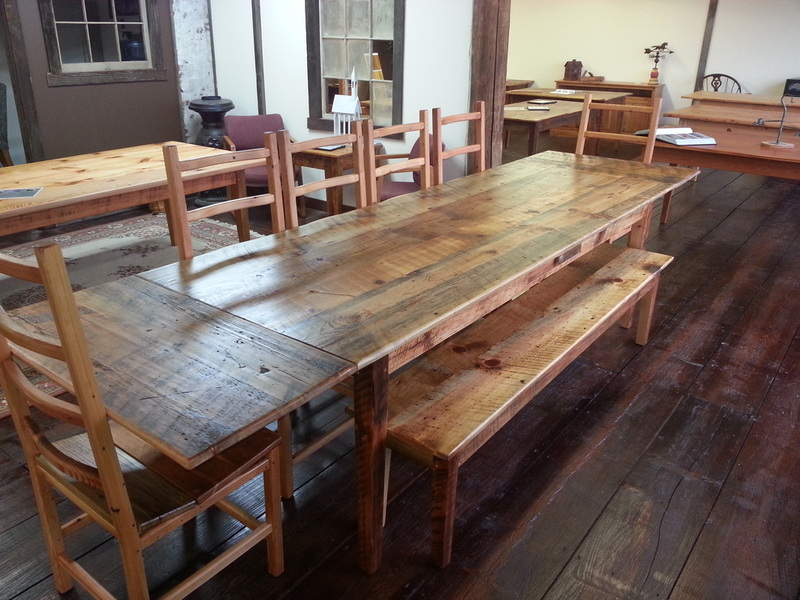 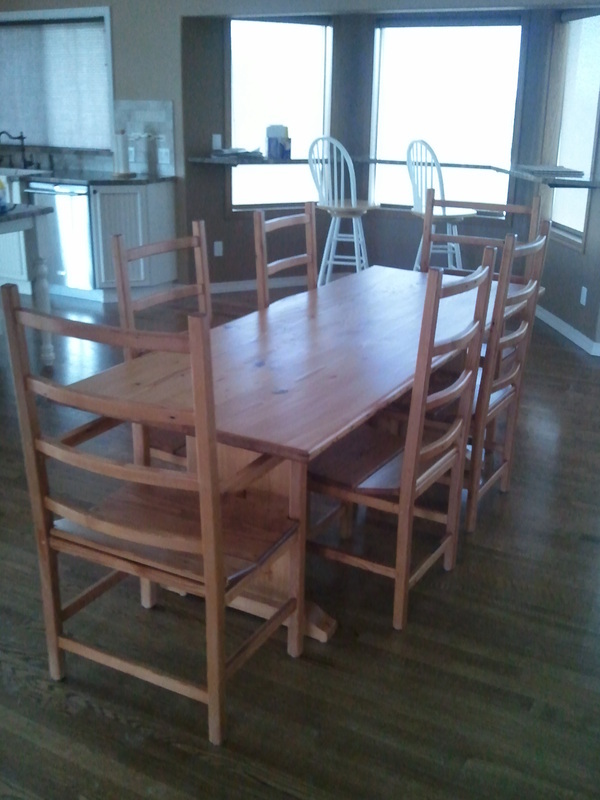 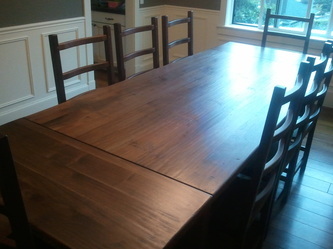 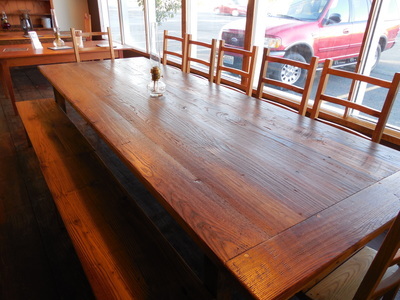 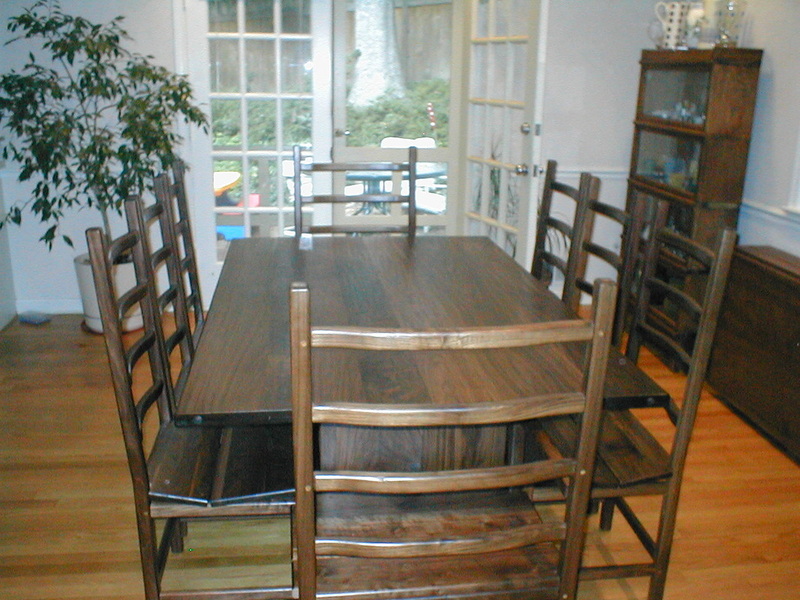 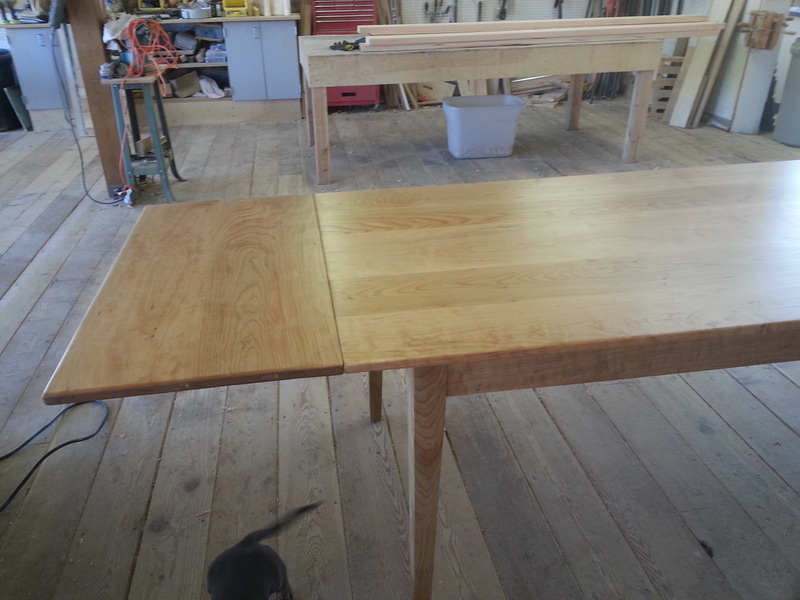 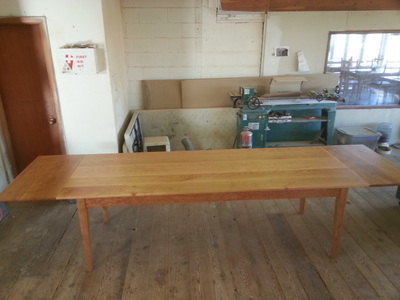 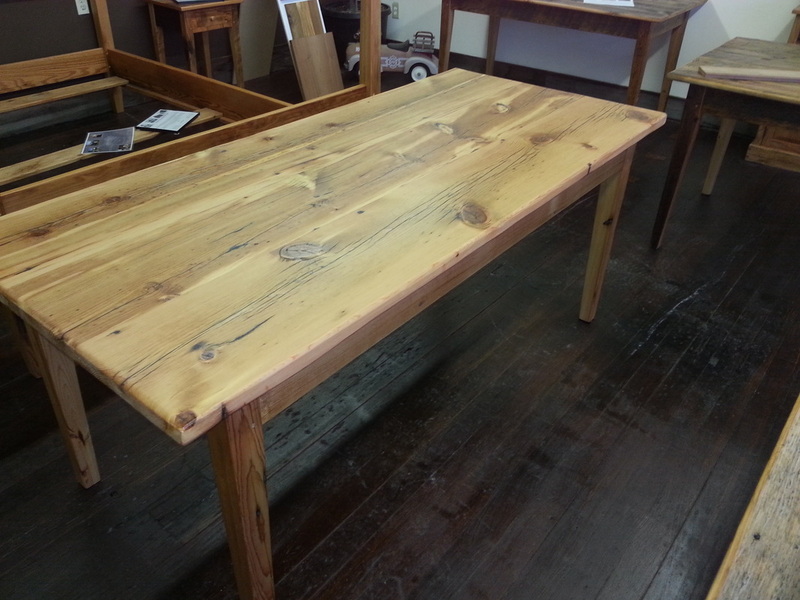 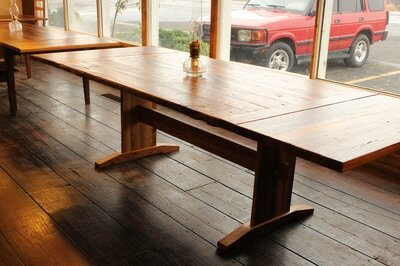 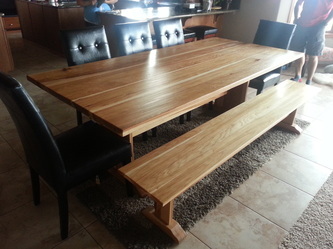 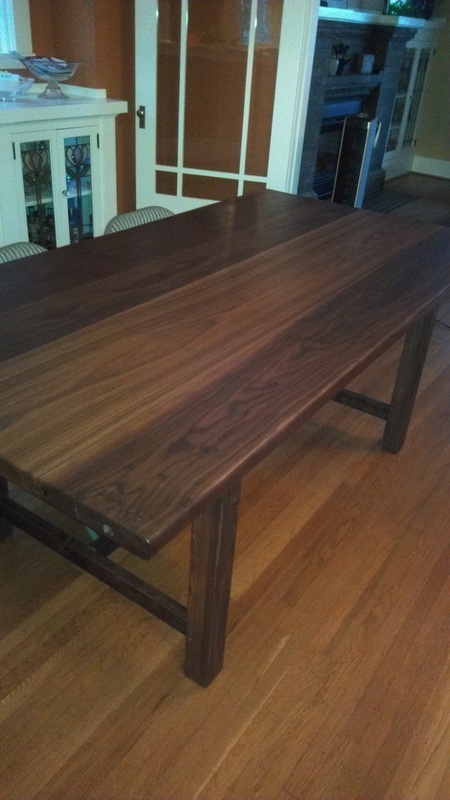 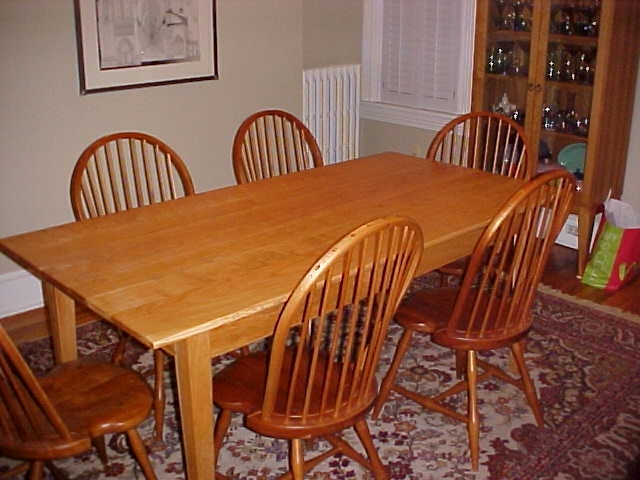 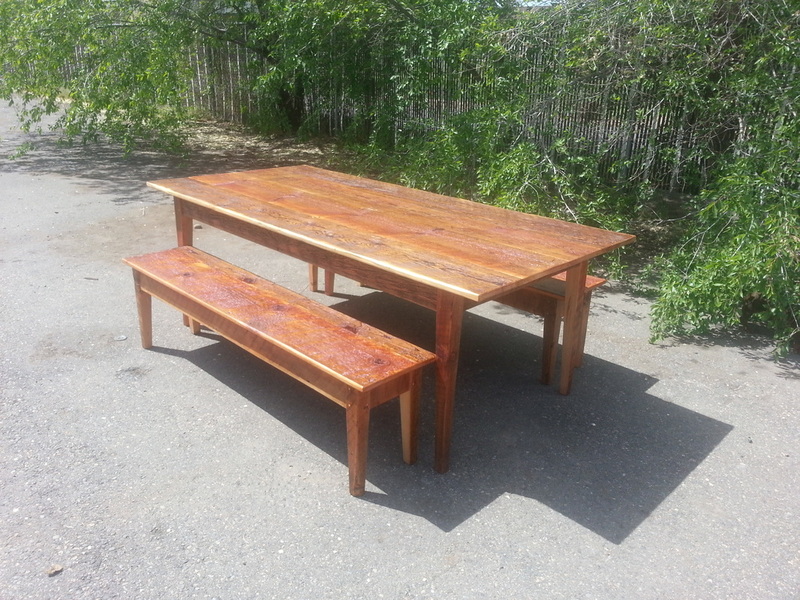 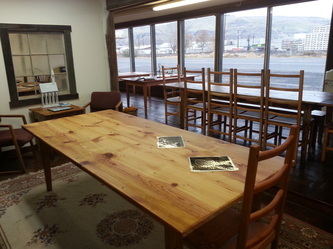 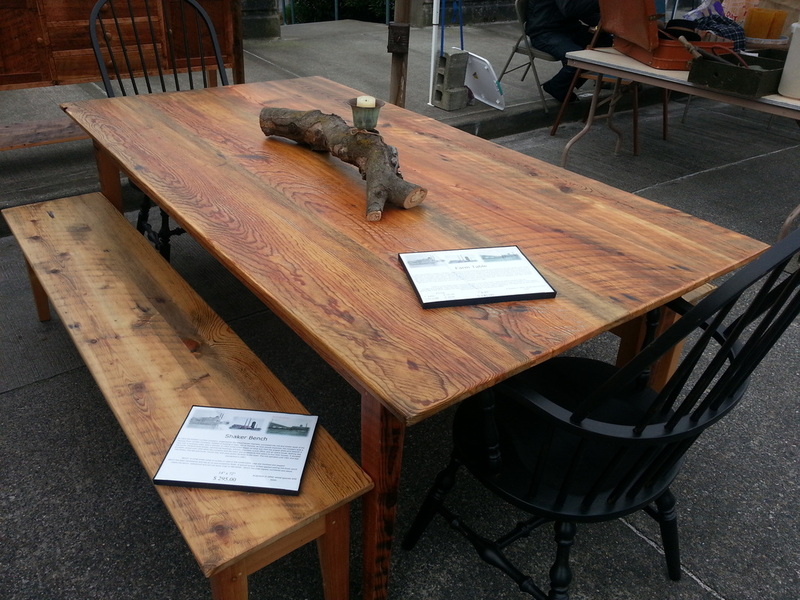 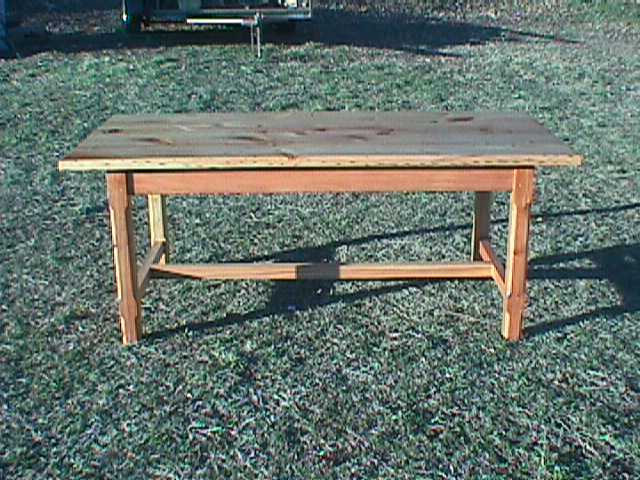 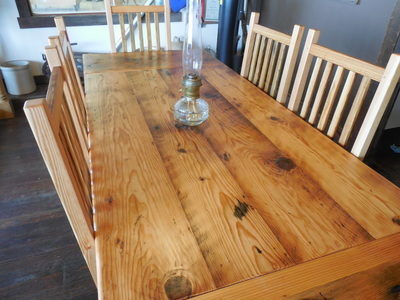 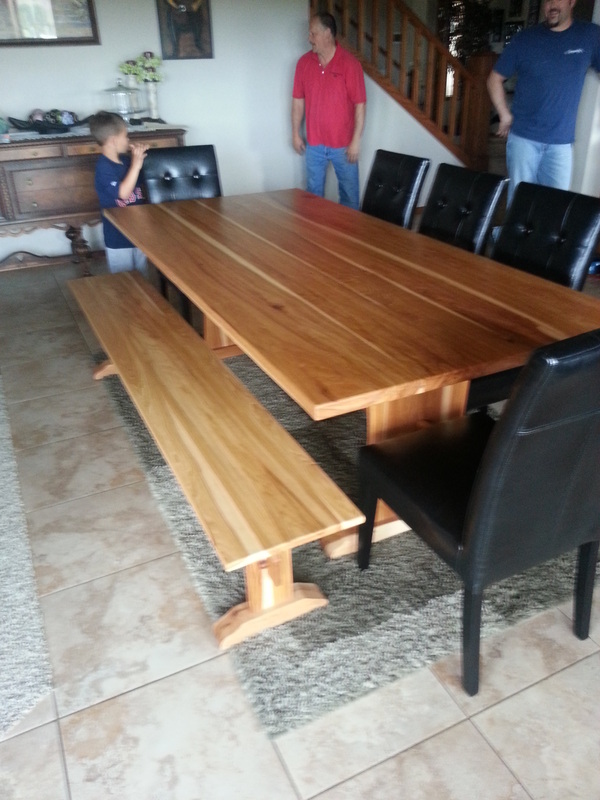 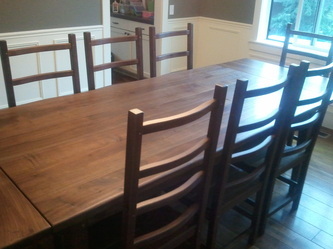 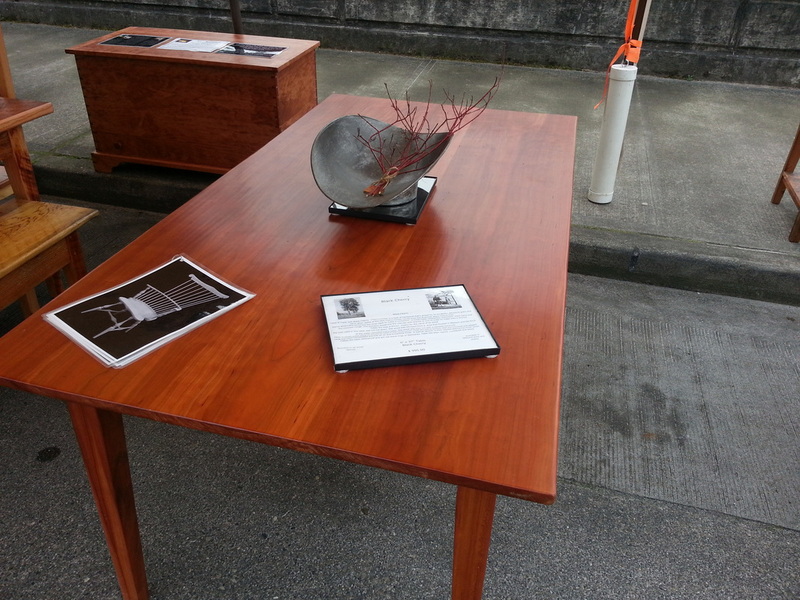 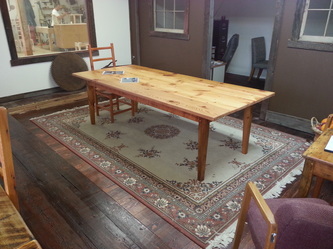 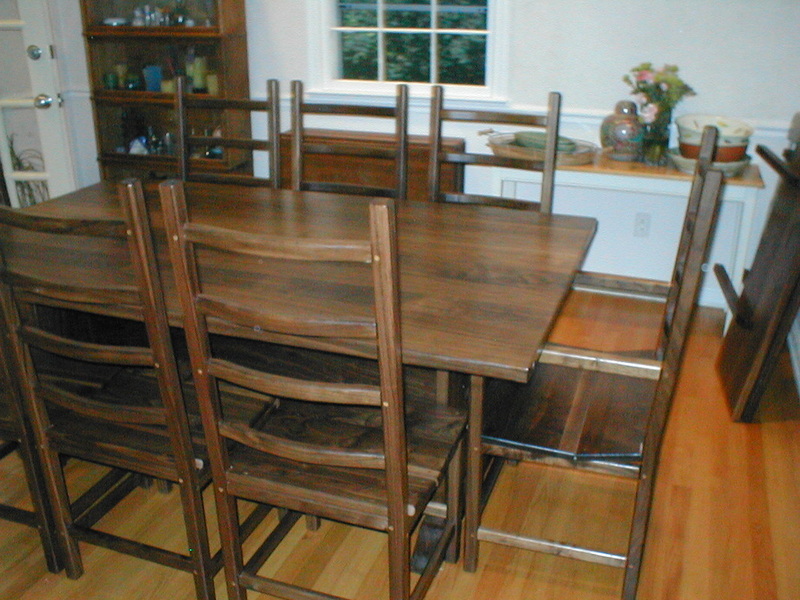 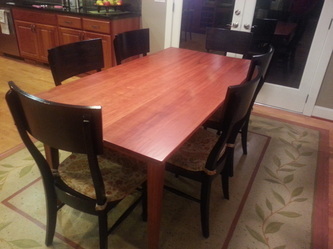 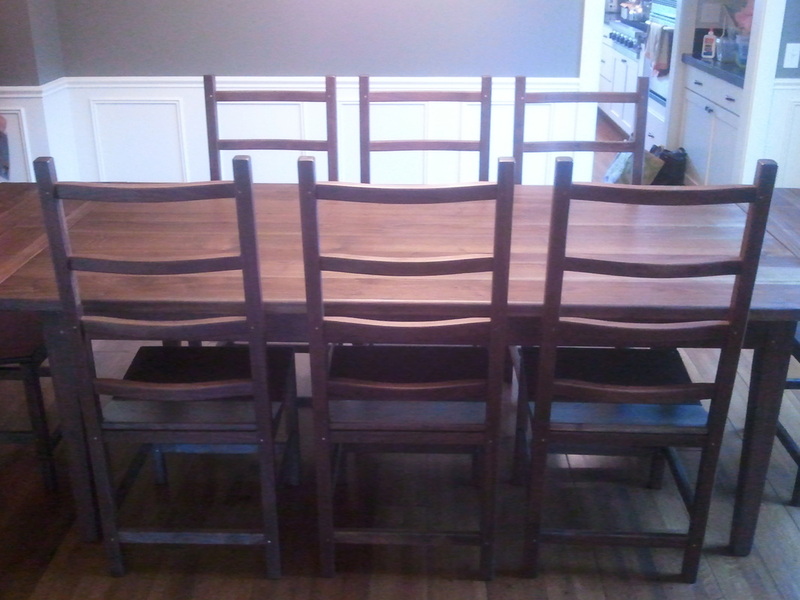 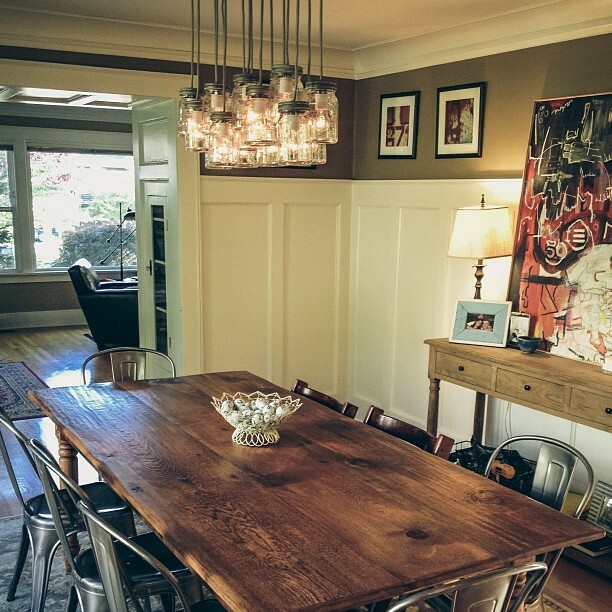 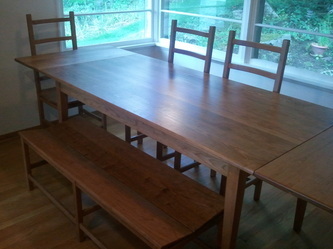 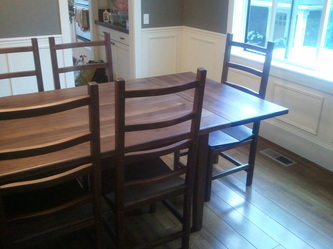 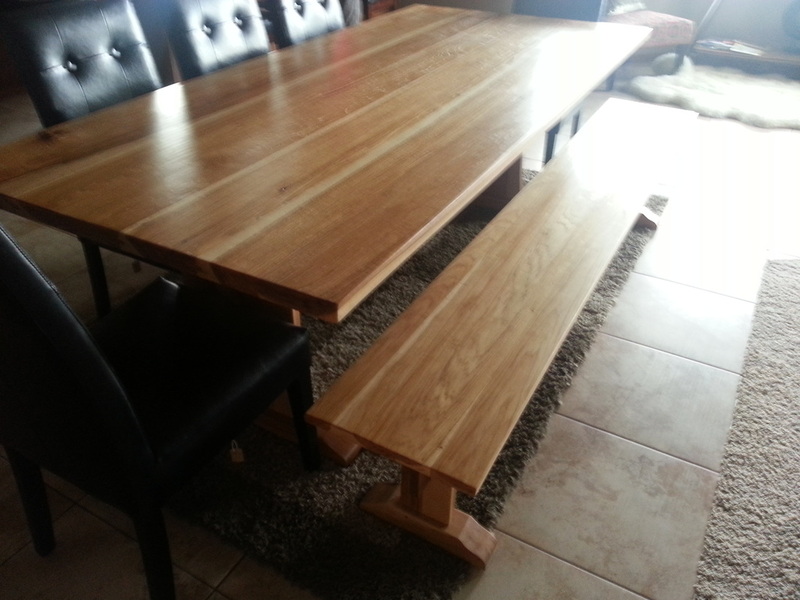 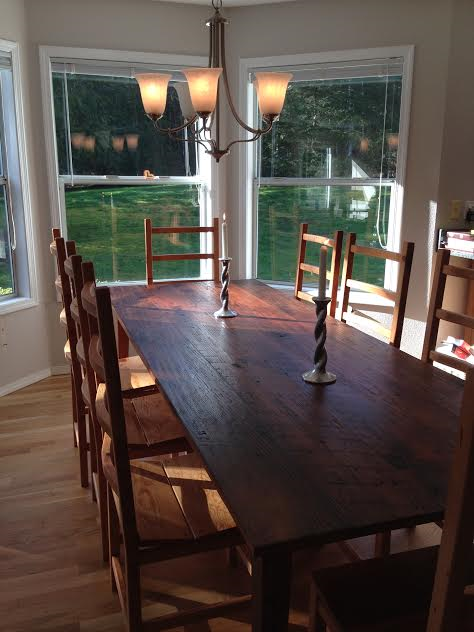 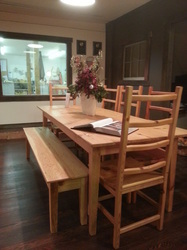 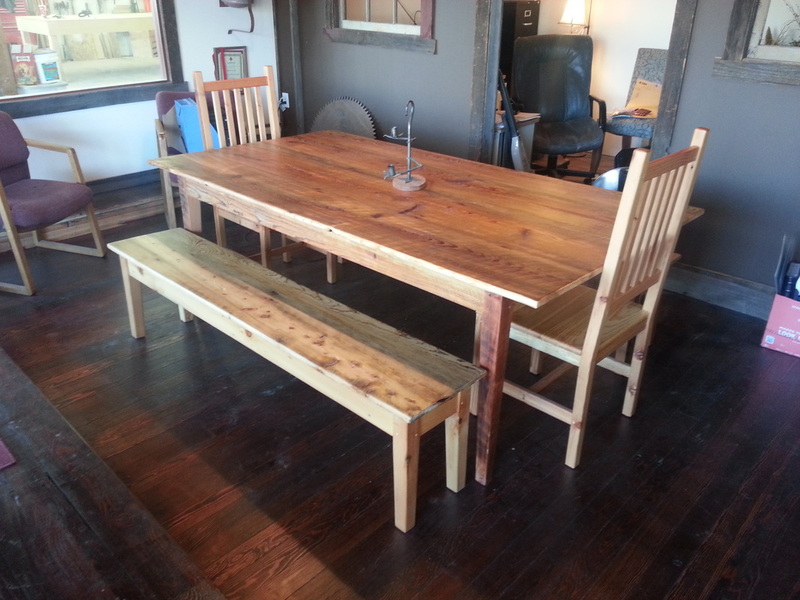 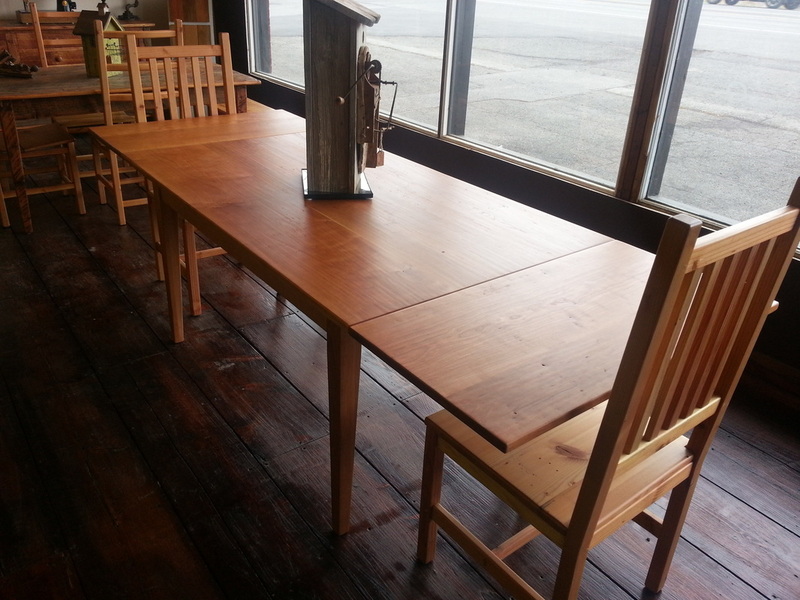 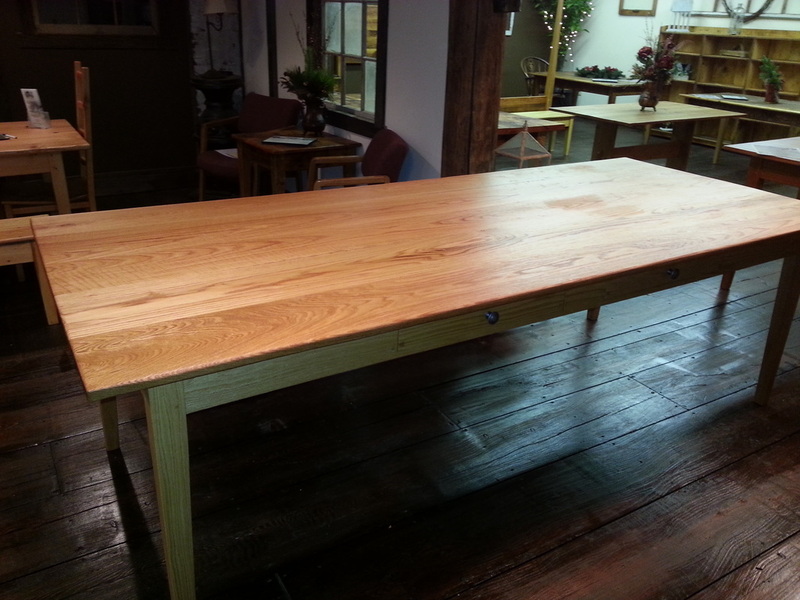 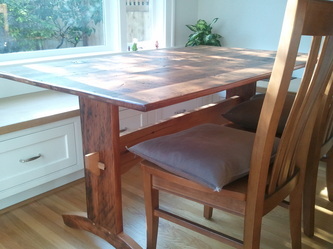 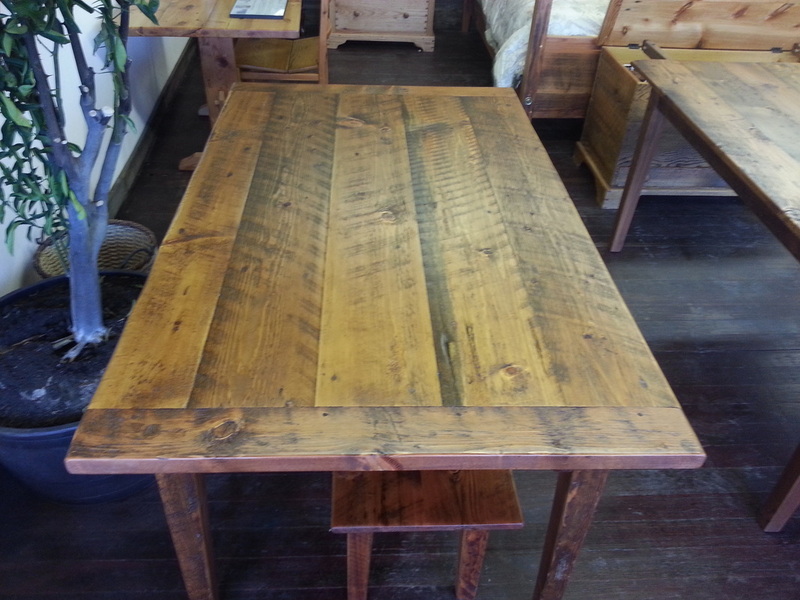 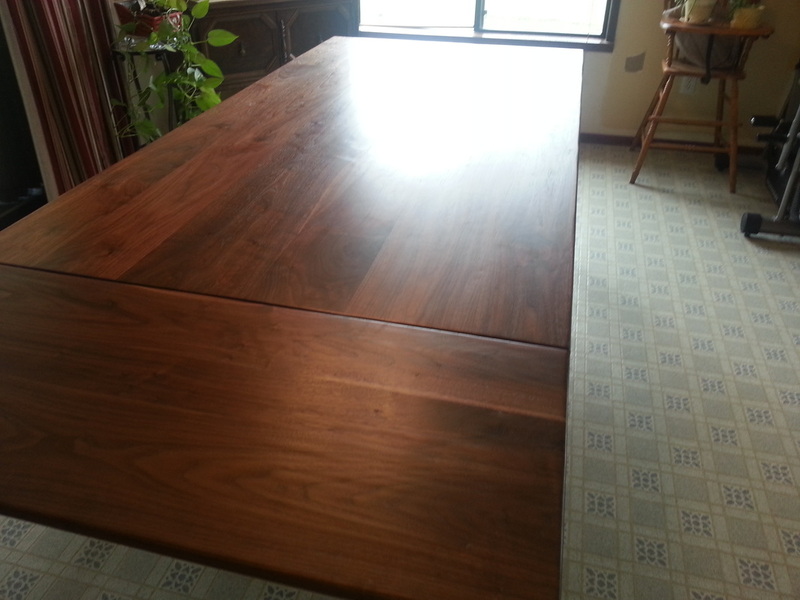 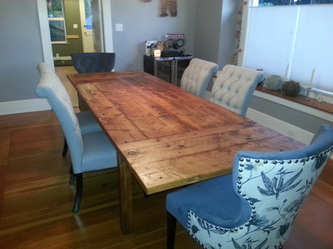 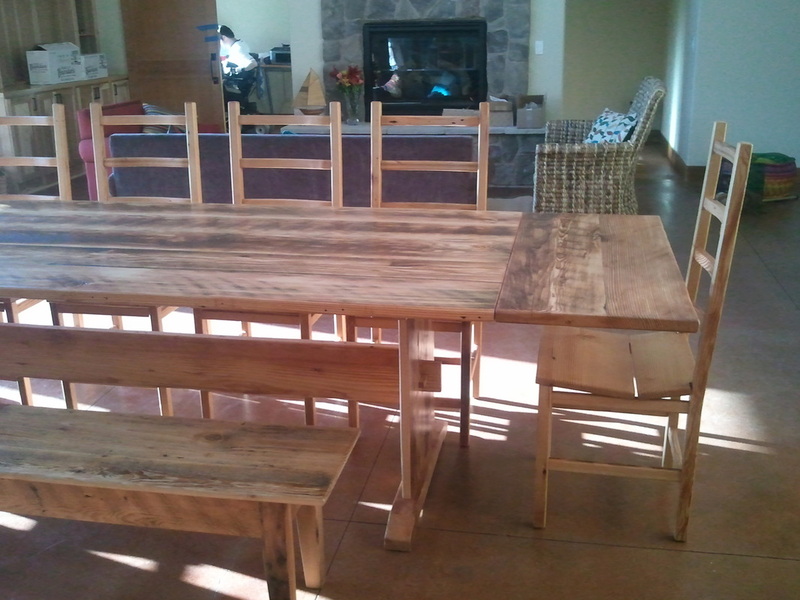 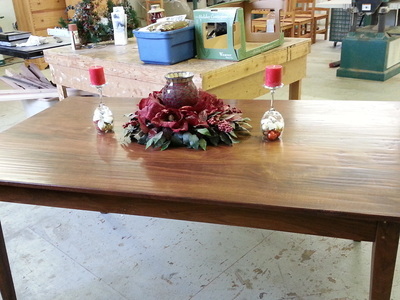 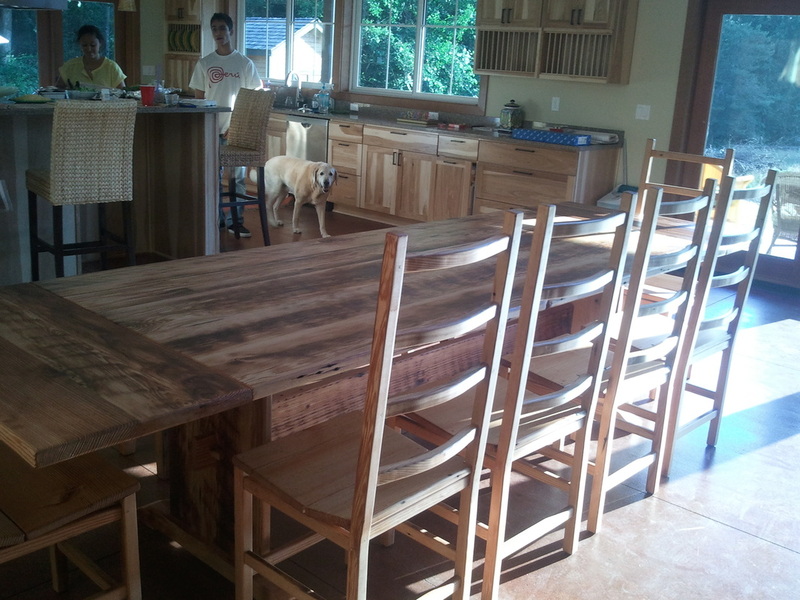 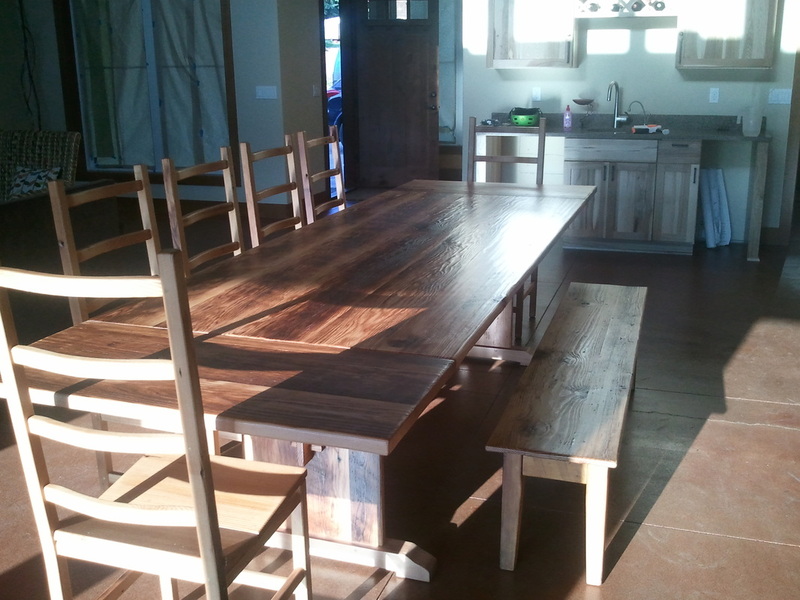 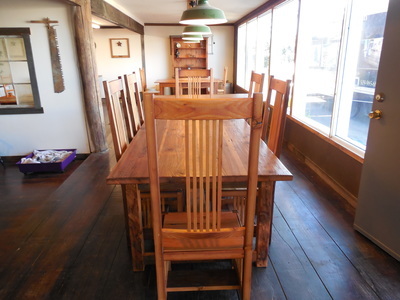 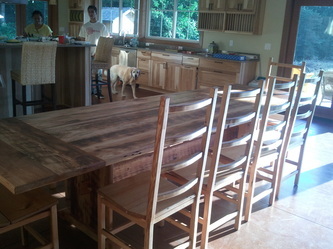 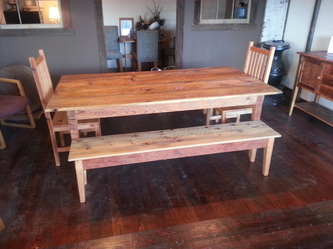 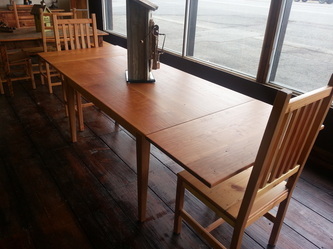 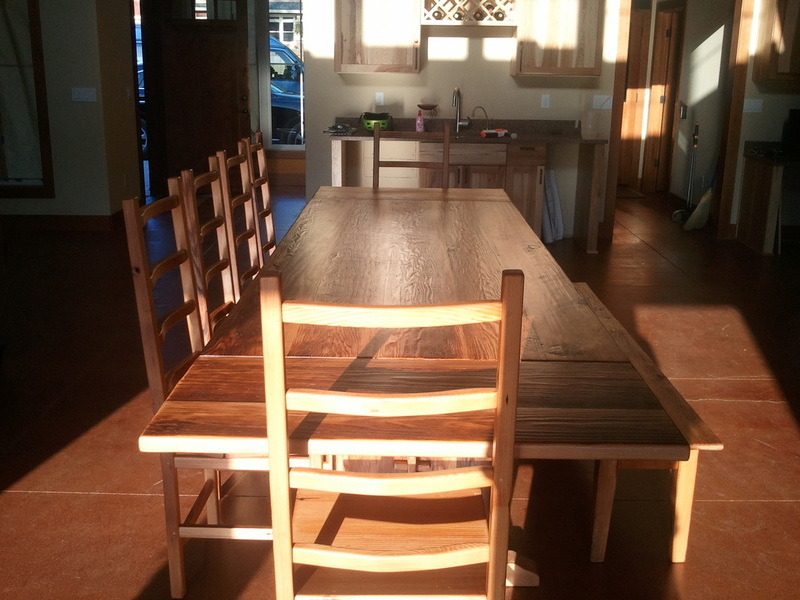 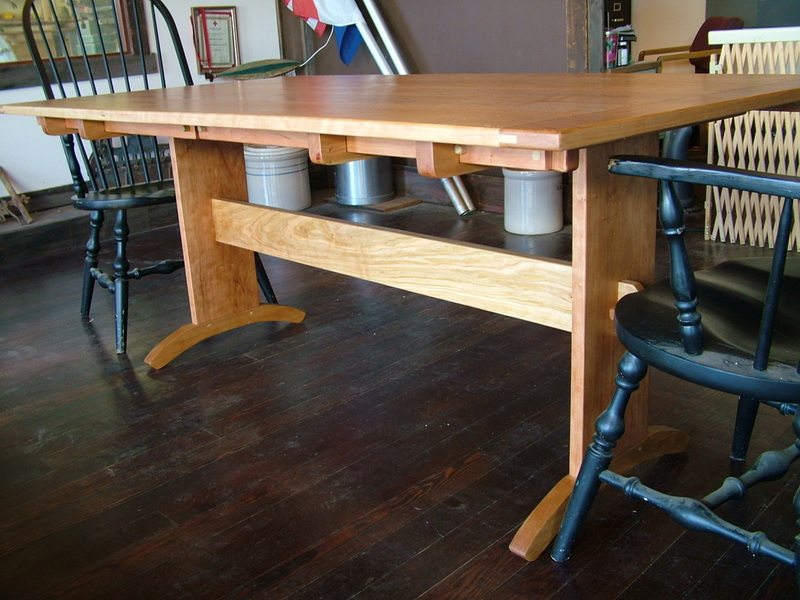 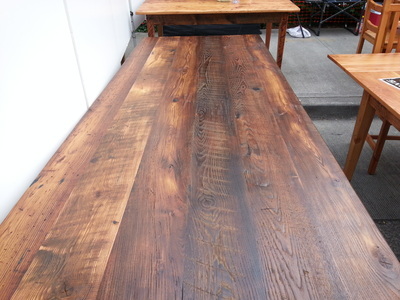 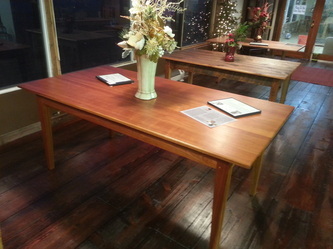 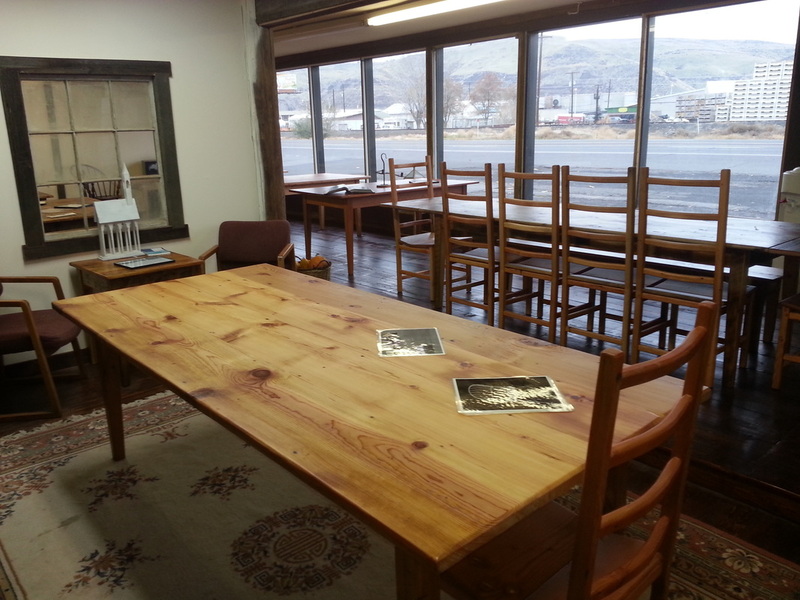 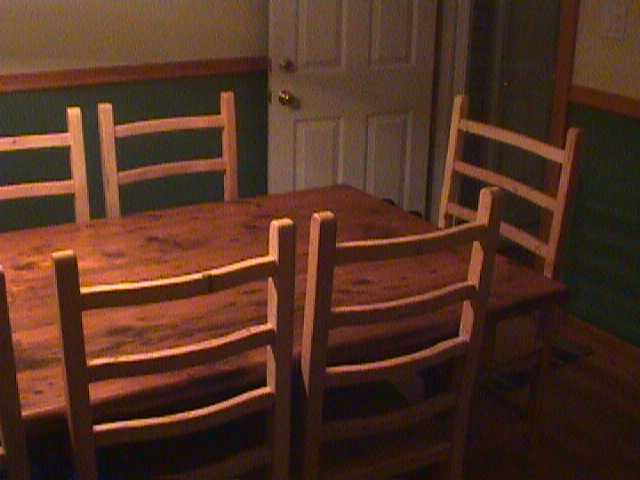 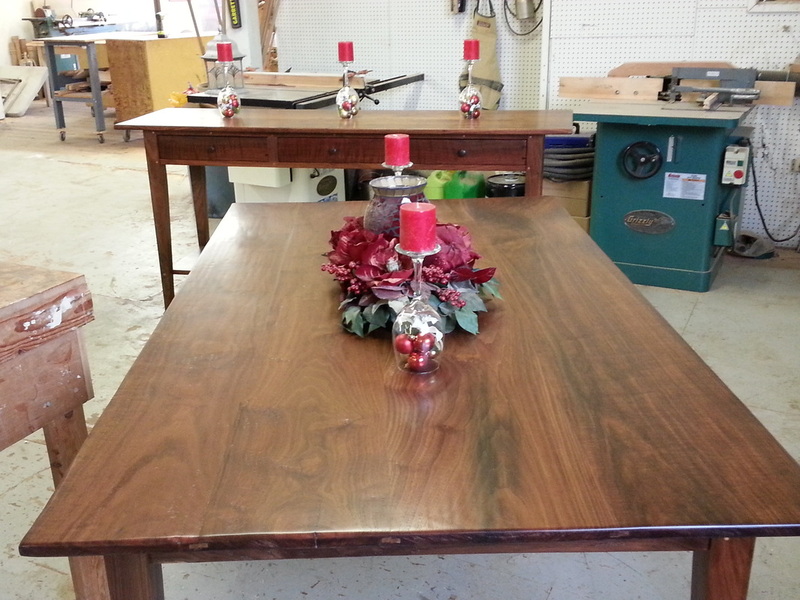 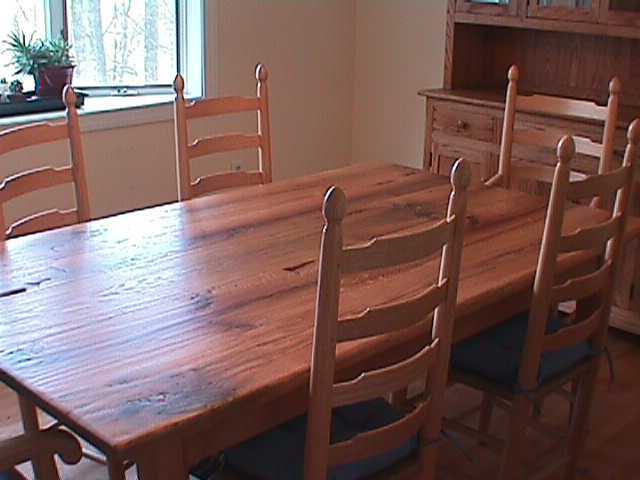 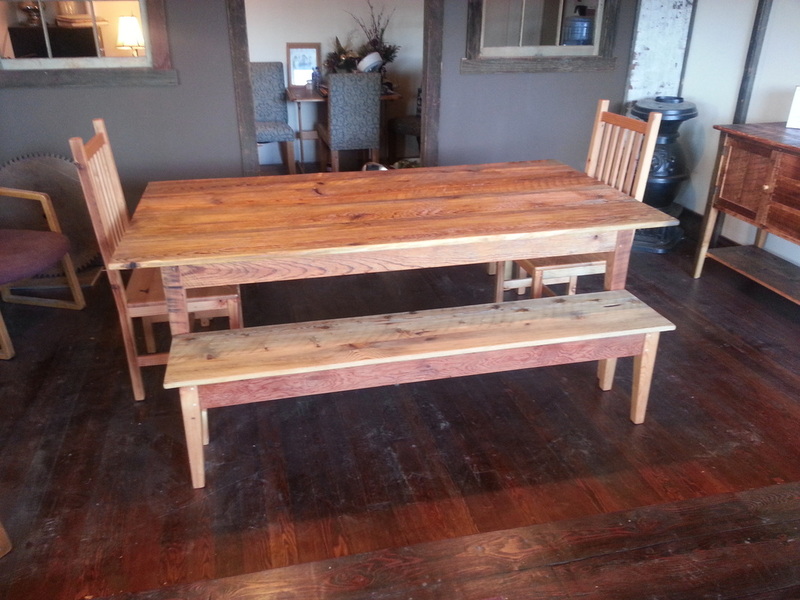 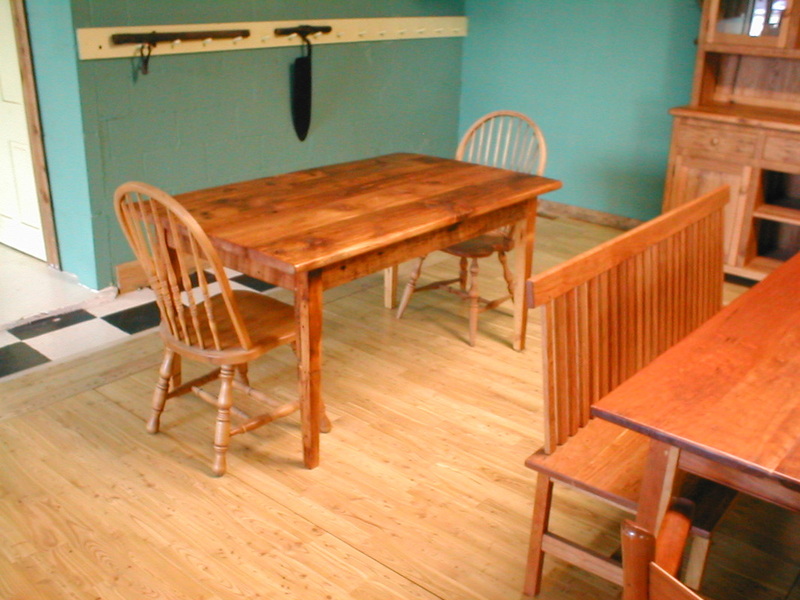 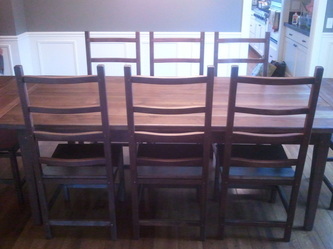 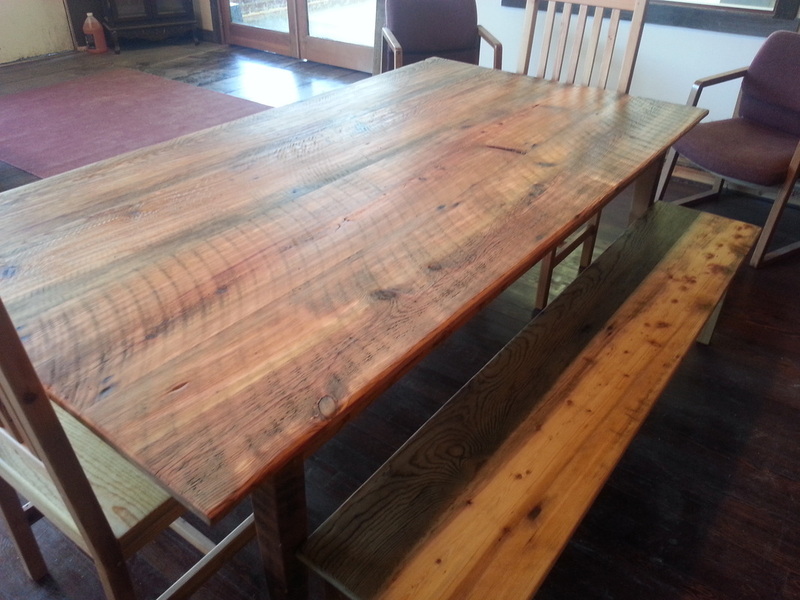 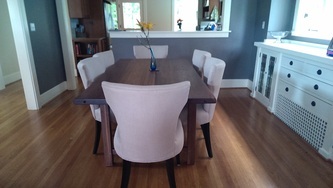 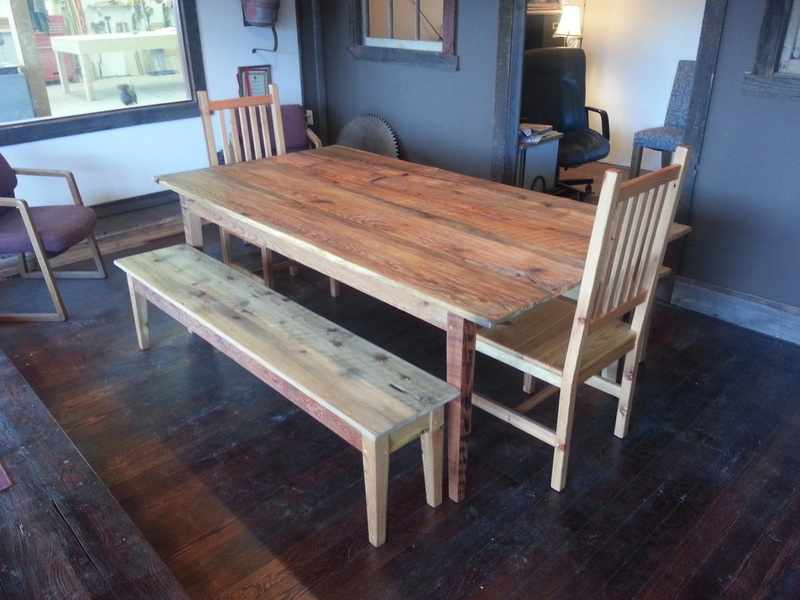 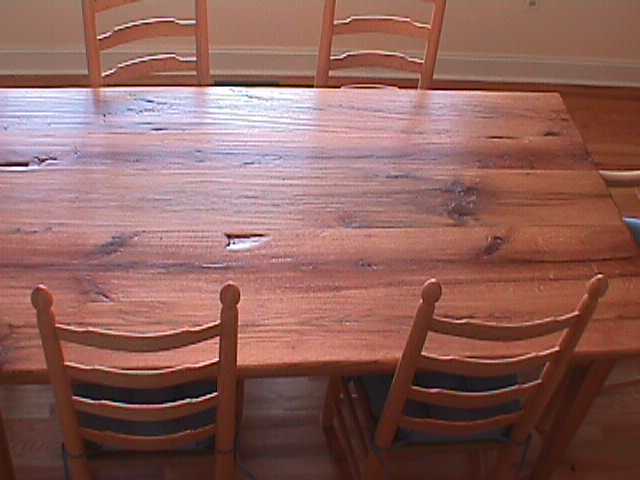 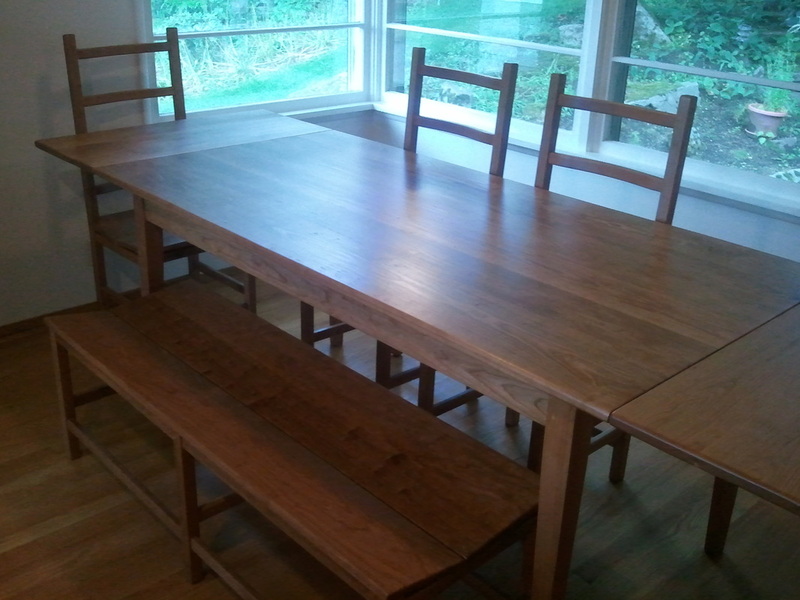 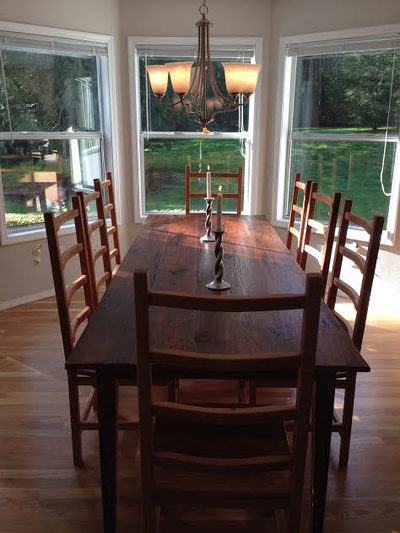 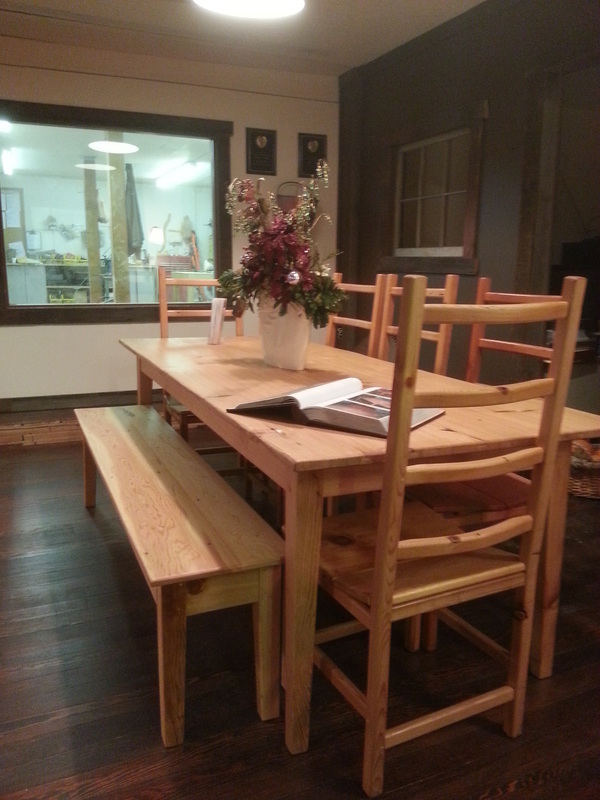 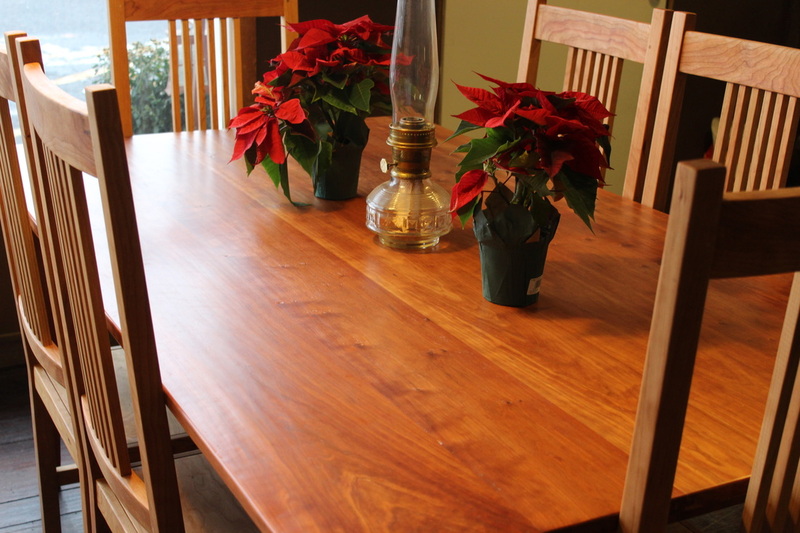 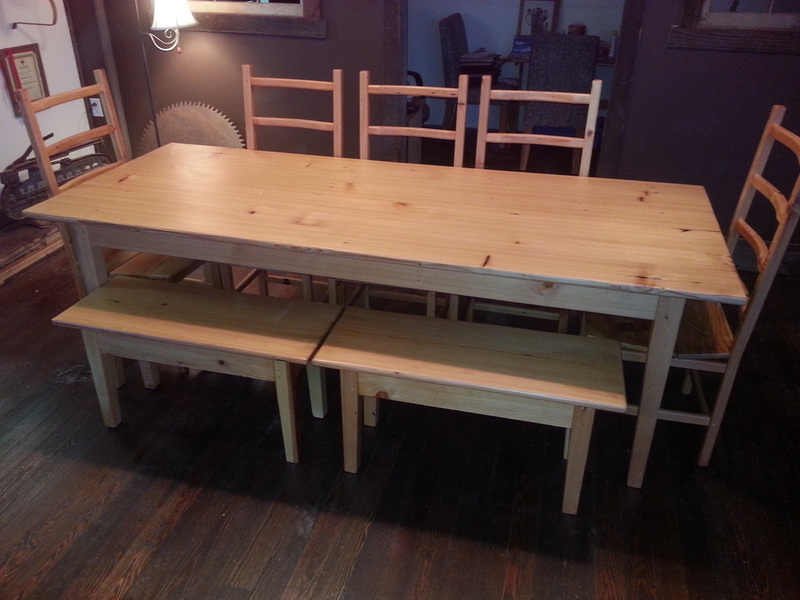 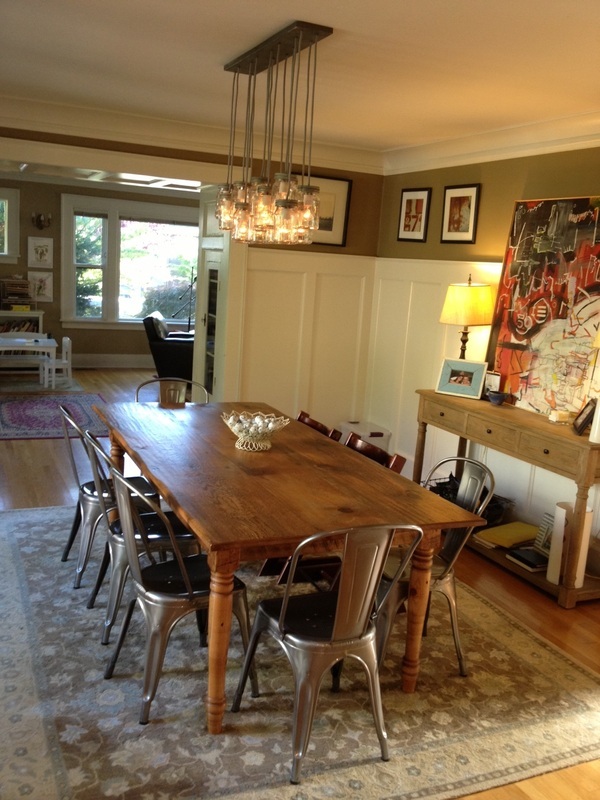 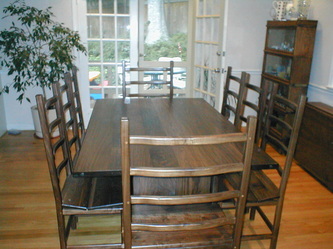 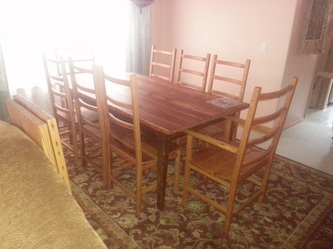 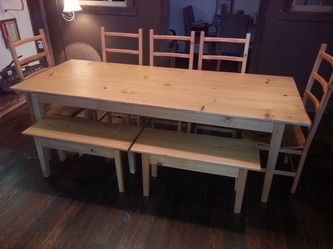 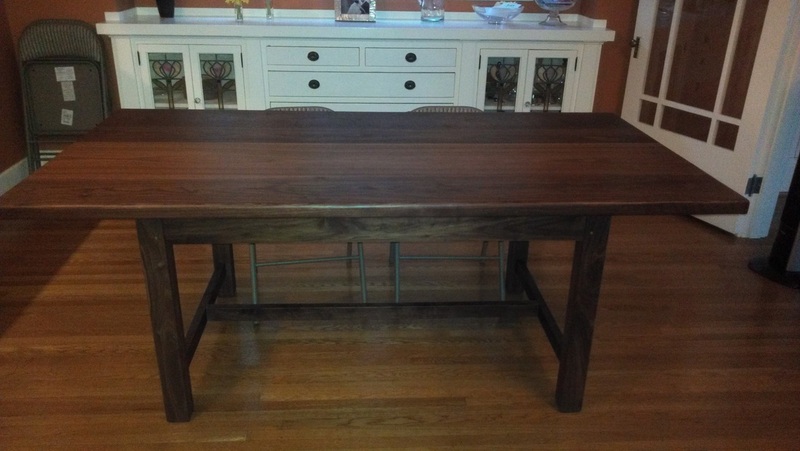 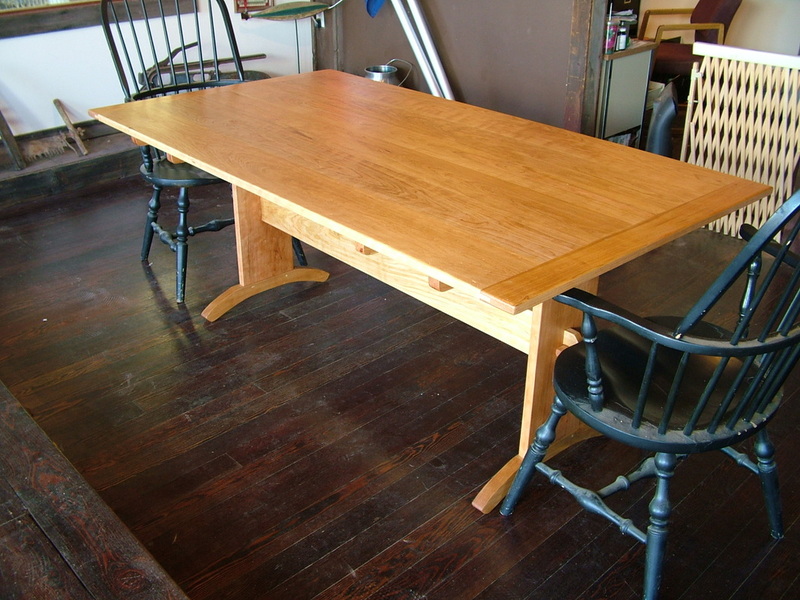 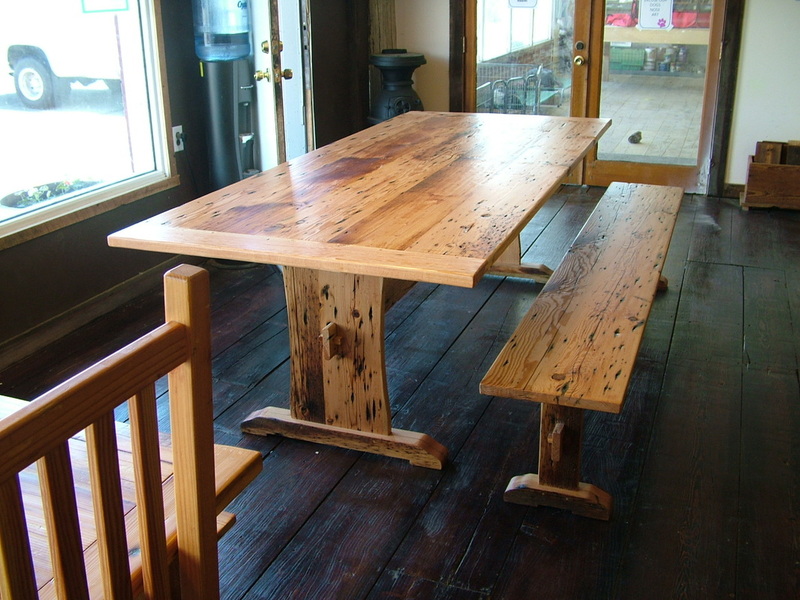 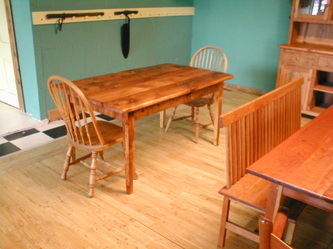 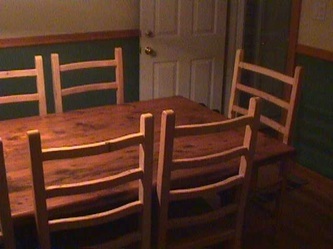 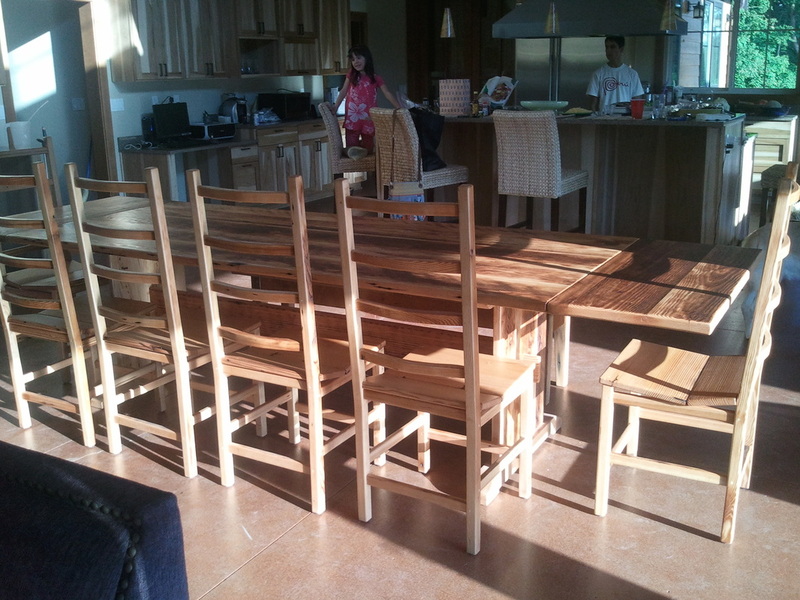 Extensions can be added to rectangular tables adding 1.5' to each end. 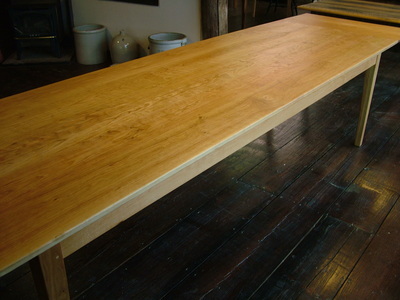 I have built many tables for NBA Basketball players who needed extra height. 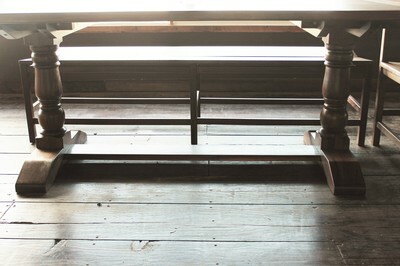 Please do not feel limited to what you see on my website. More than half of what I build is custom made. Please feel free to give me a call and we can discuss your next heirloom. 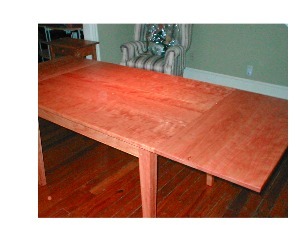 a TV dinner or a pepperoni pizza. 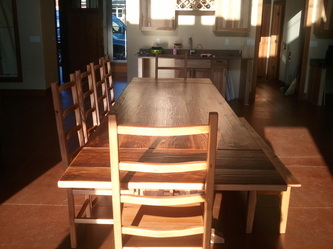 The kitchen table is not a snob. 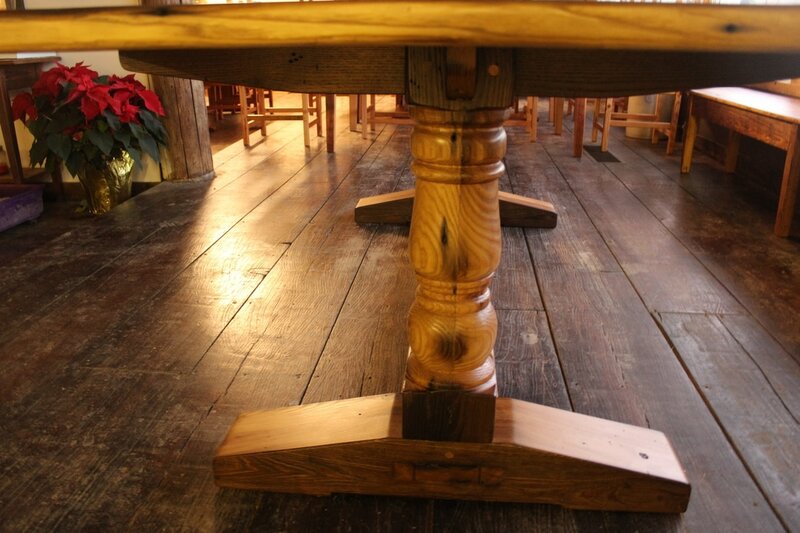 hope that our tables bring you many happy memories for generations to come. 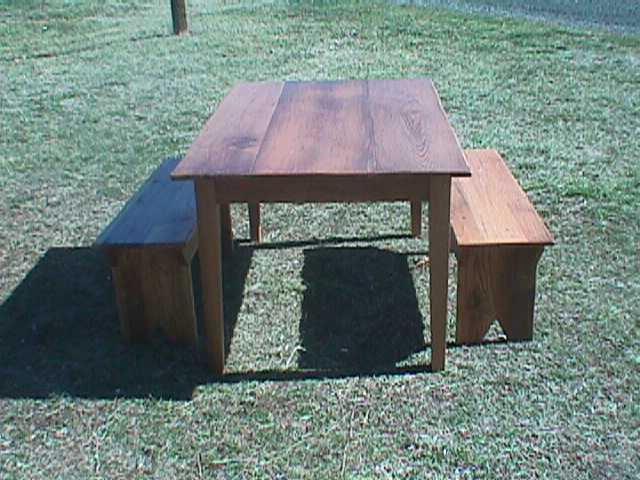 All of my tables are one of a kind so it is very hard to show examples of tables. 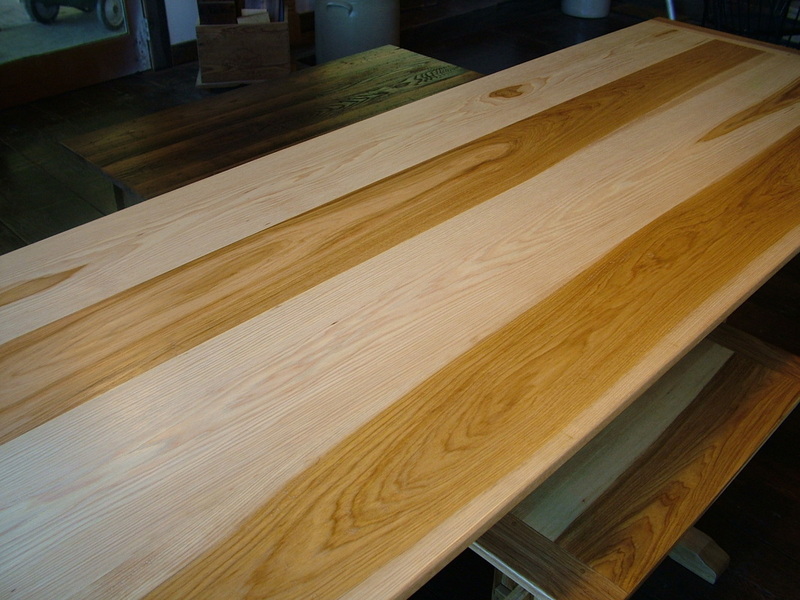 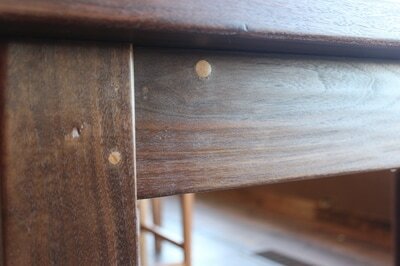 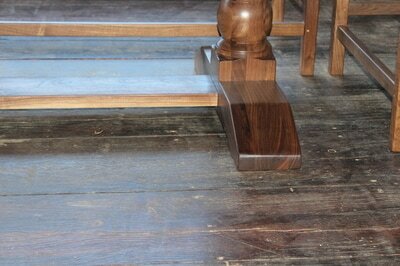 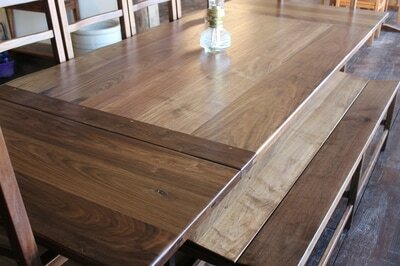 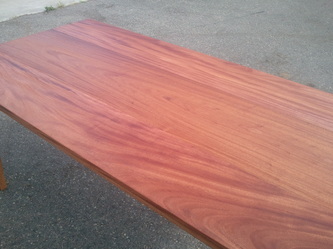 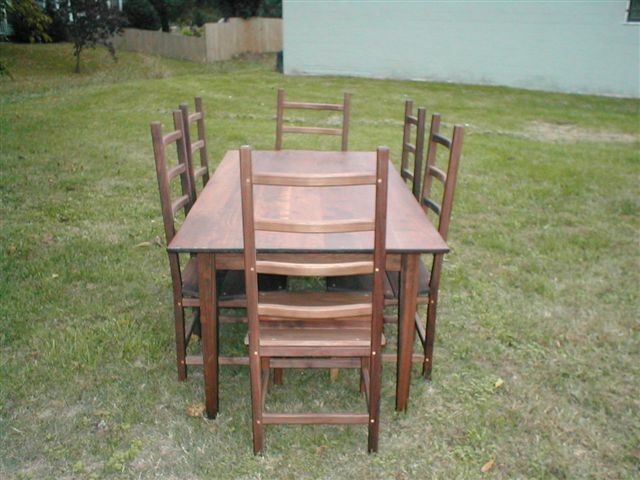 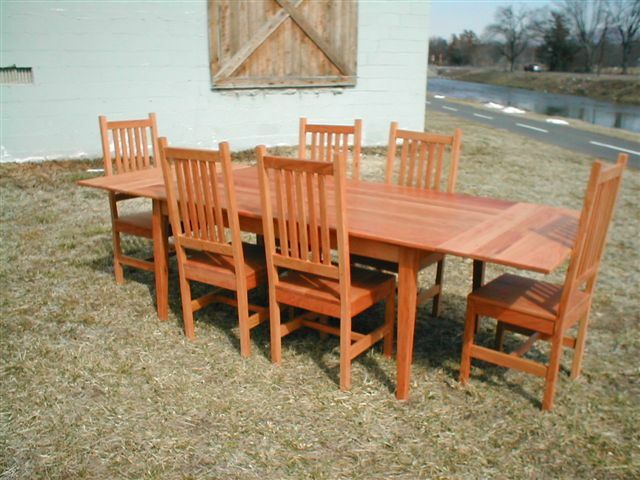 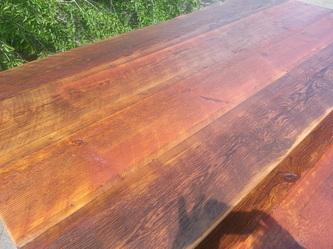 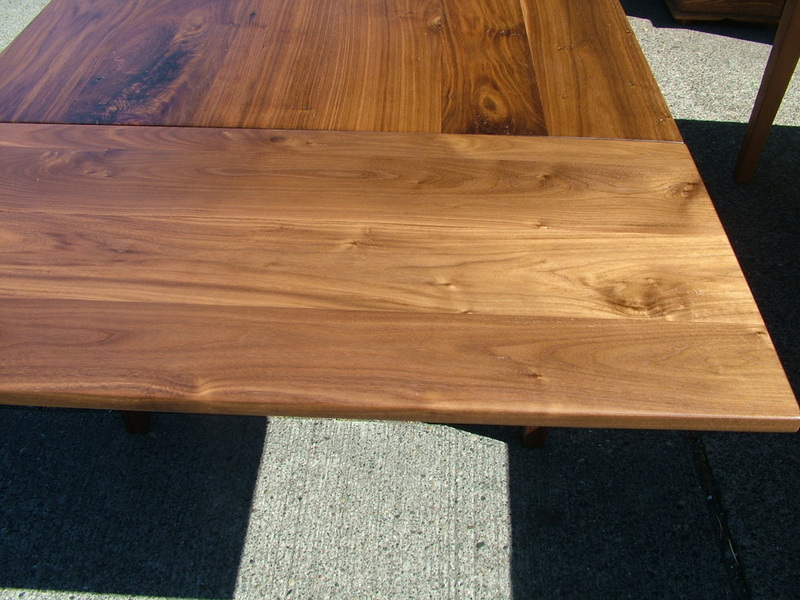 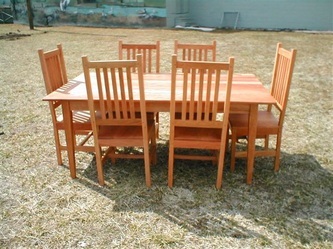 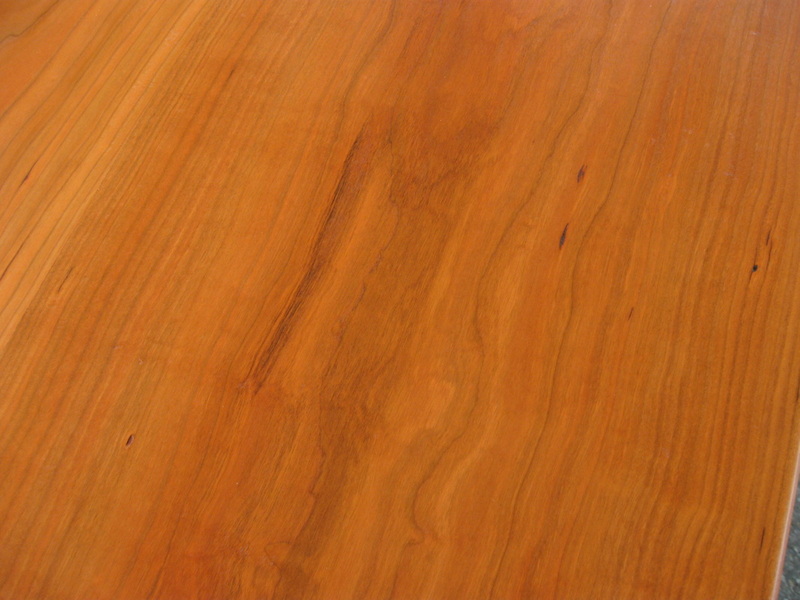 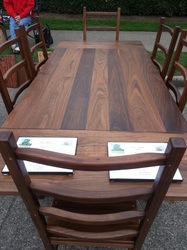 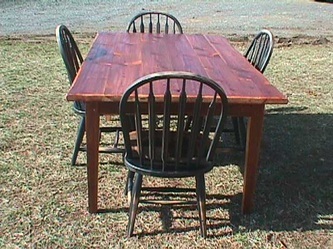 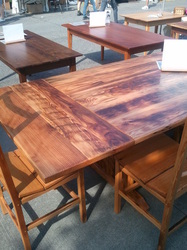 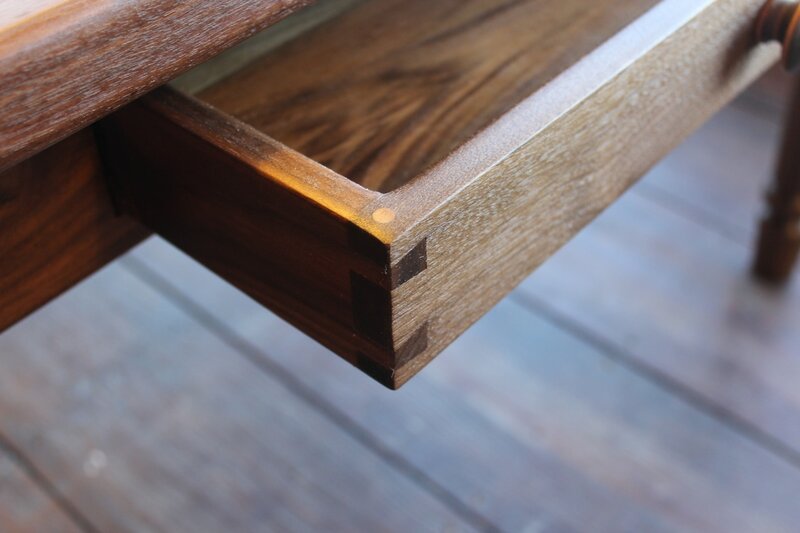 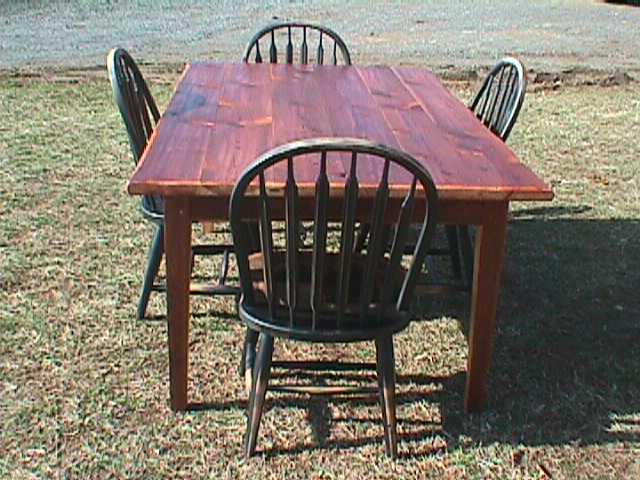 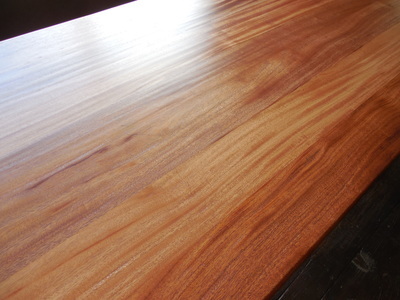 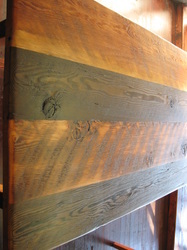 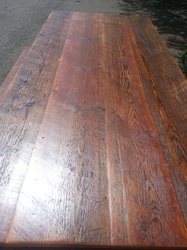 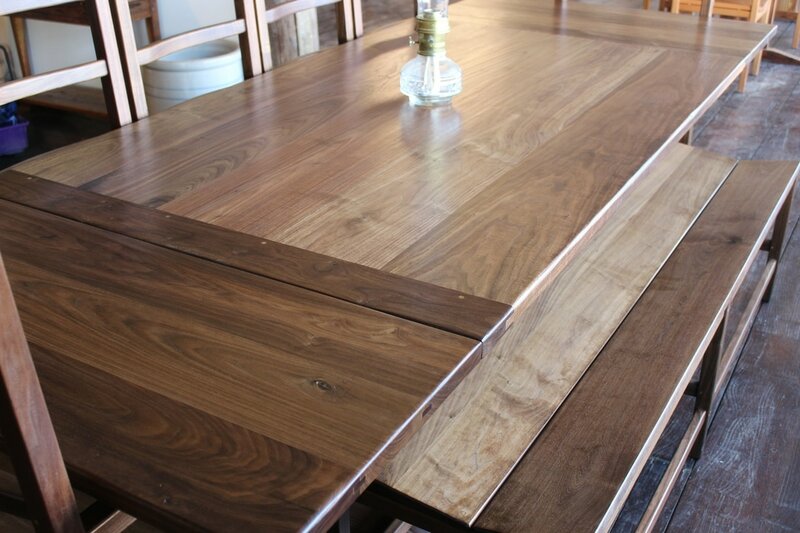 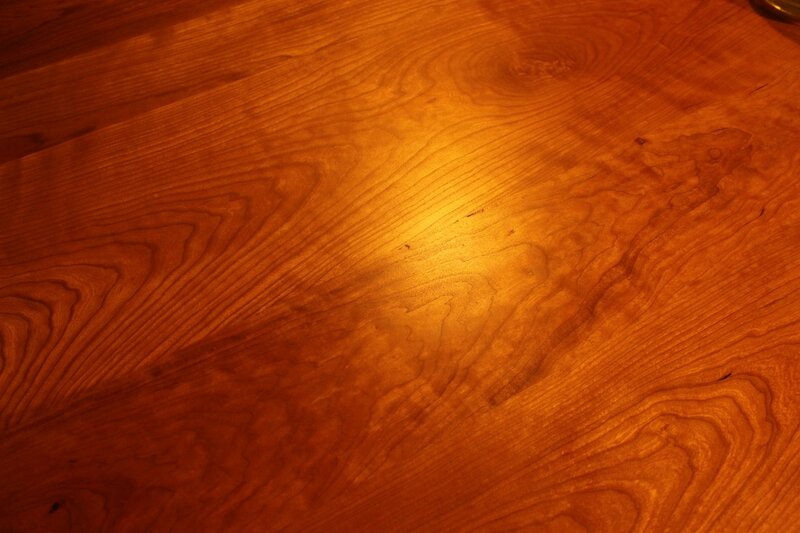 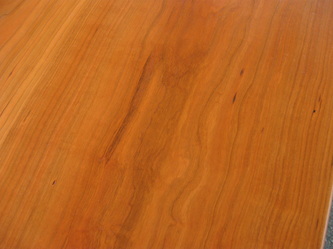 Pictured are some in each wood specie that will give you an ideal of what the tables would look like. 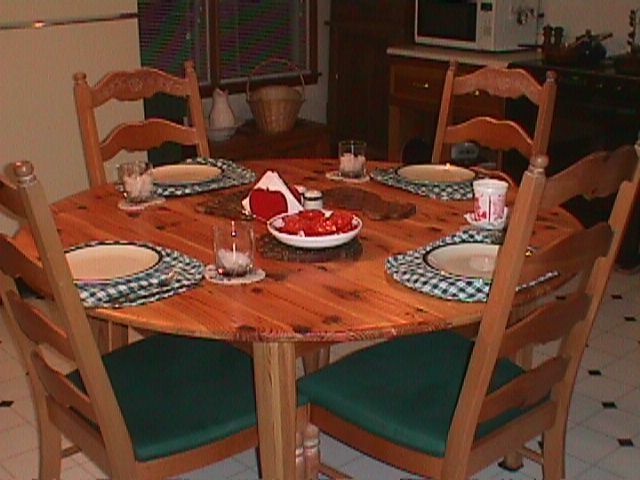 Pricing online is again very hard to do because of the many things that can be done to customize your table. 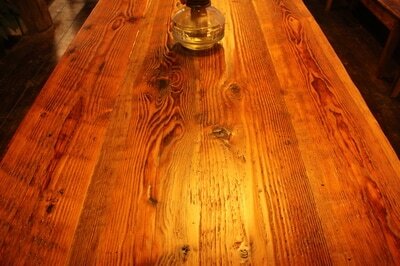 Douglas Fir. 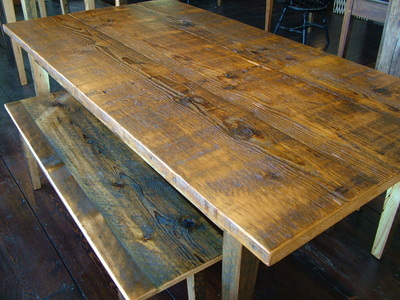 Semi-rustic. 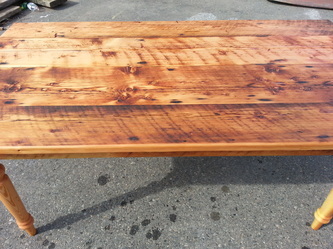 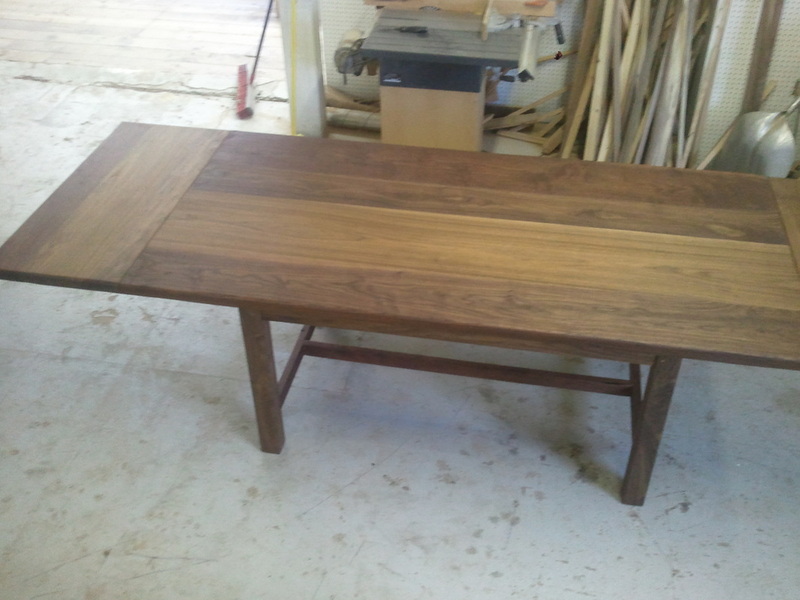 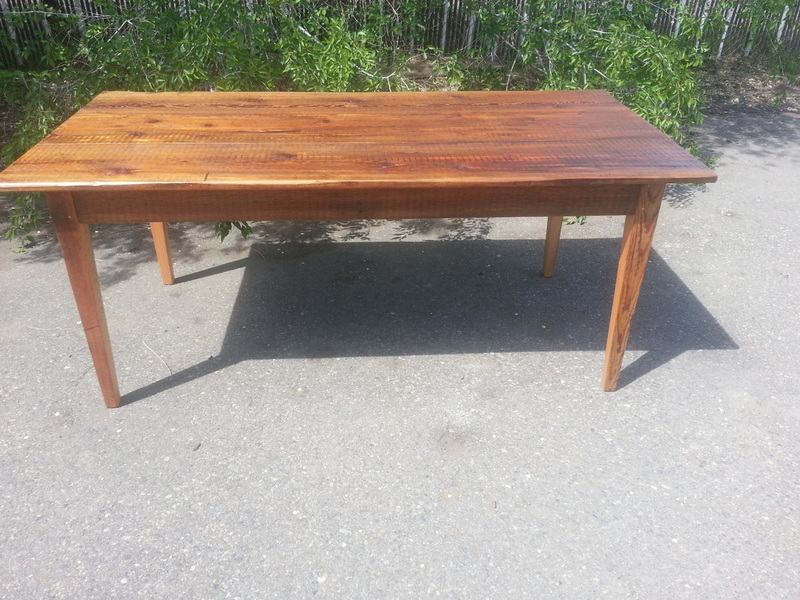 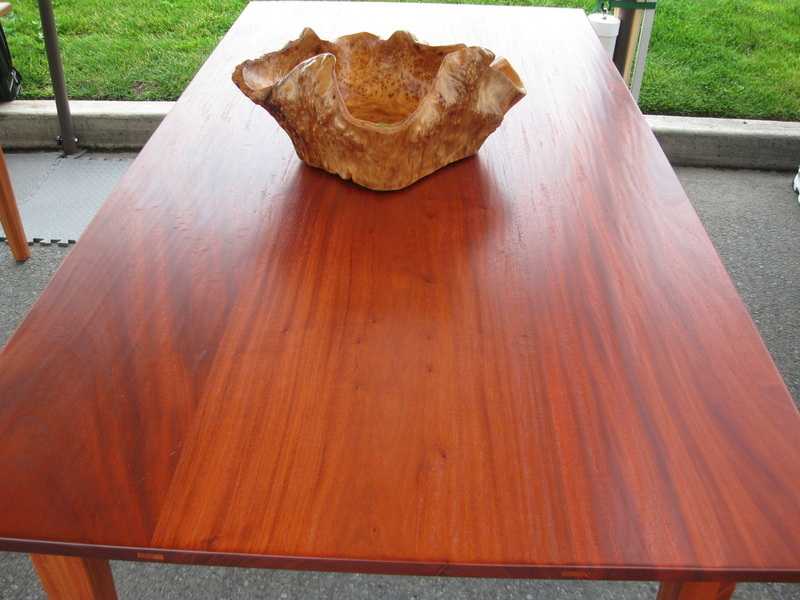 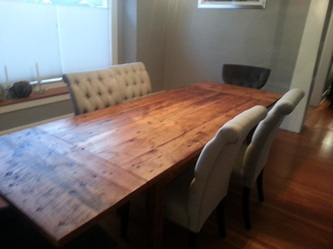 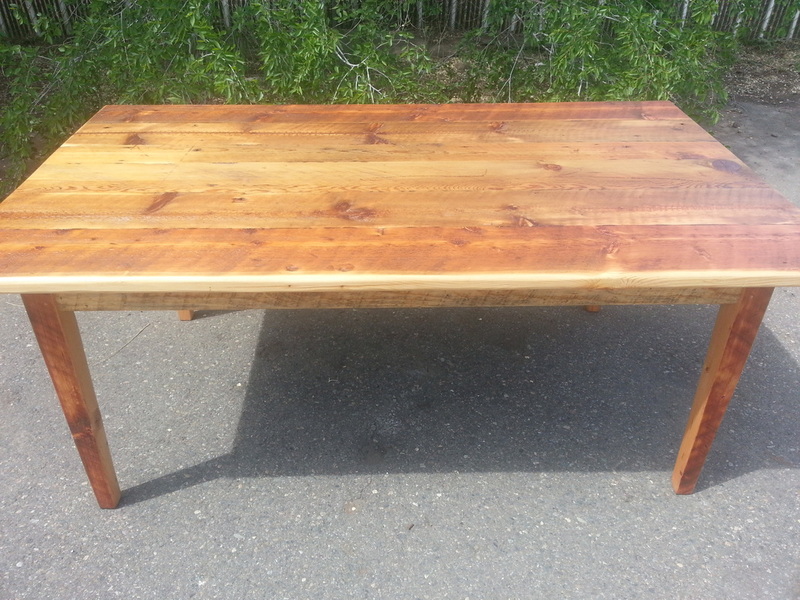 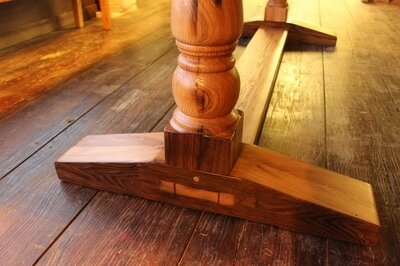 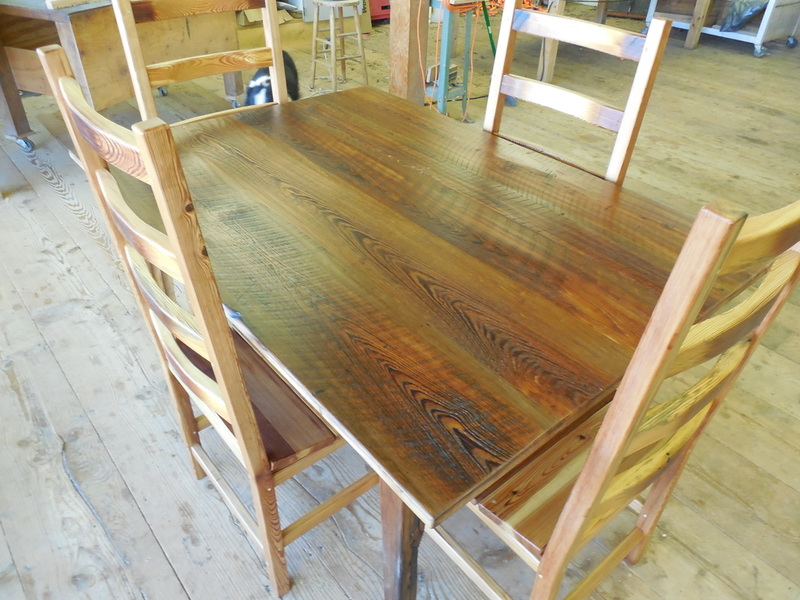 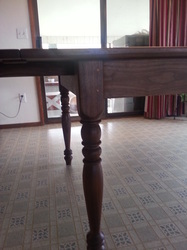 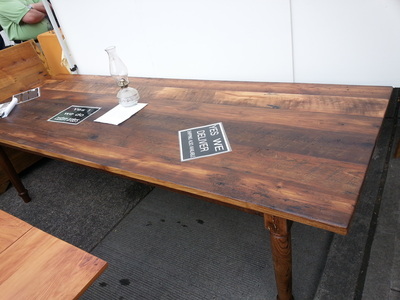 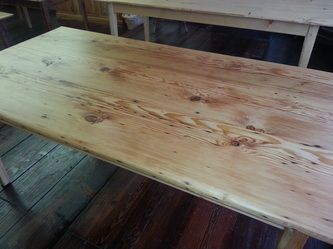 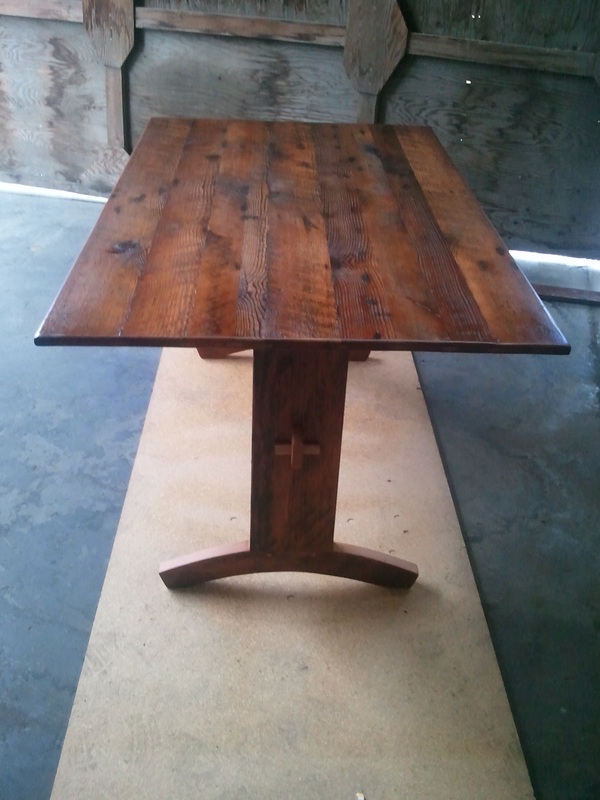 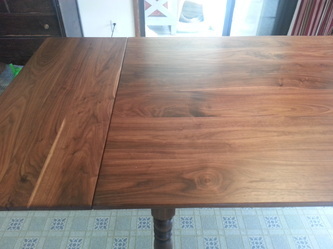 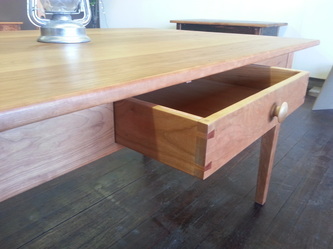 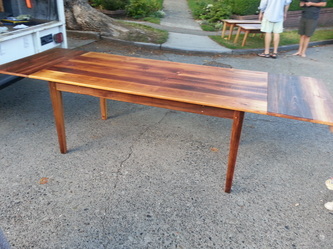 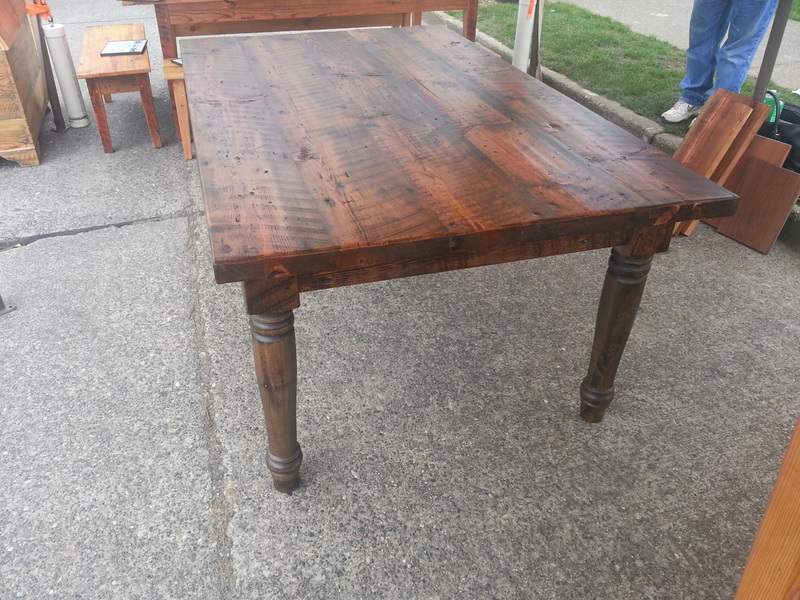 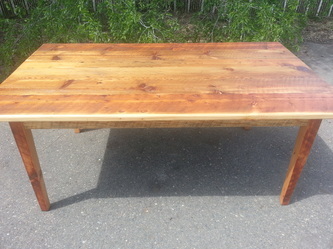 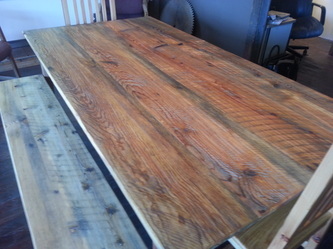 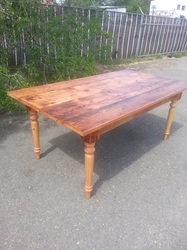 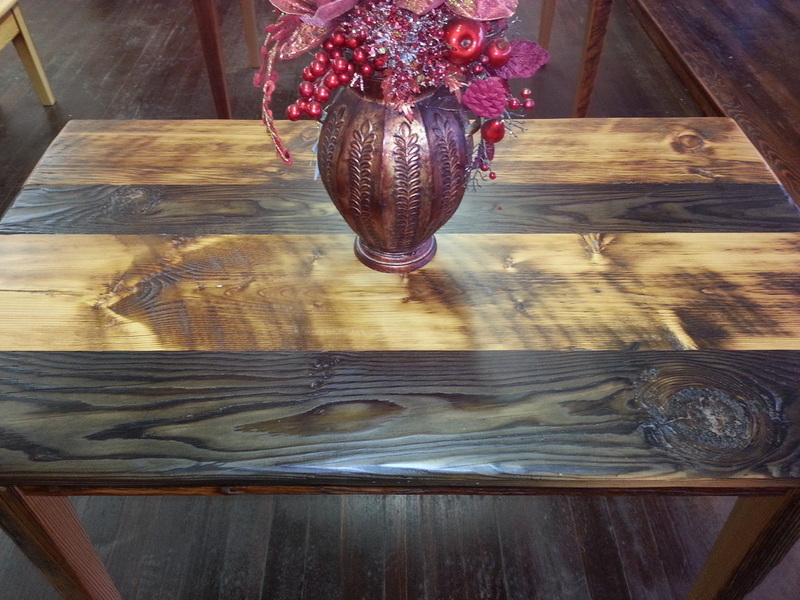 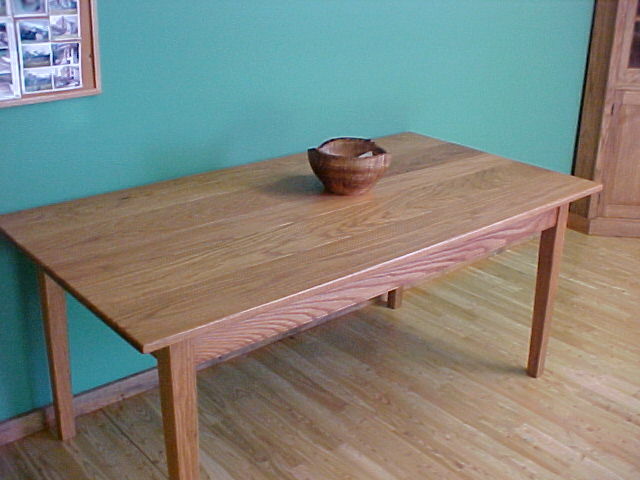 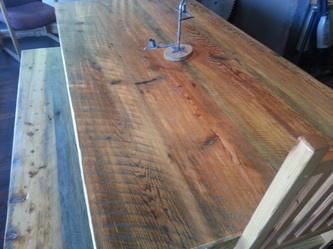 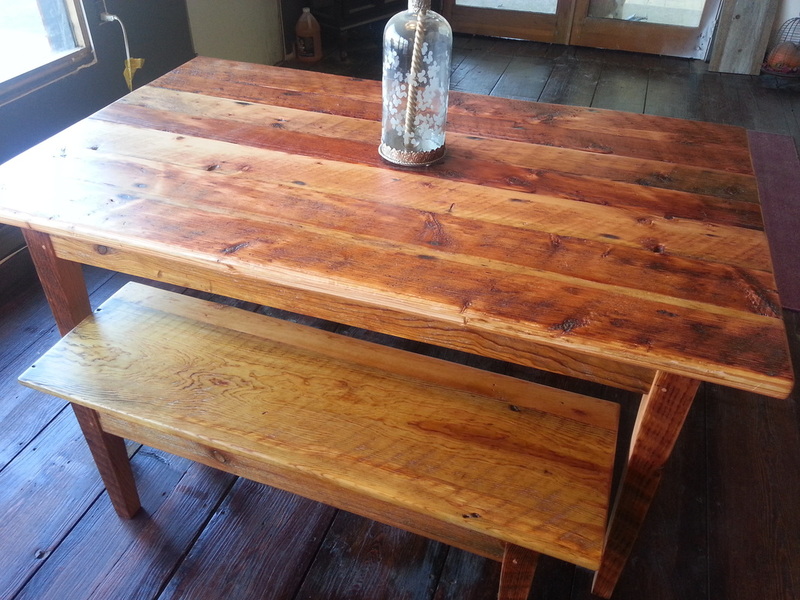 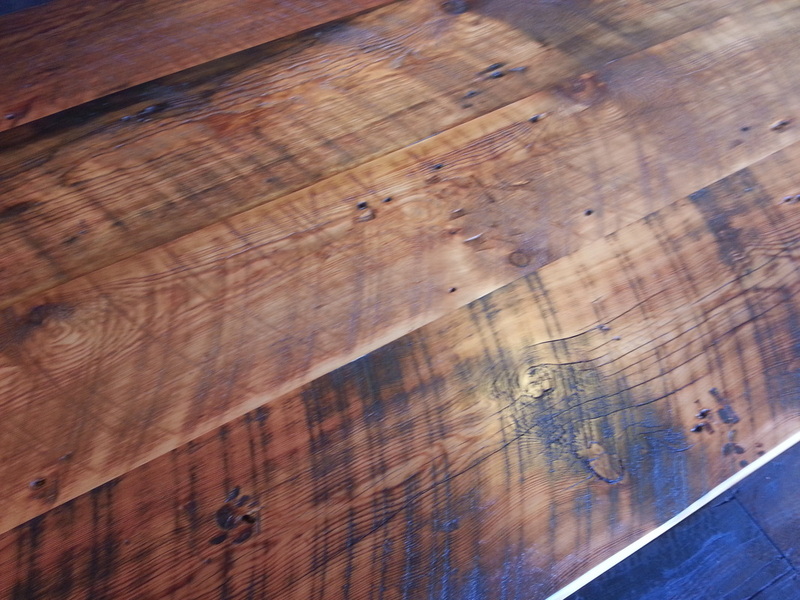 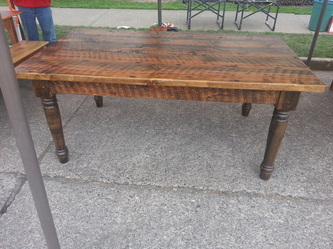 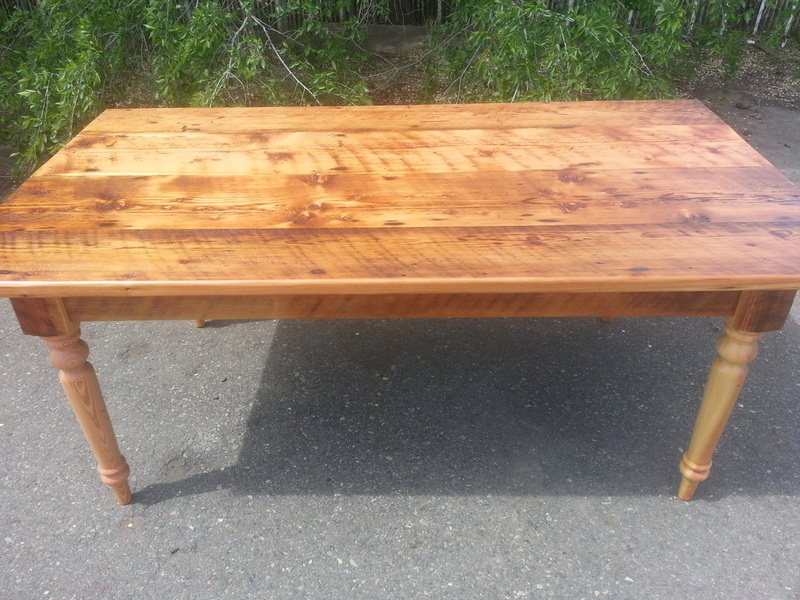 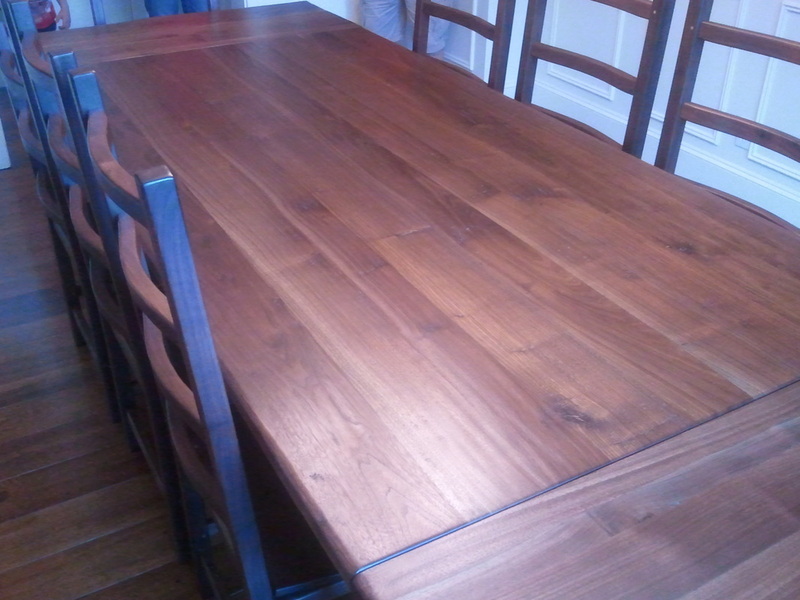 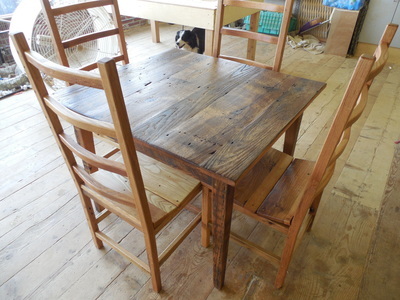 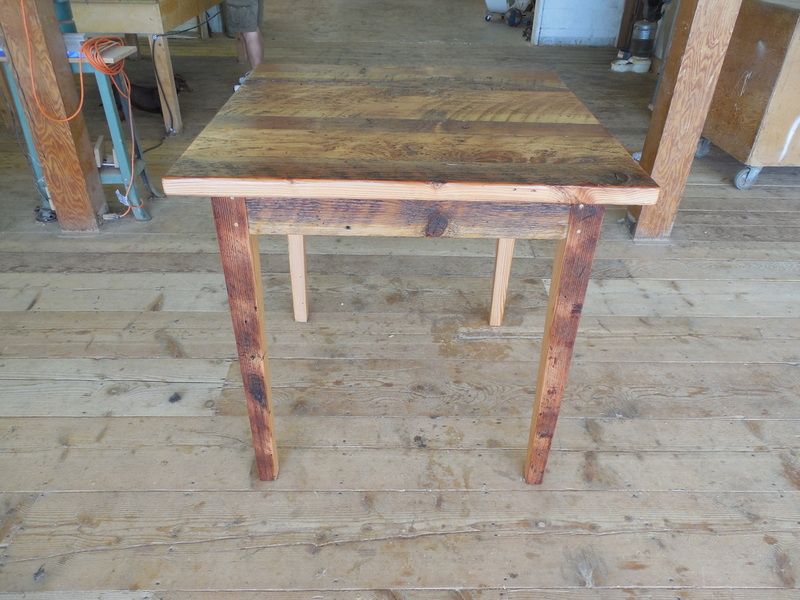 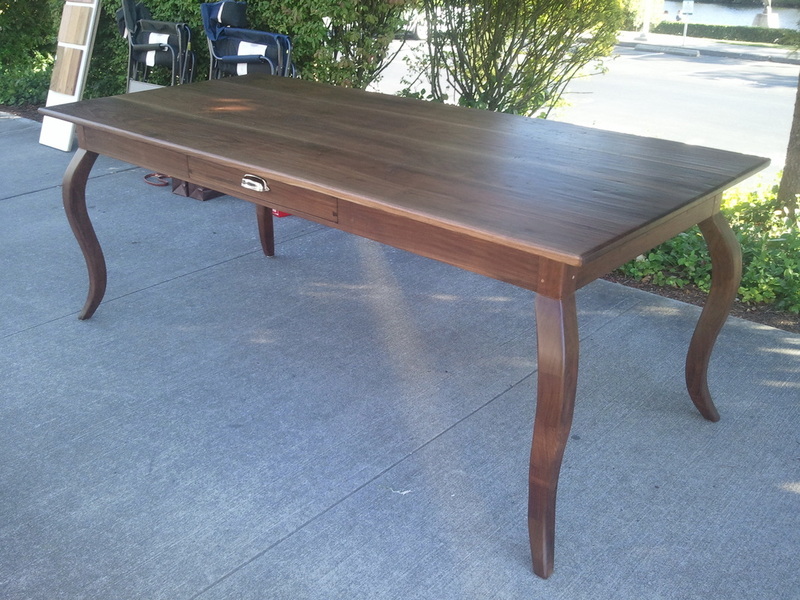 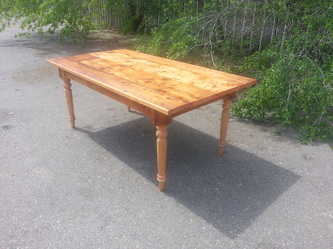 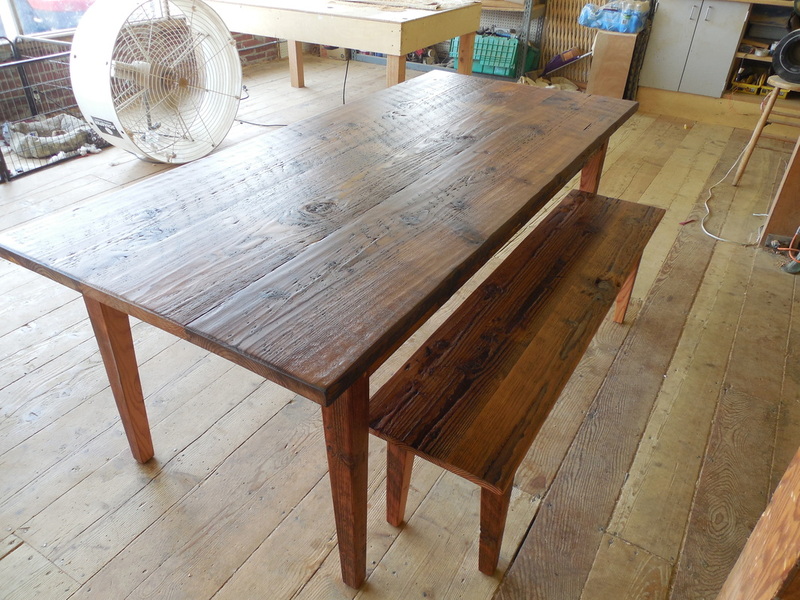 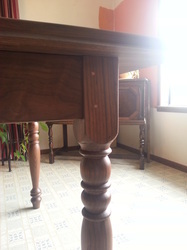 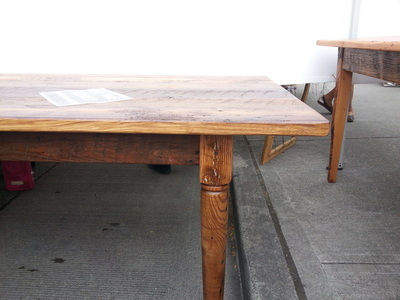 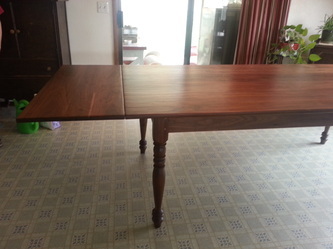 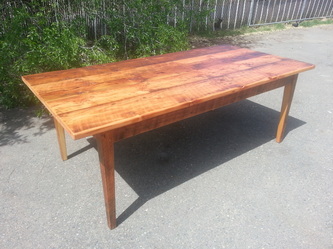 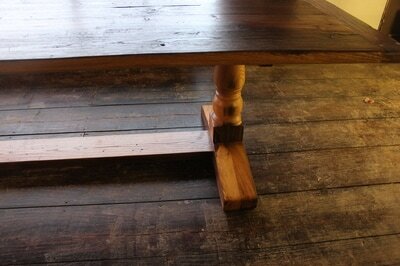 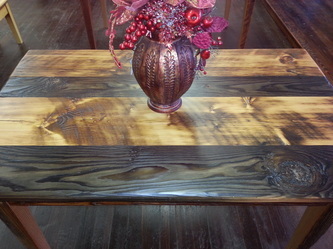 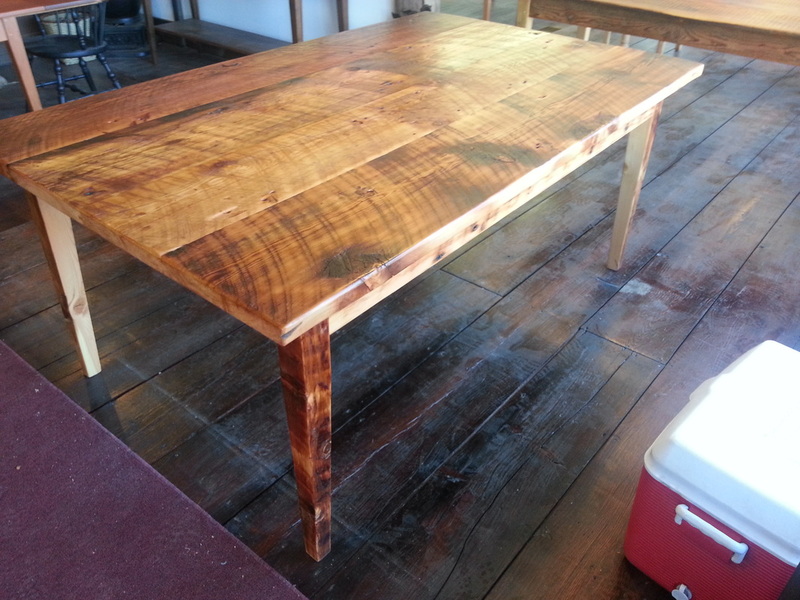 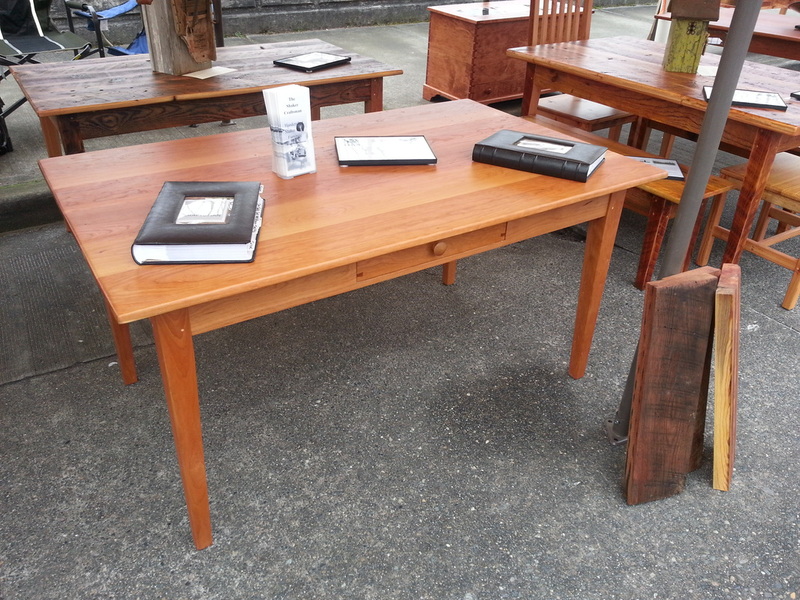 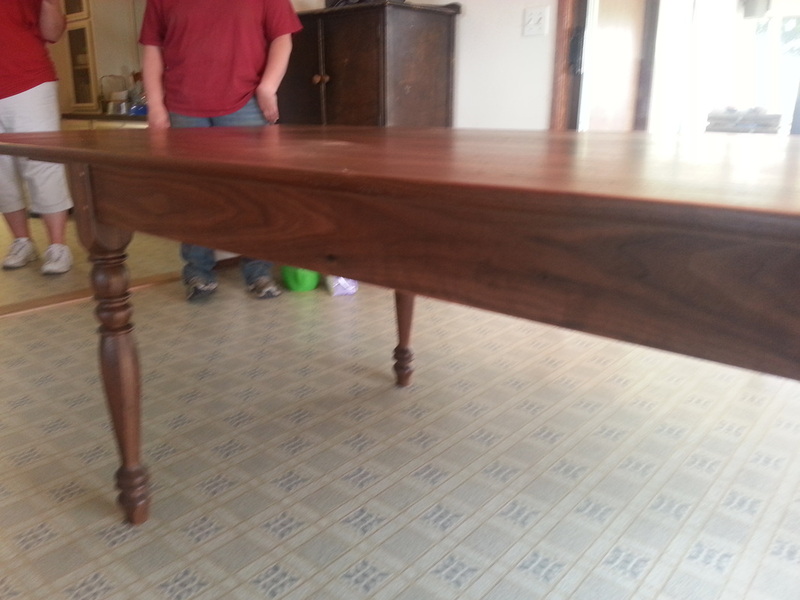 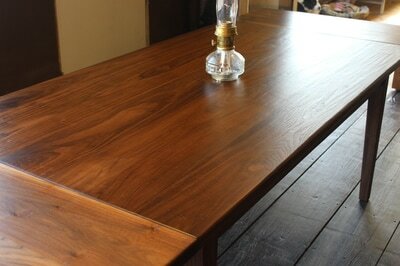 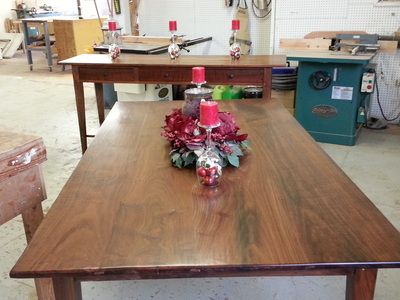 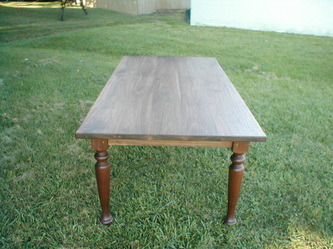 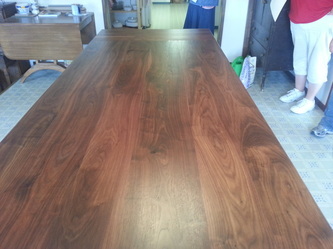 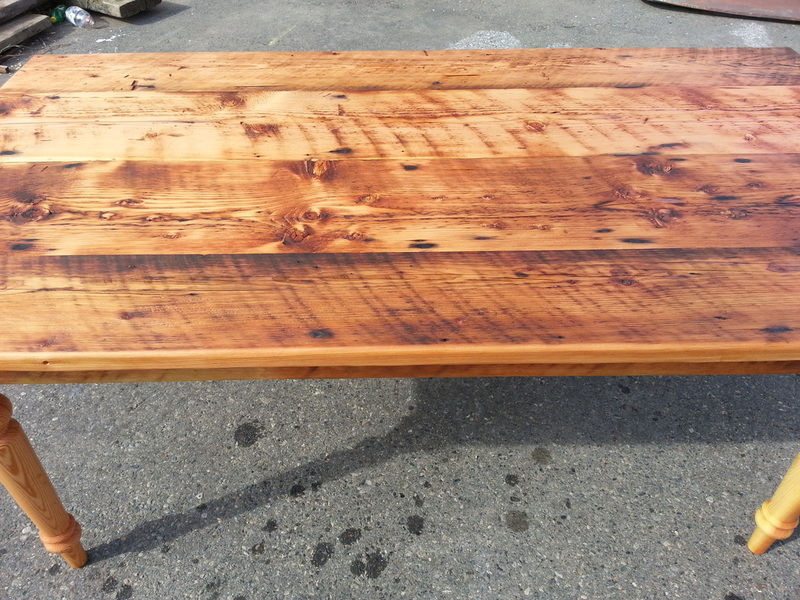 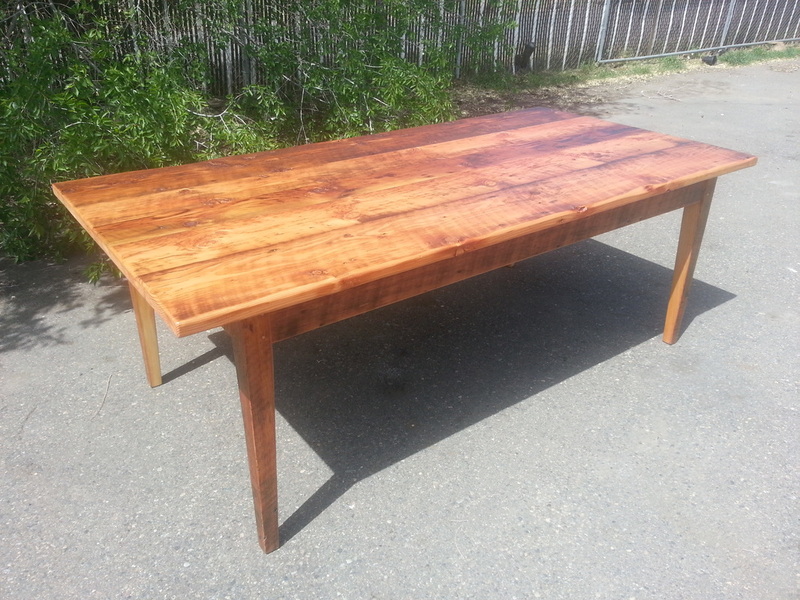 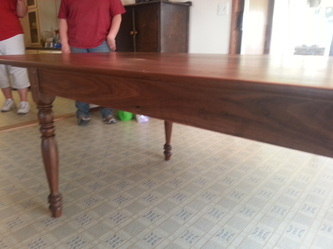 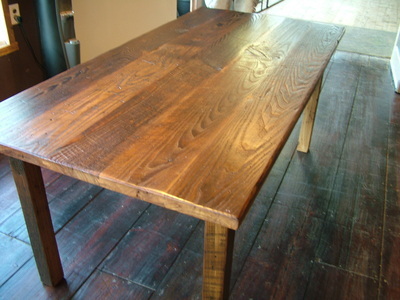 This table had an unusual board in the top and is not normally done this way unless requested.